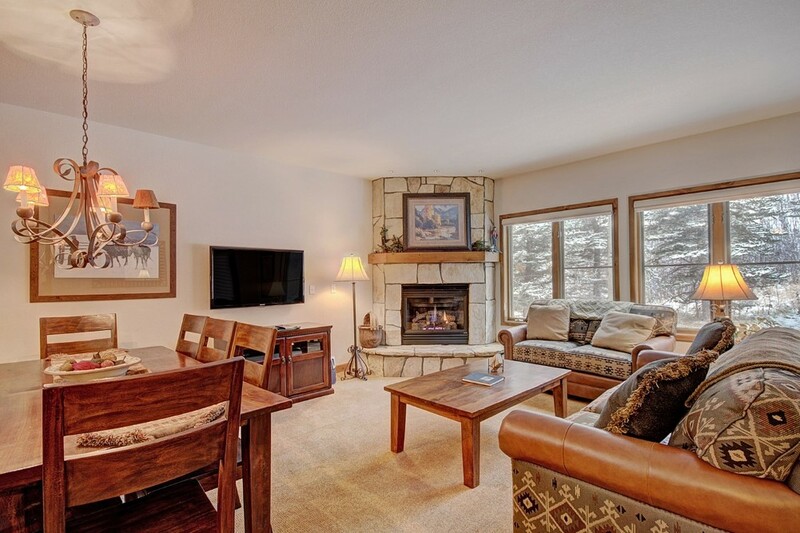 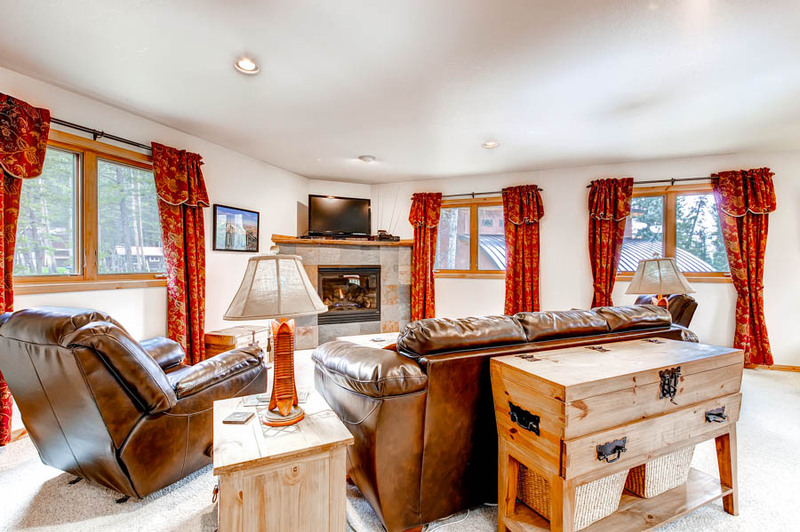 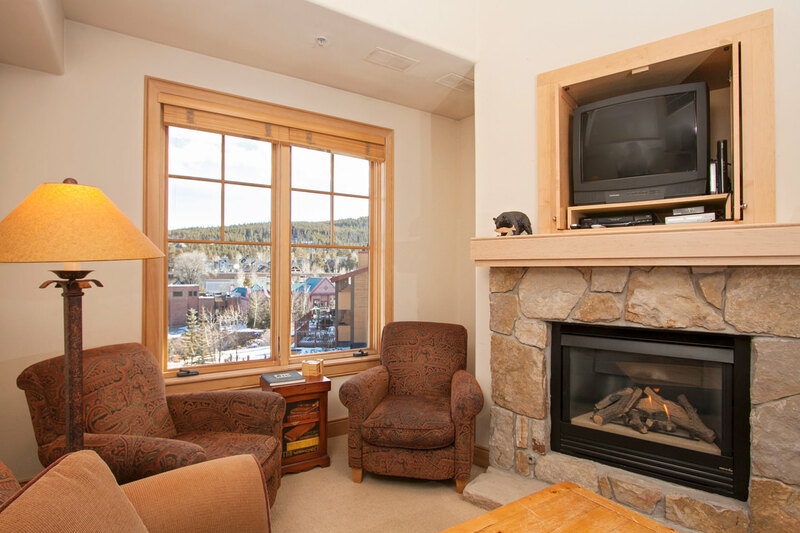 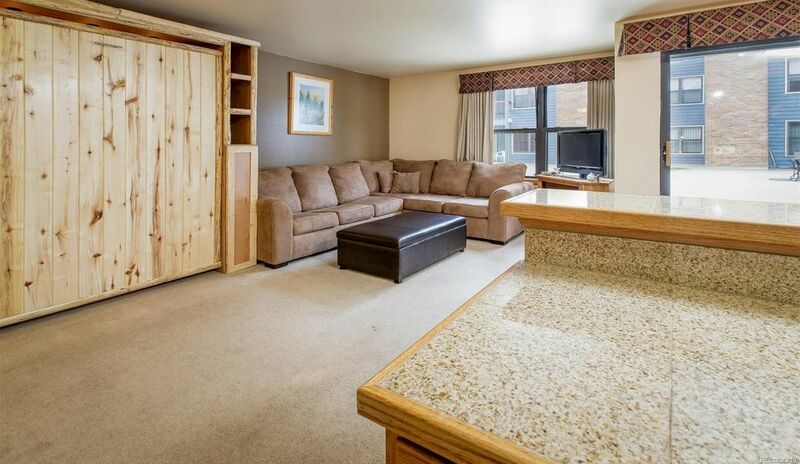 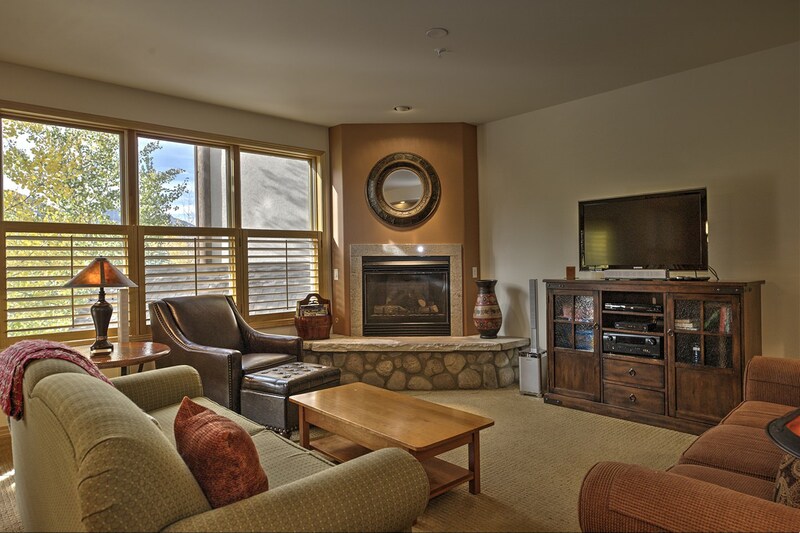 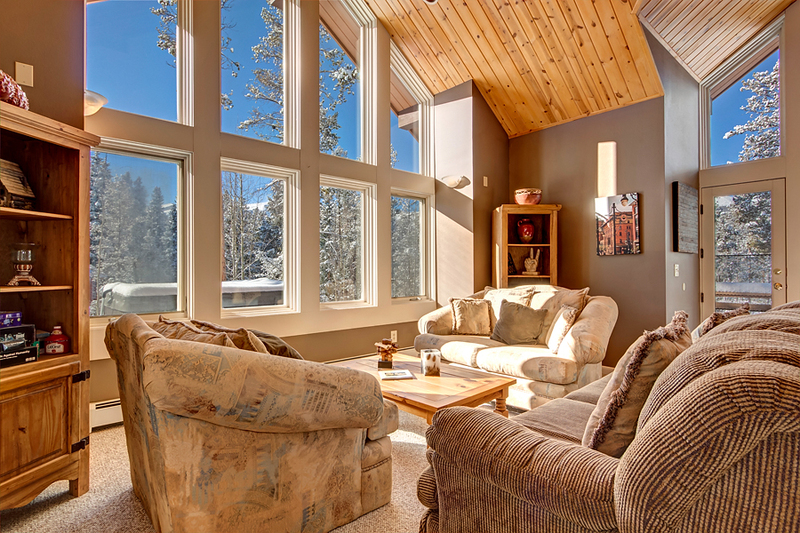 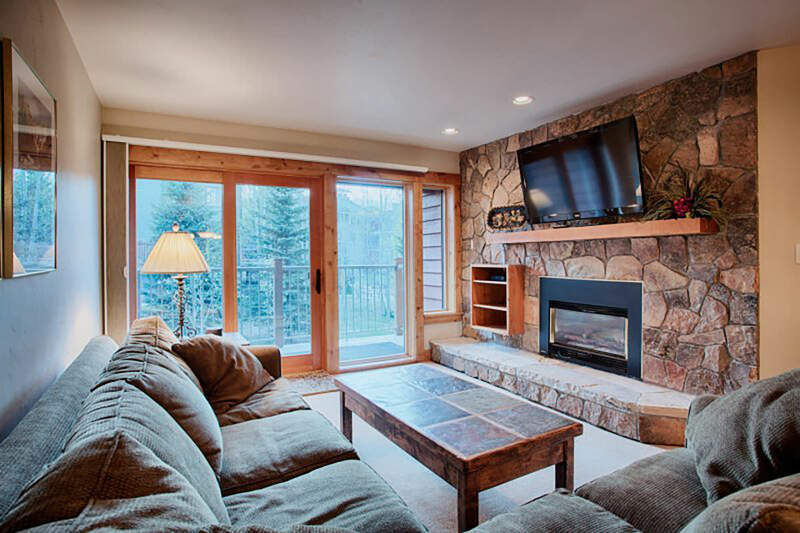 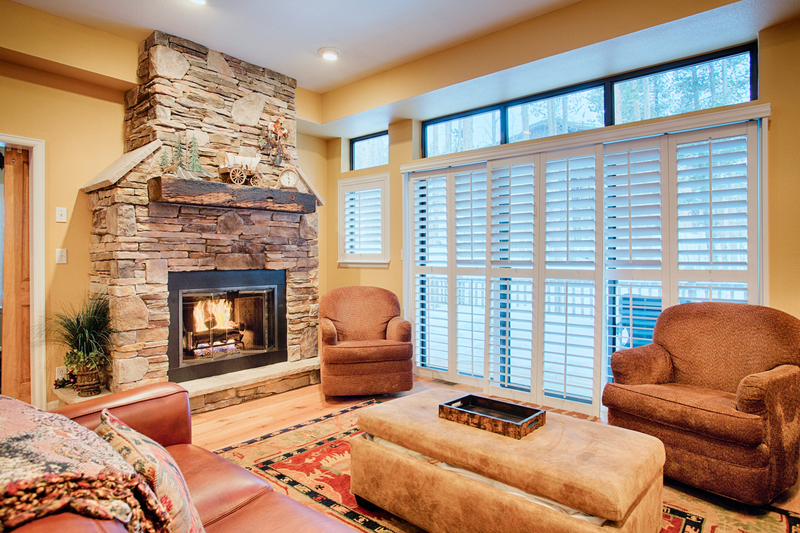 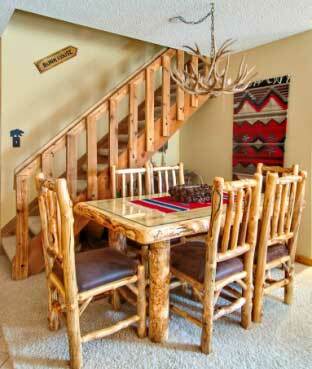 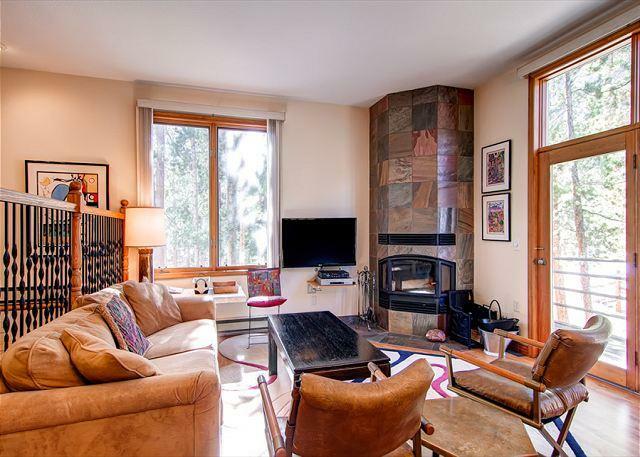 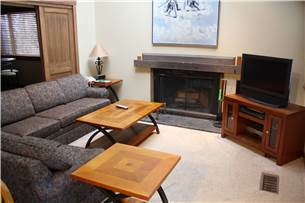 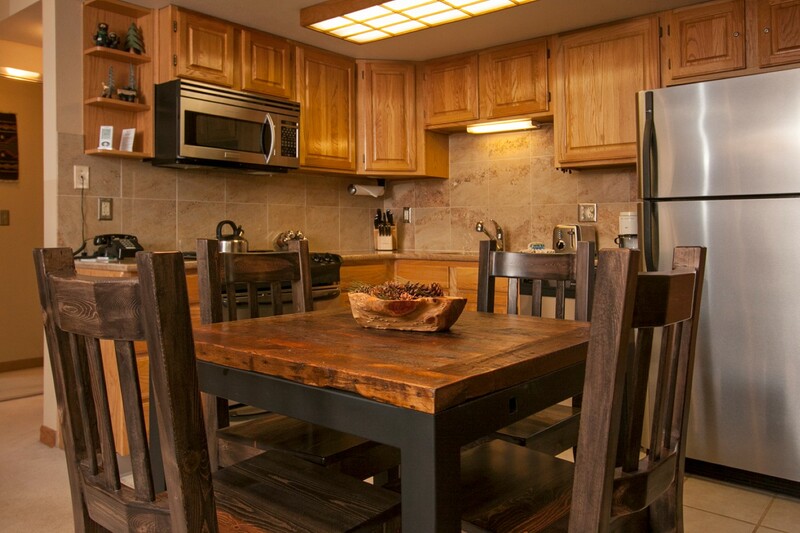 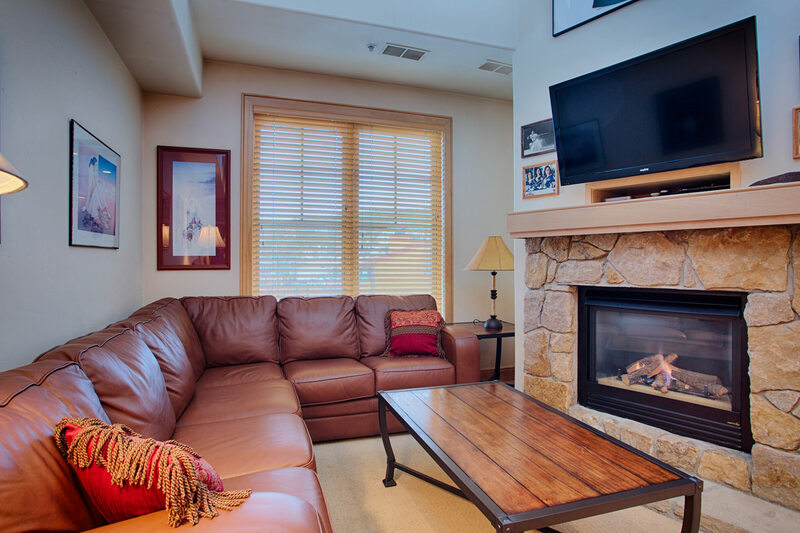 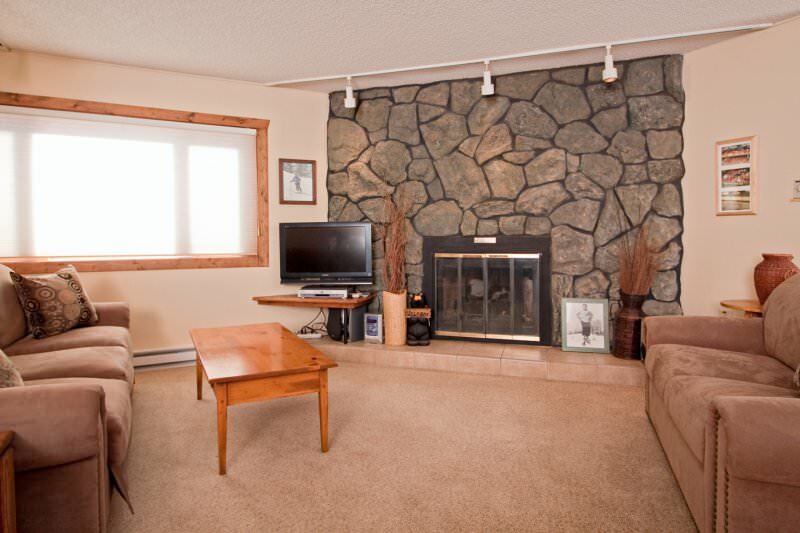 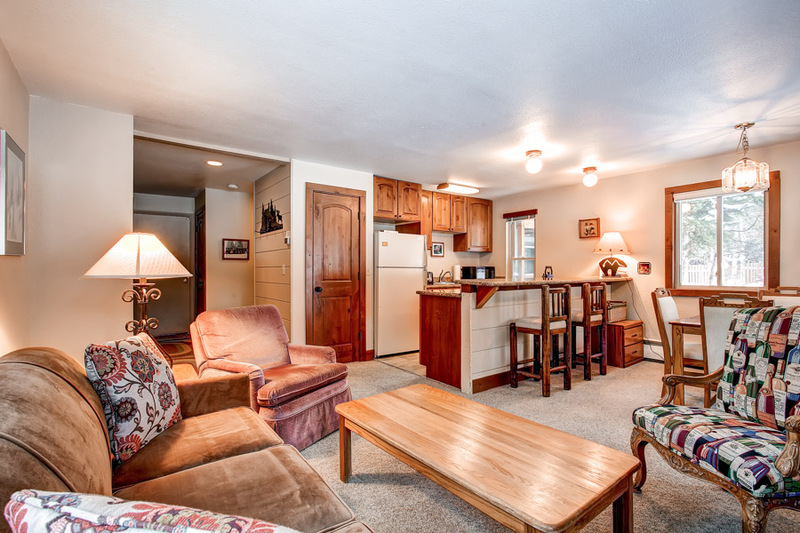 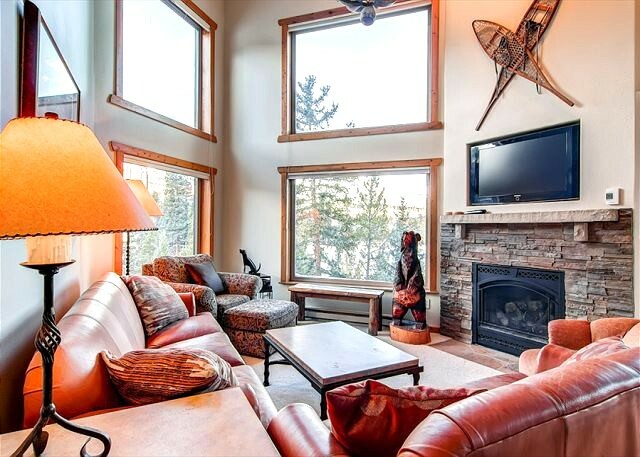 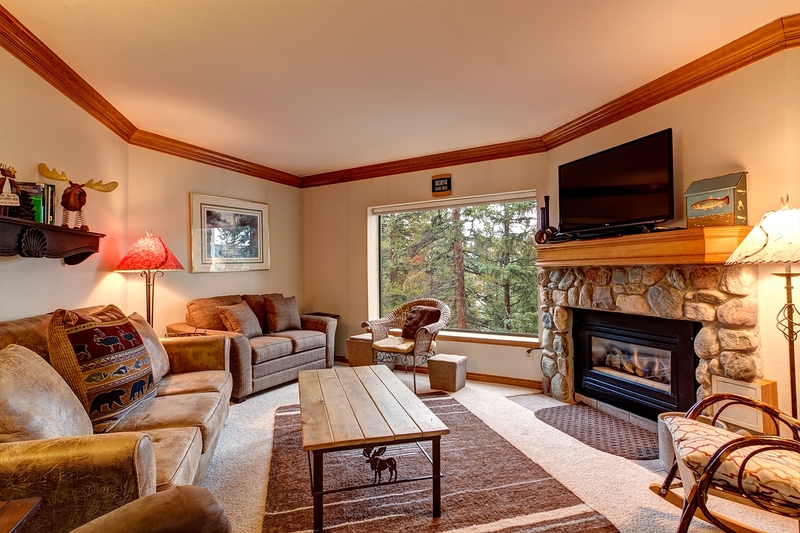 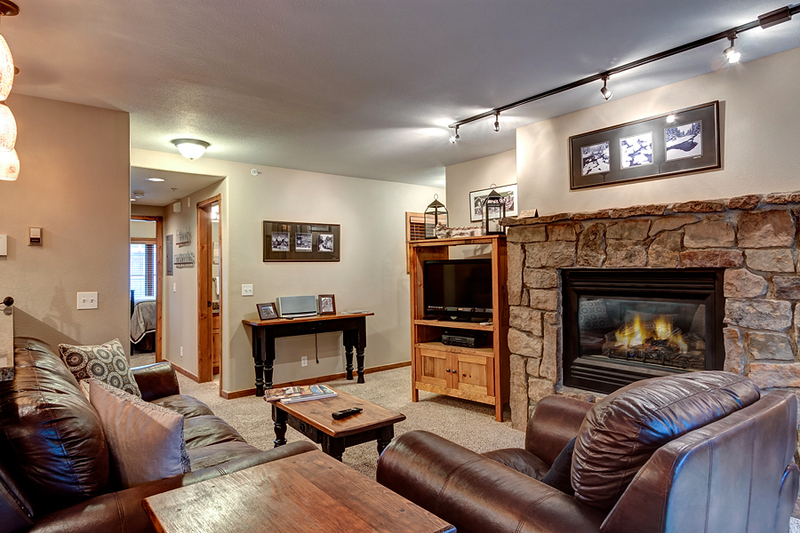 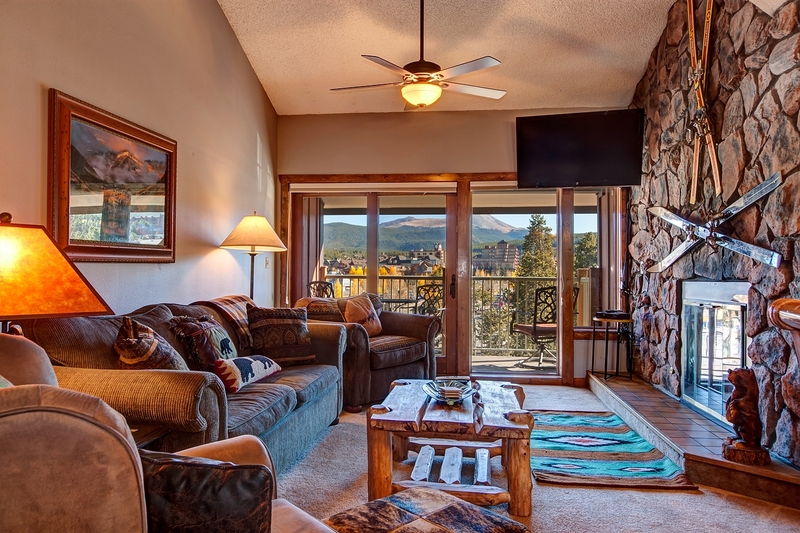 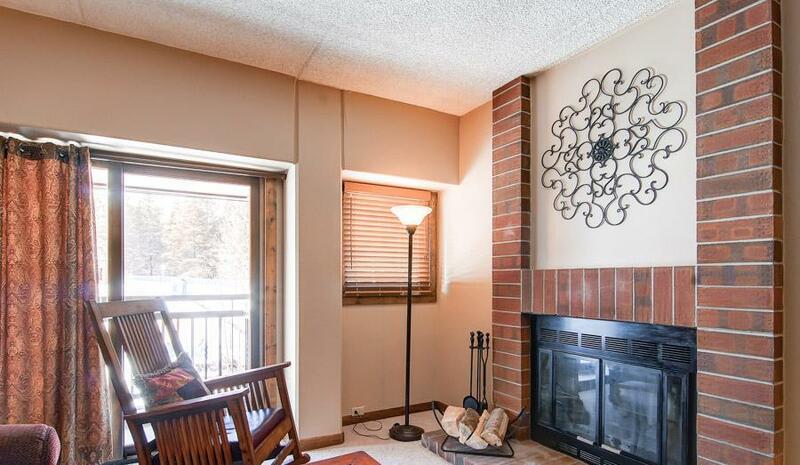 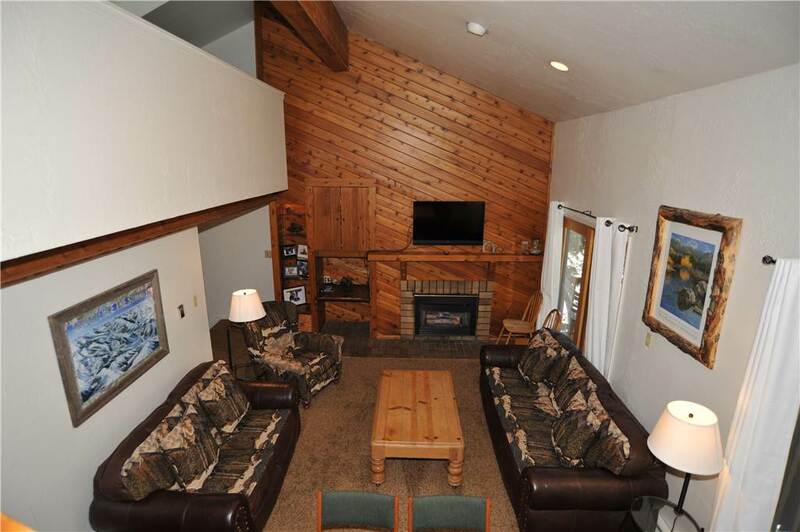 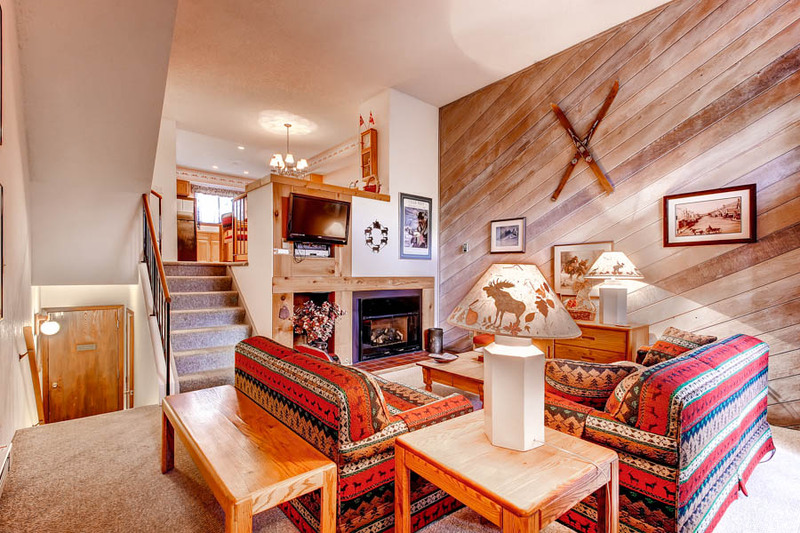 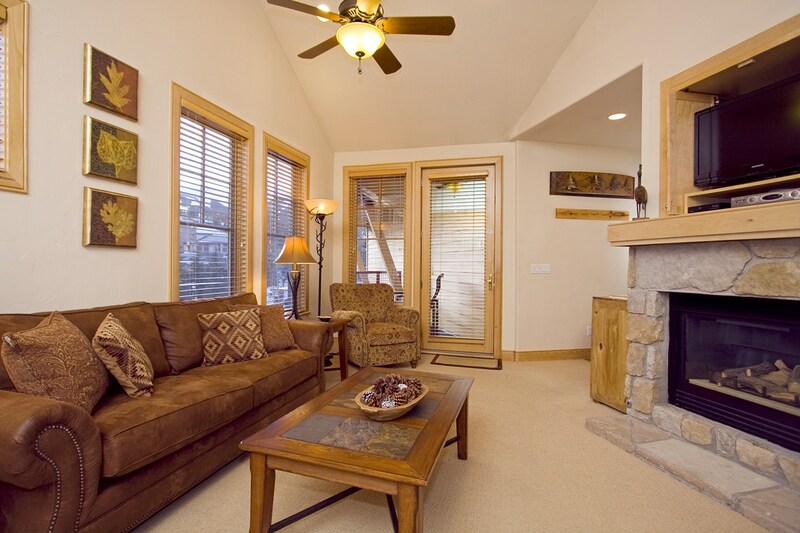 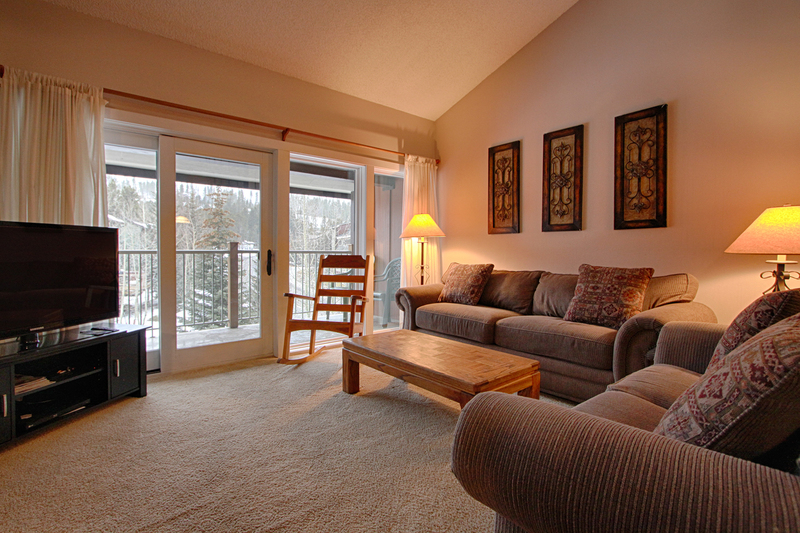 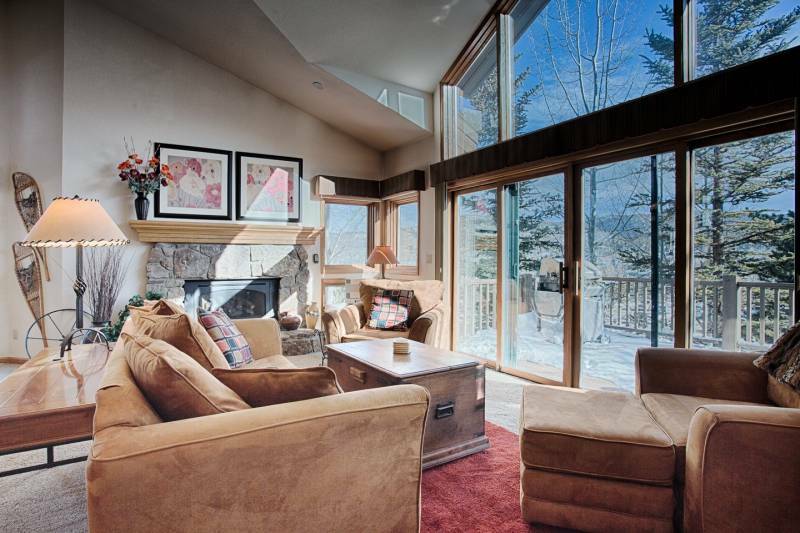 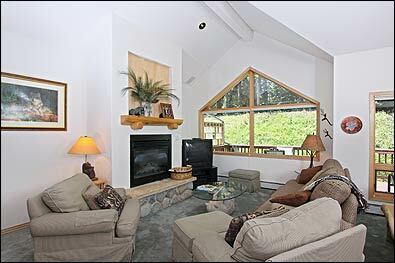 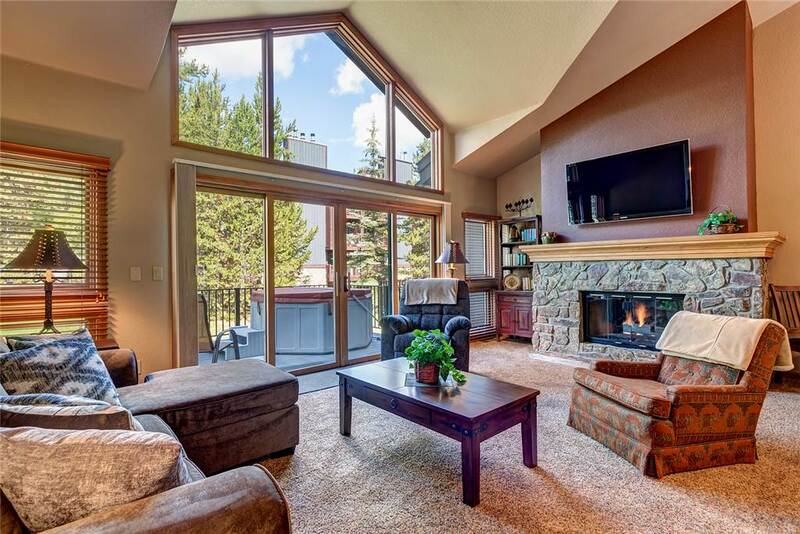 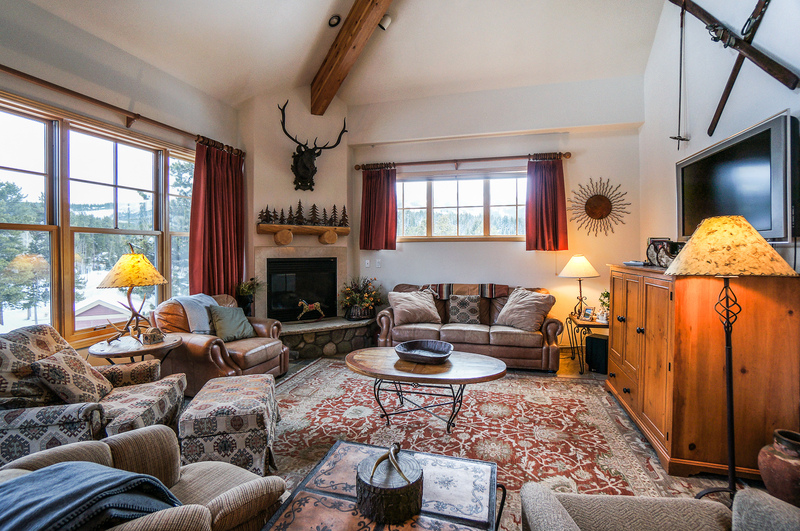 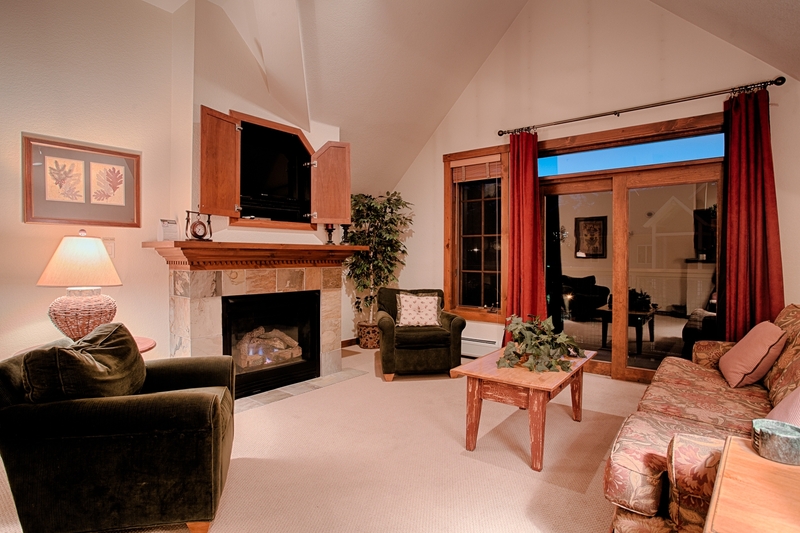 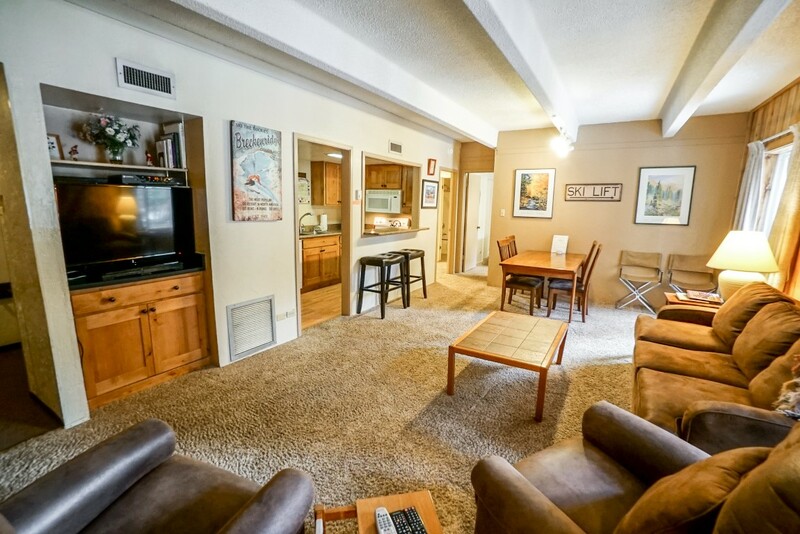 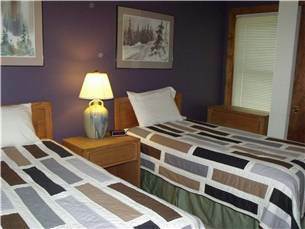 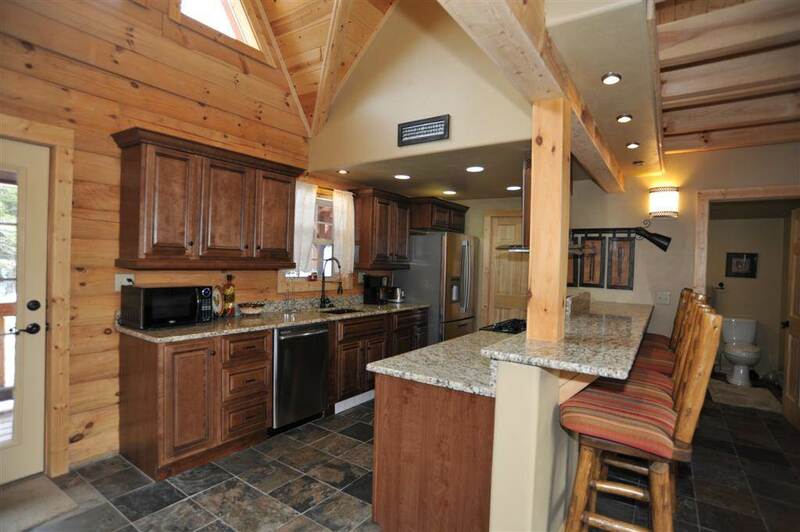 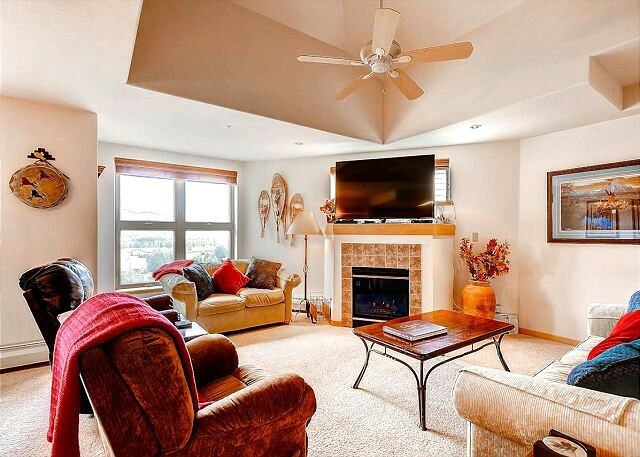 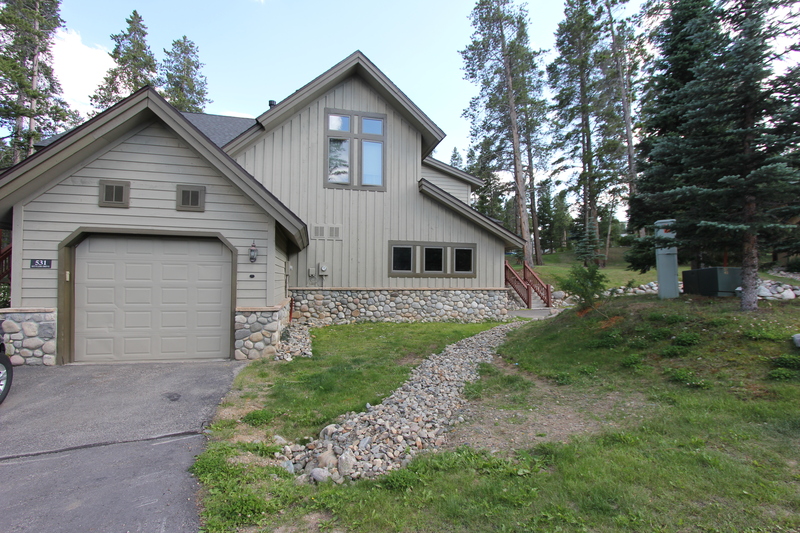 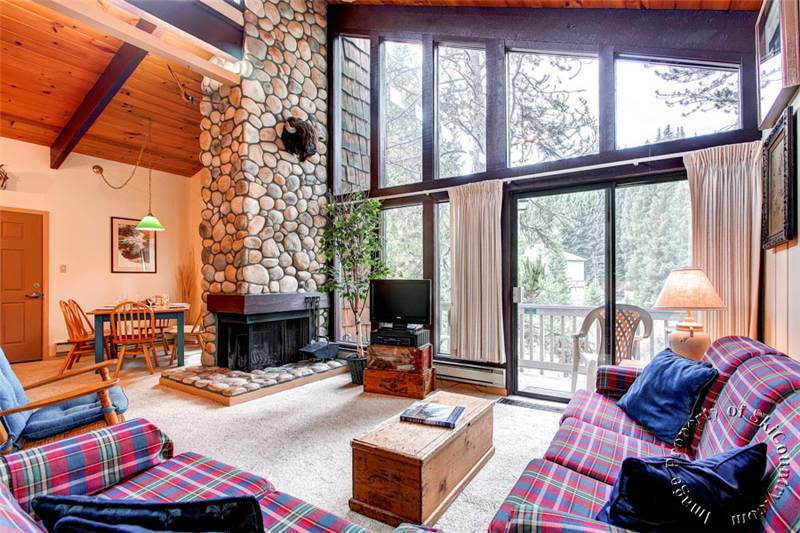 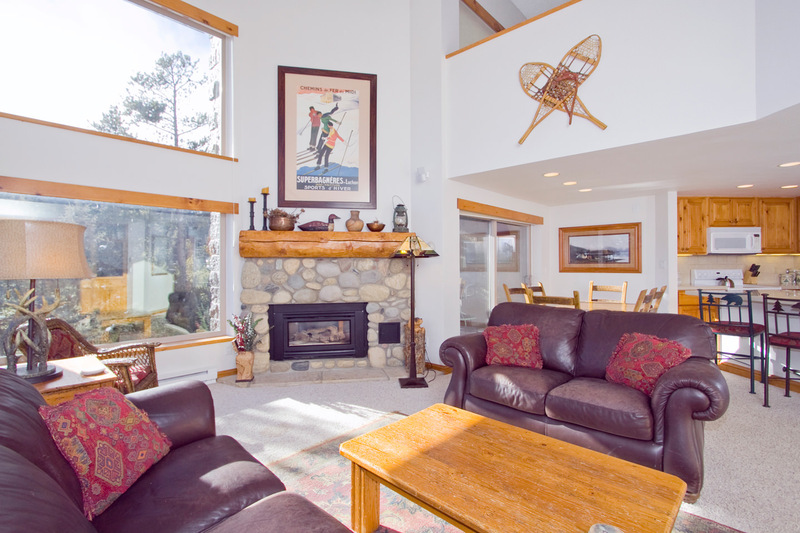 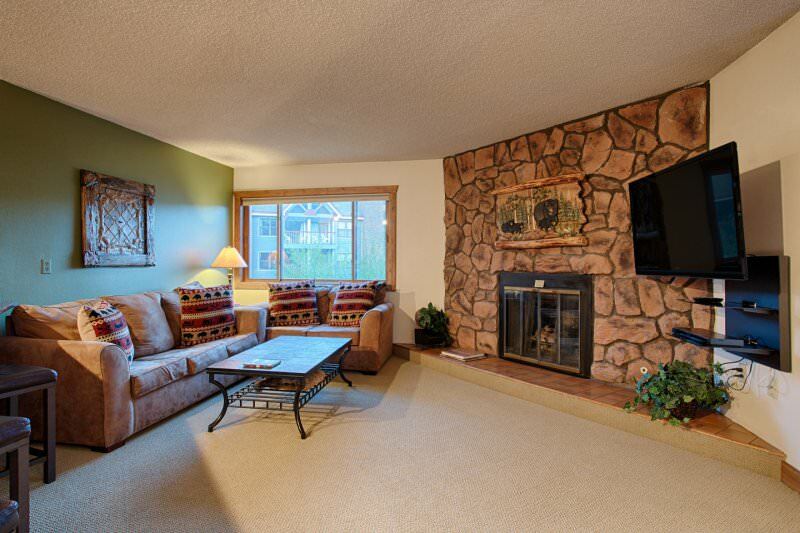 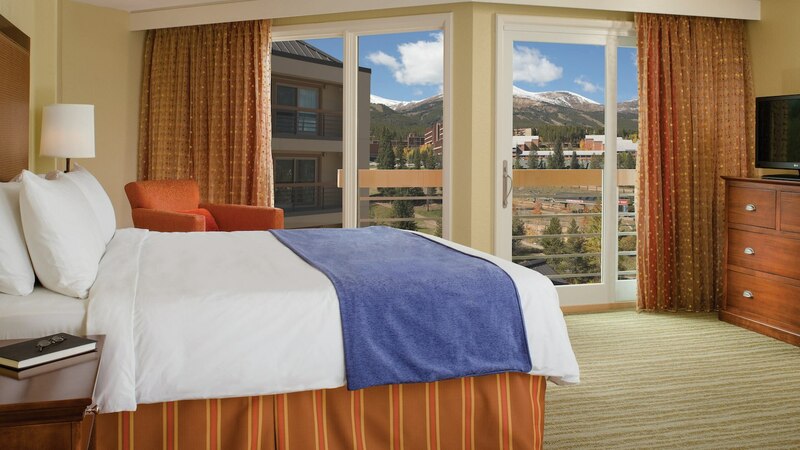 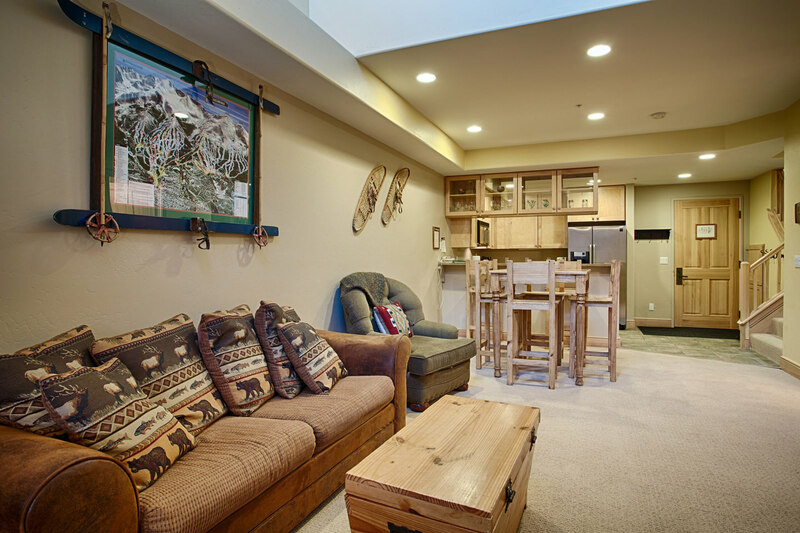 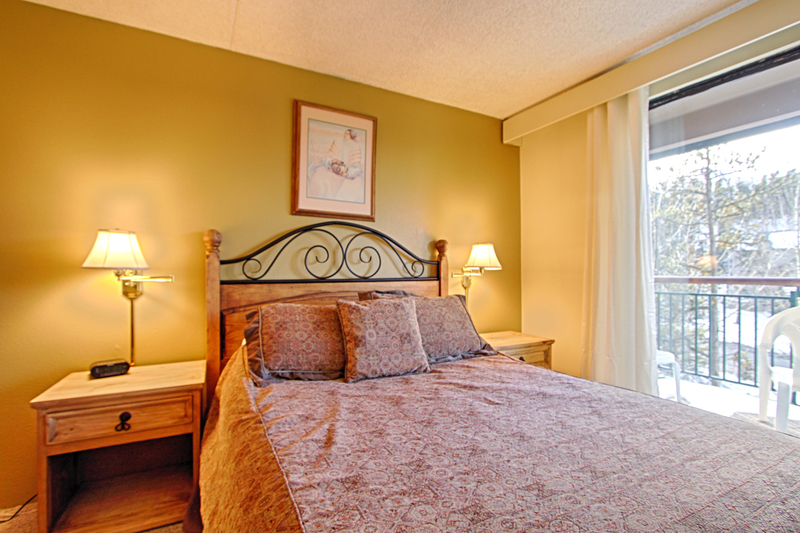 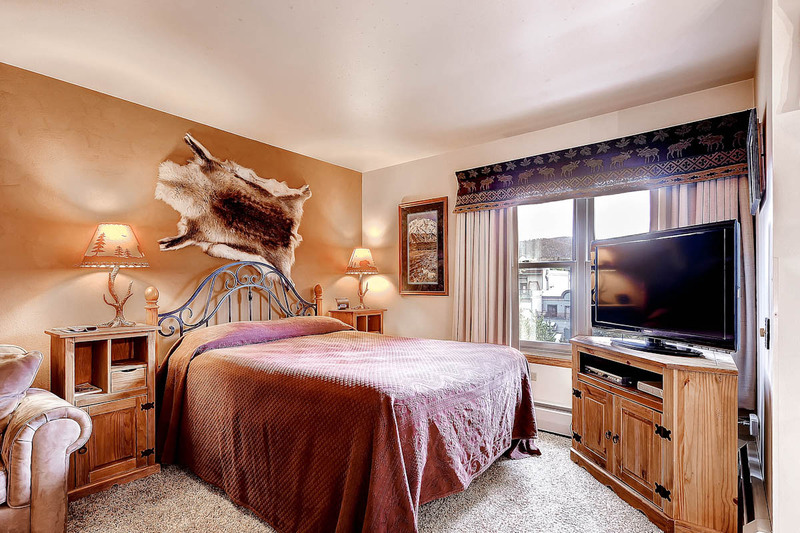 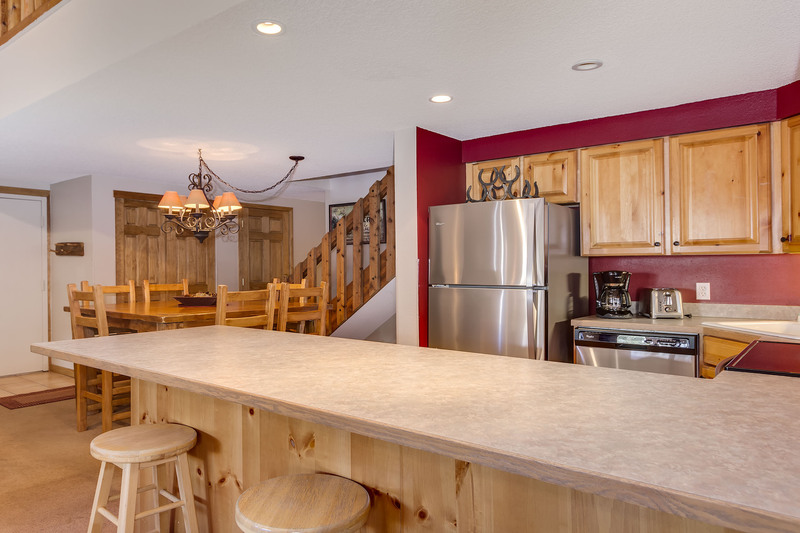 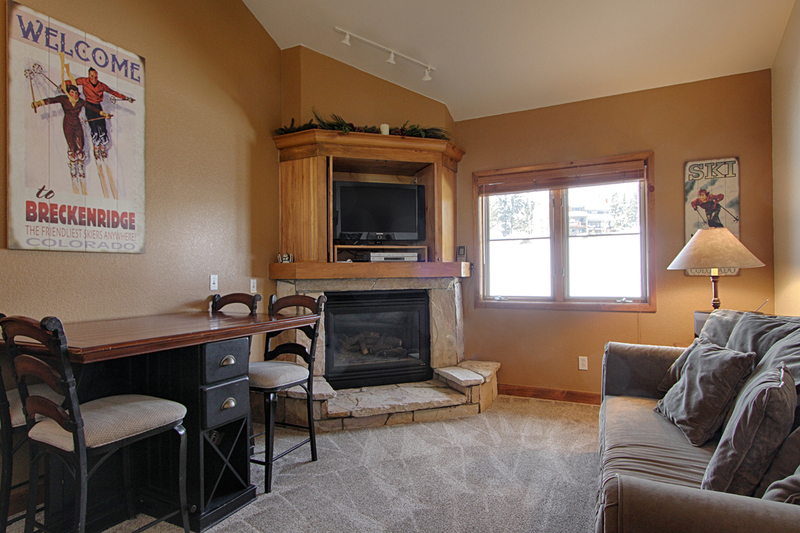 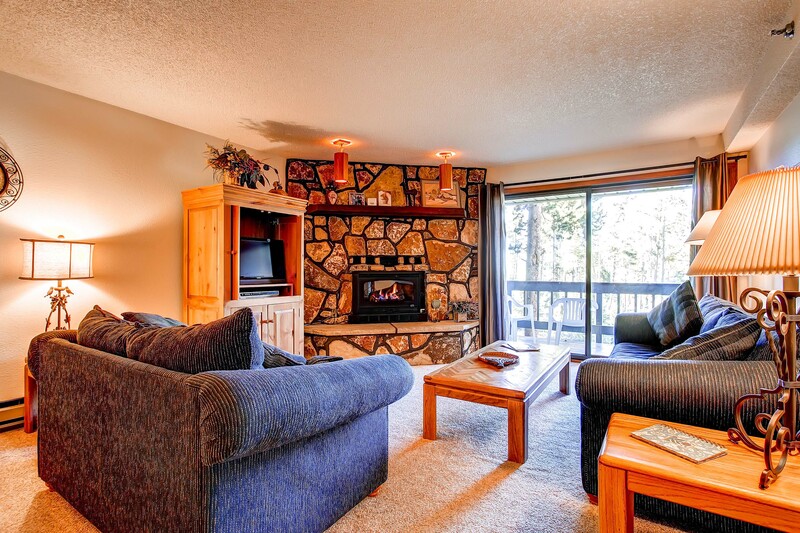 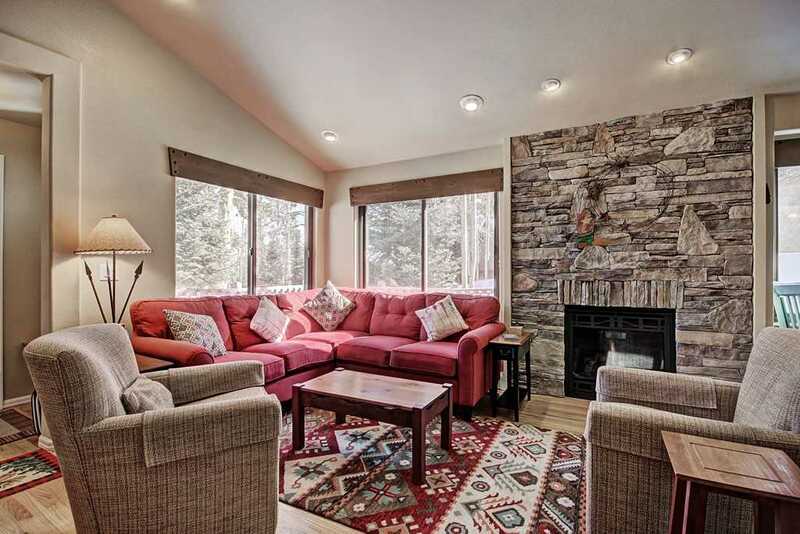 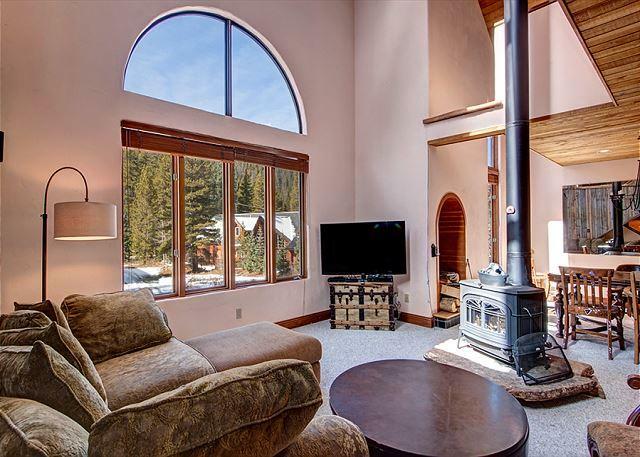 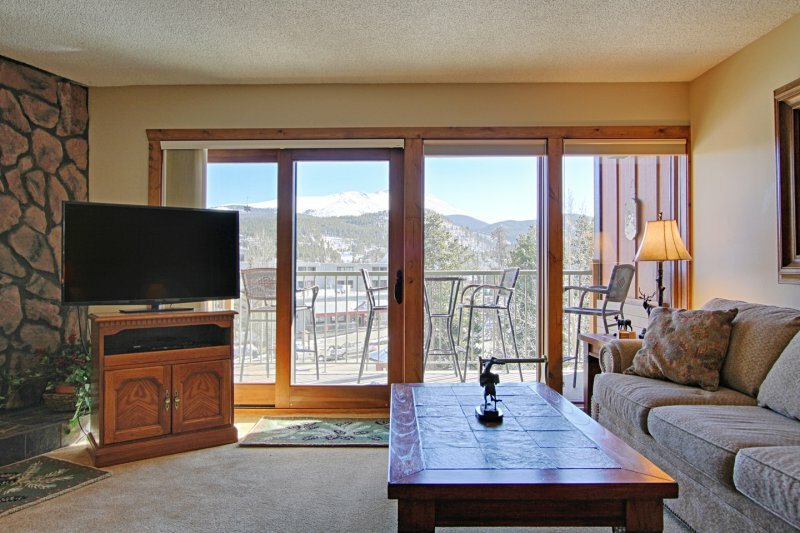 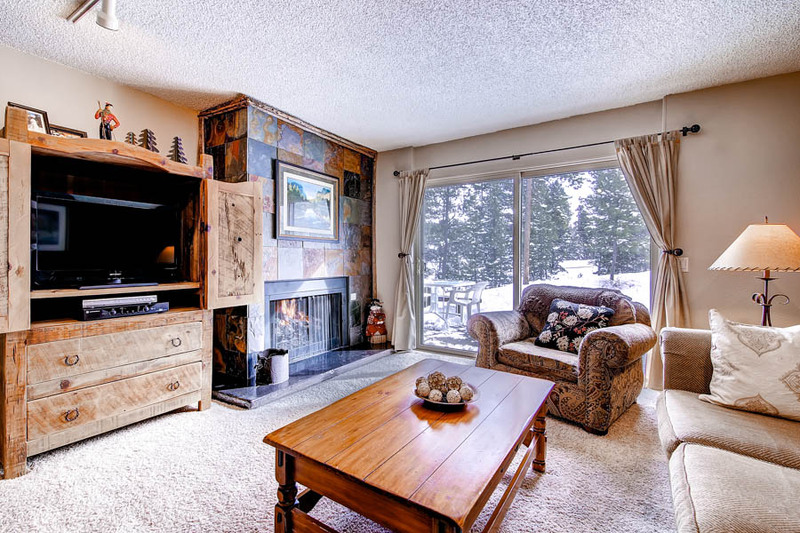 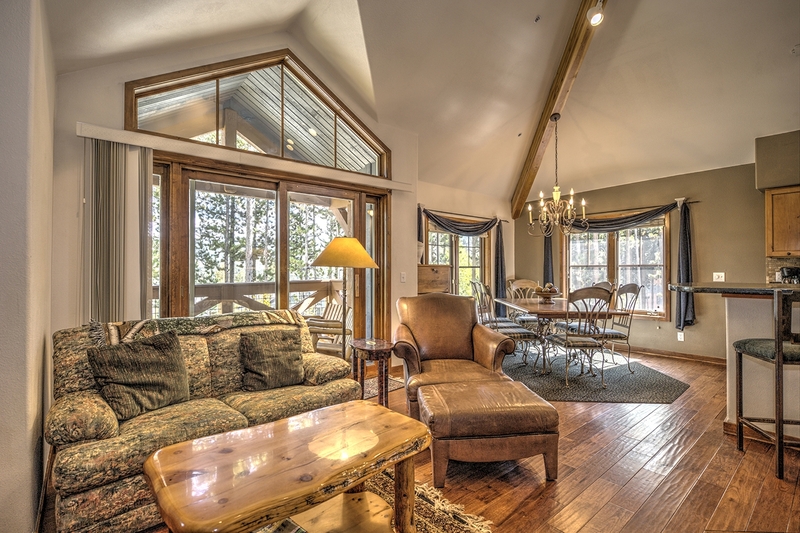 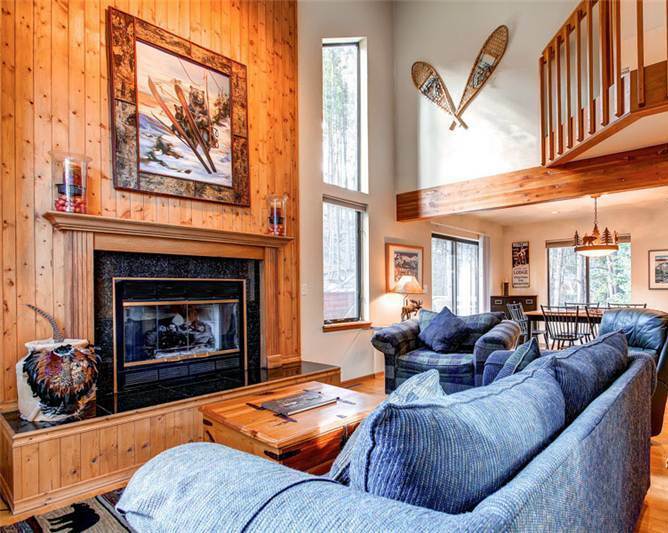 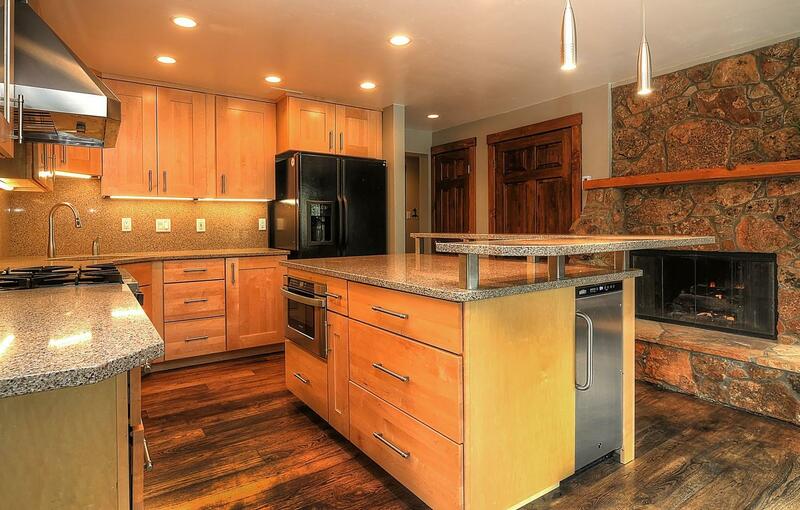 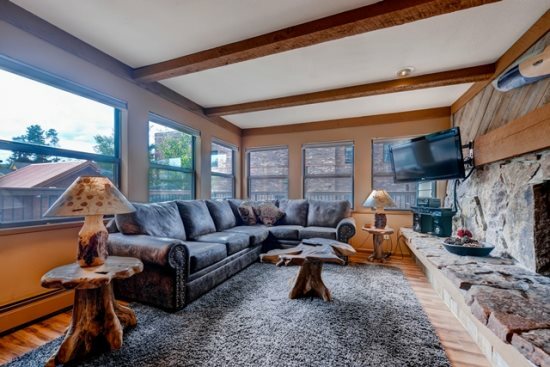 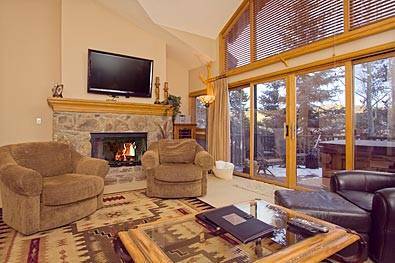 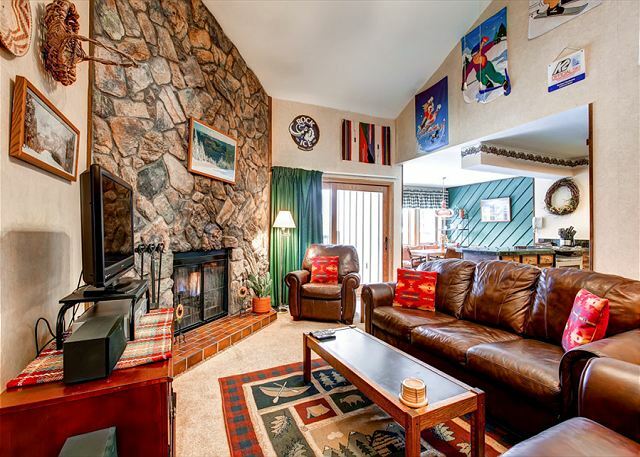 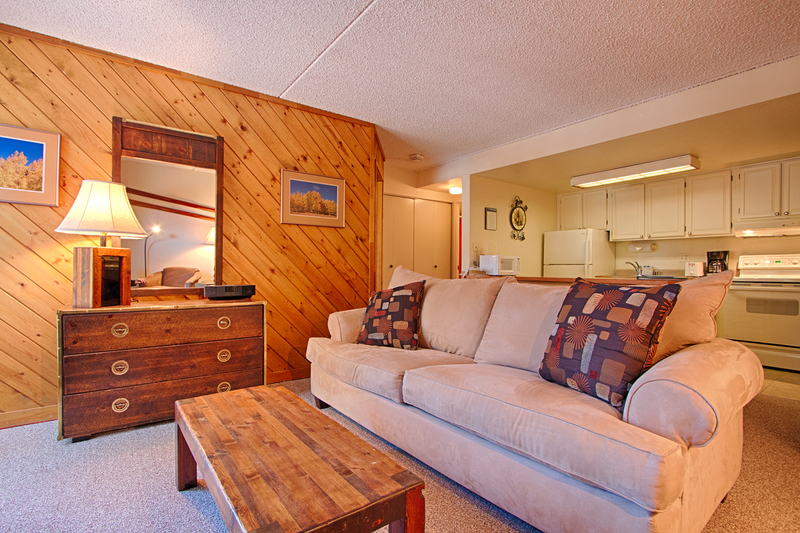 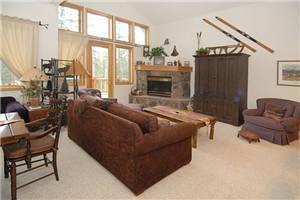 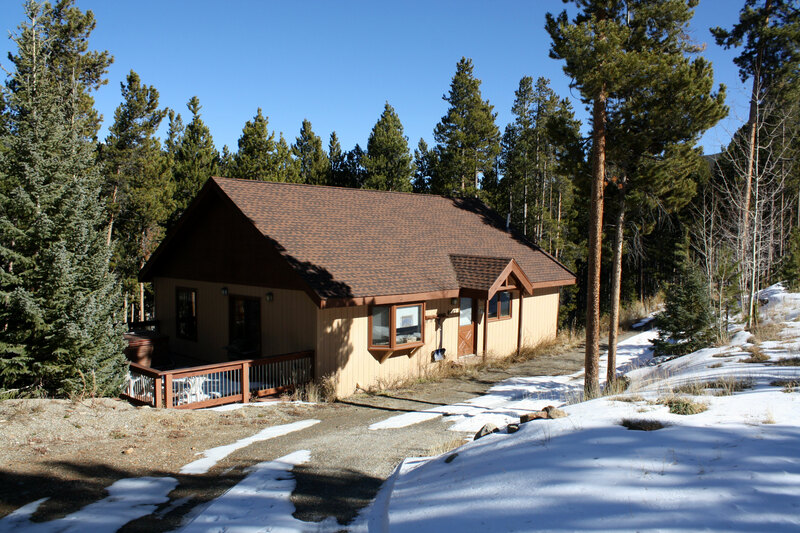 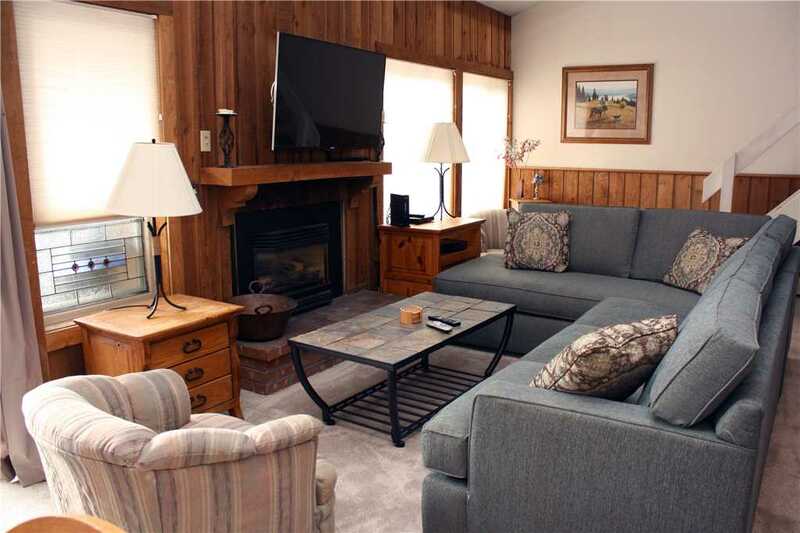 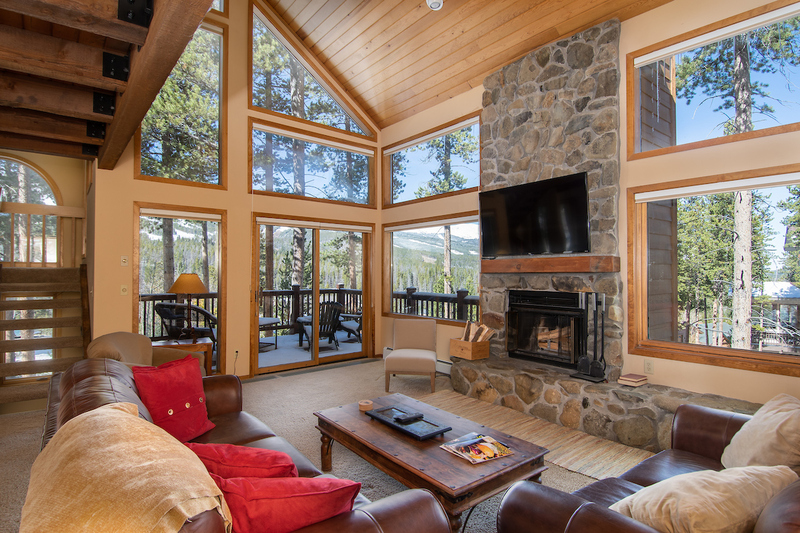 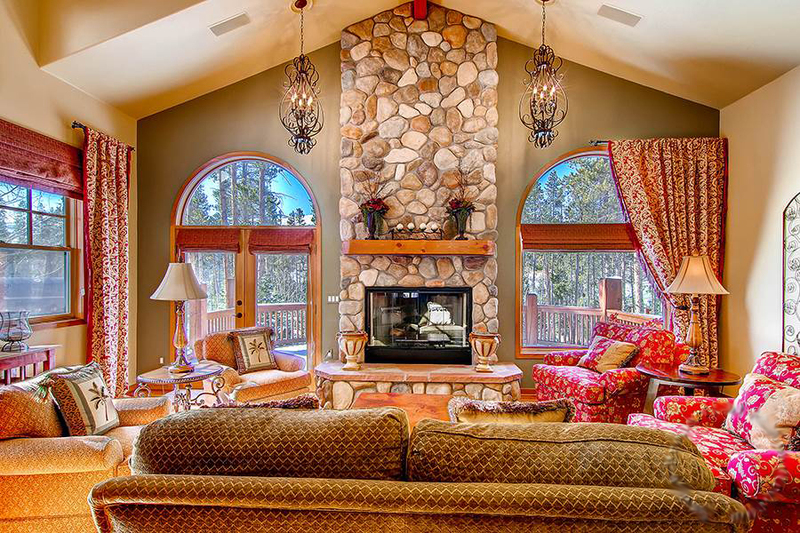 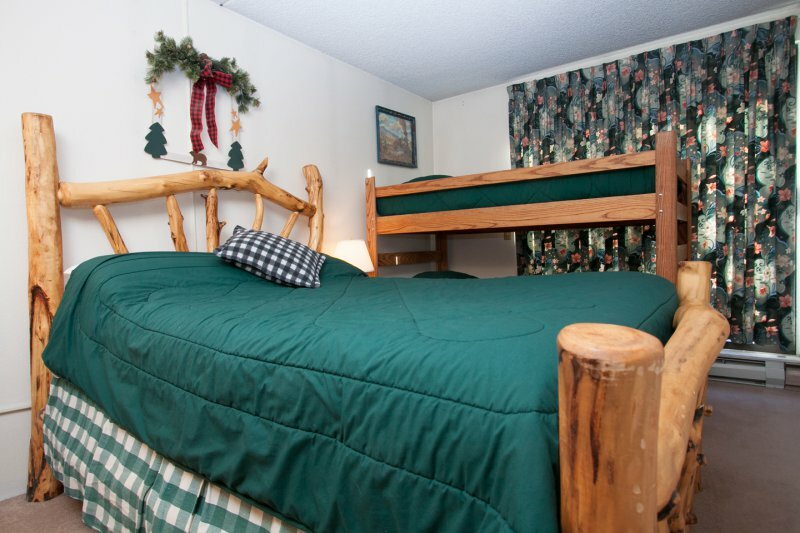 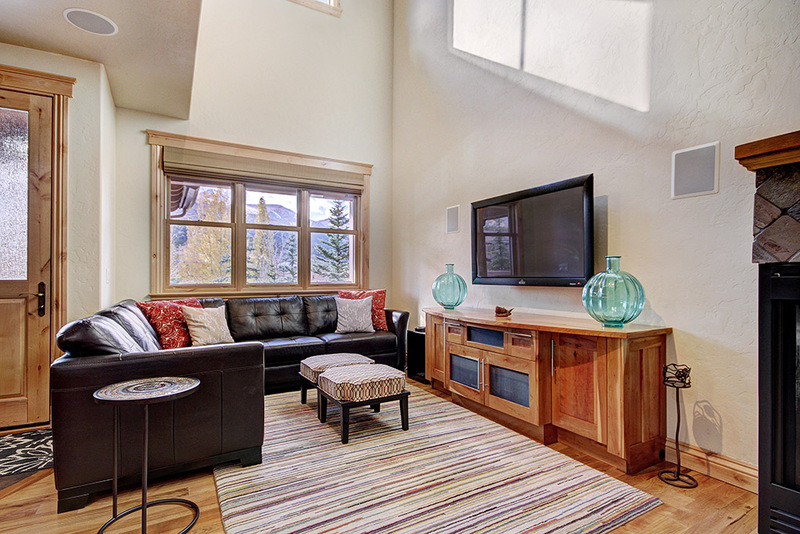 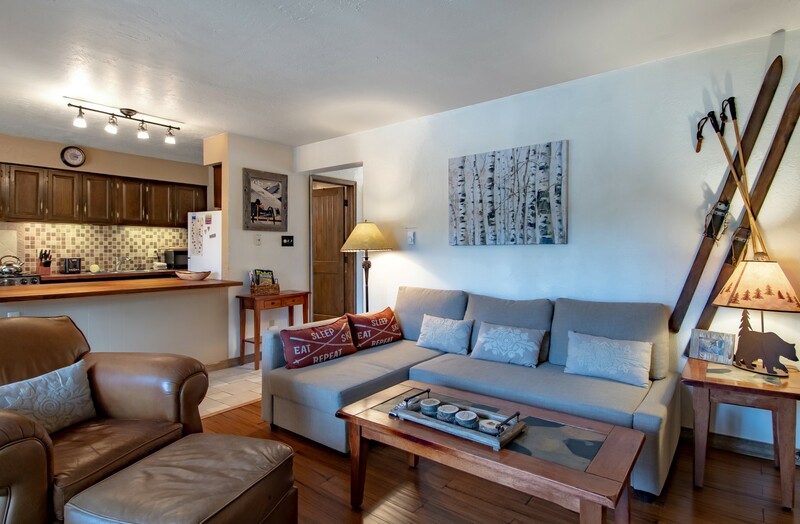 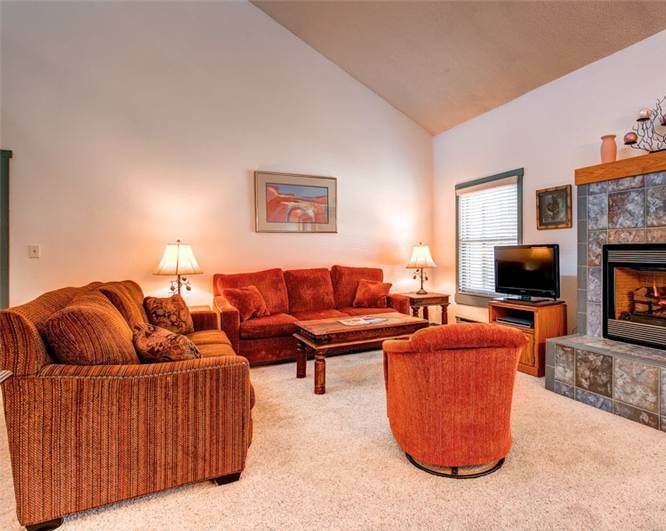 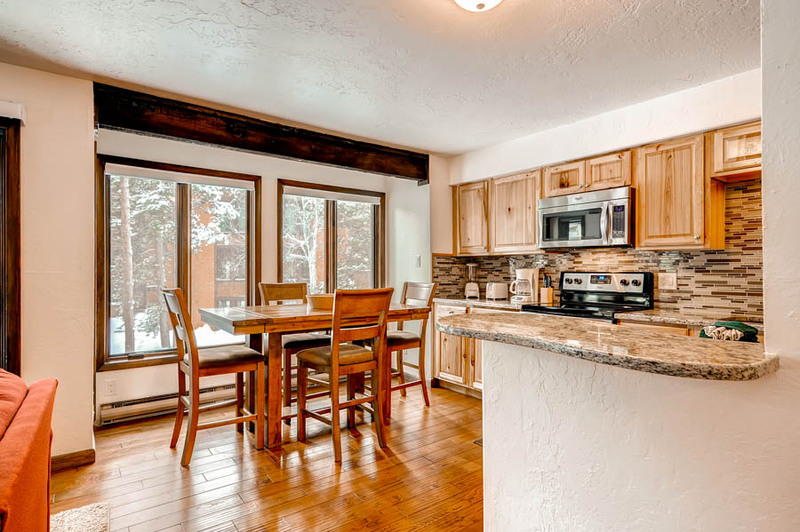 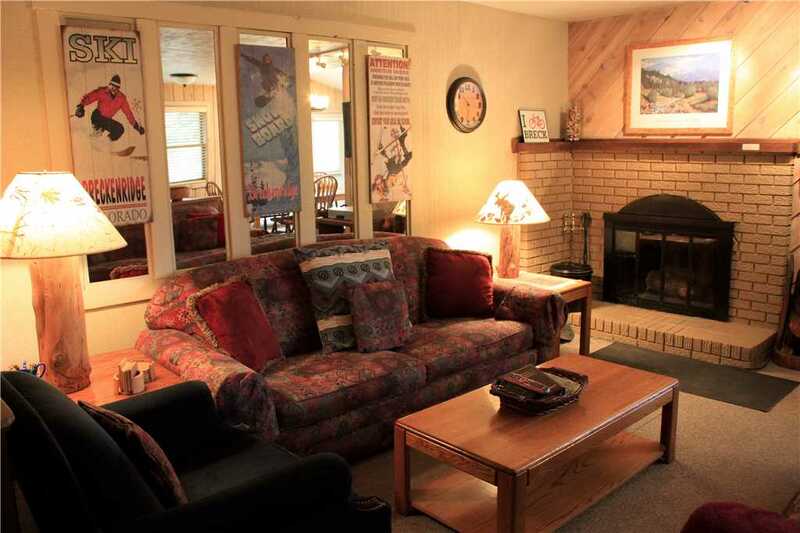 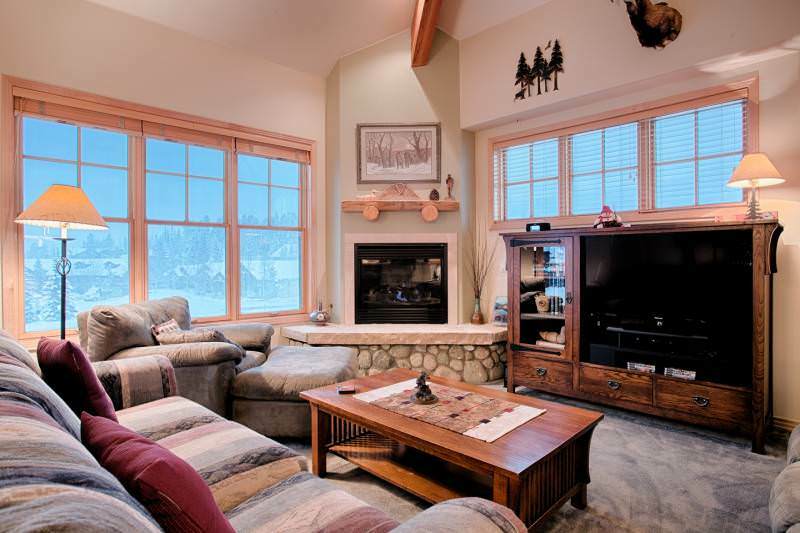 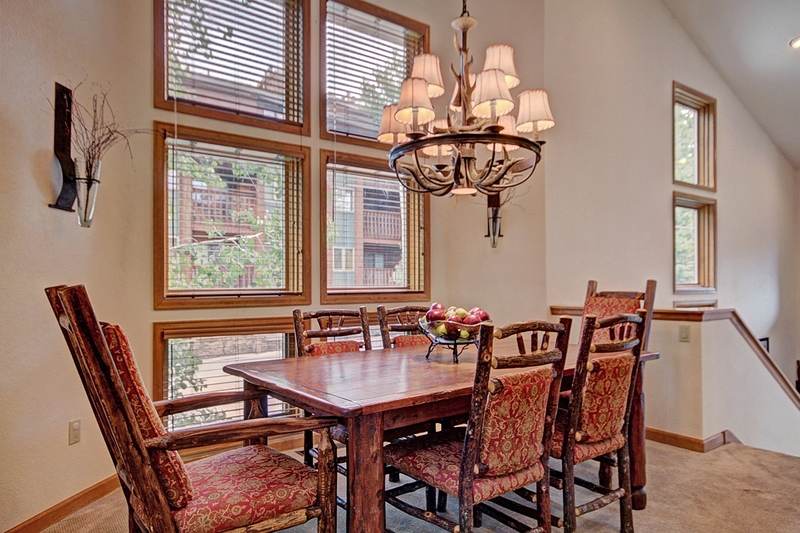 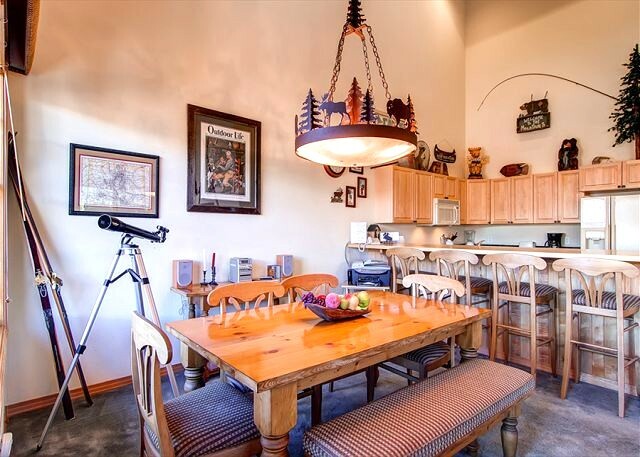 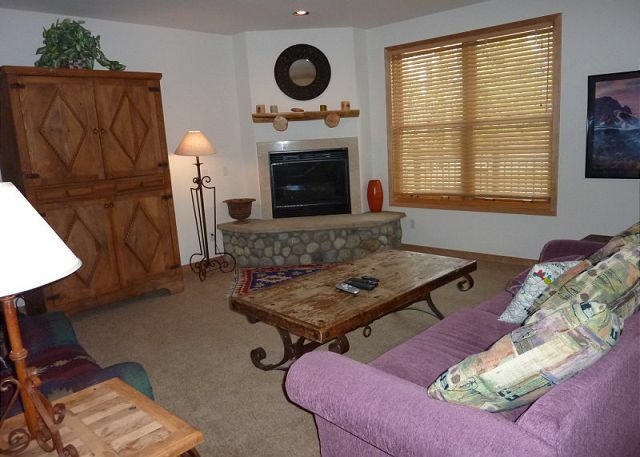 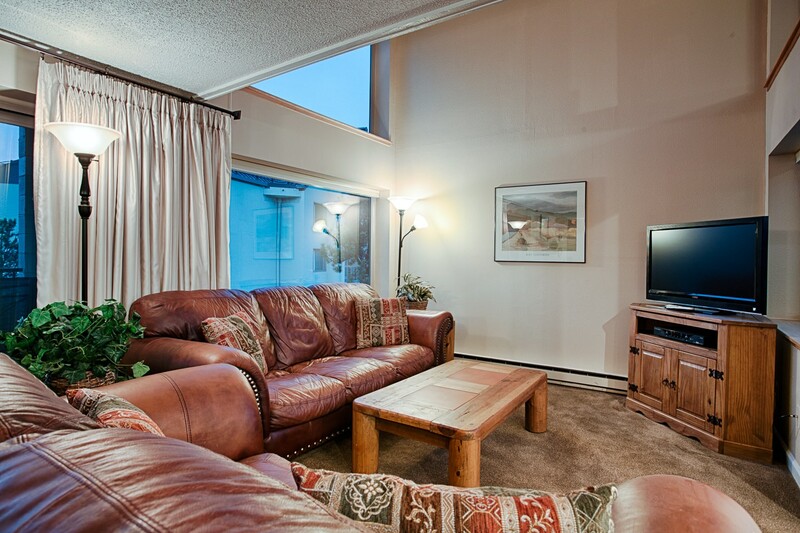 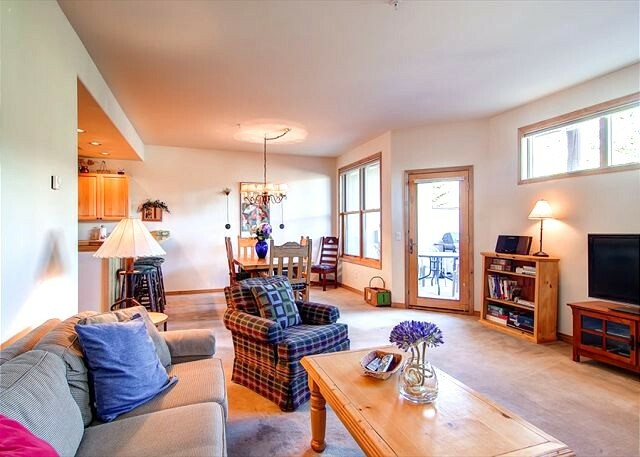 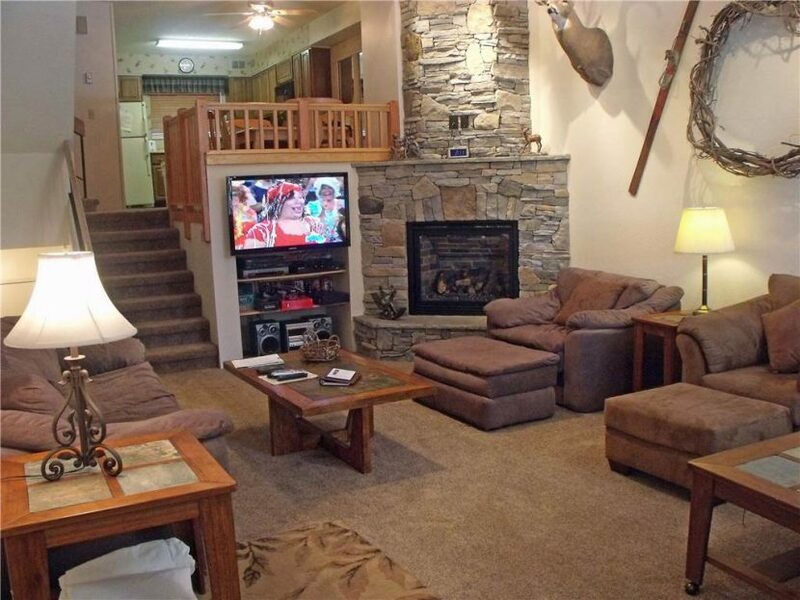 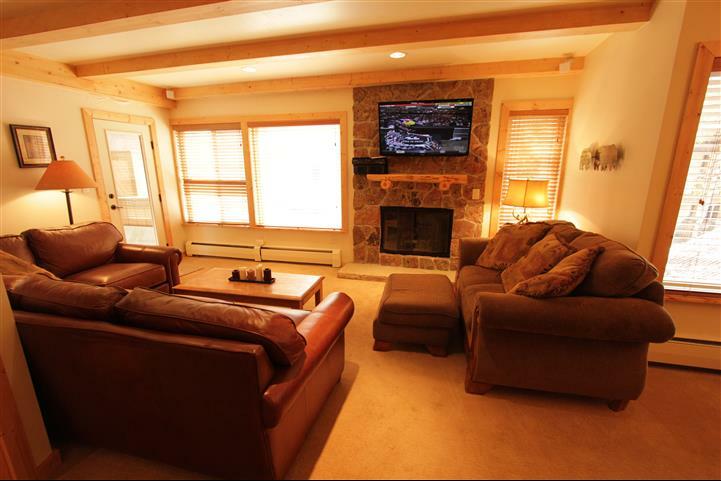 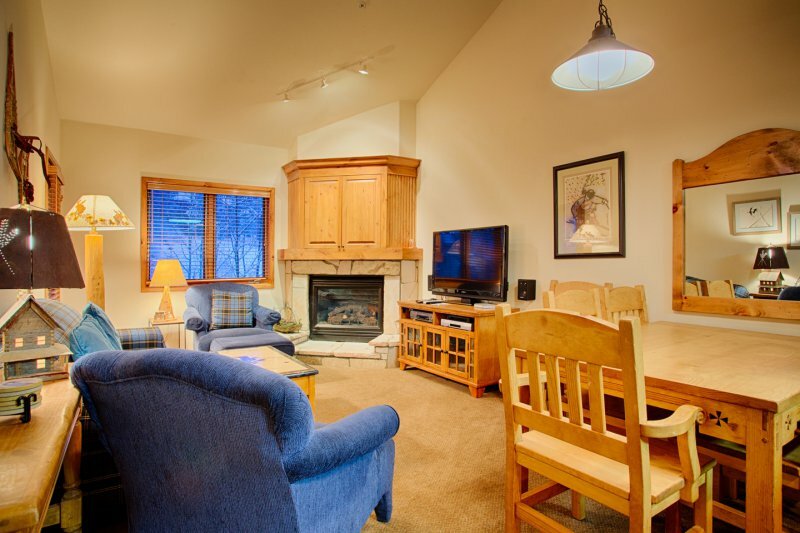 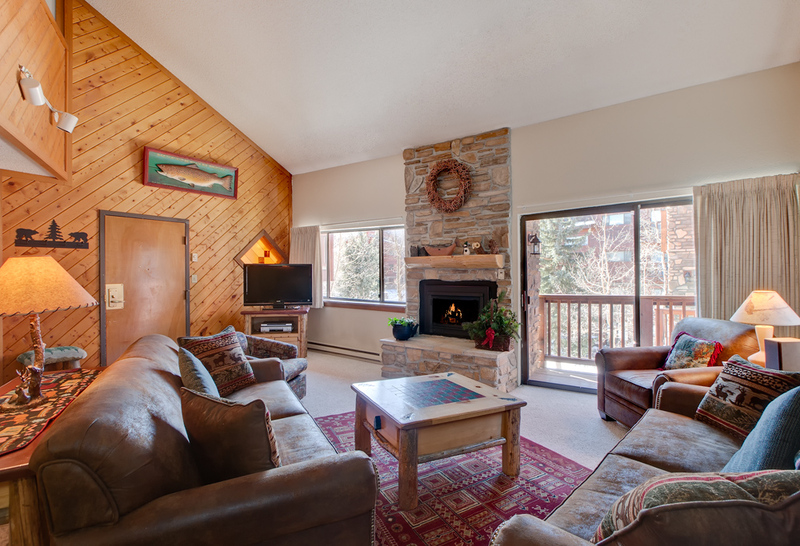 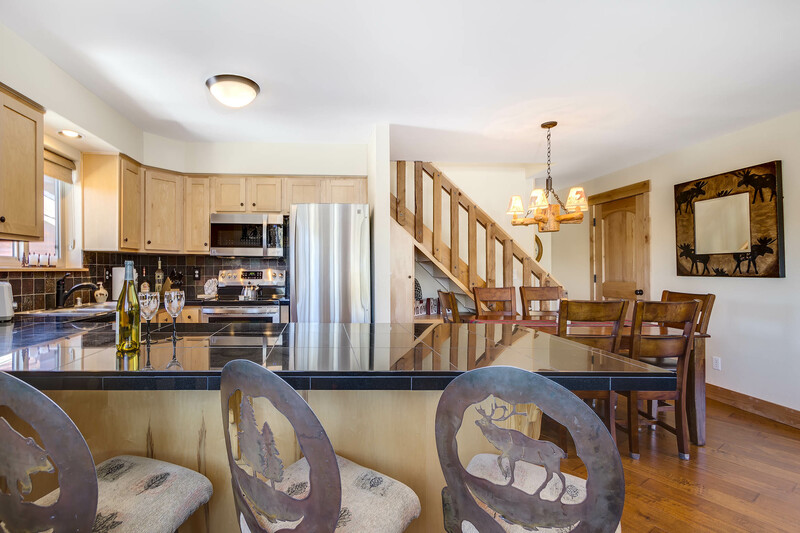 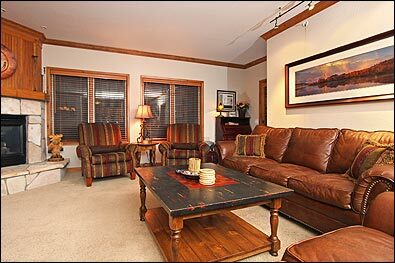 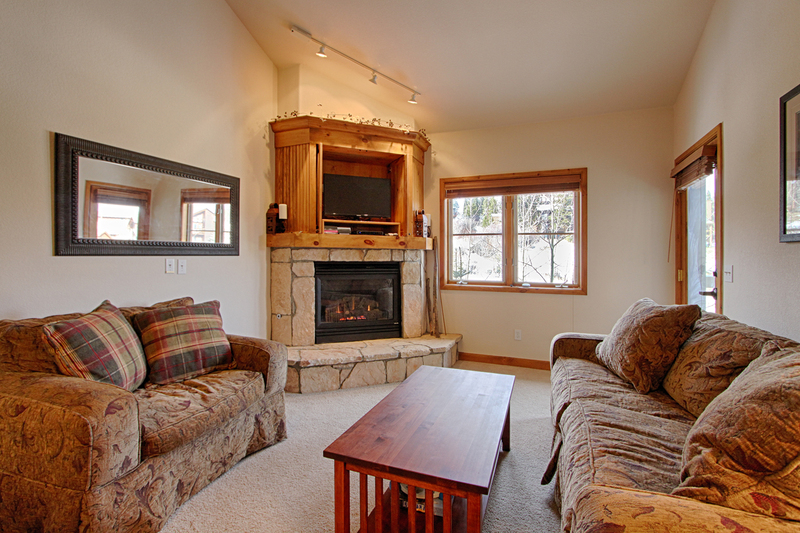 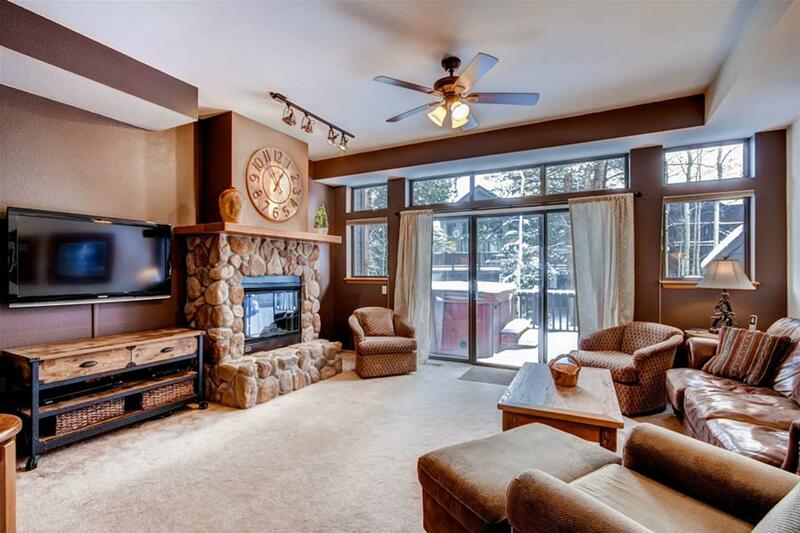 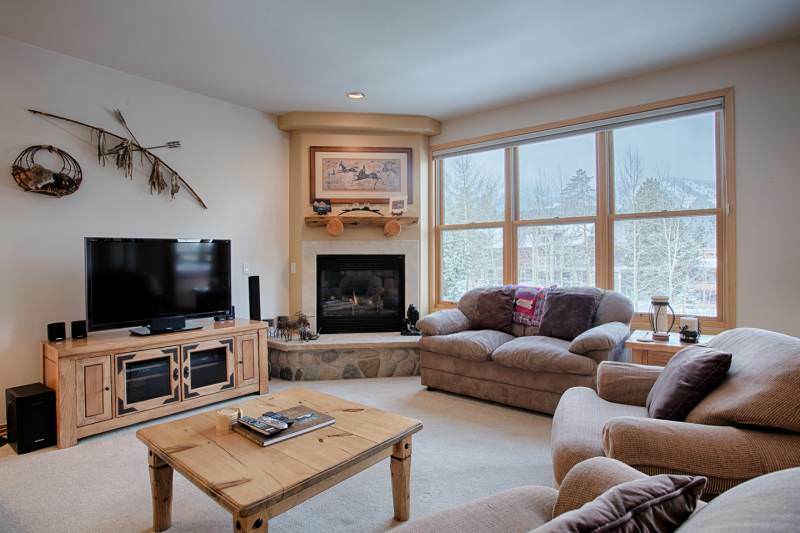 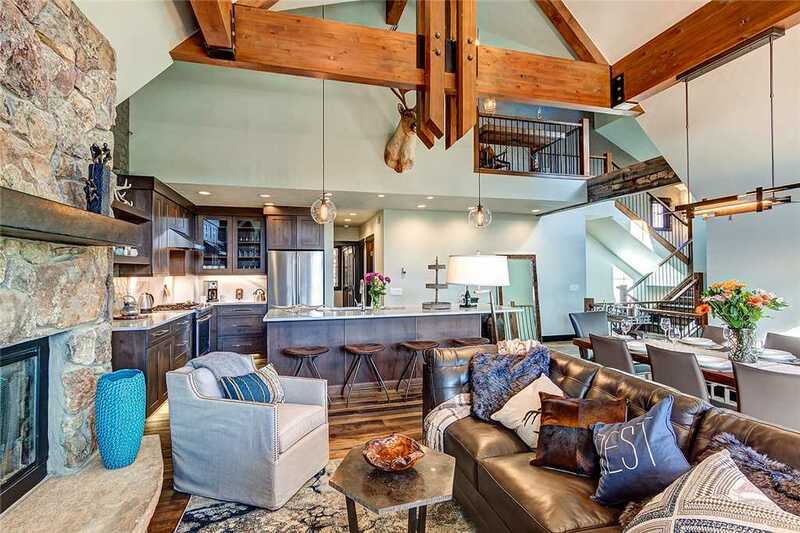 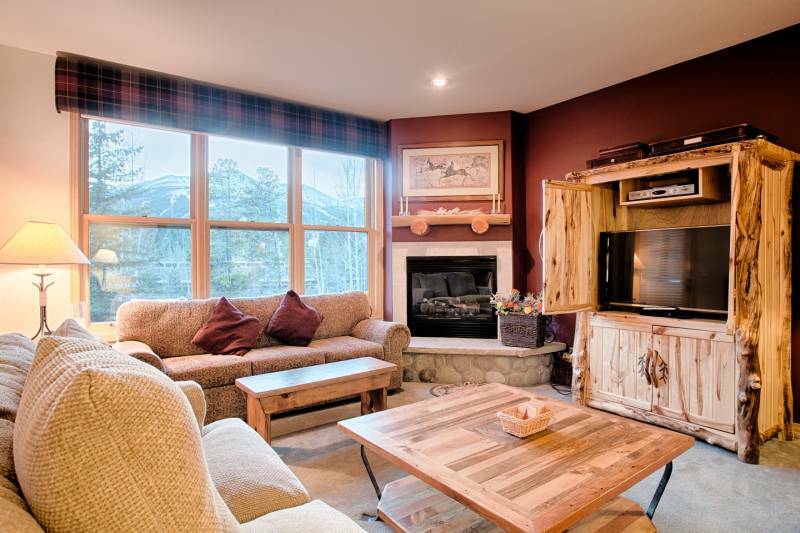 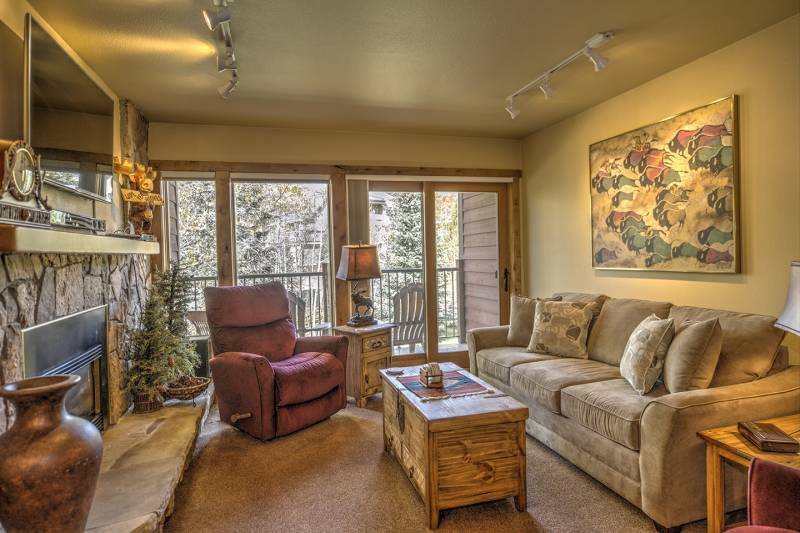 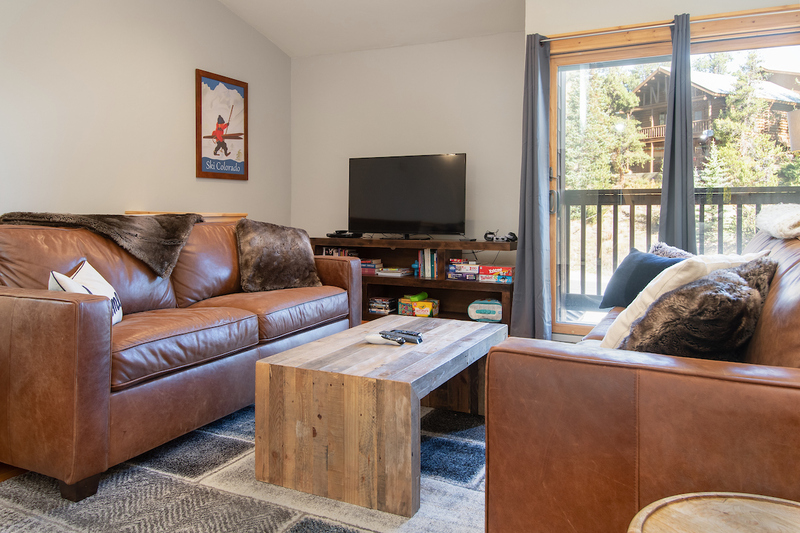 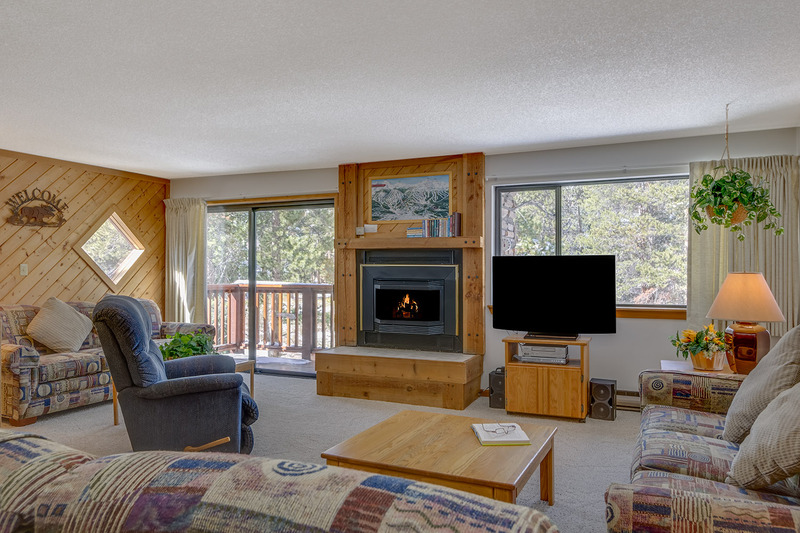 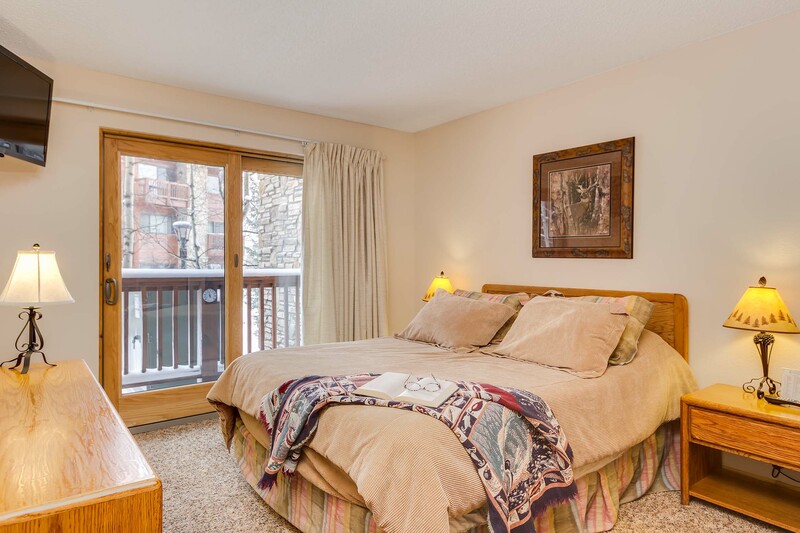 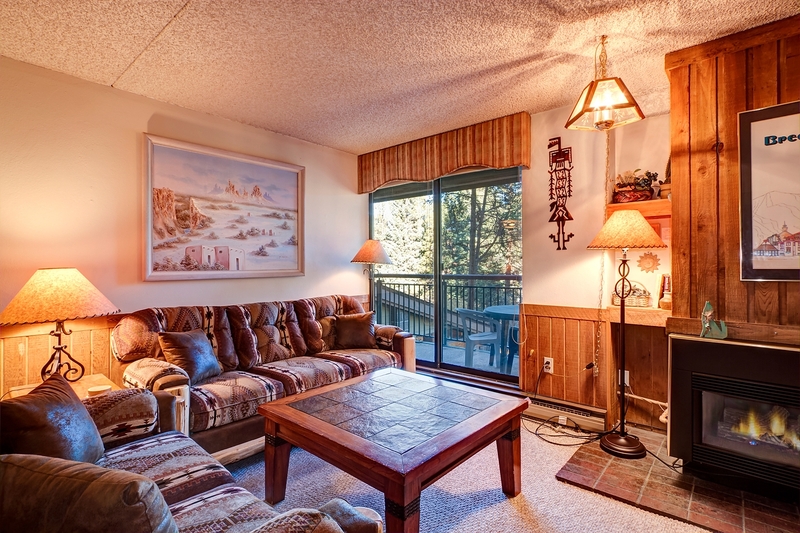 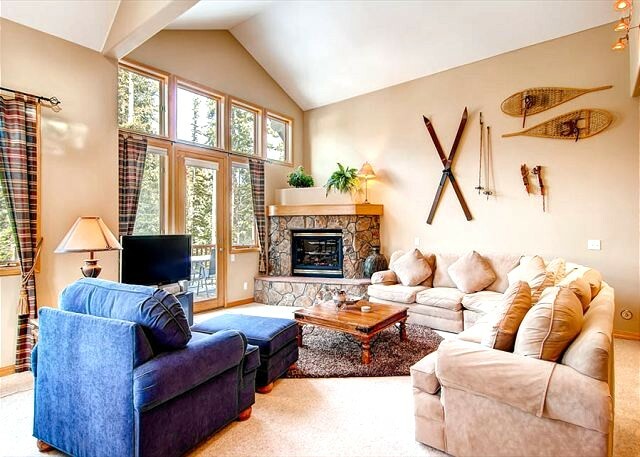 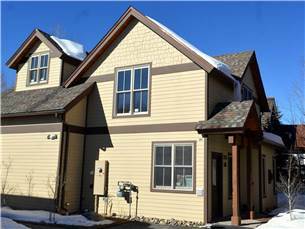 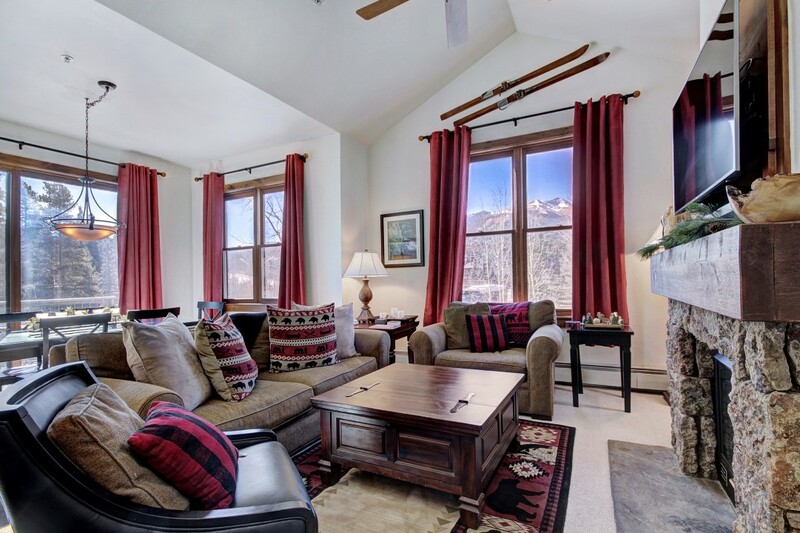 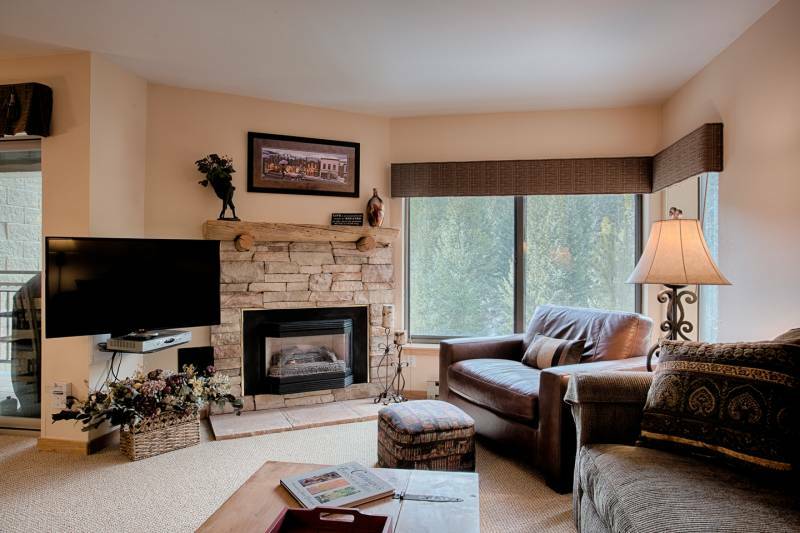 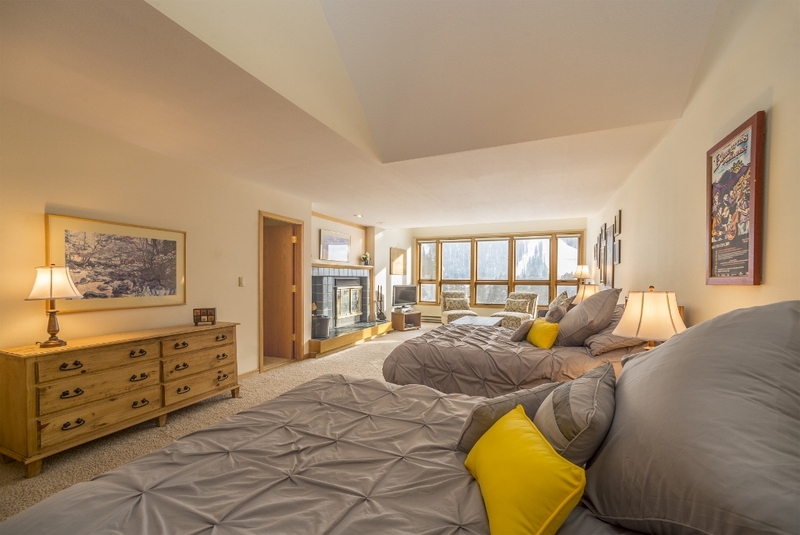 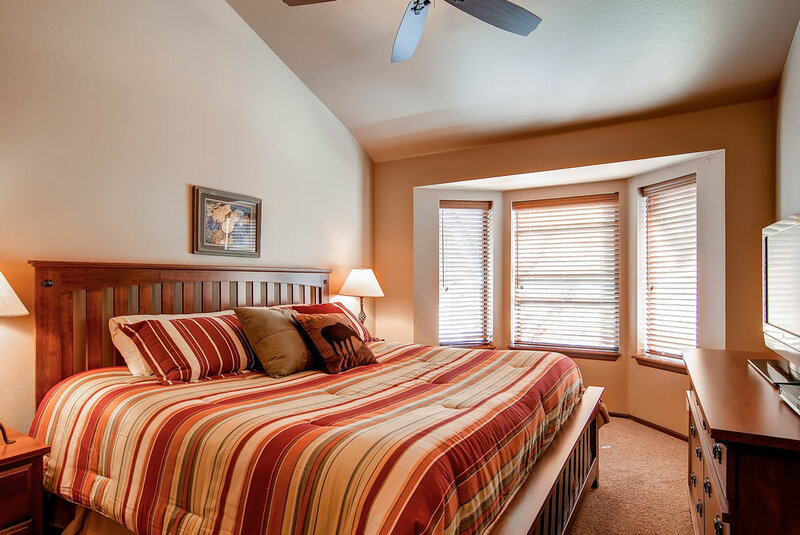 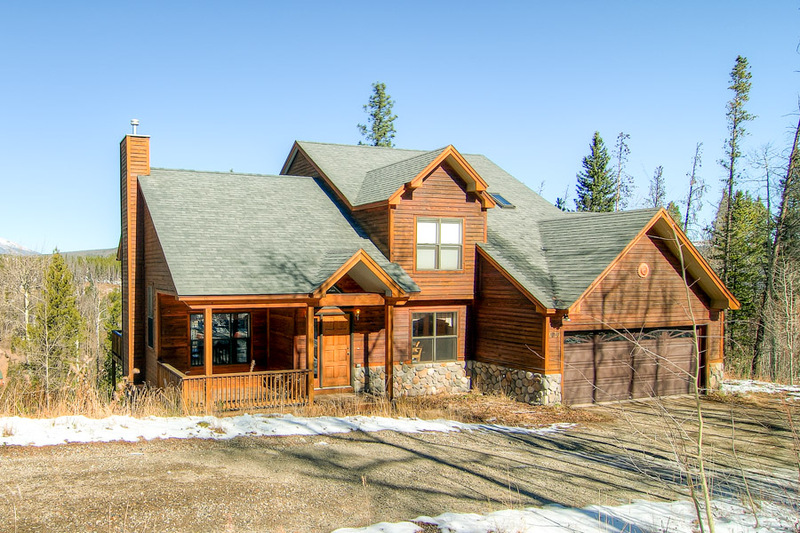 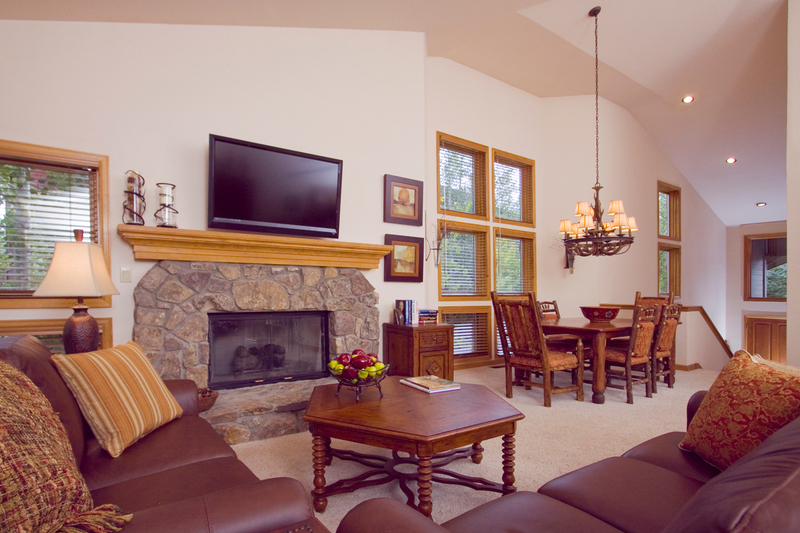 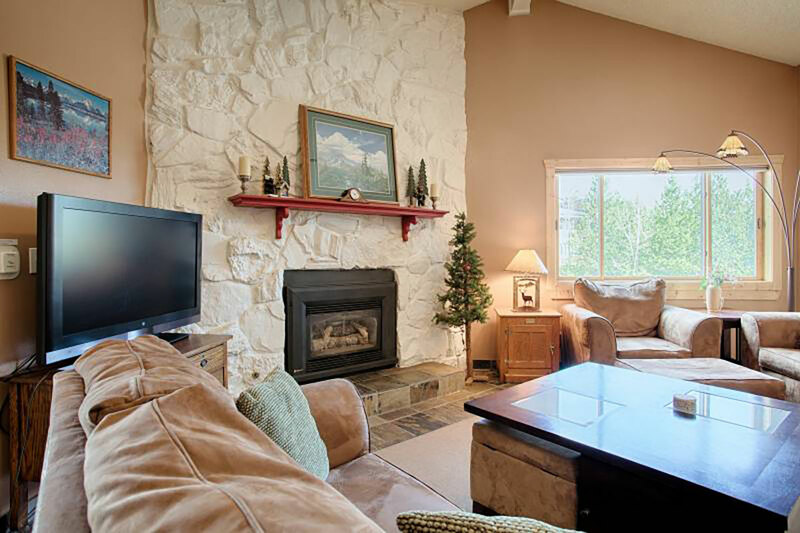 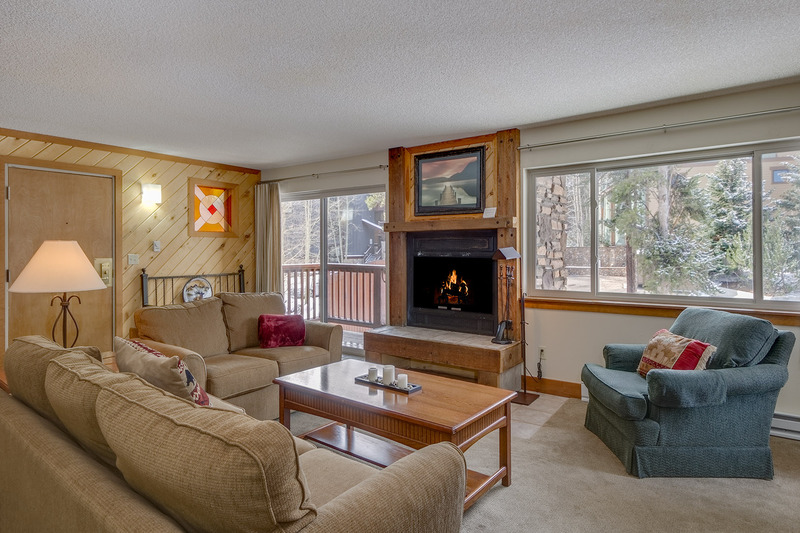 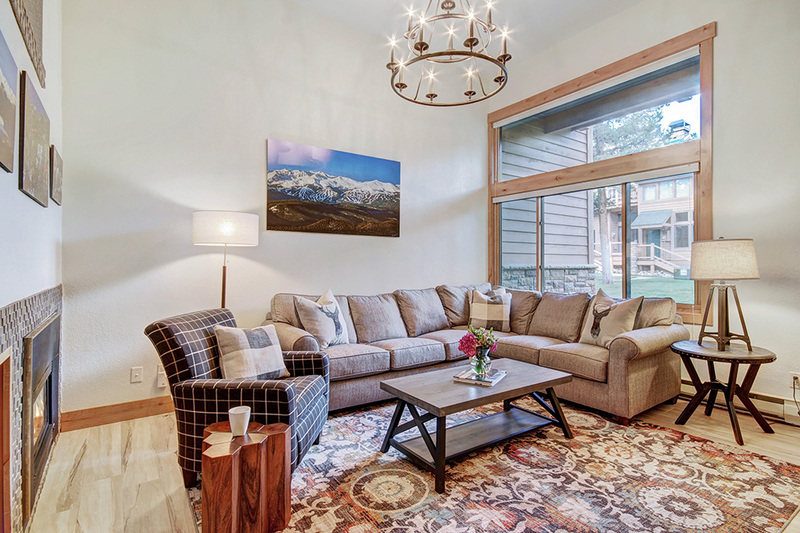 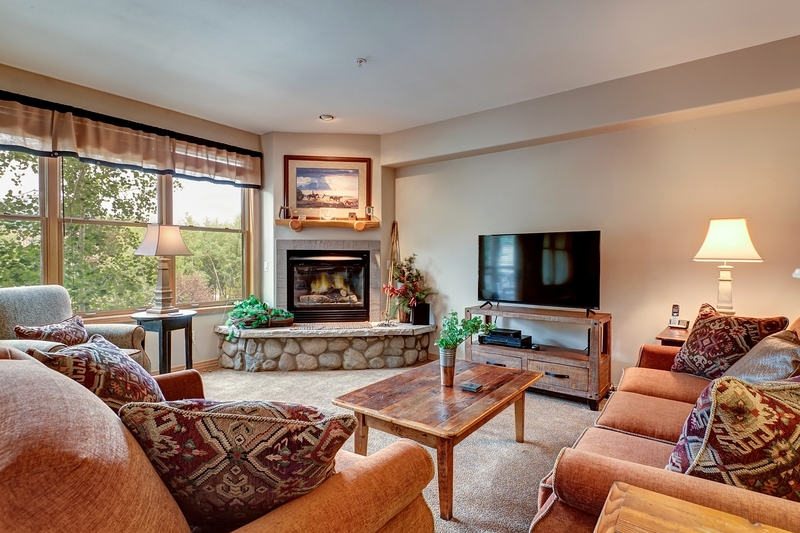 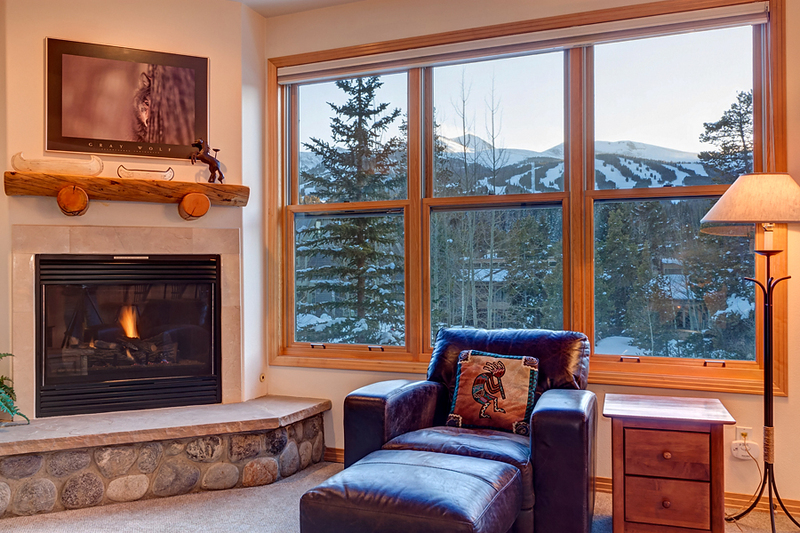 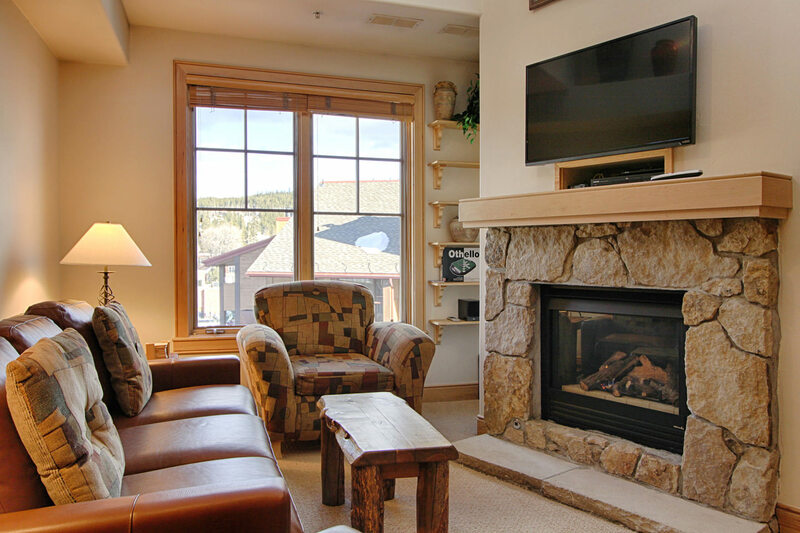 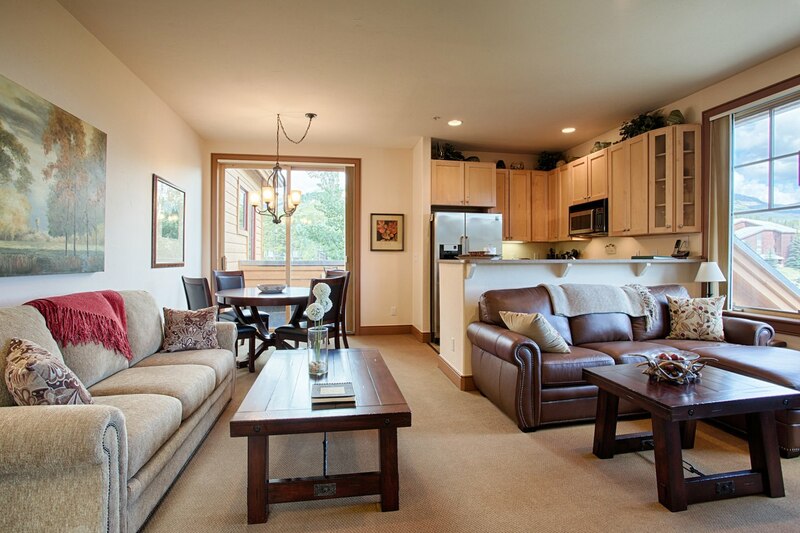 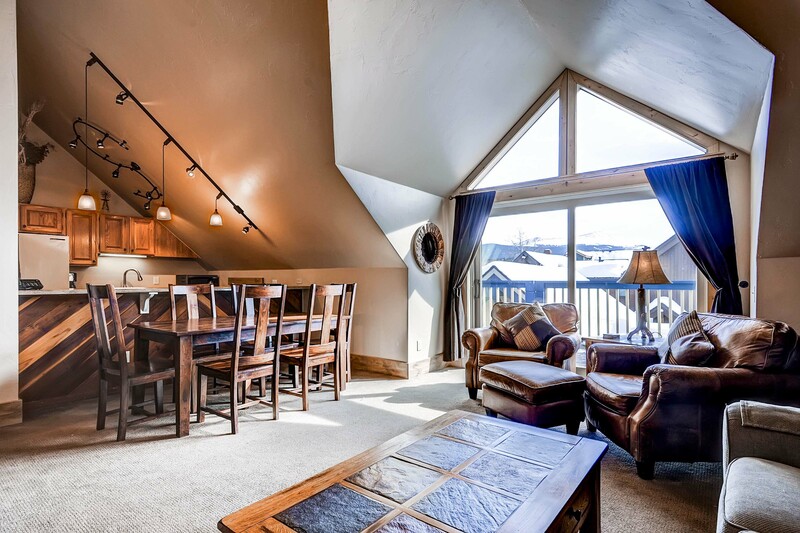 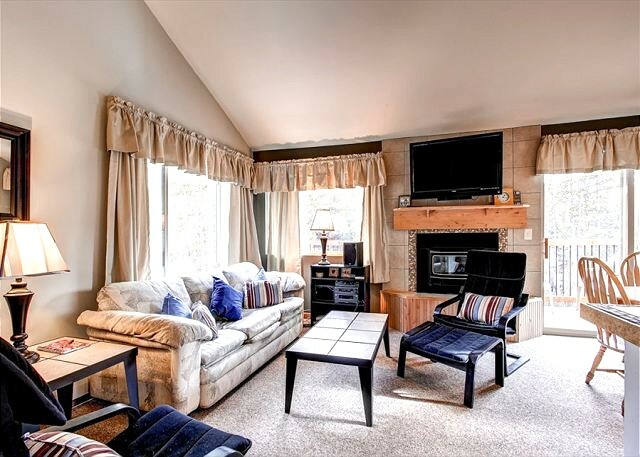 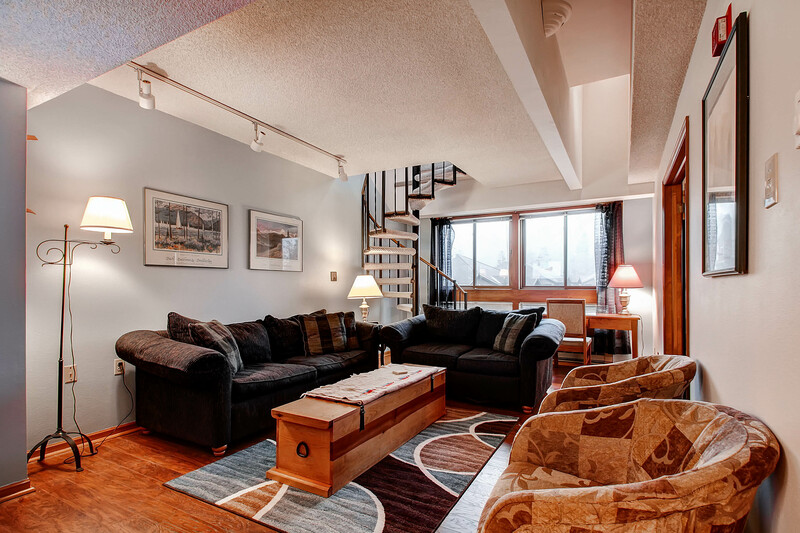 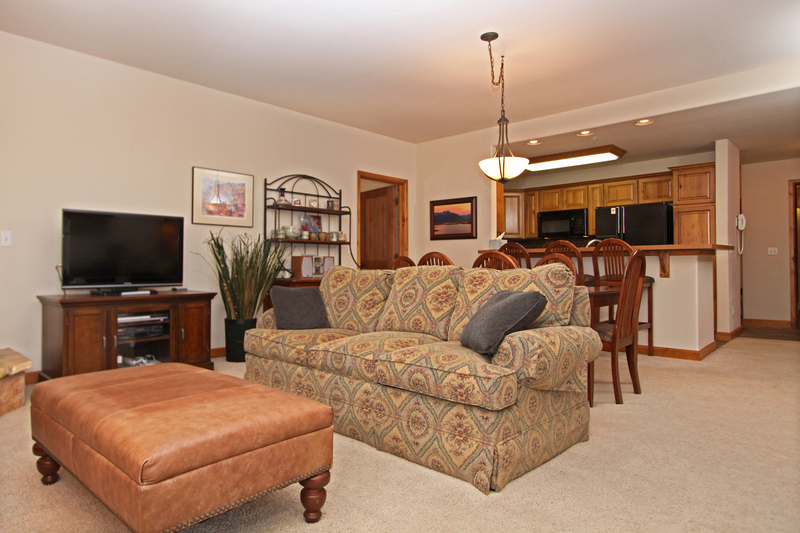 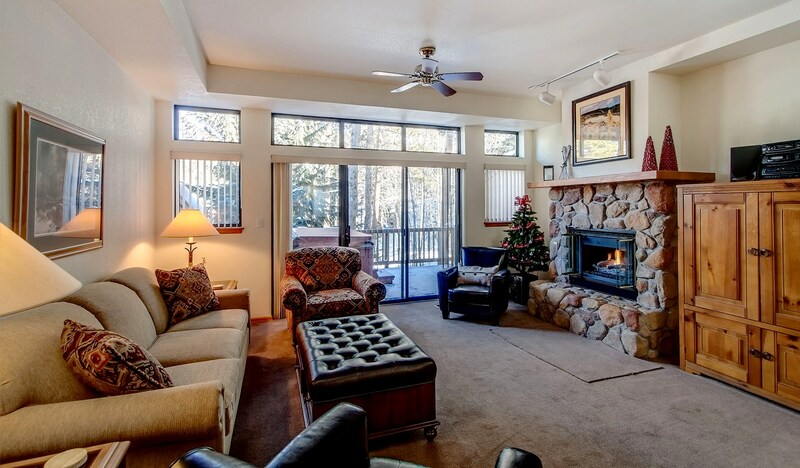 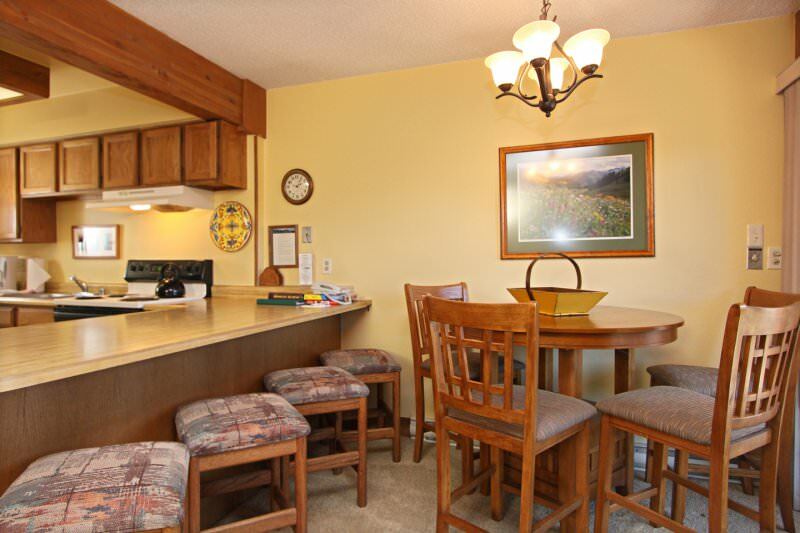 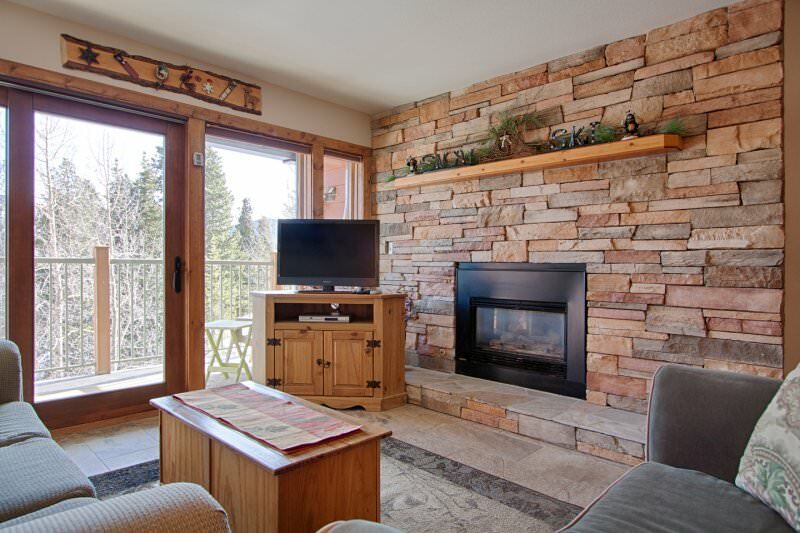 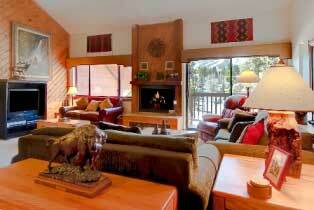 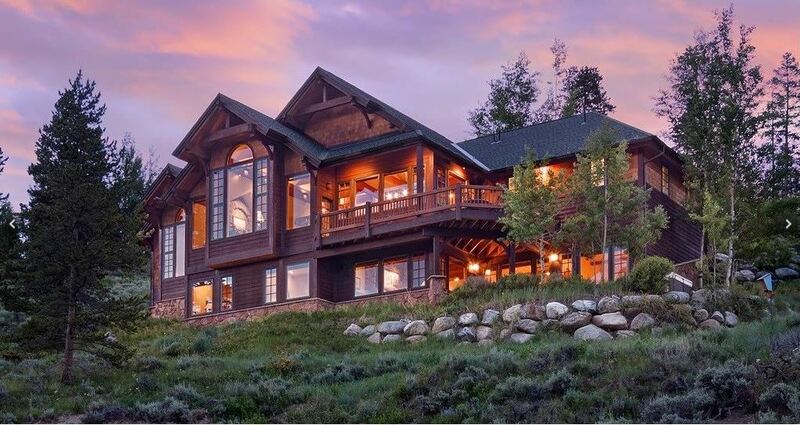 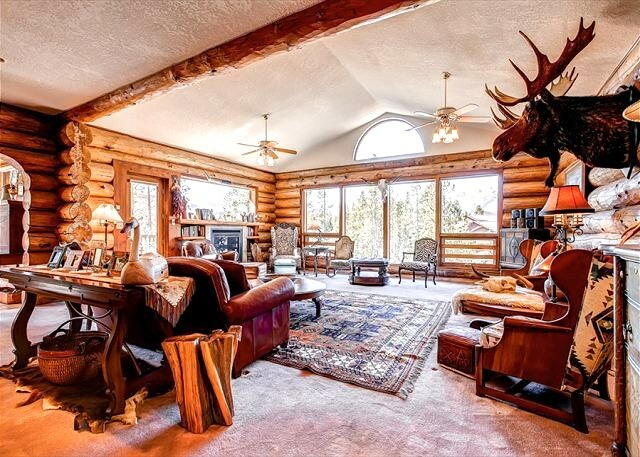 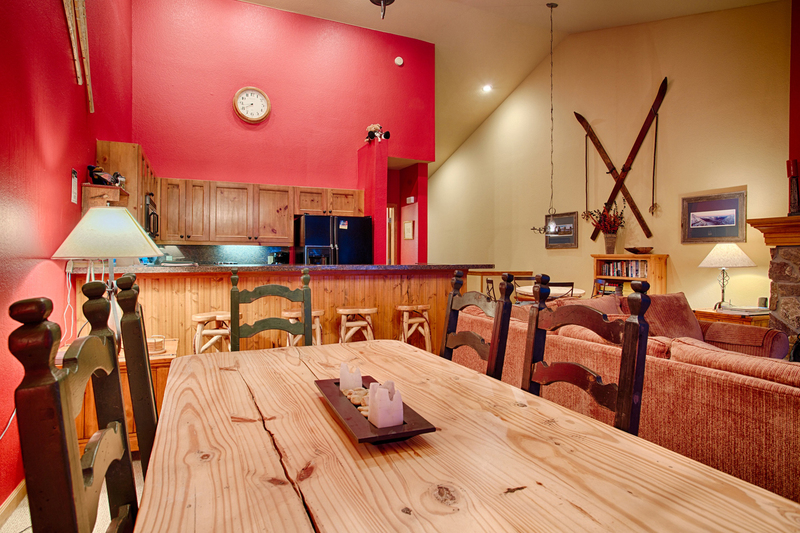 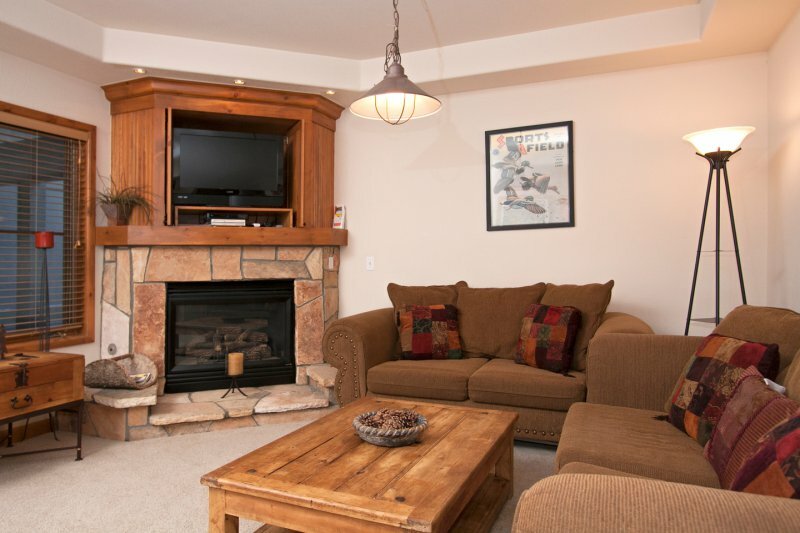 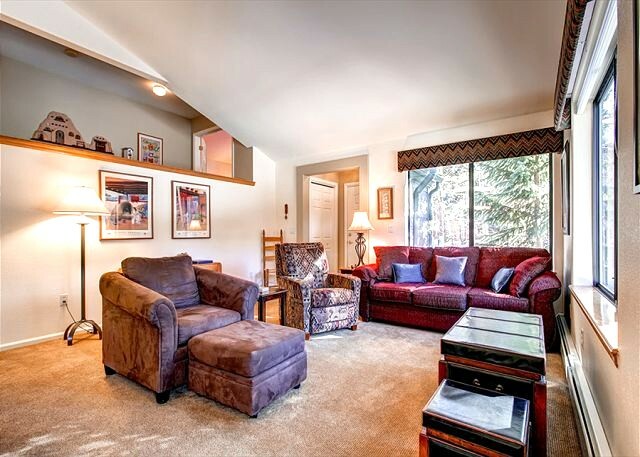 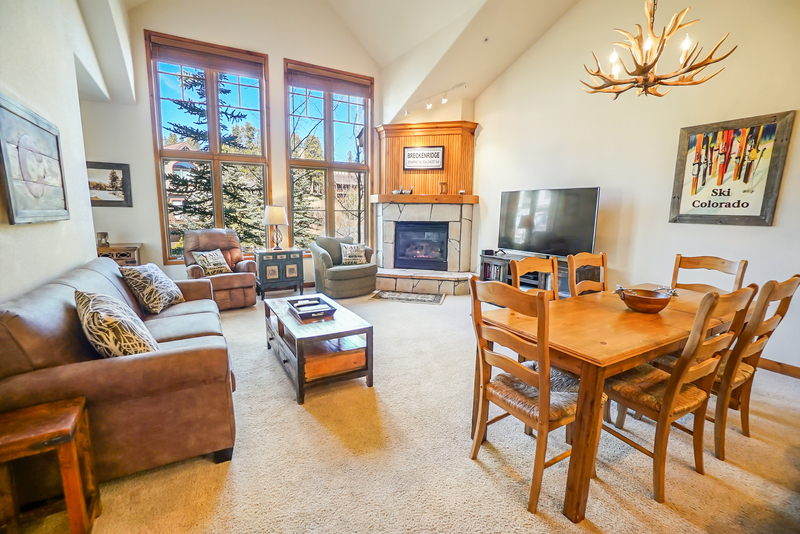 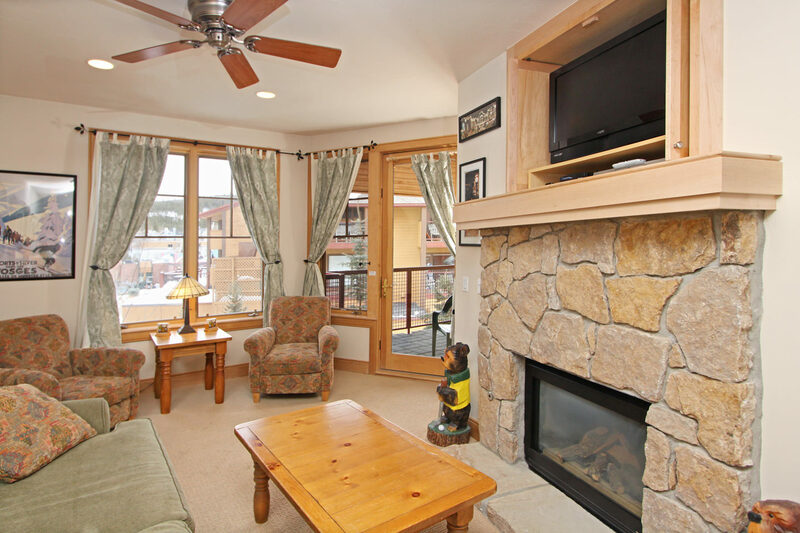 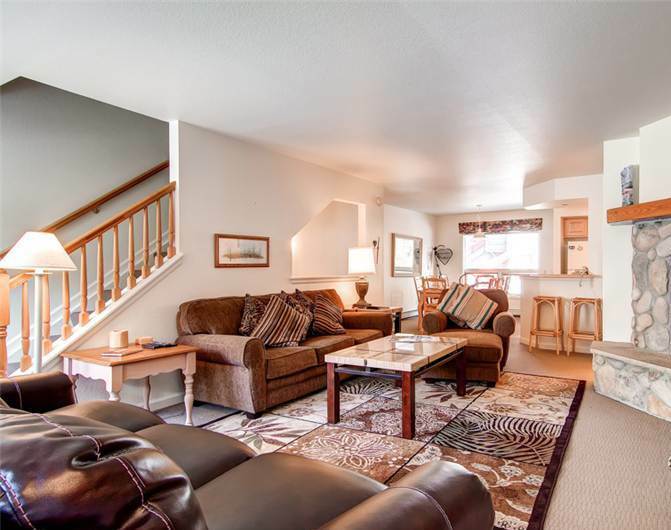 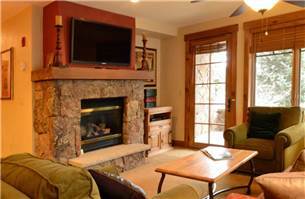 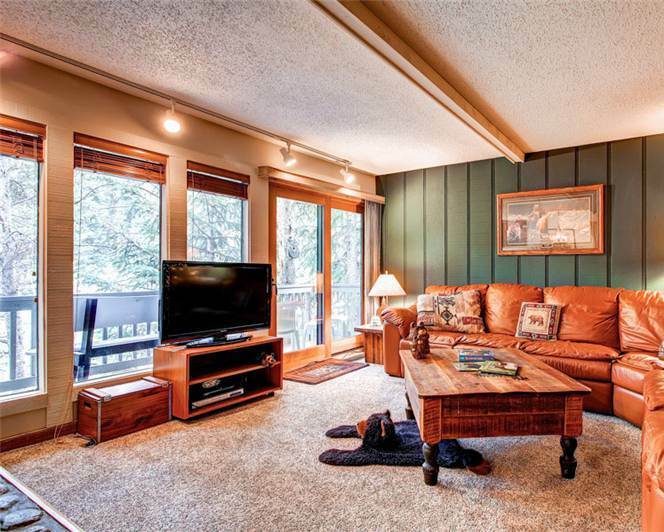 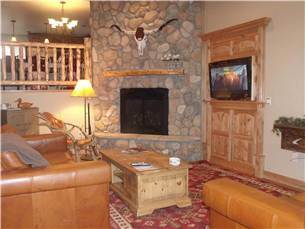 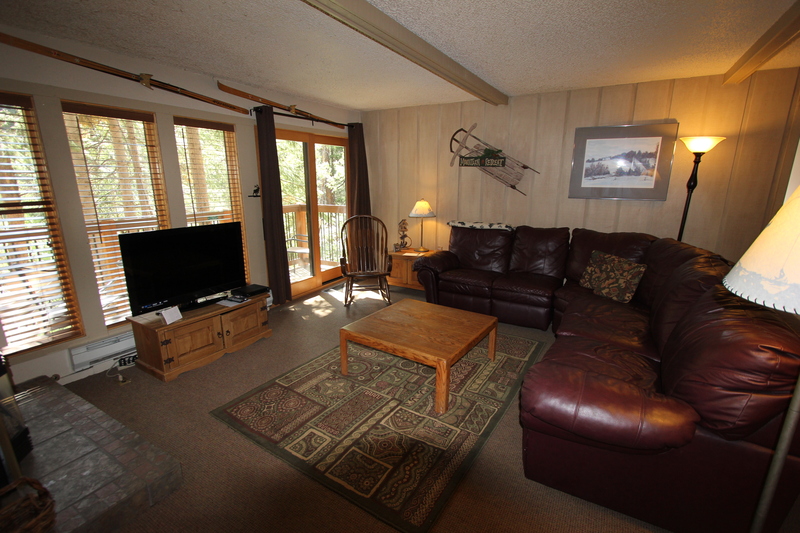 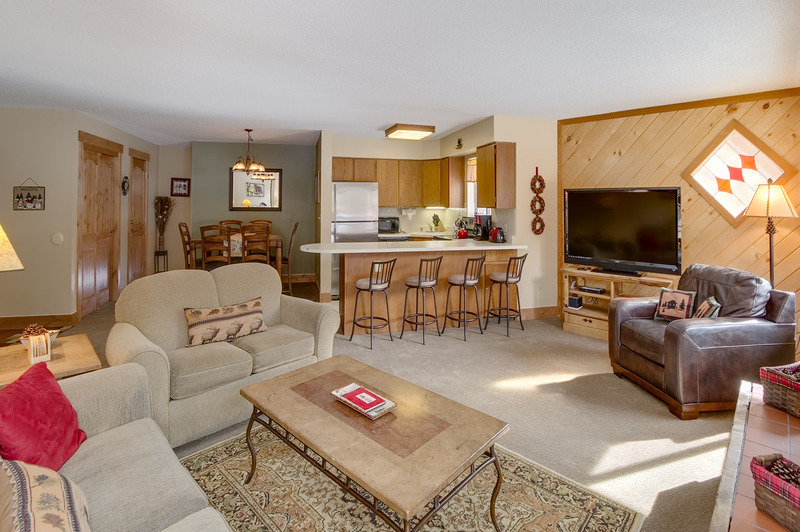 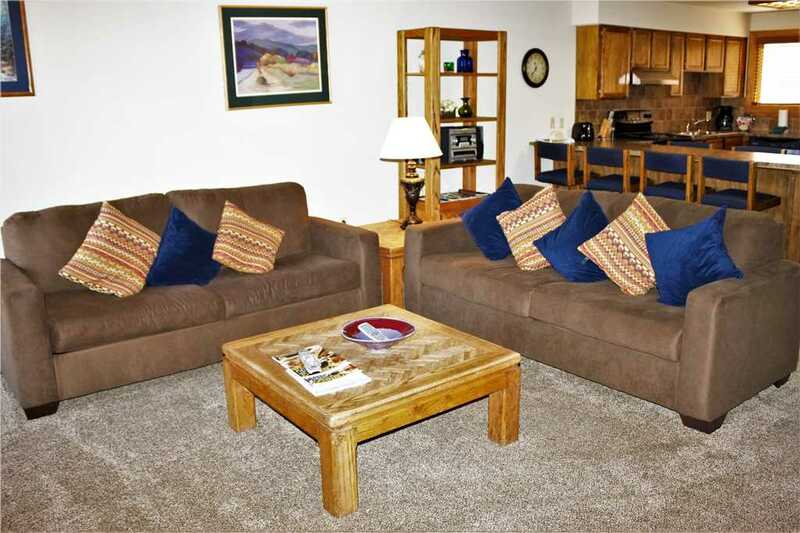 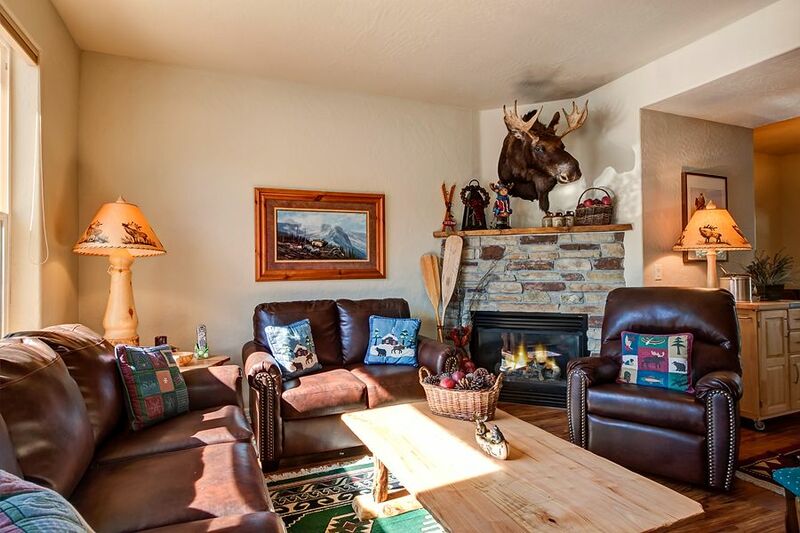 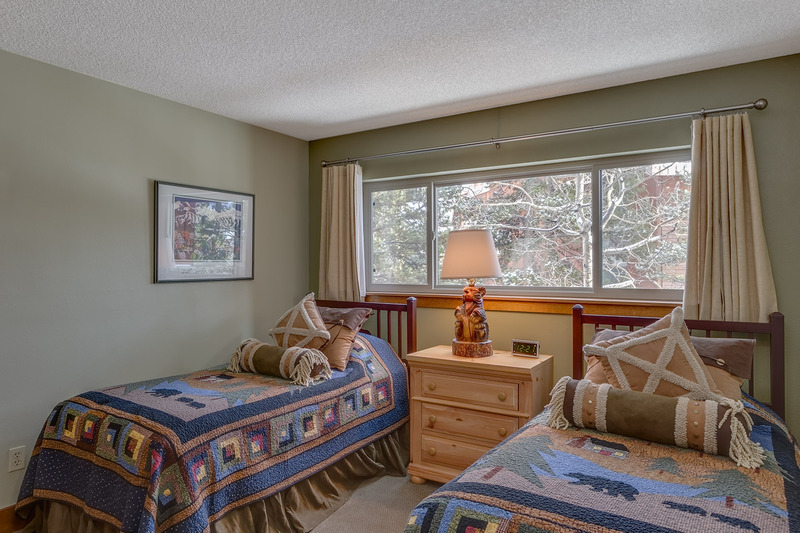 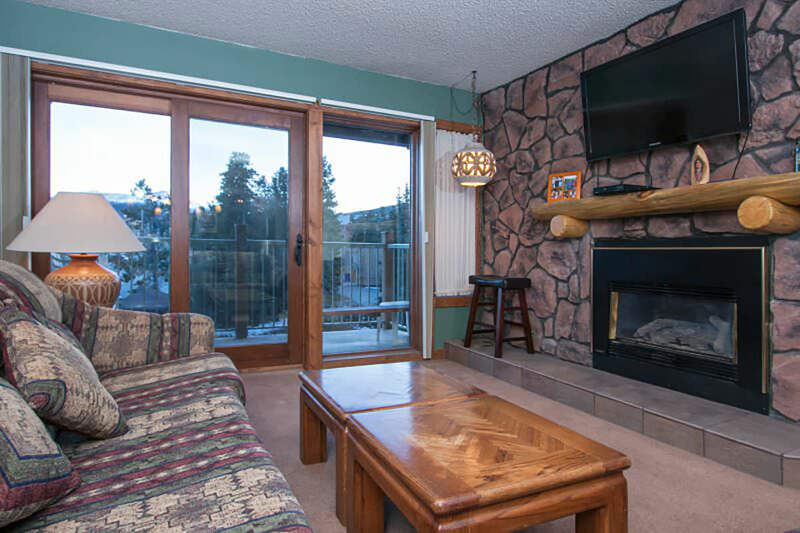 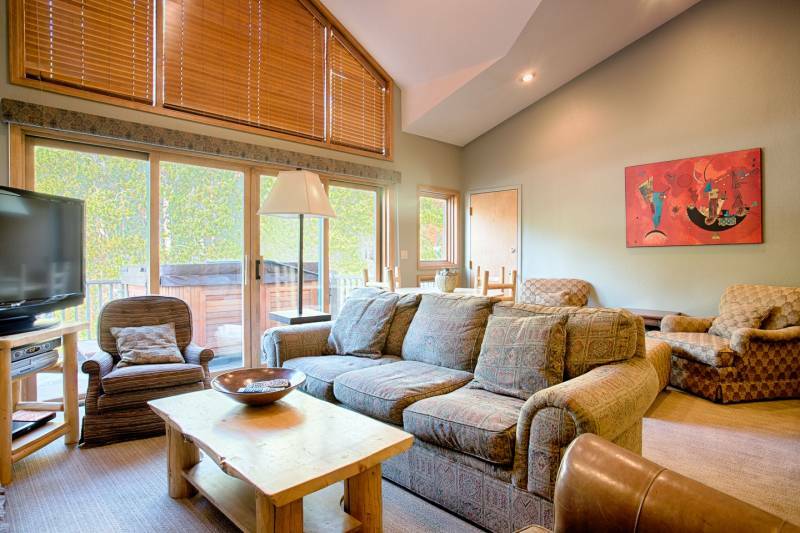 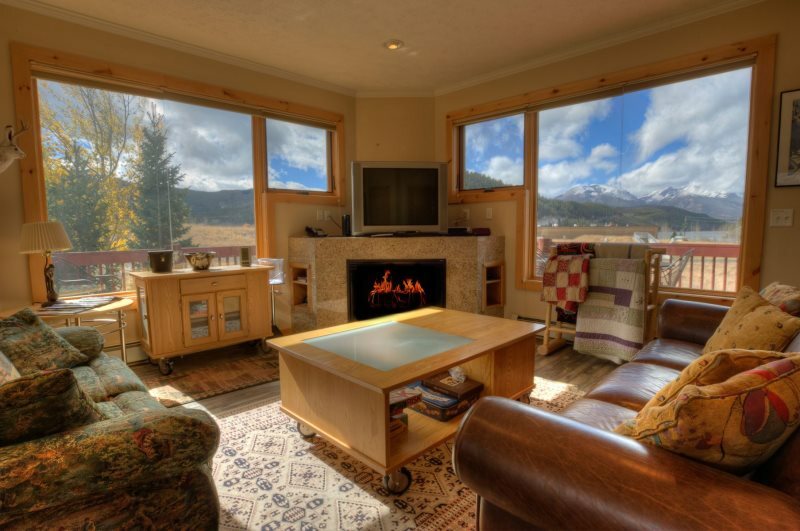 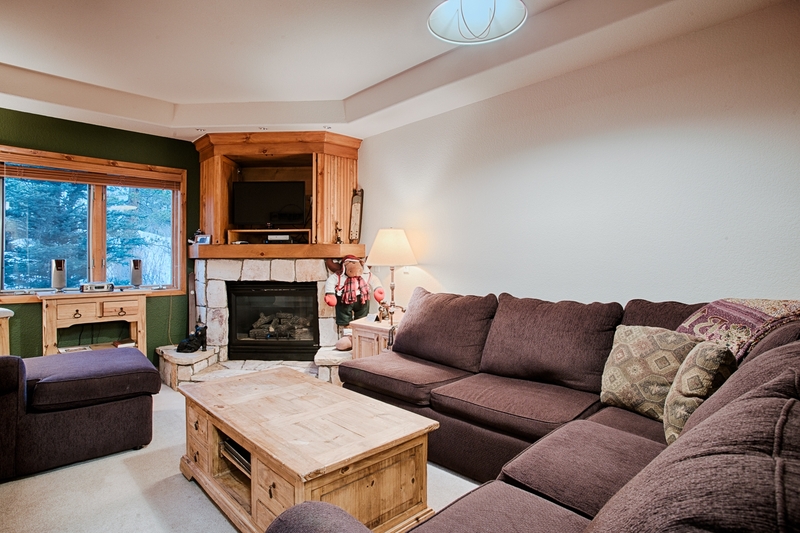 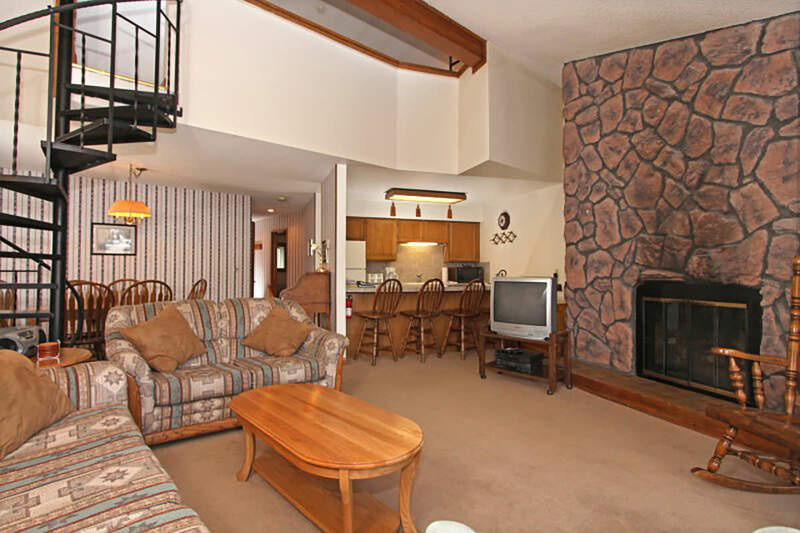 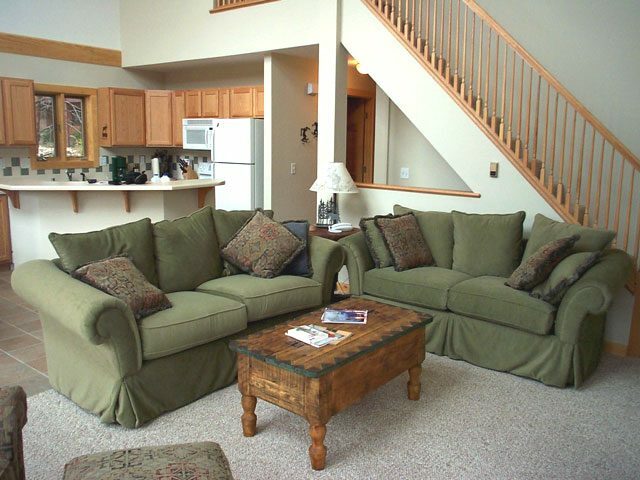 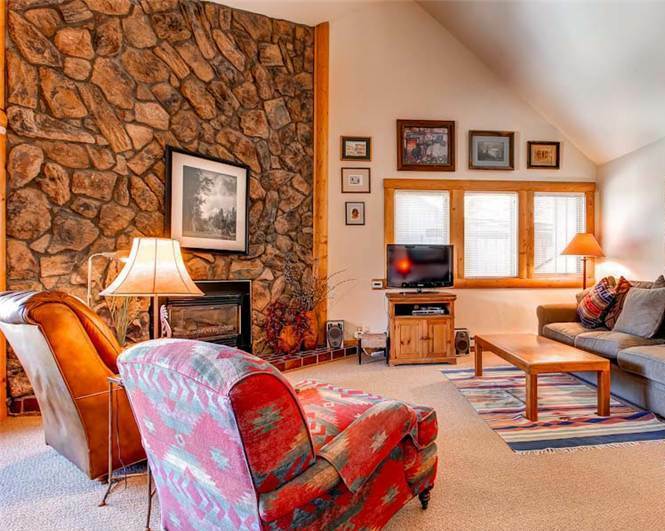 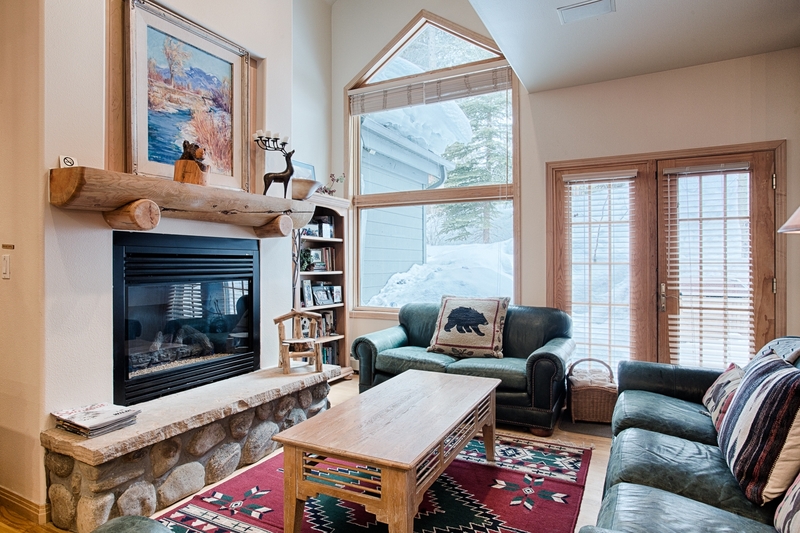 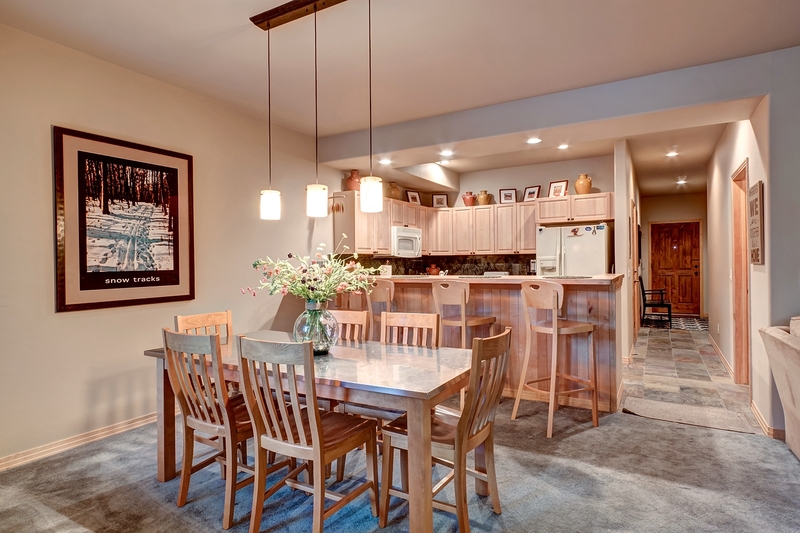 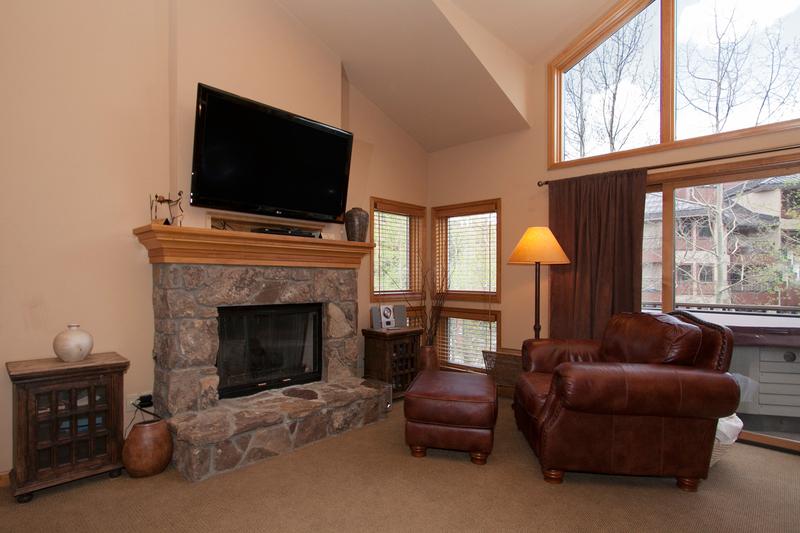 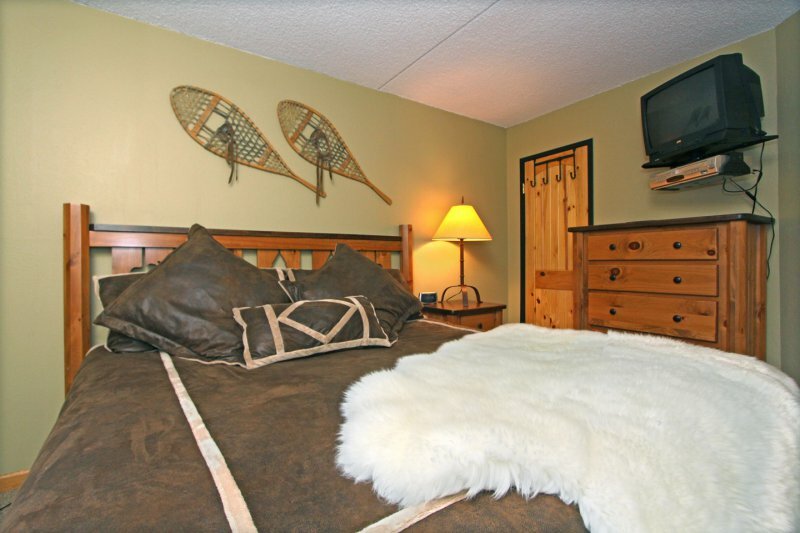 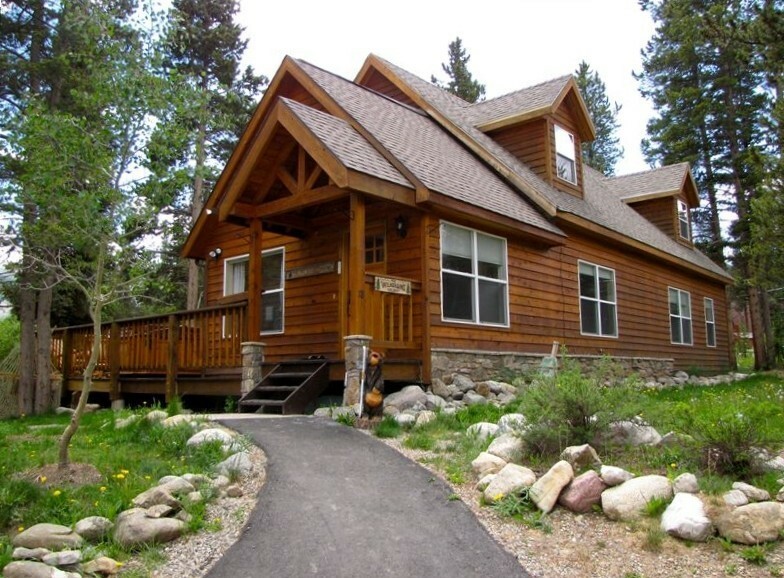 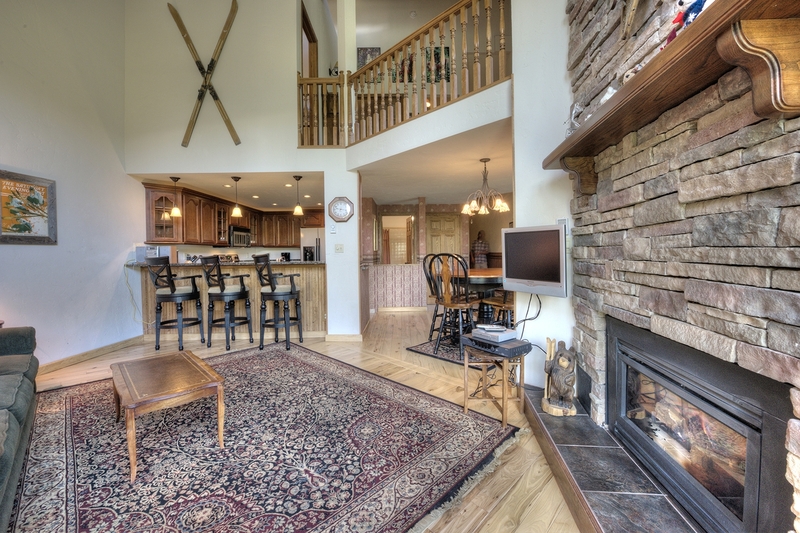 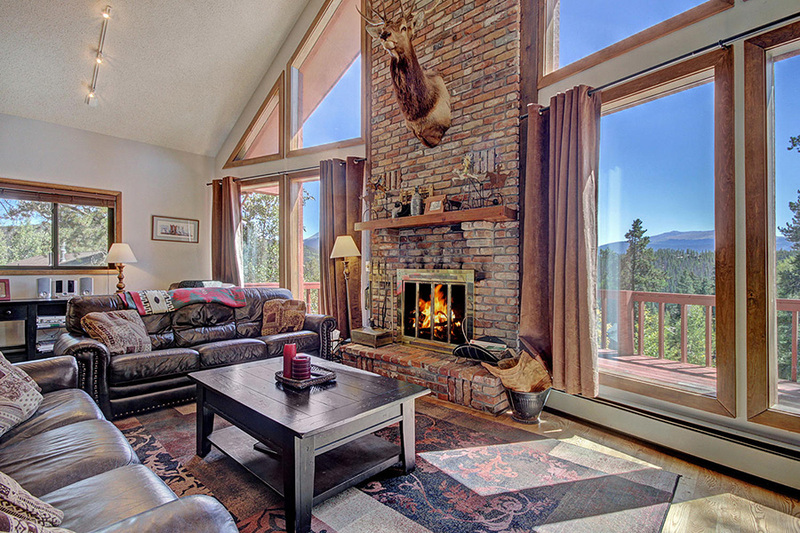 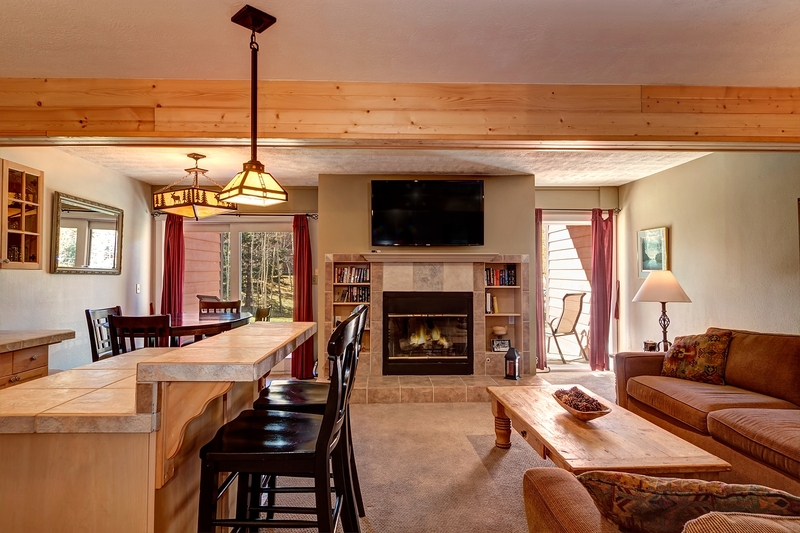 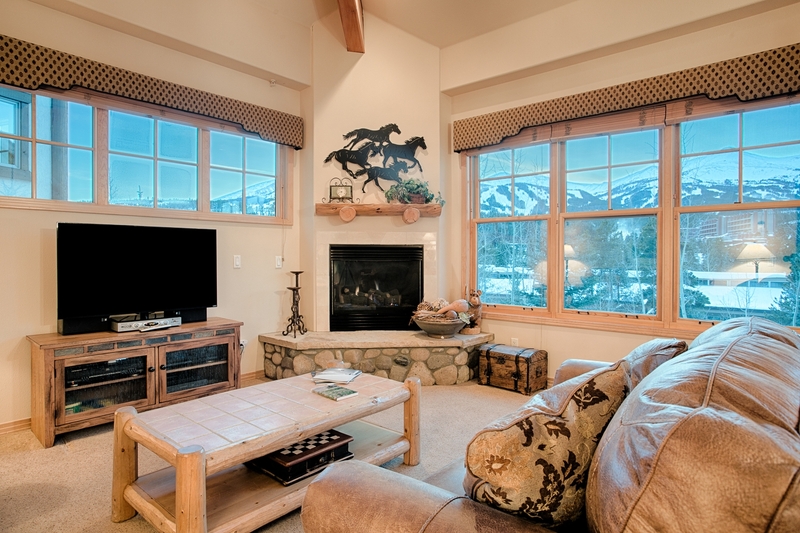 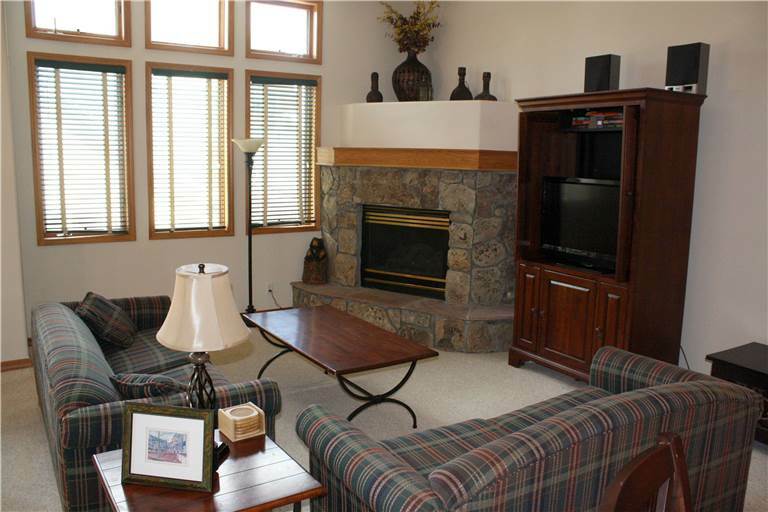 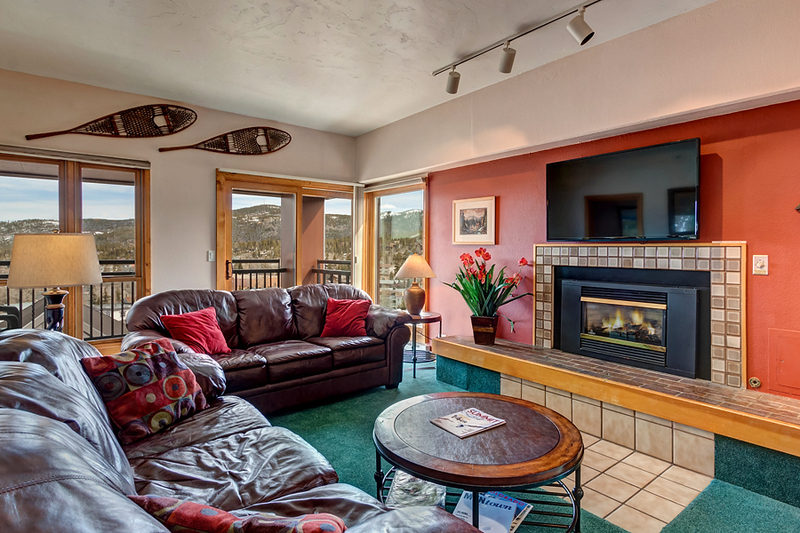 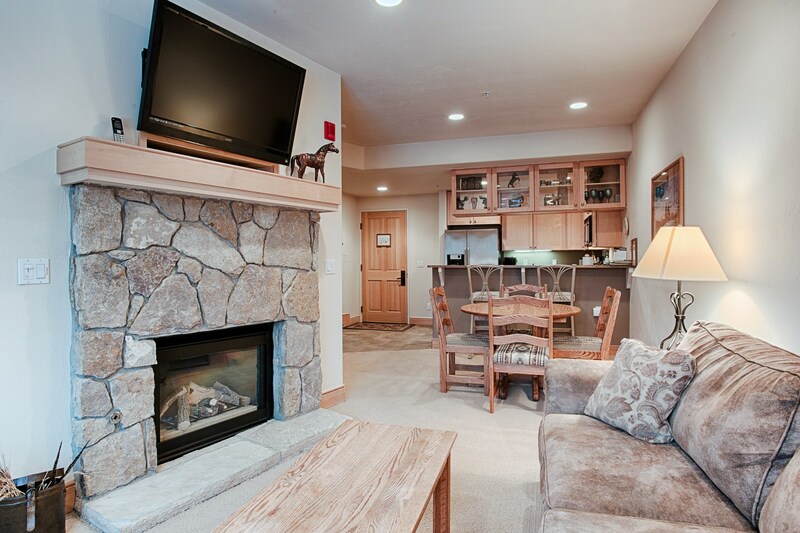 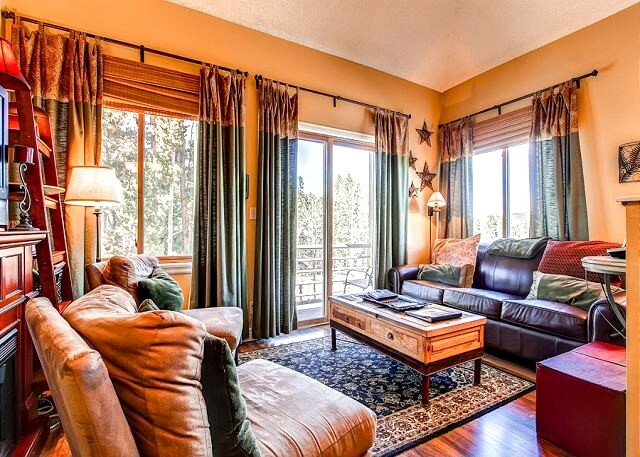 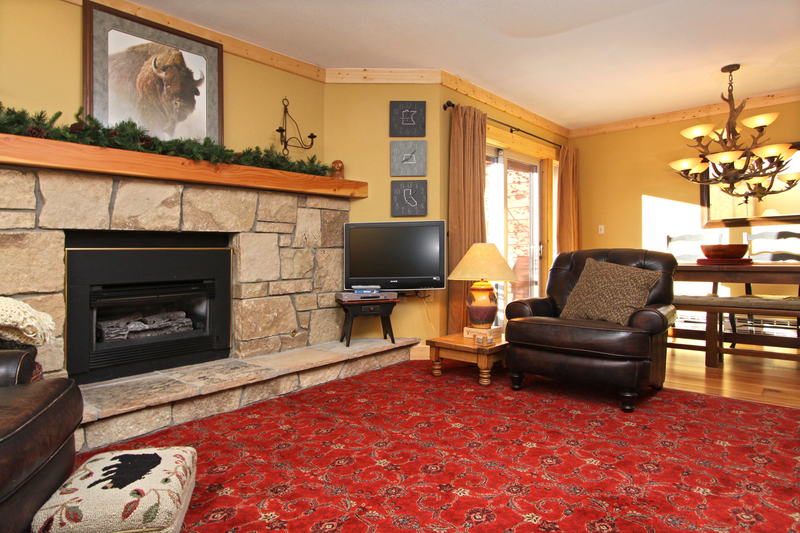 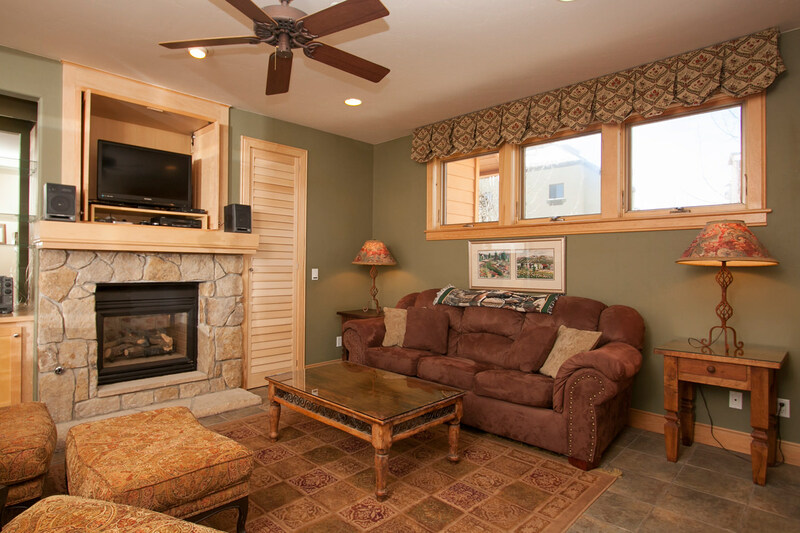 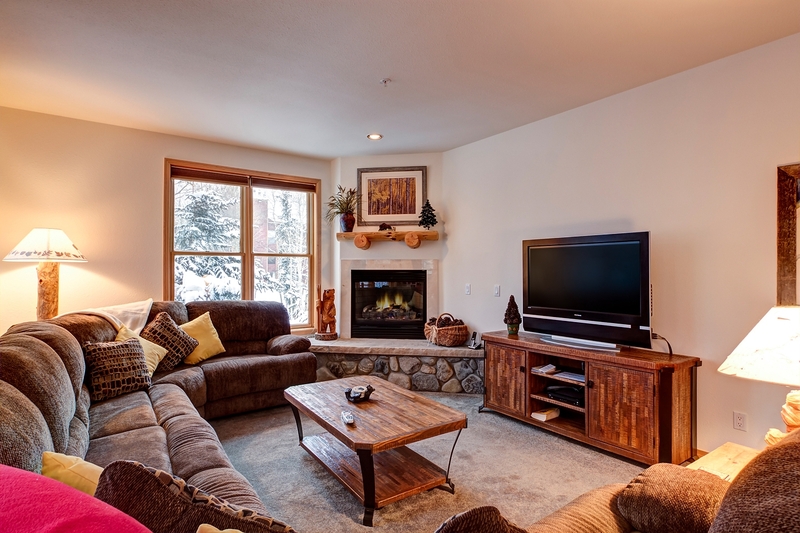 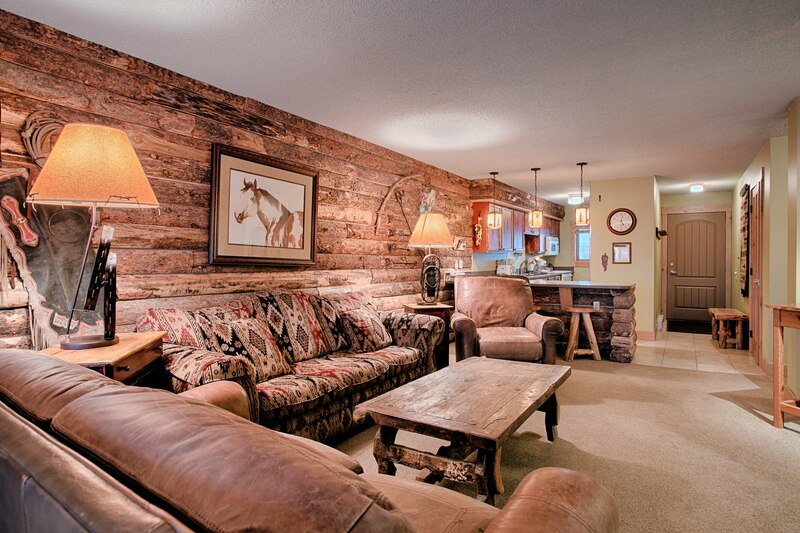 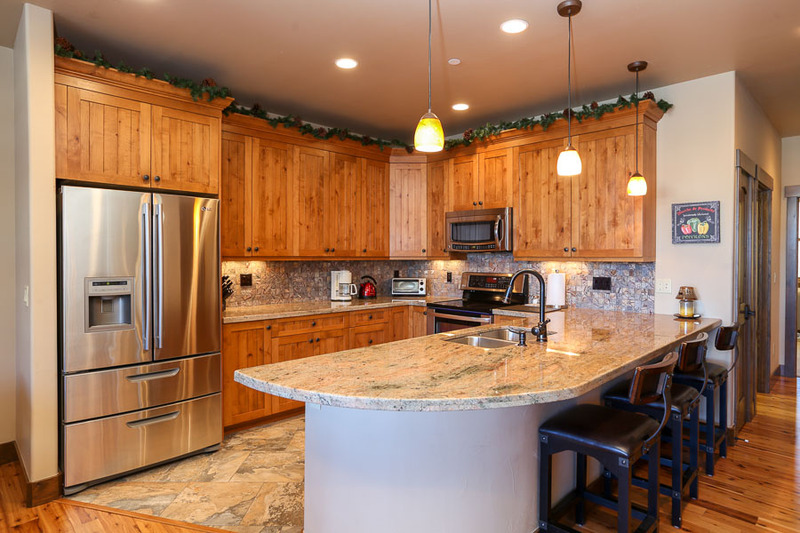 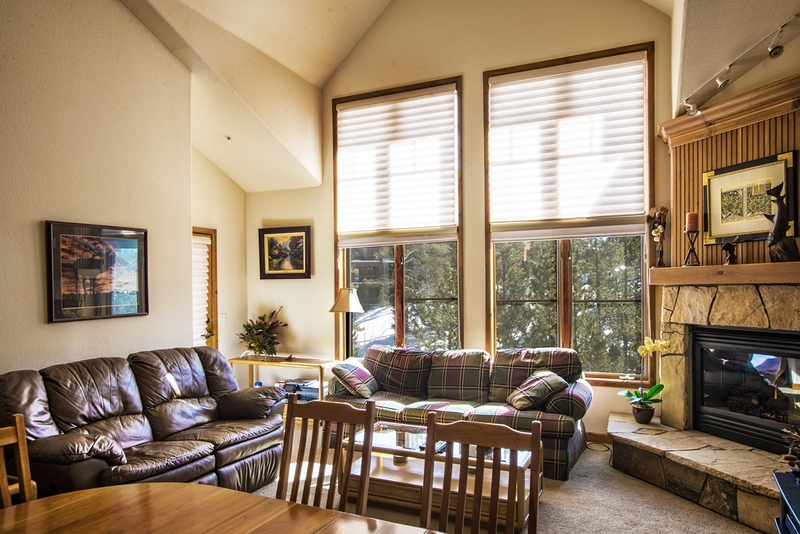 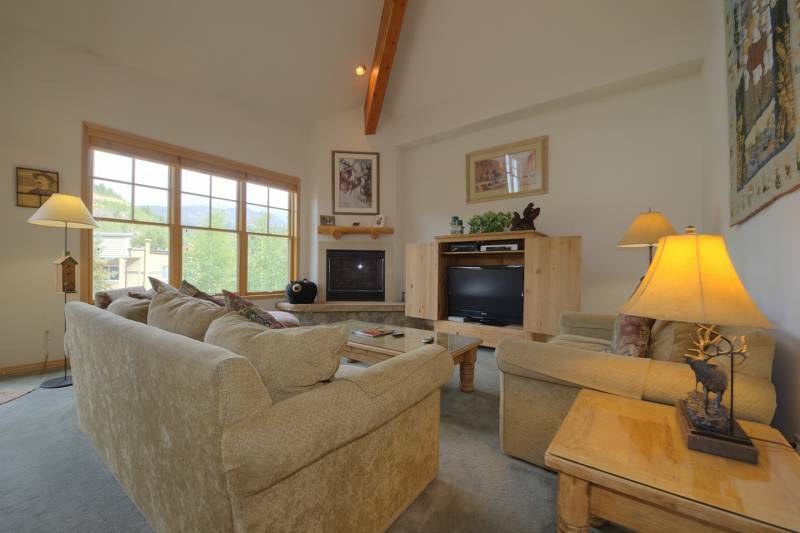 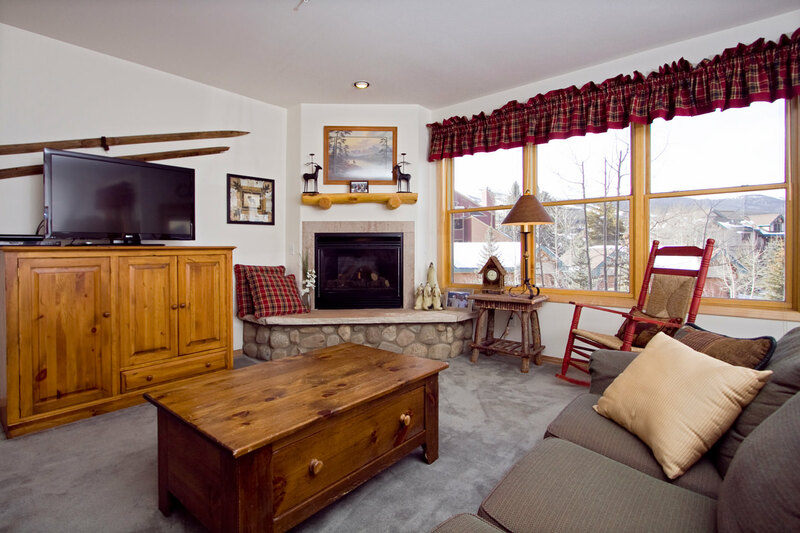 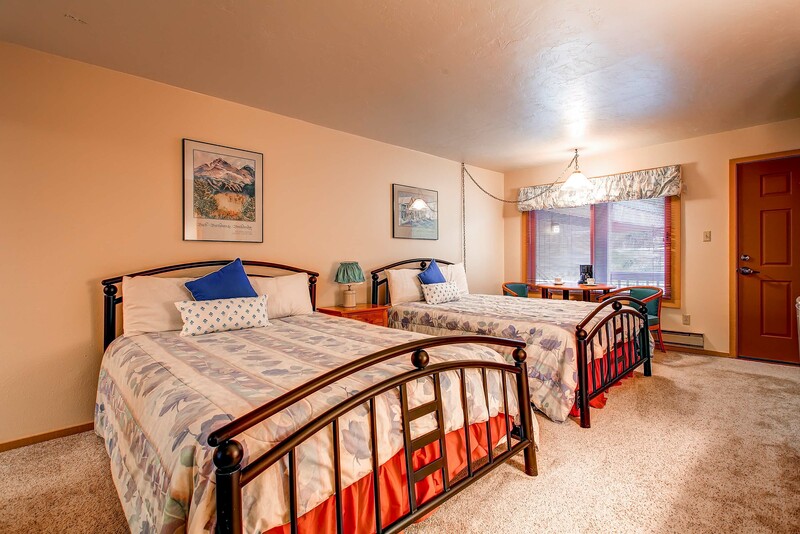 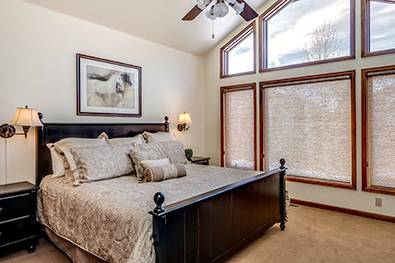 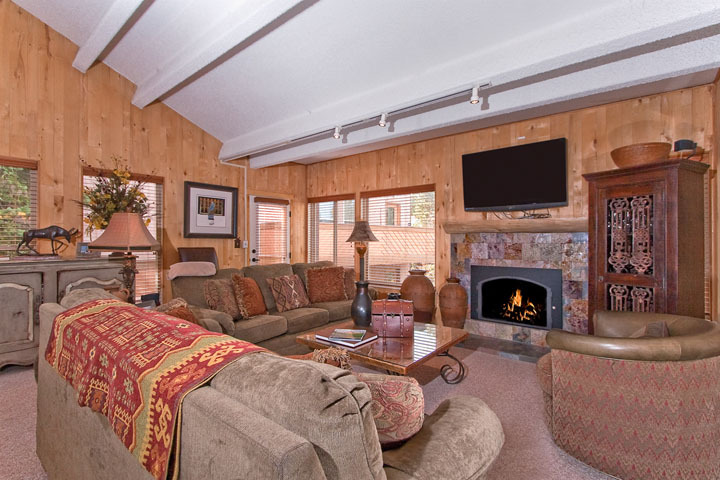 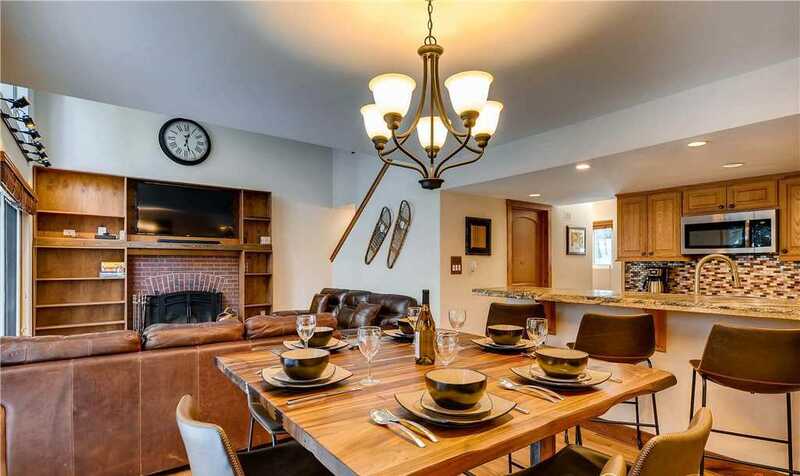 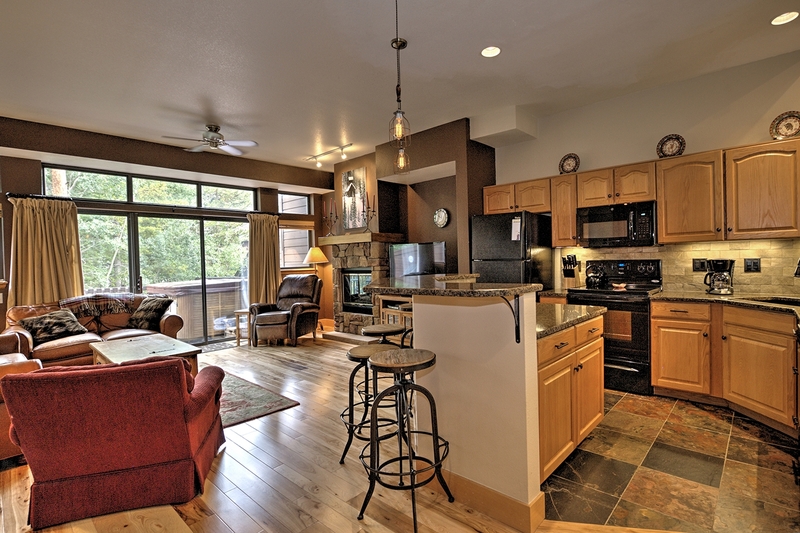 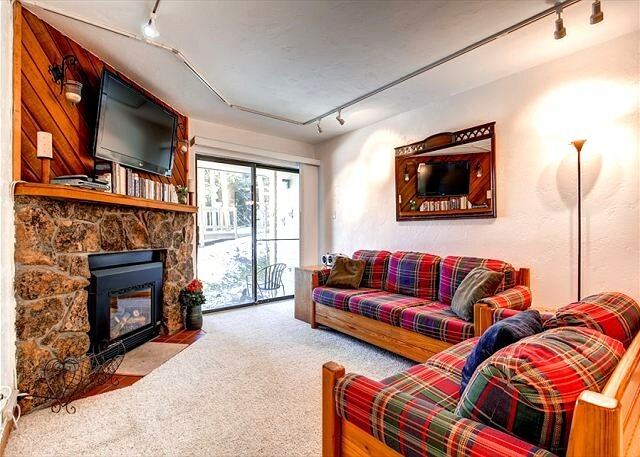 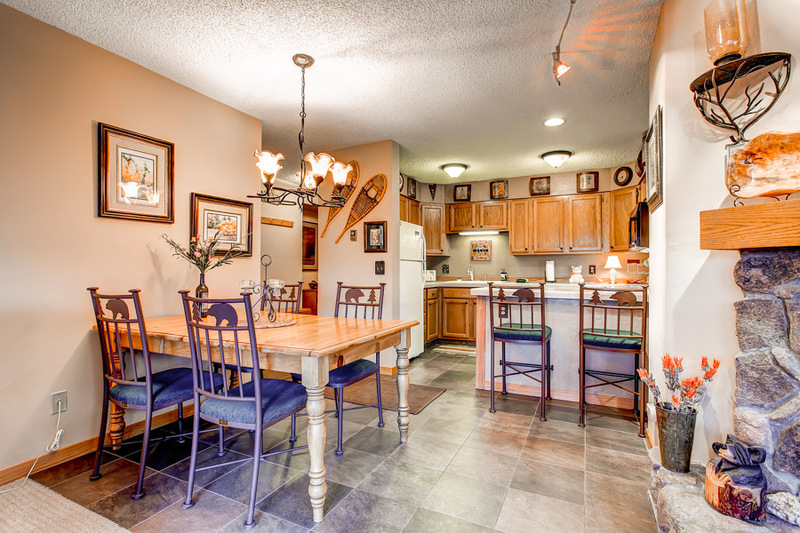 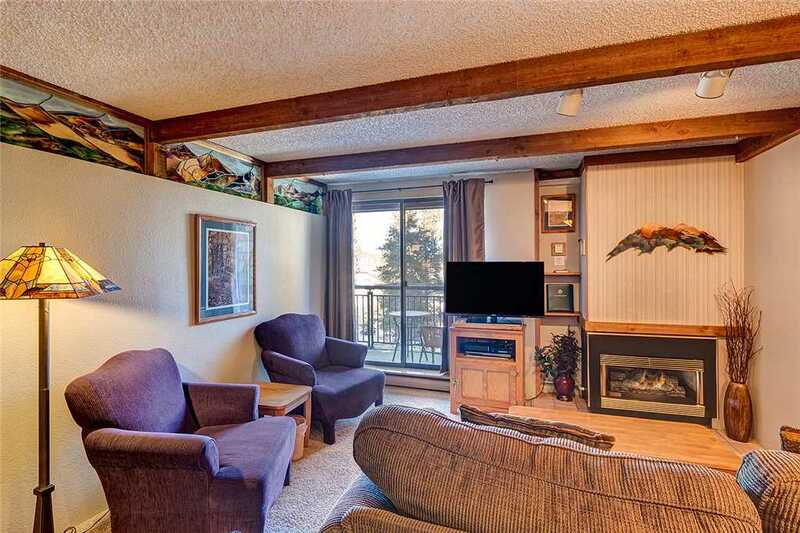 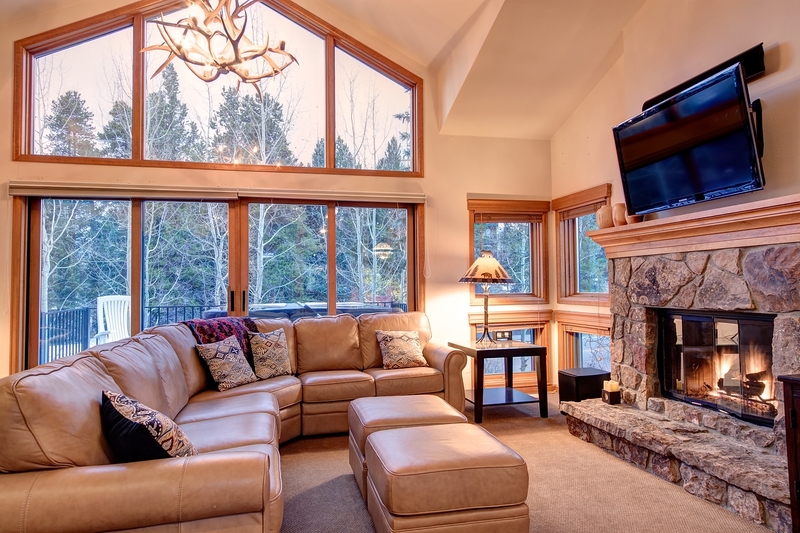 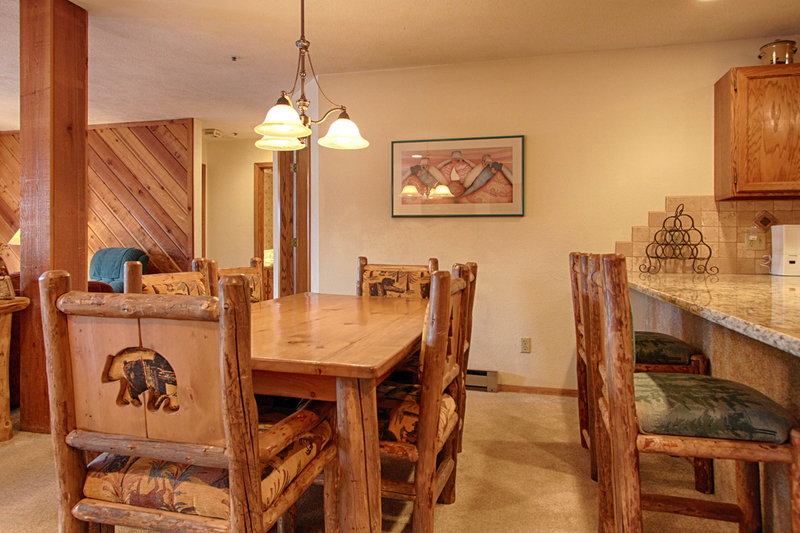 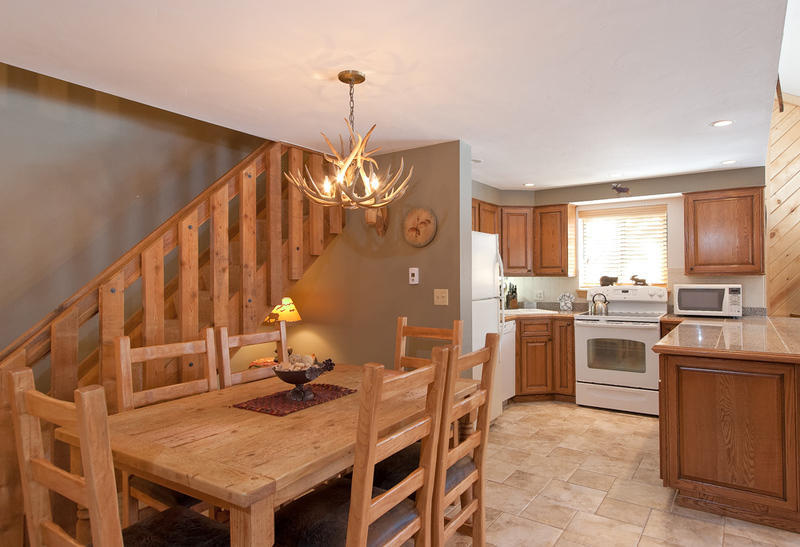 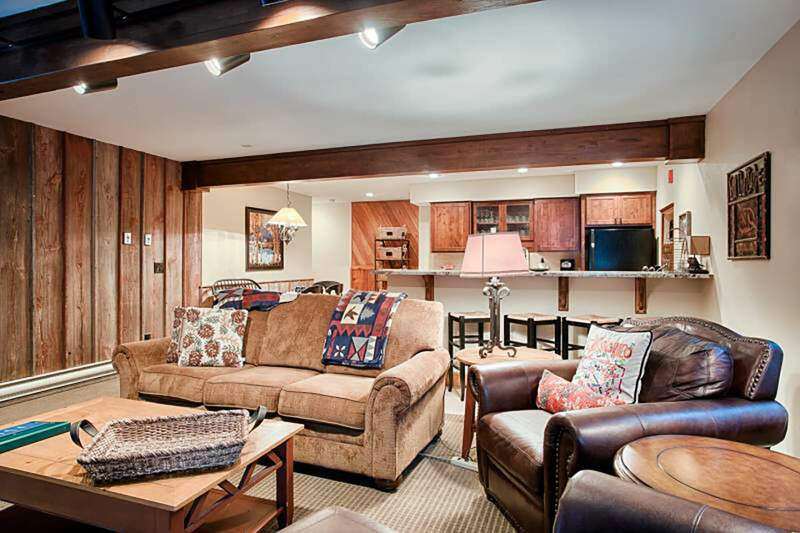 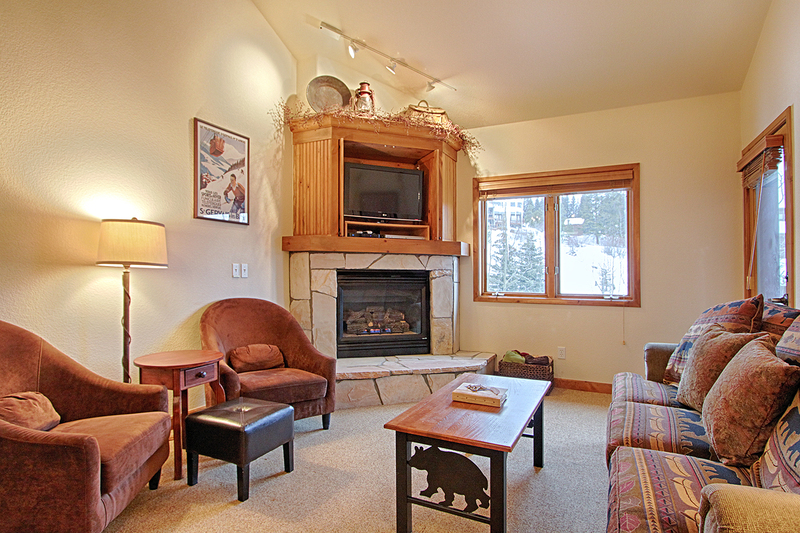 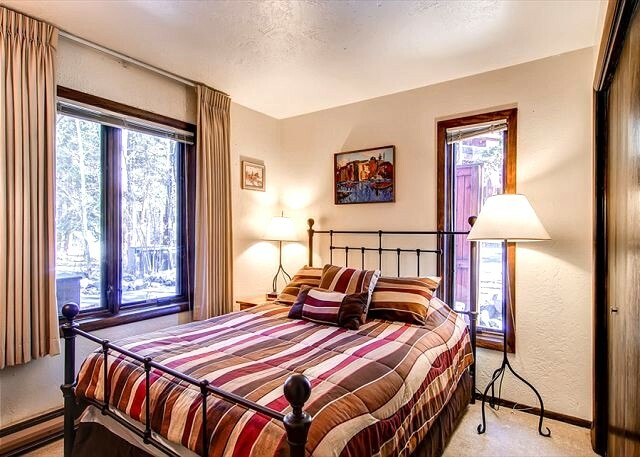 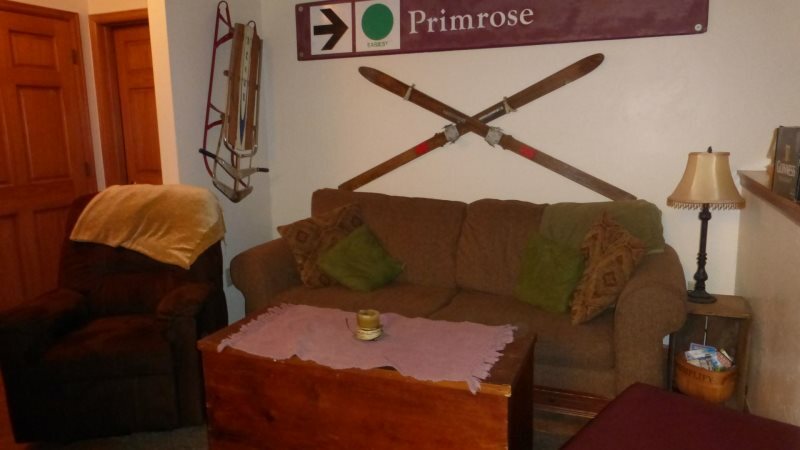 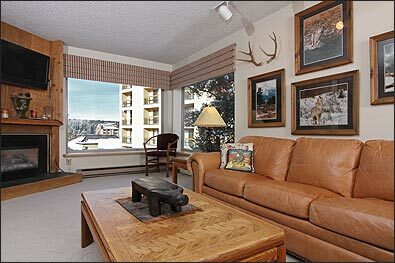 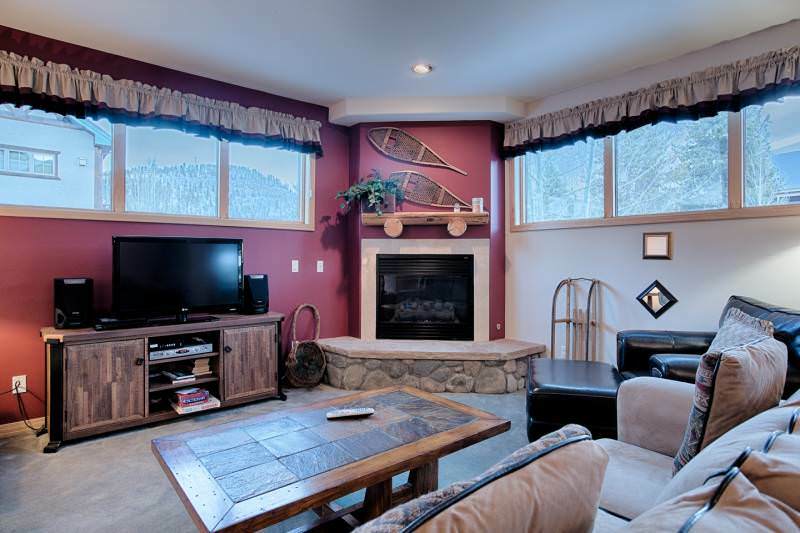 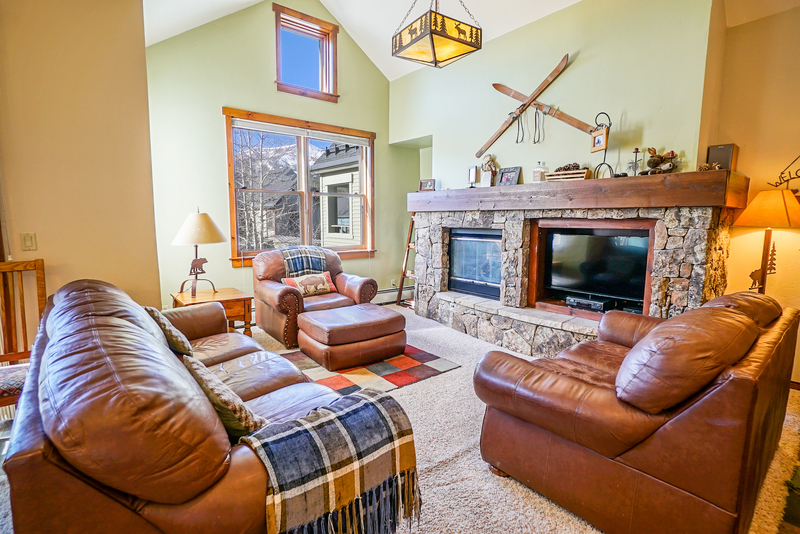 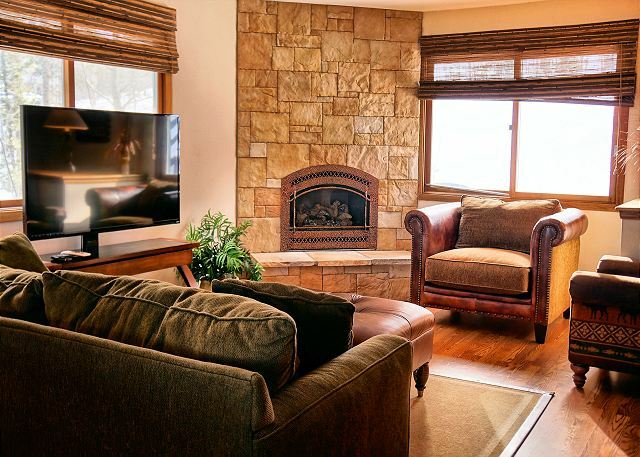 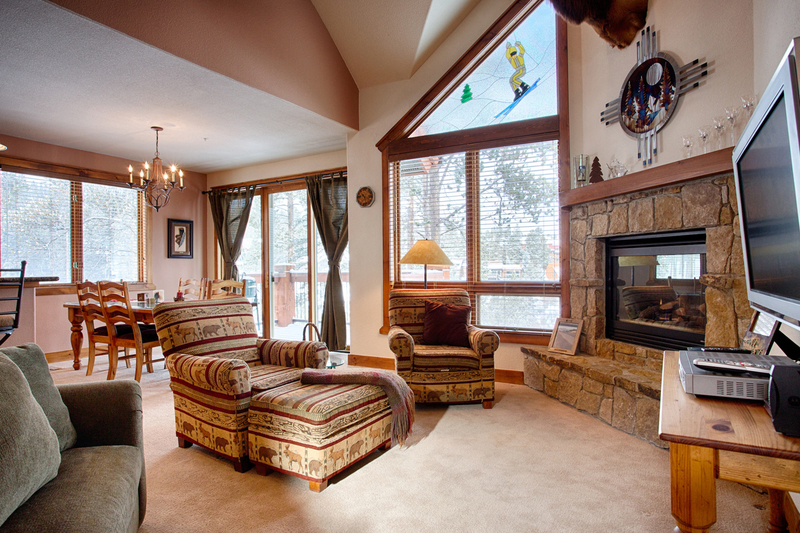 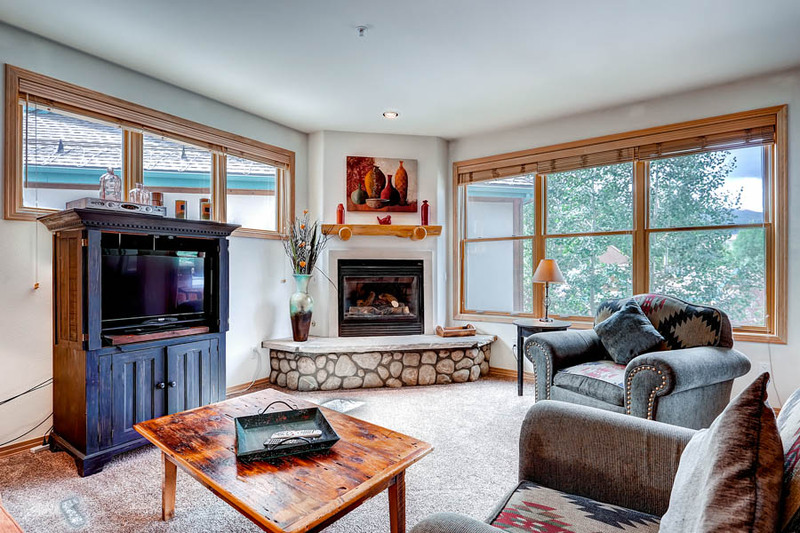 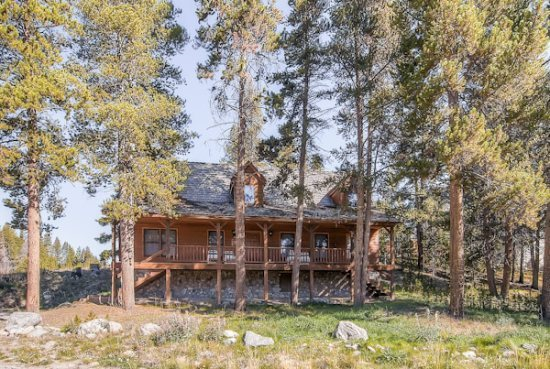 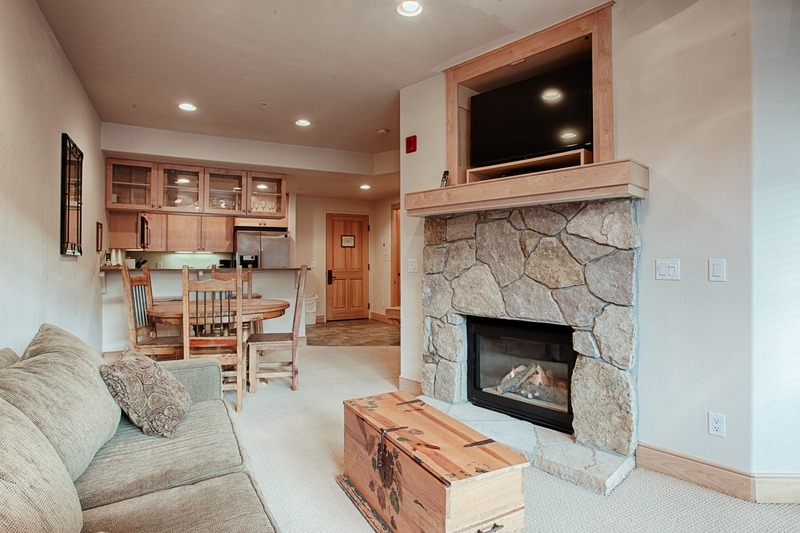 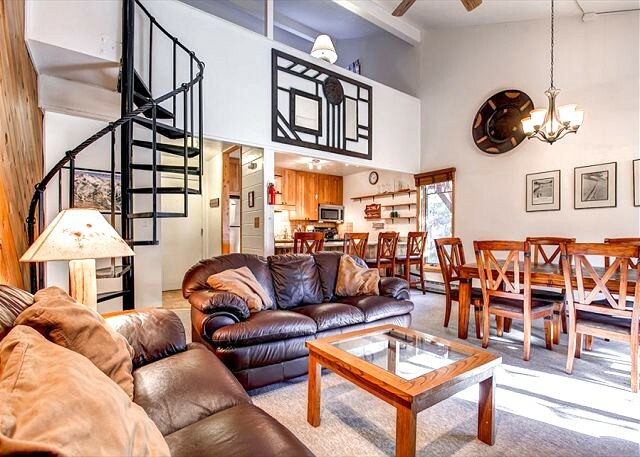 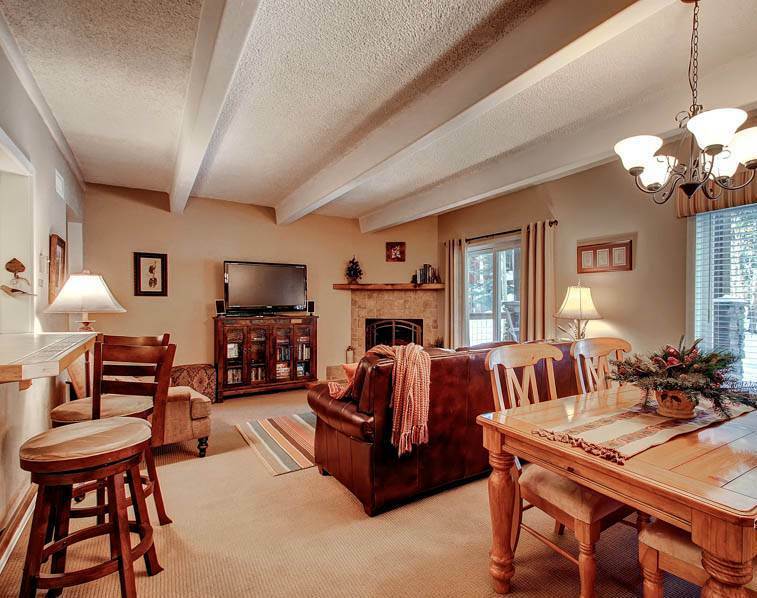 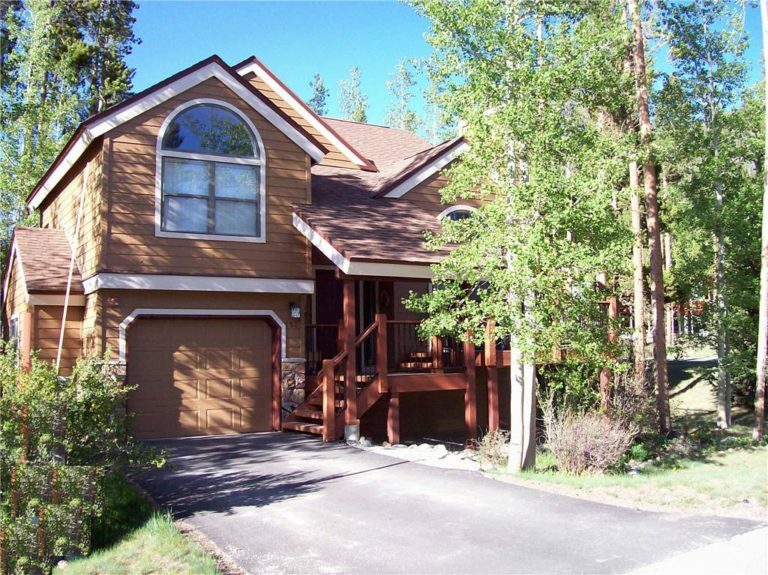 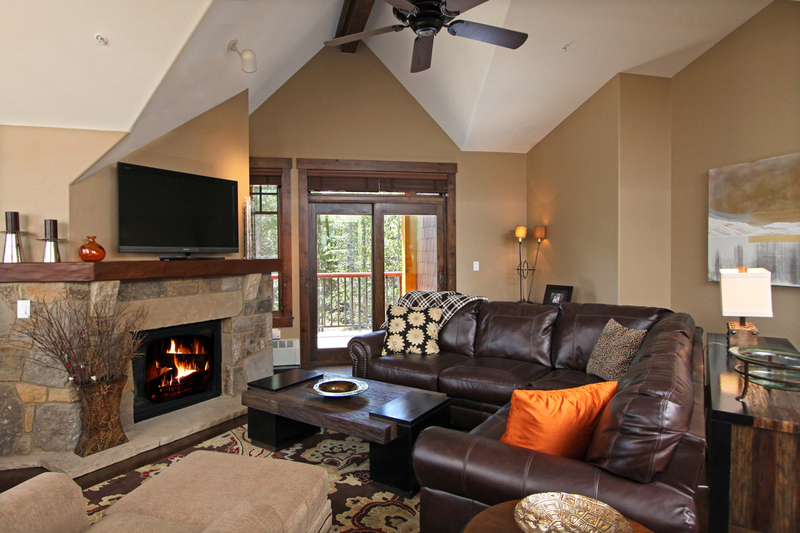 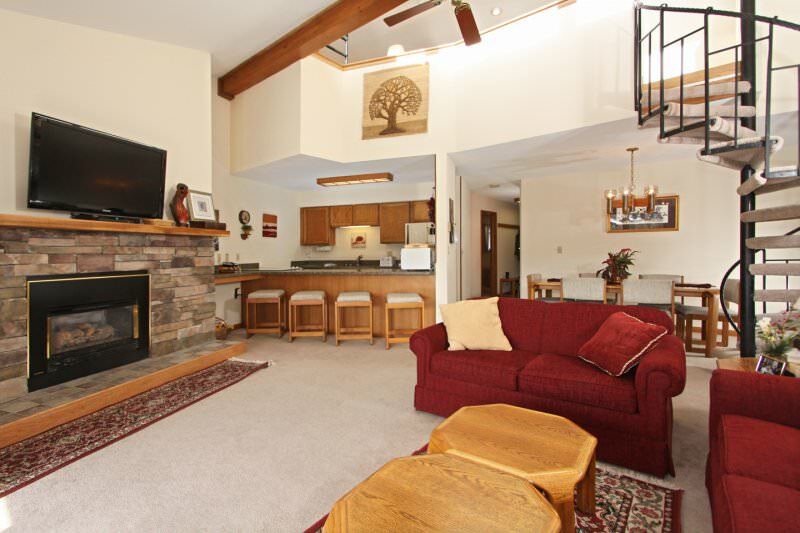 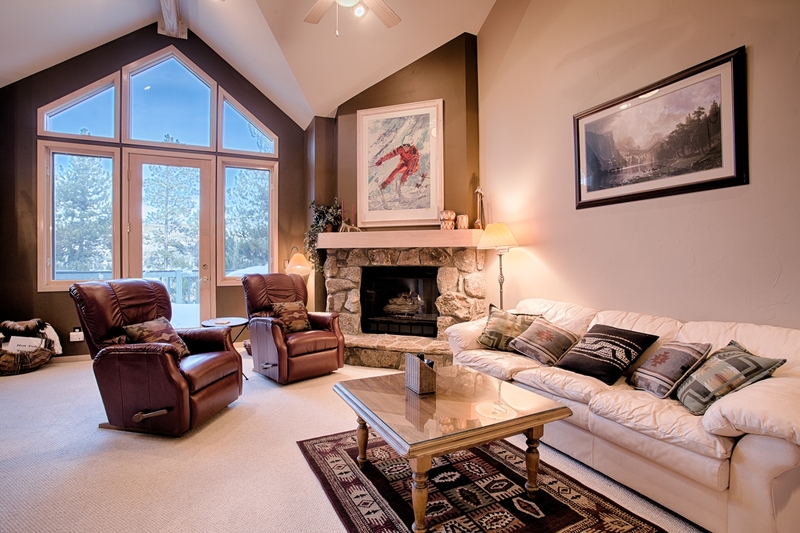 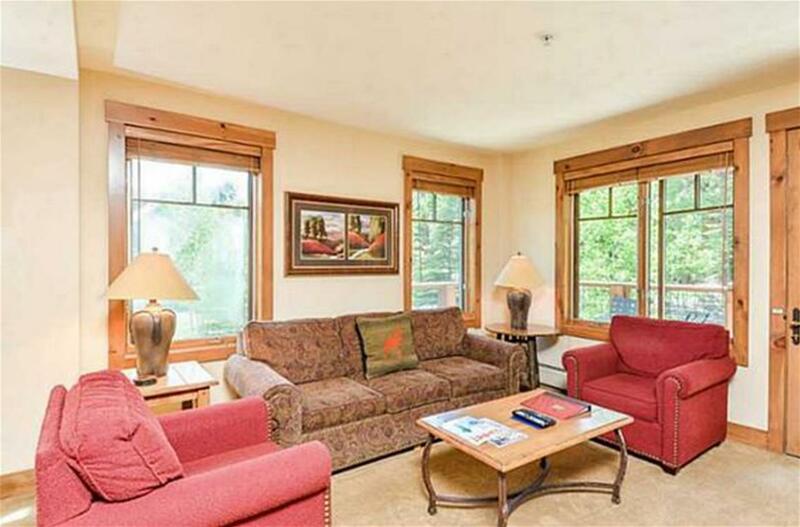 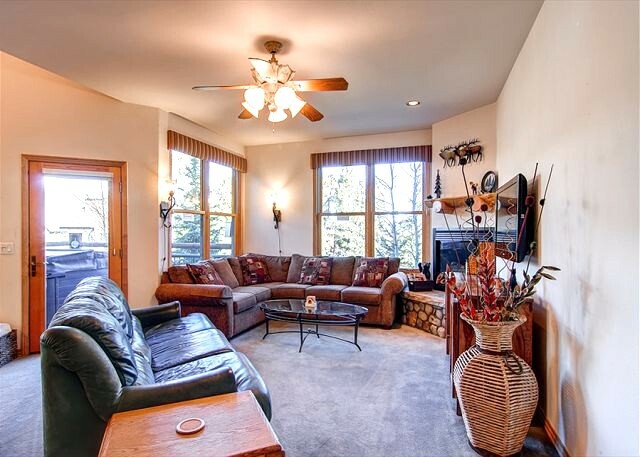 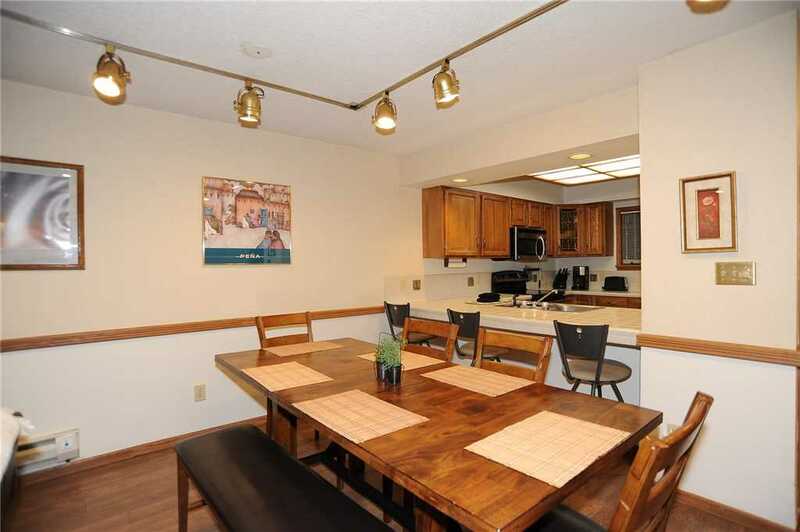 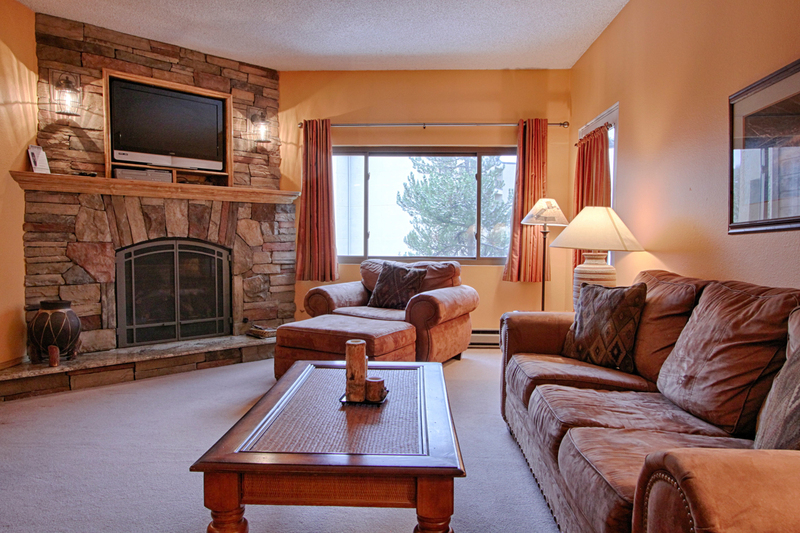 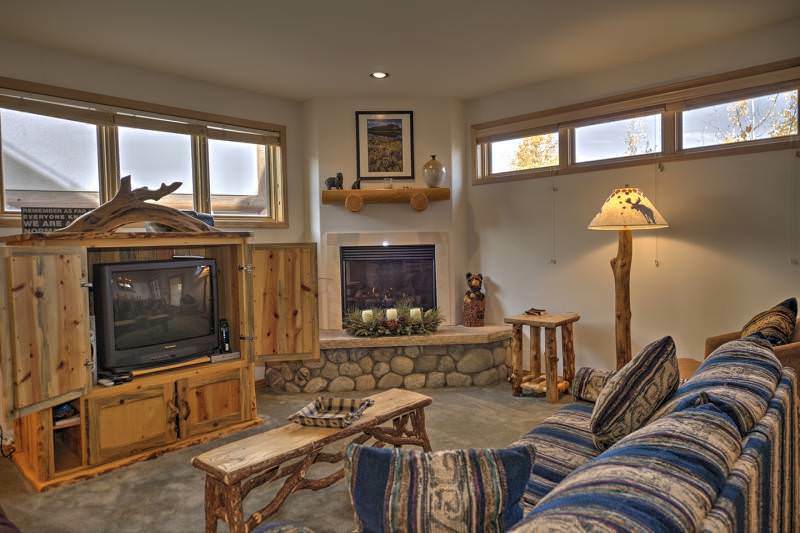 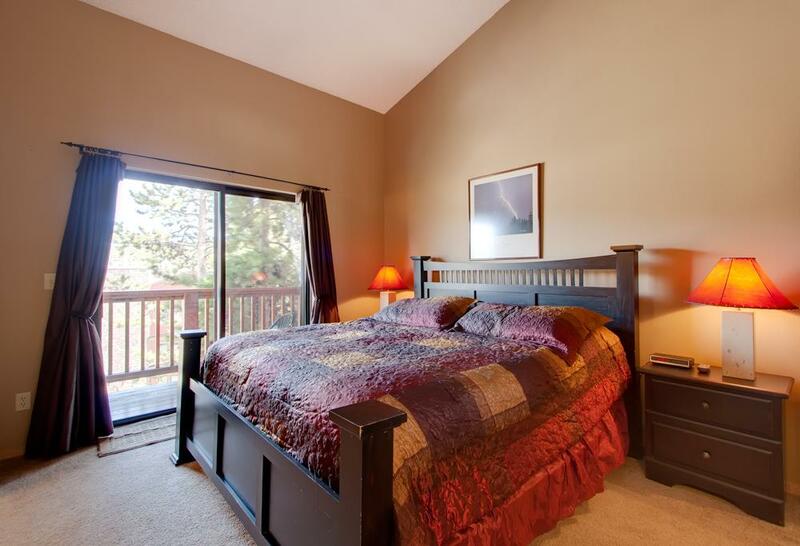 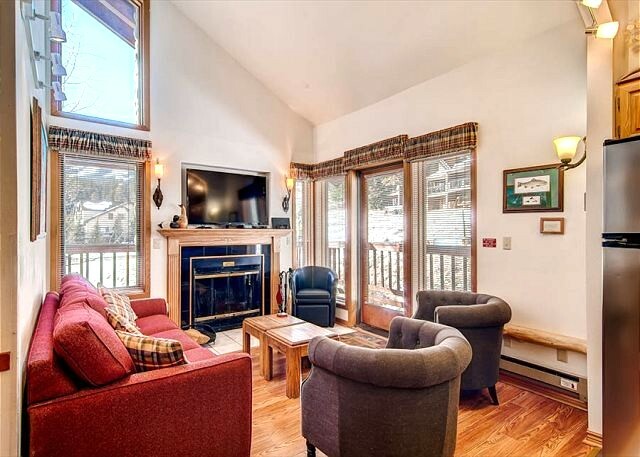 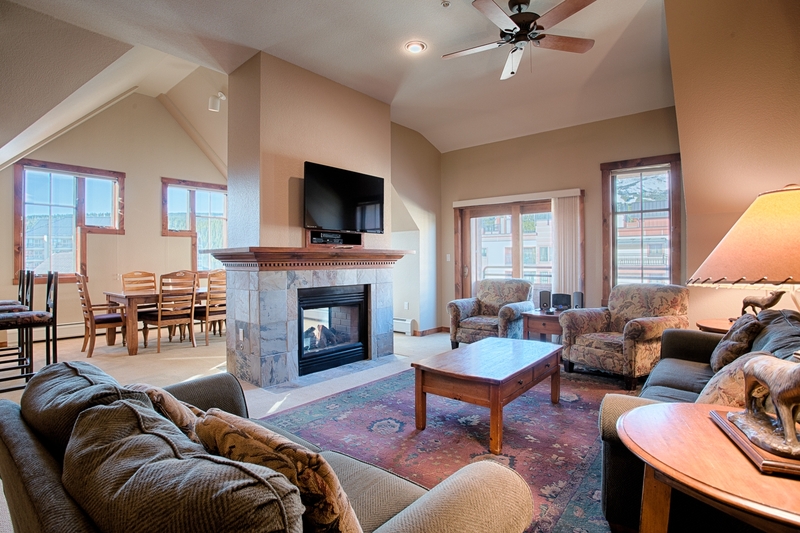 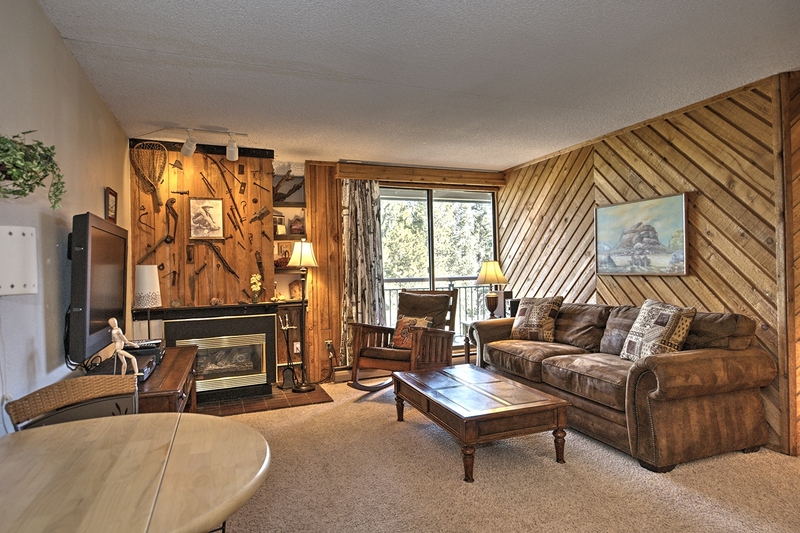 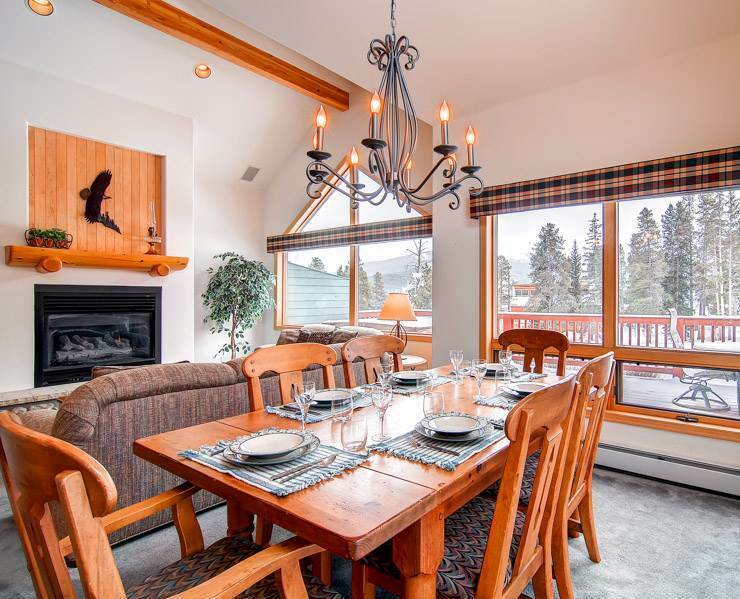 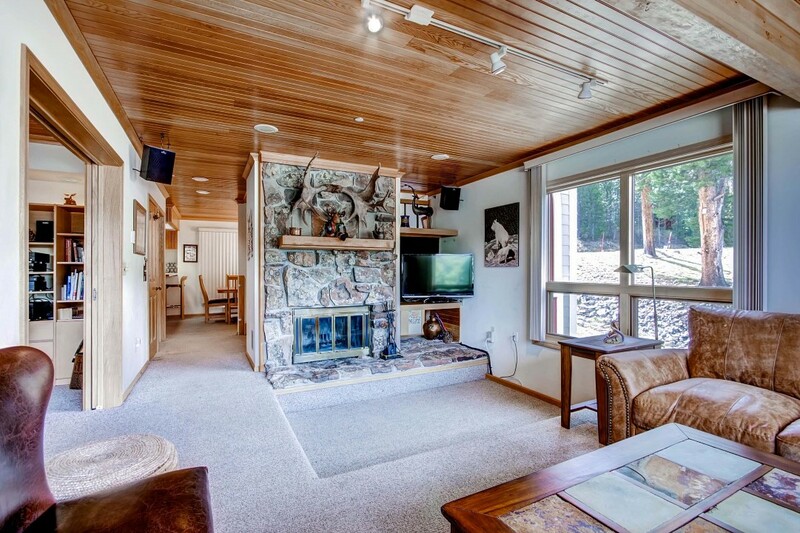 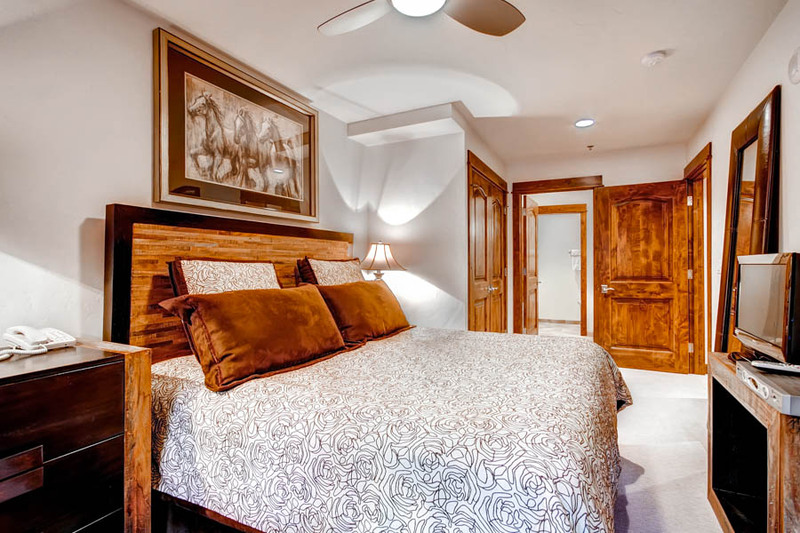 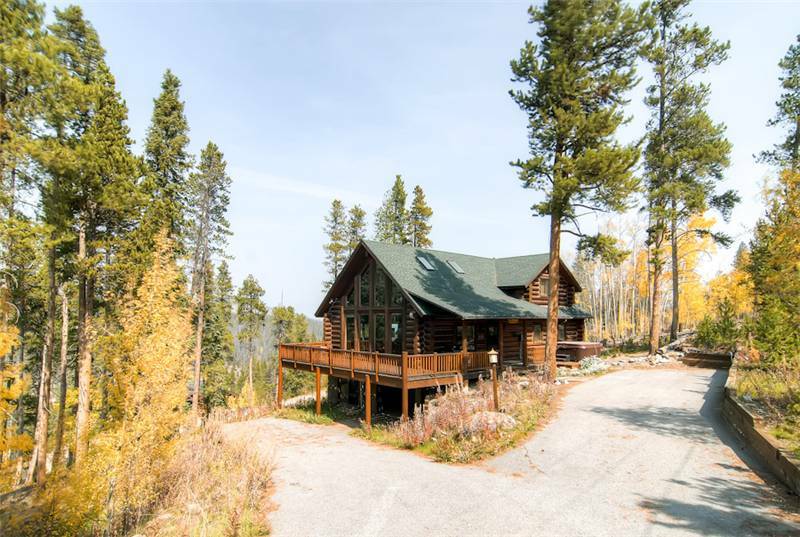 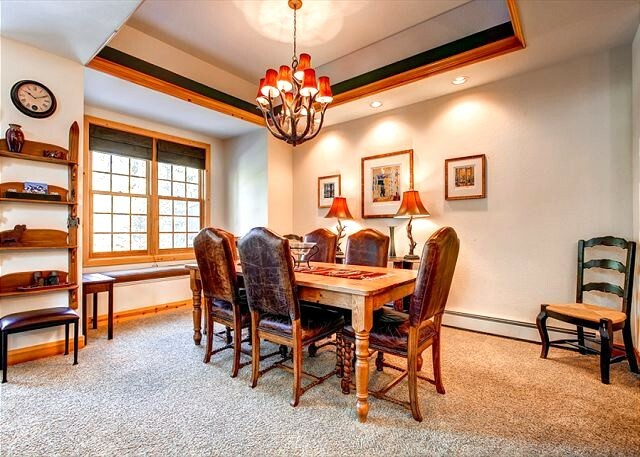 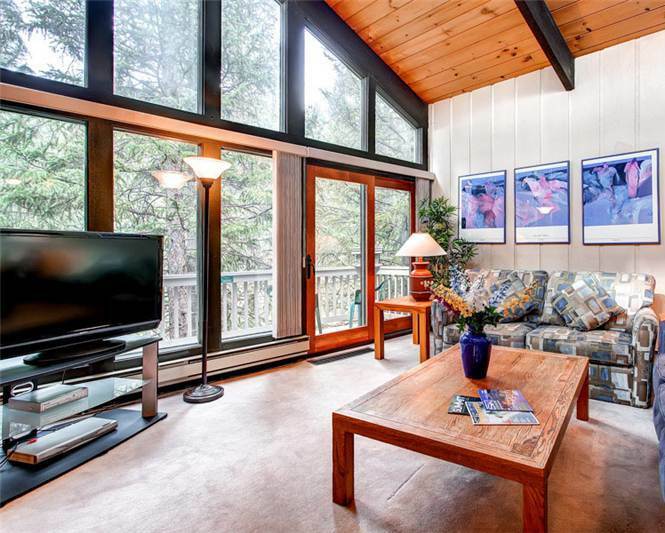 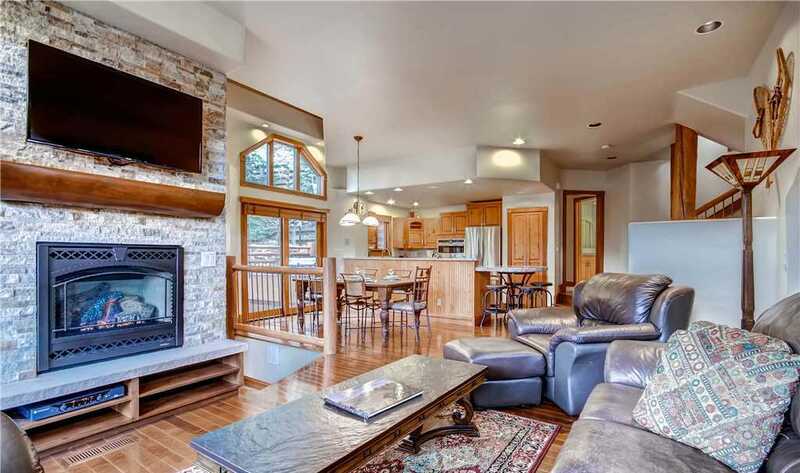 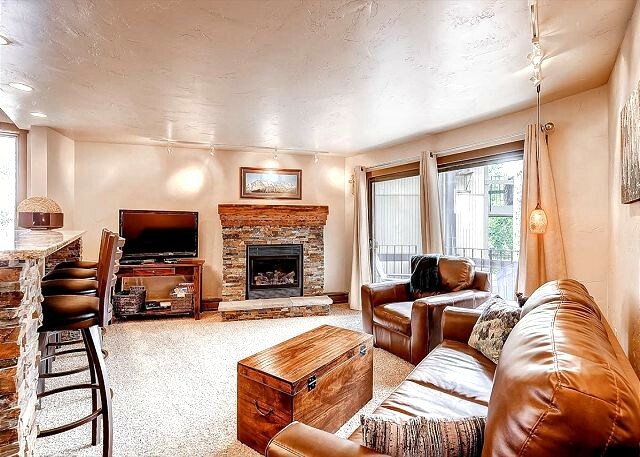 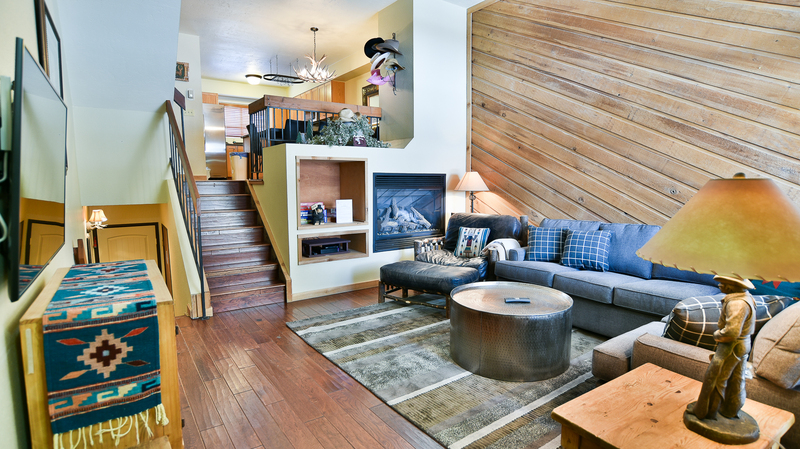 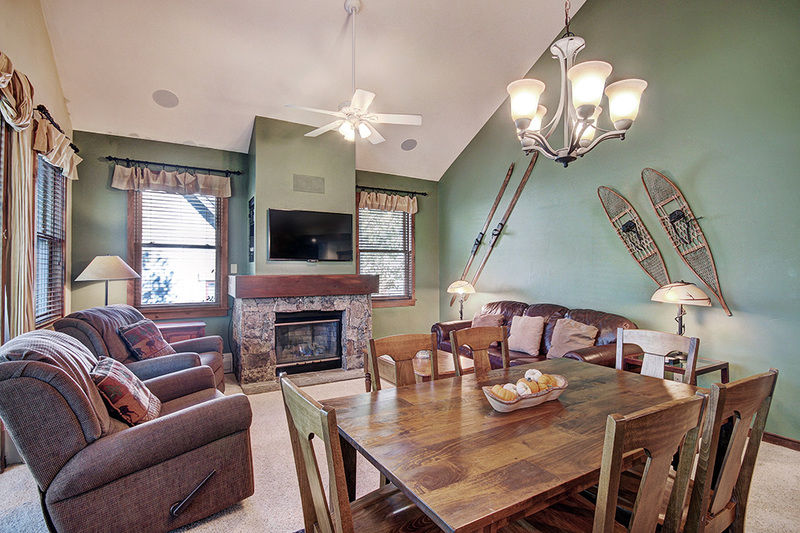 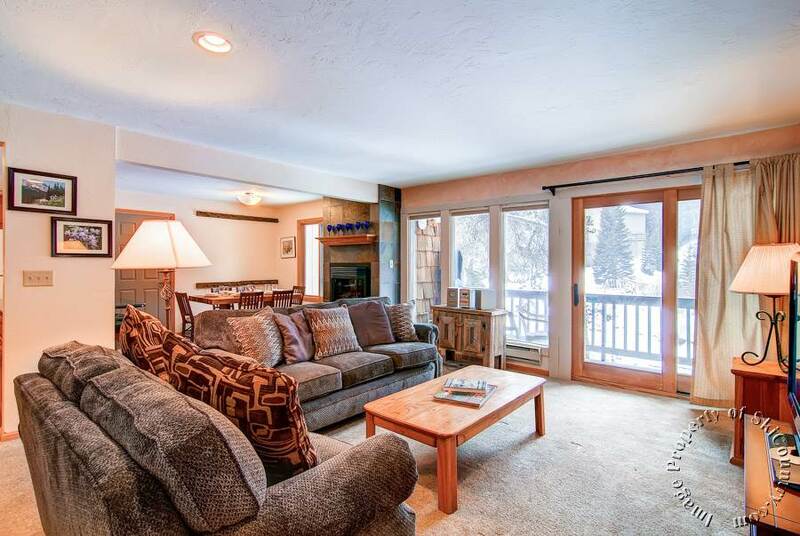 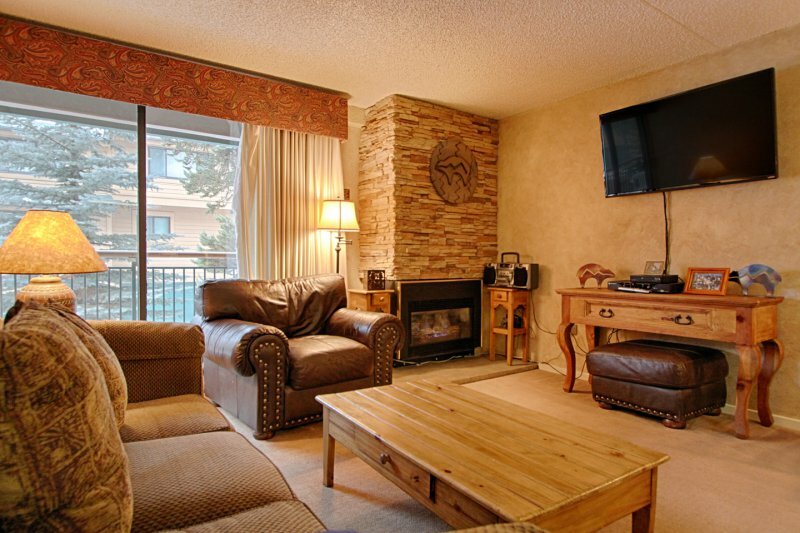 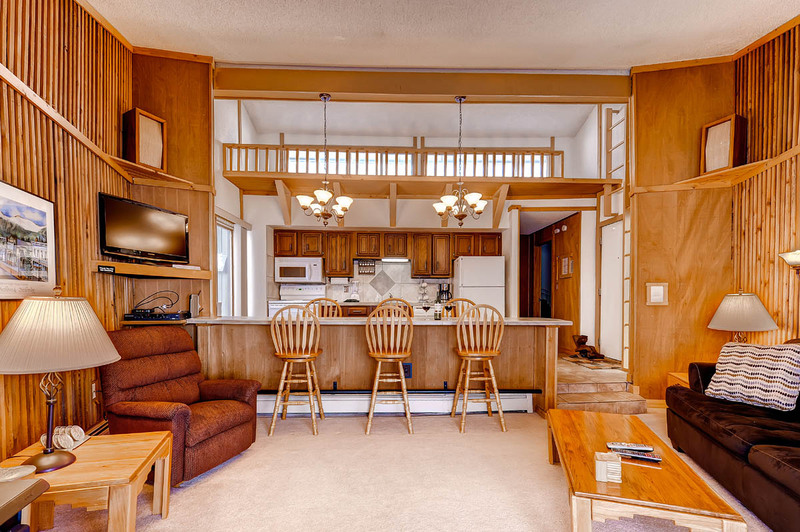 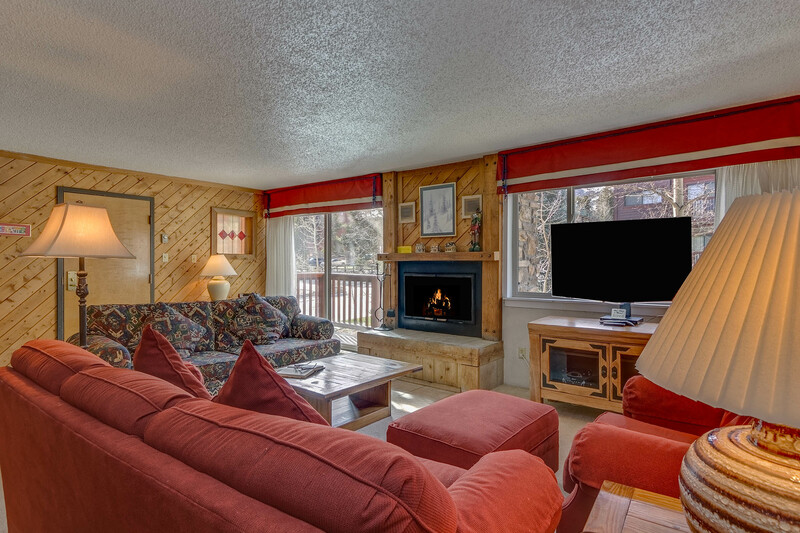 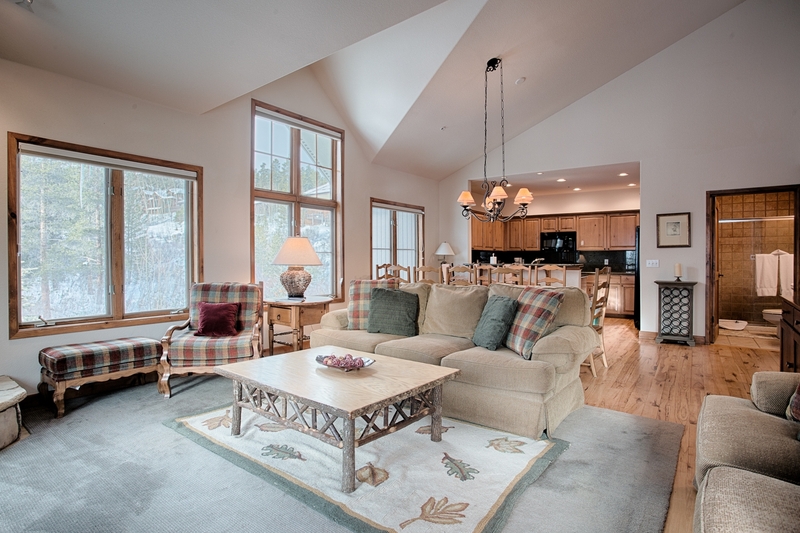 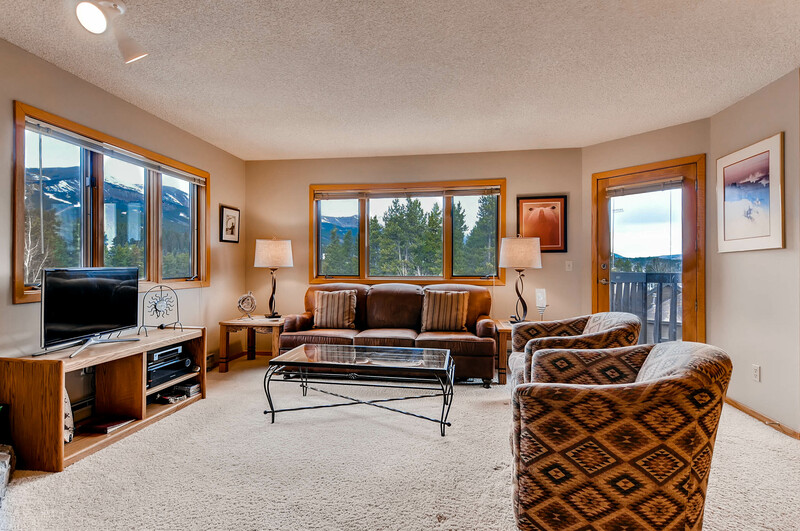 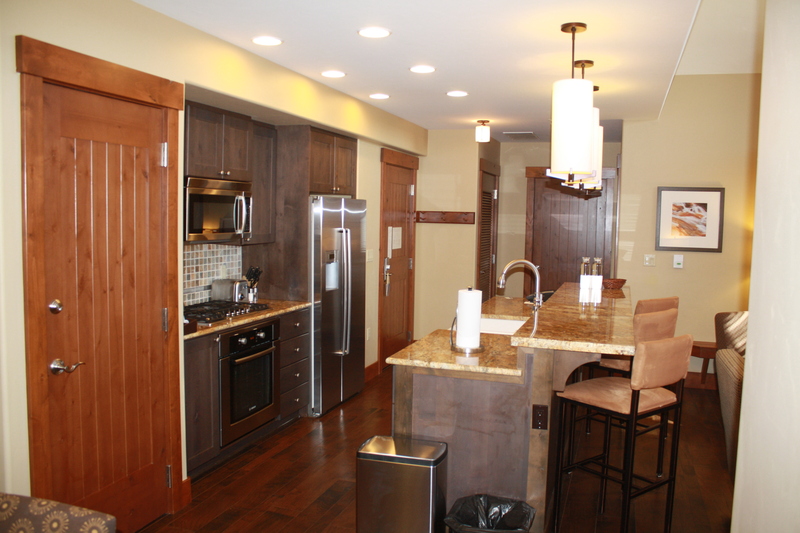 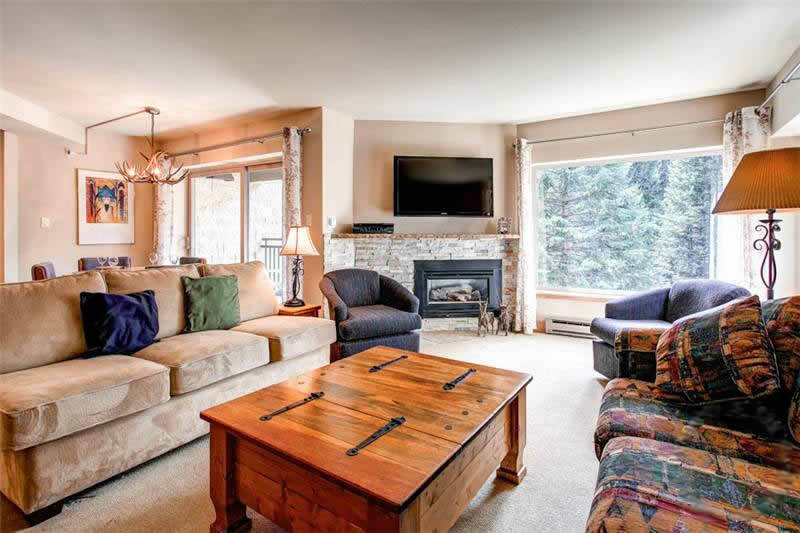 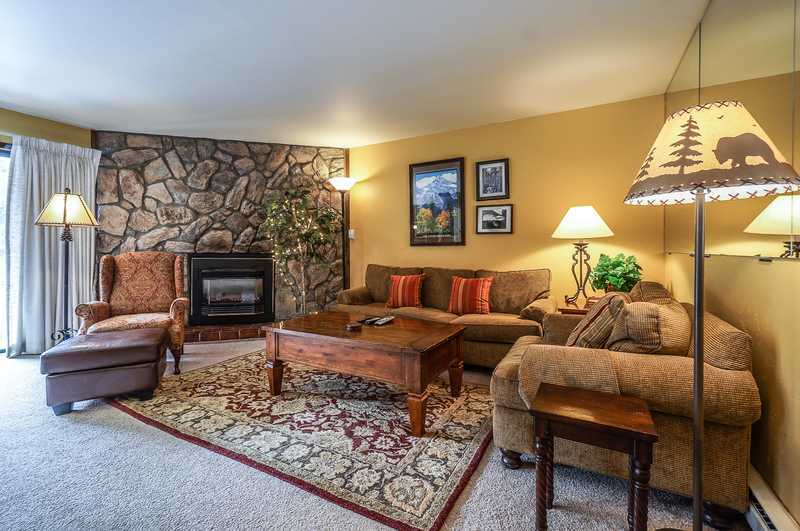 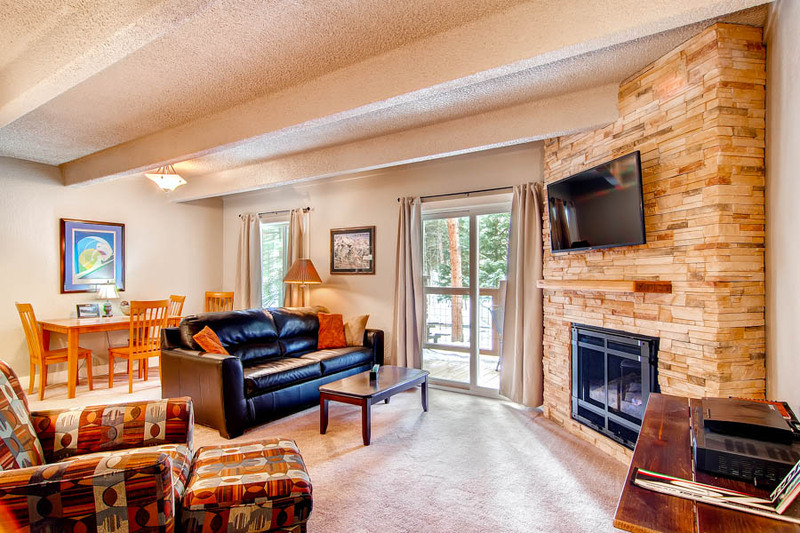 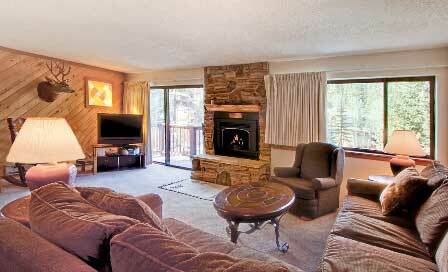 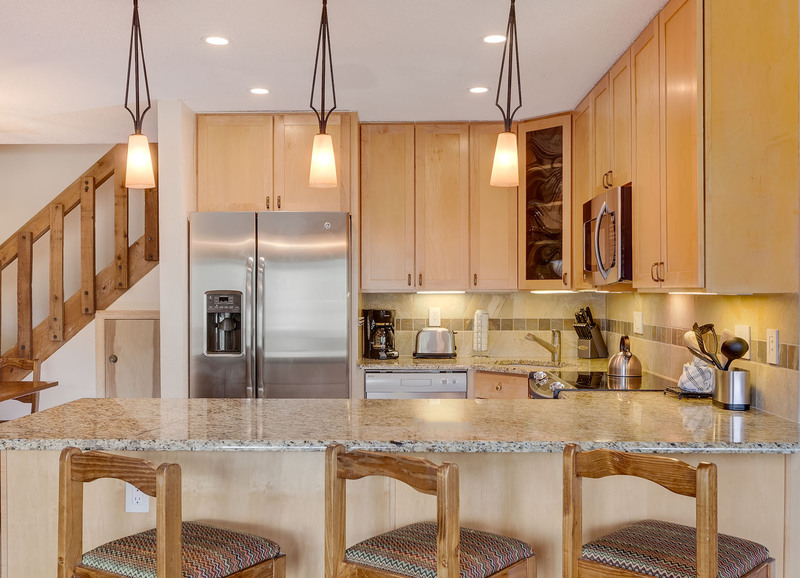 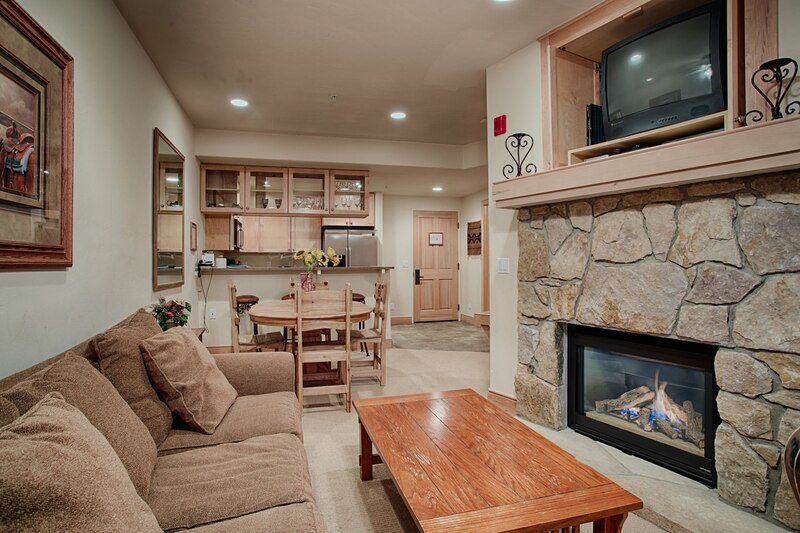 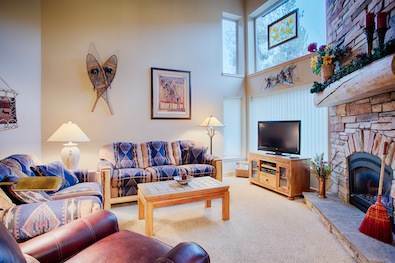 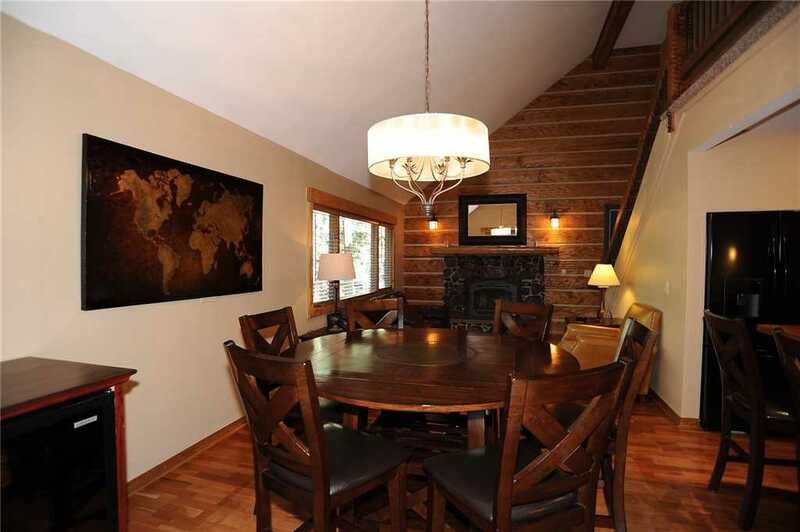 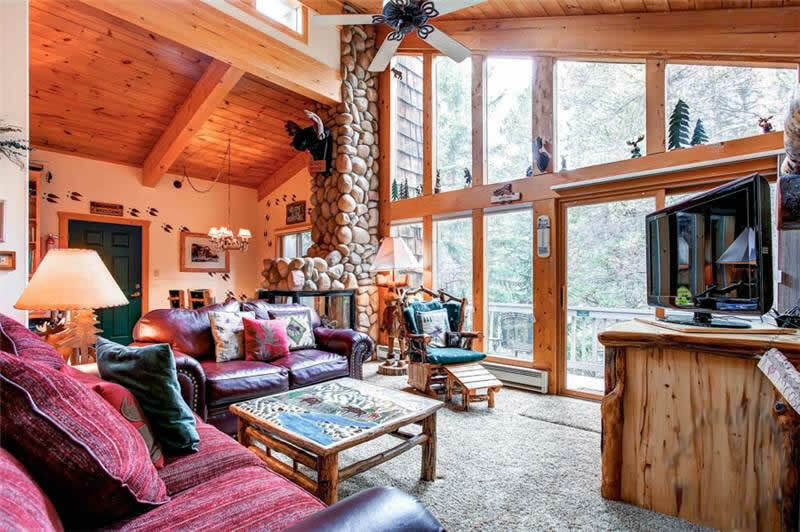 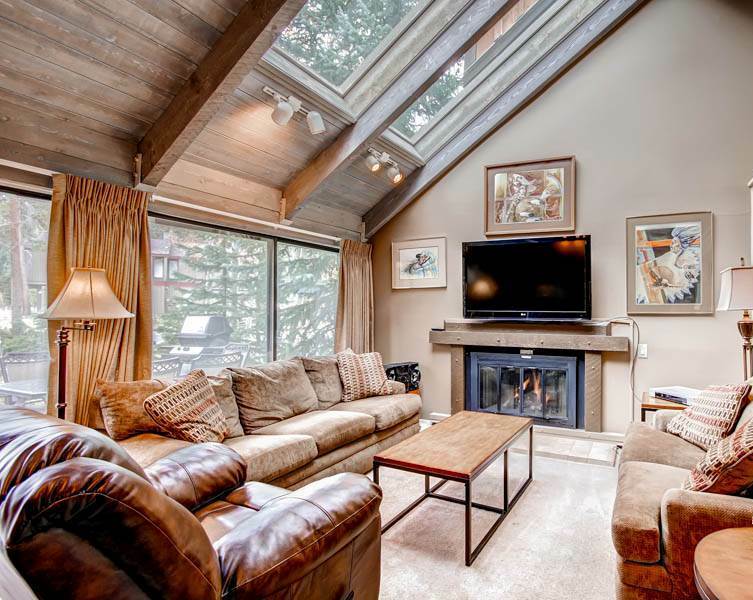 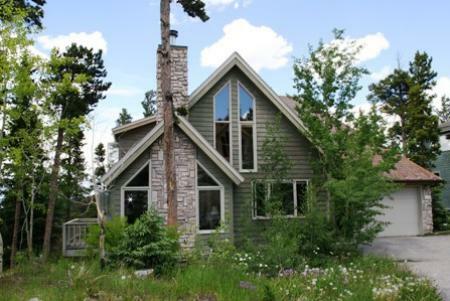 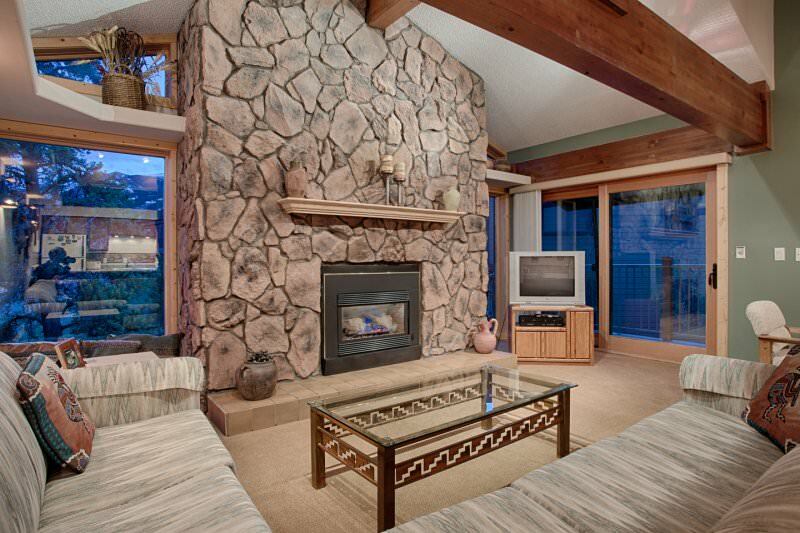 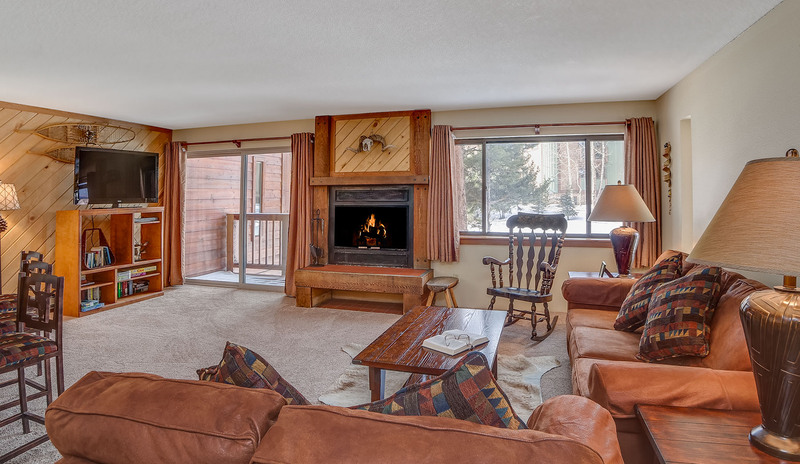 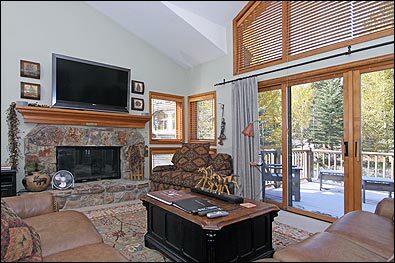 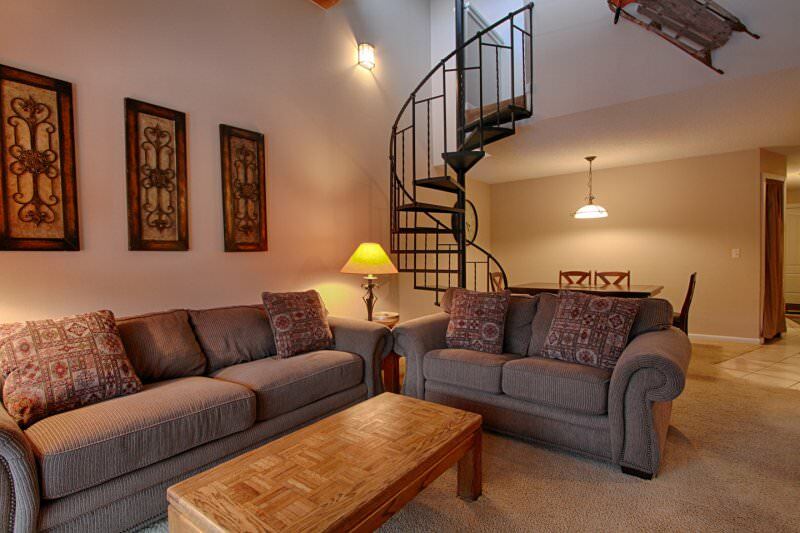 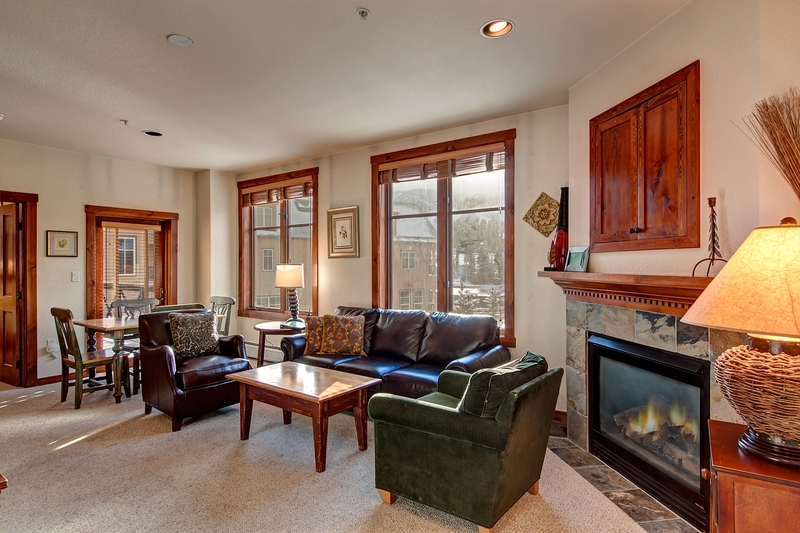 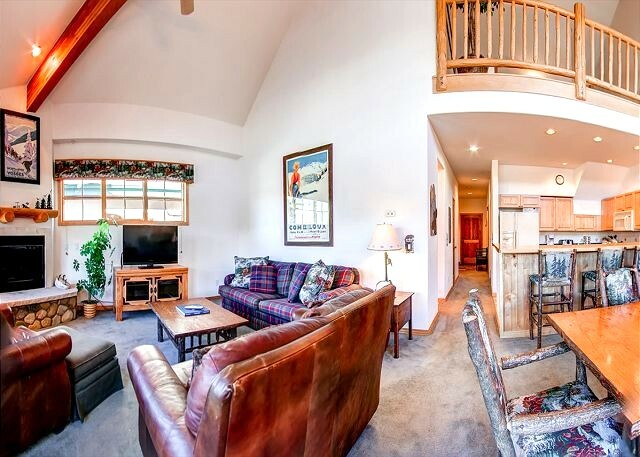 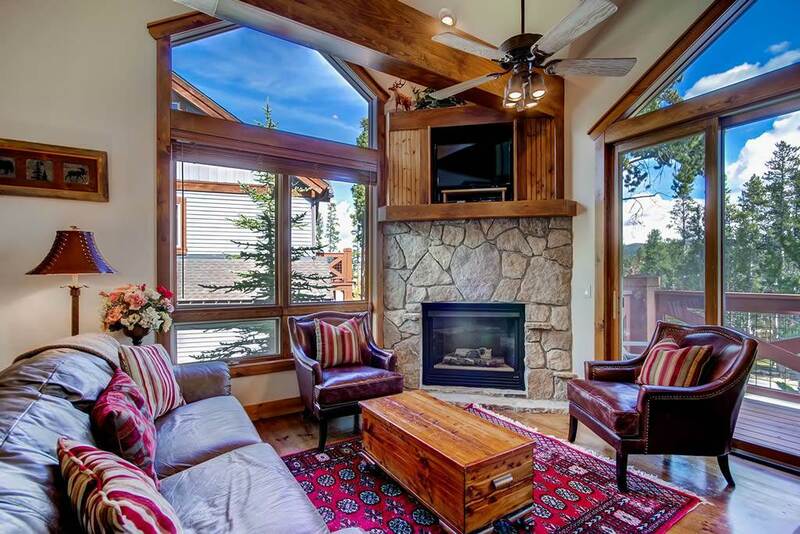 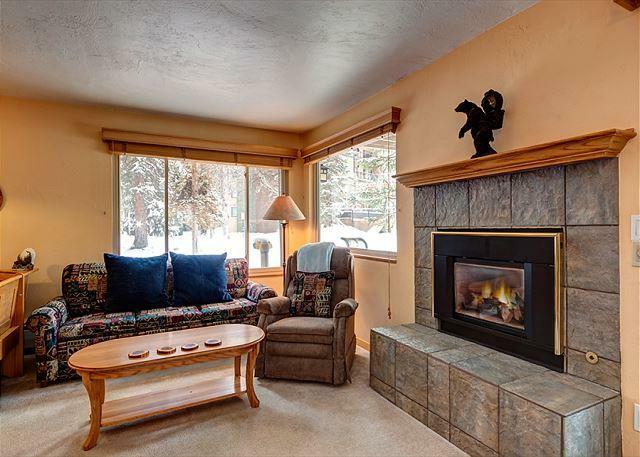 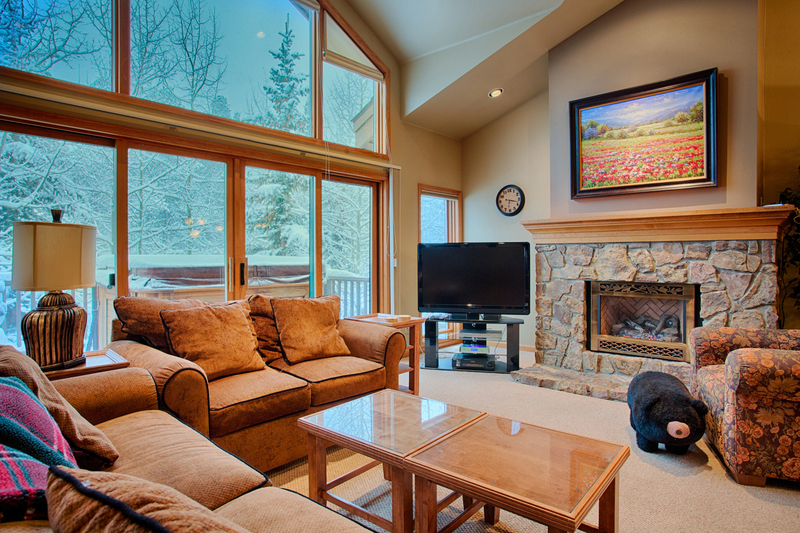 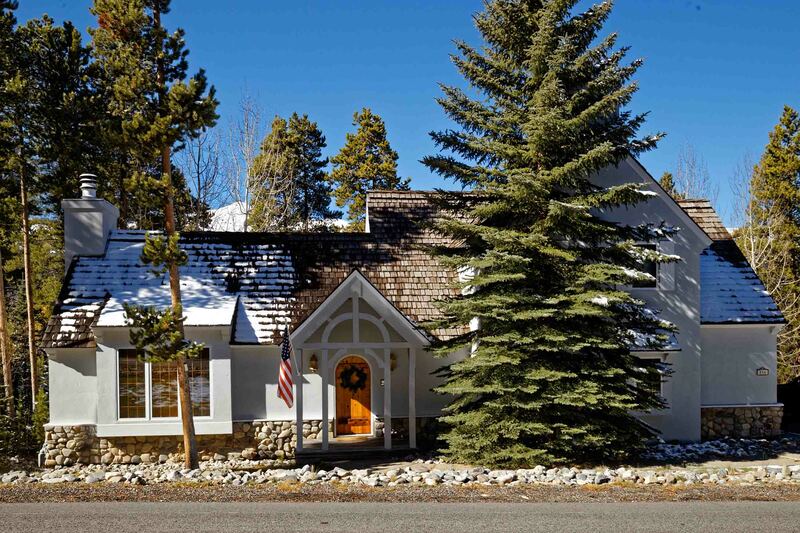 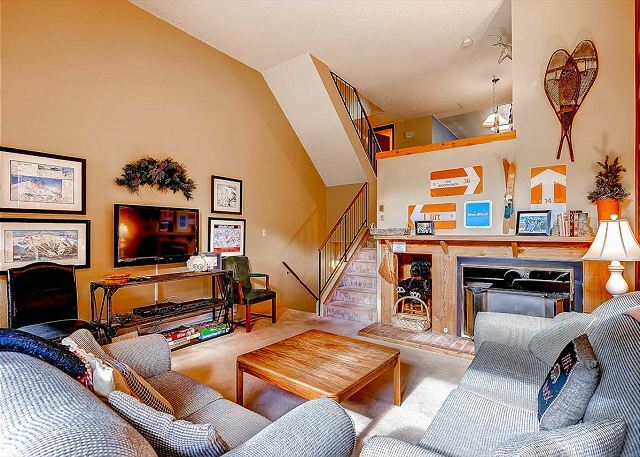 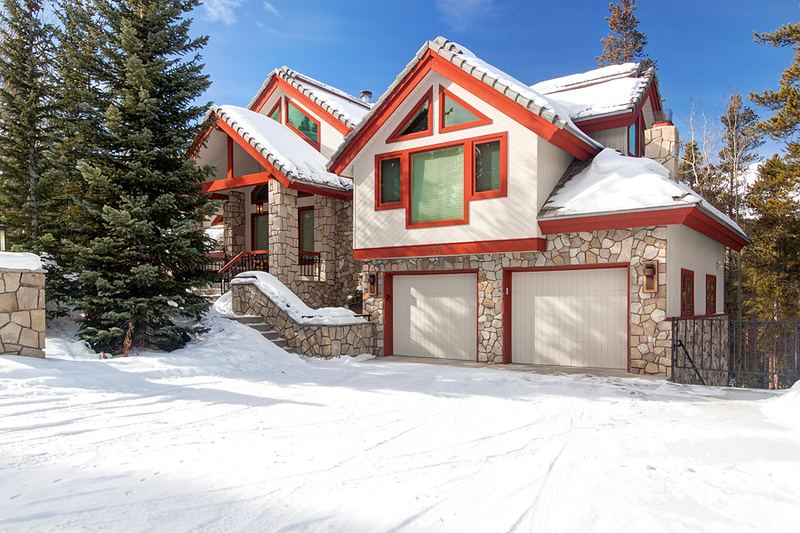 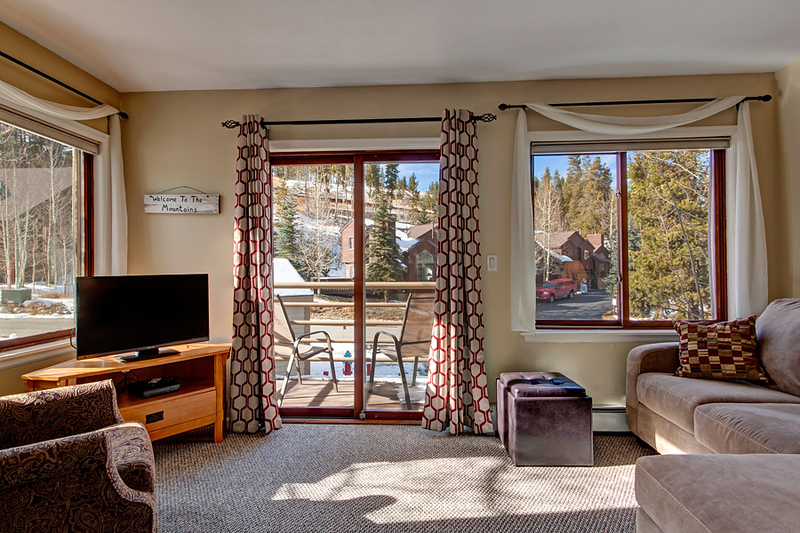 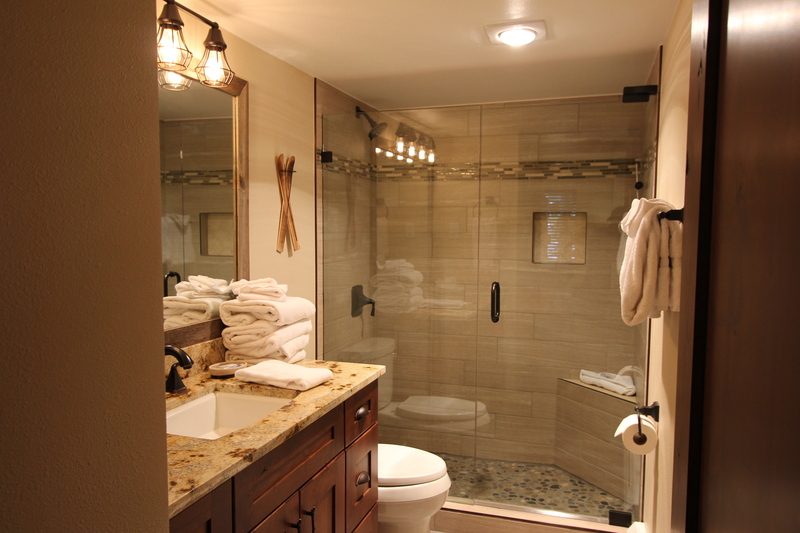 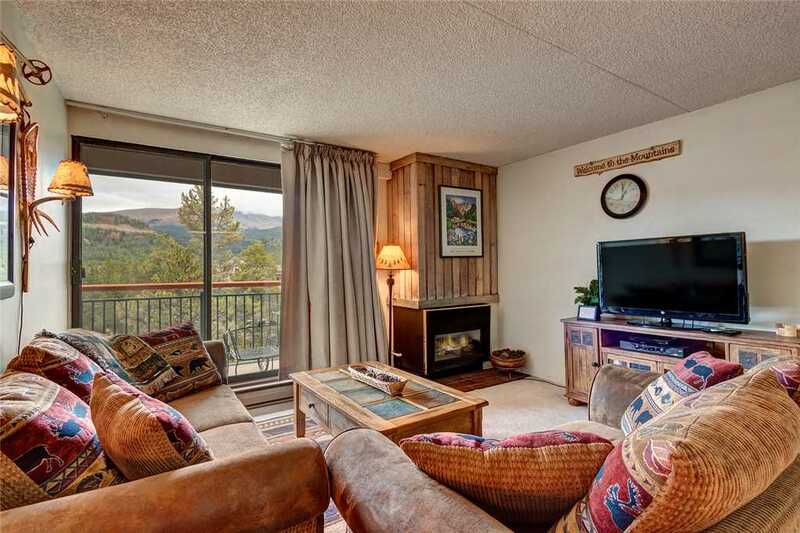 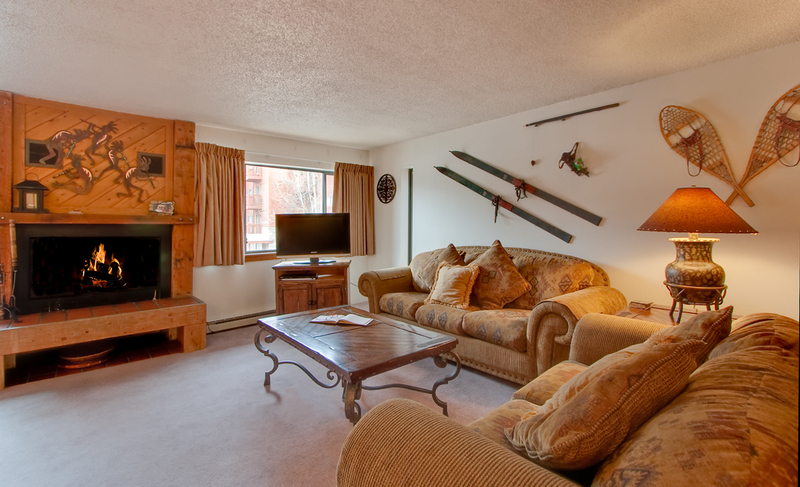 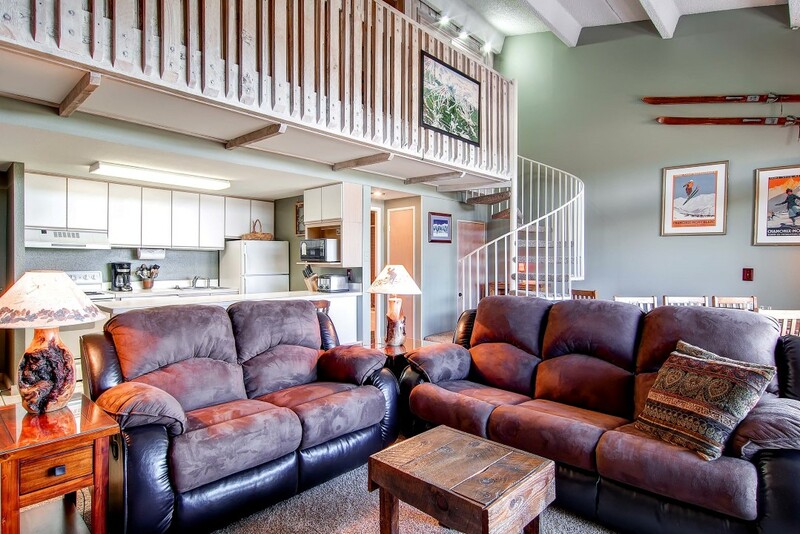 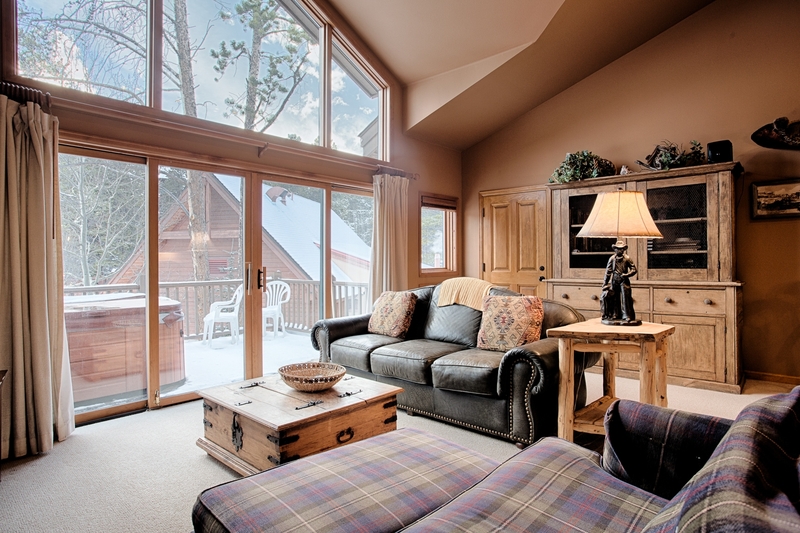 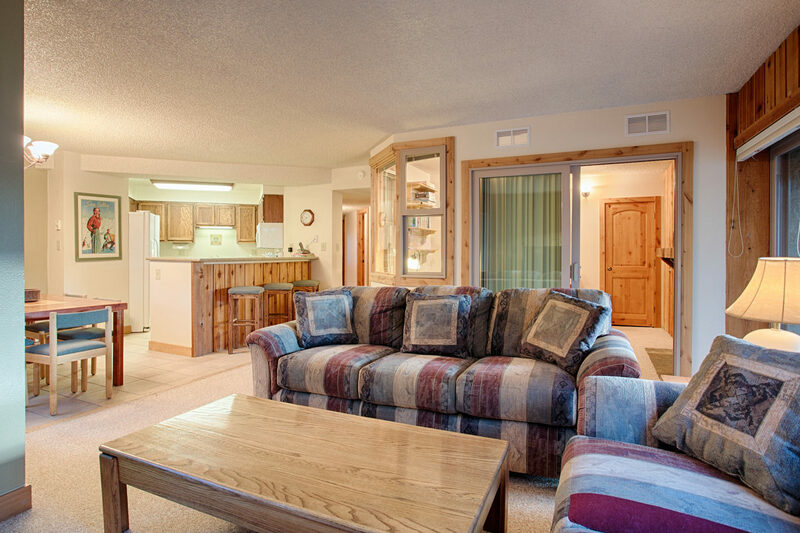 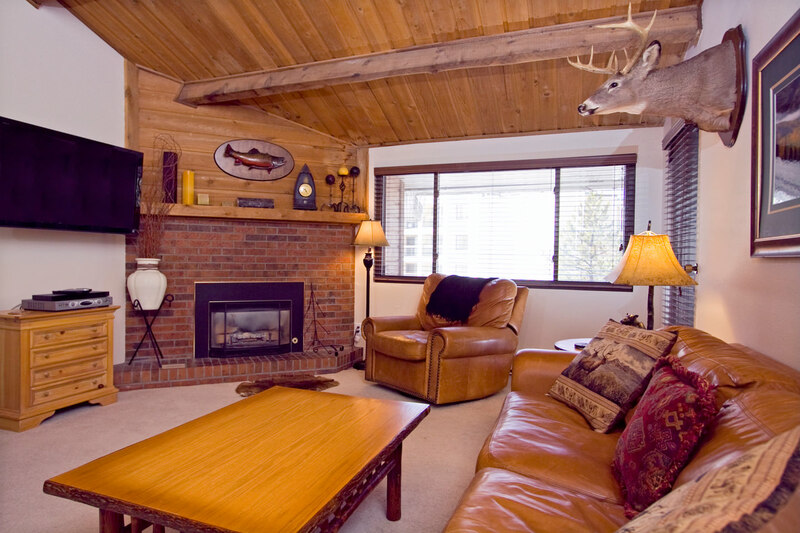 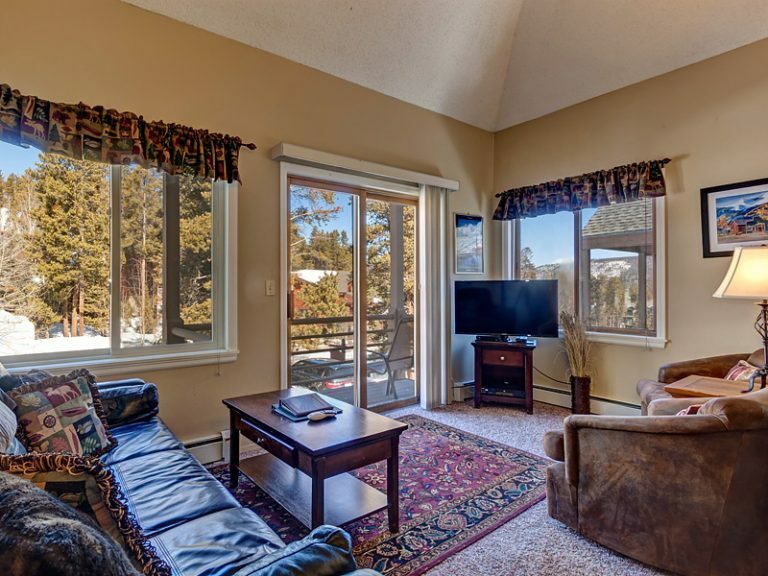 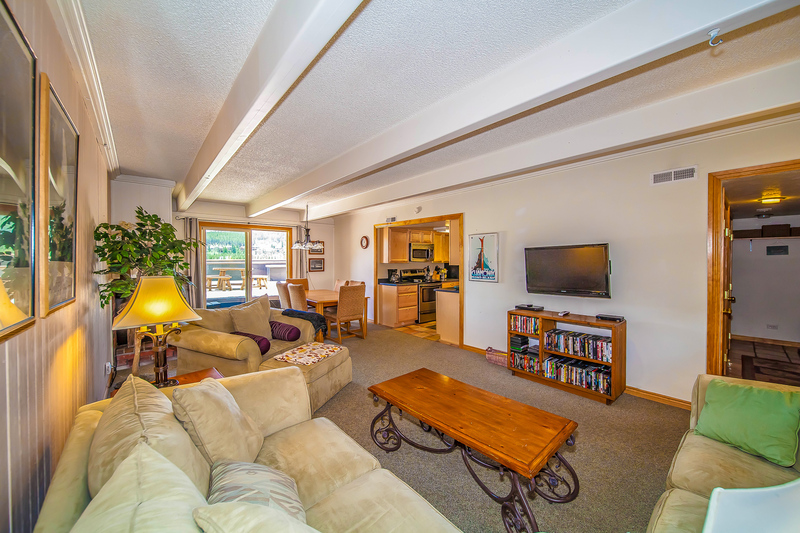 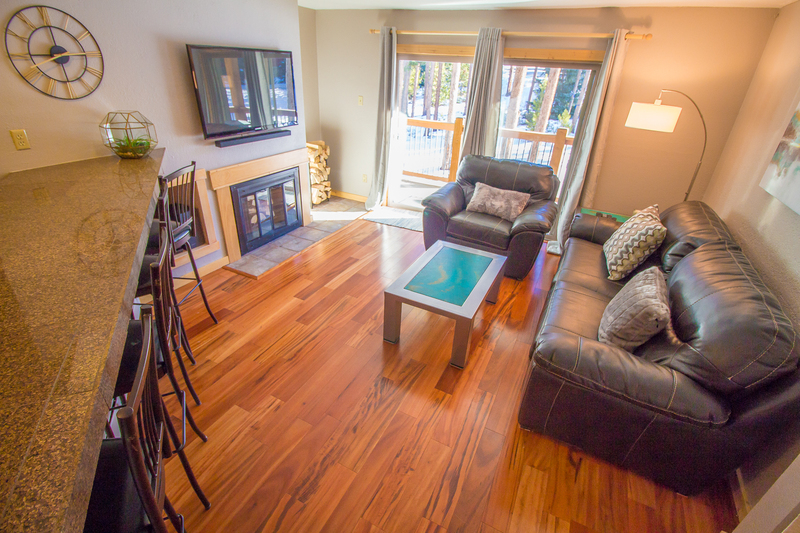 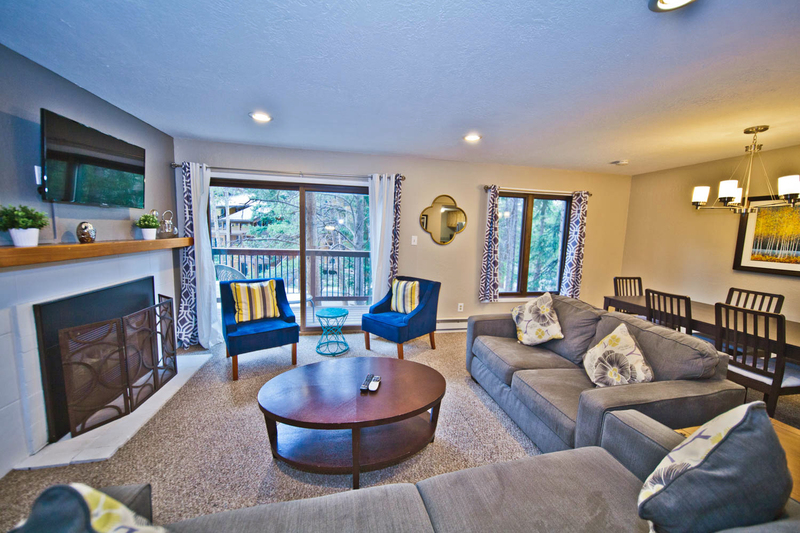 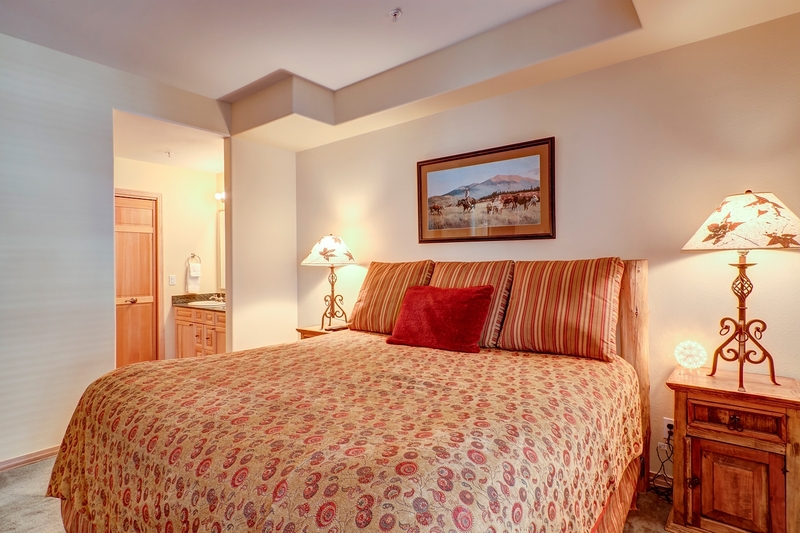 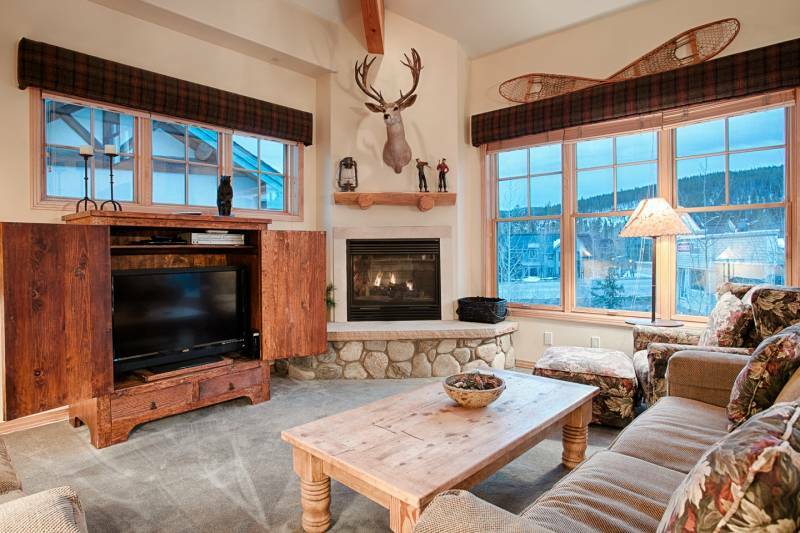 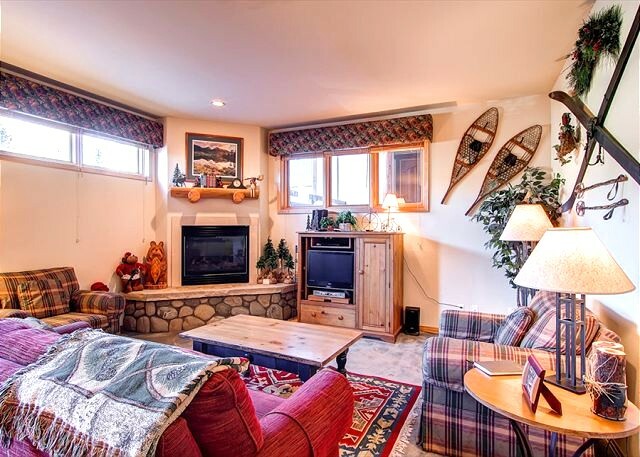 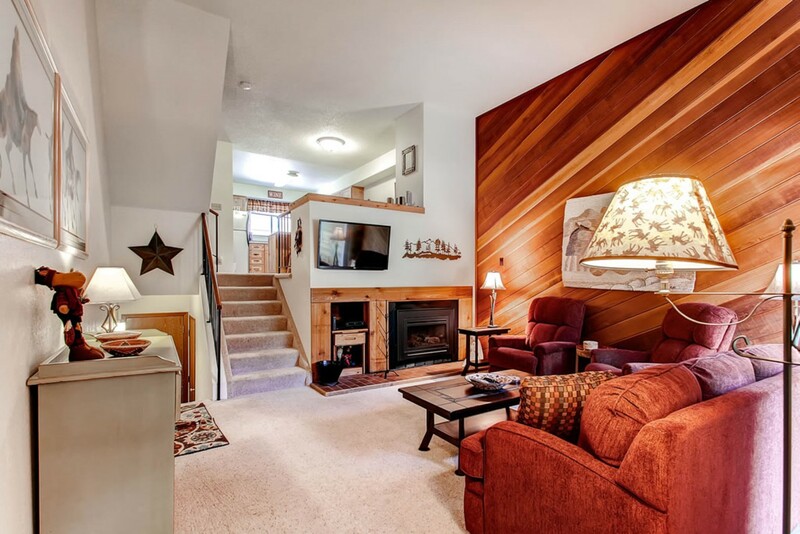 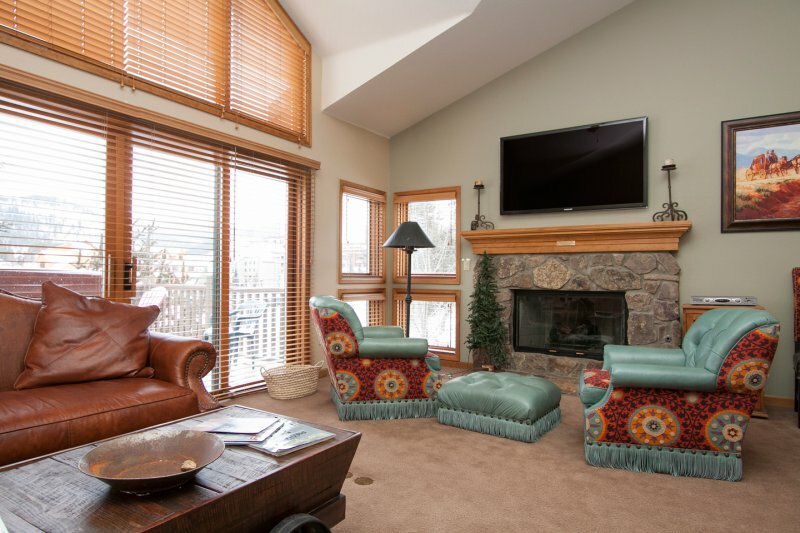 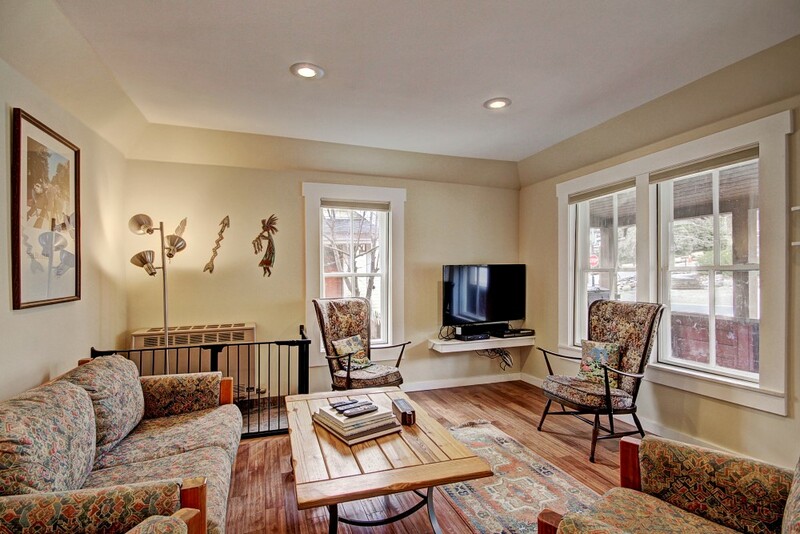 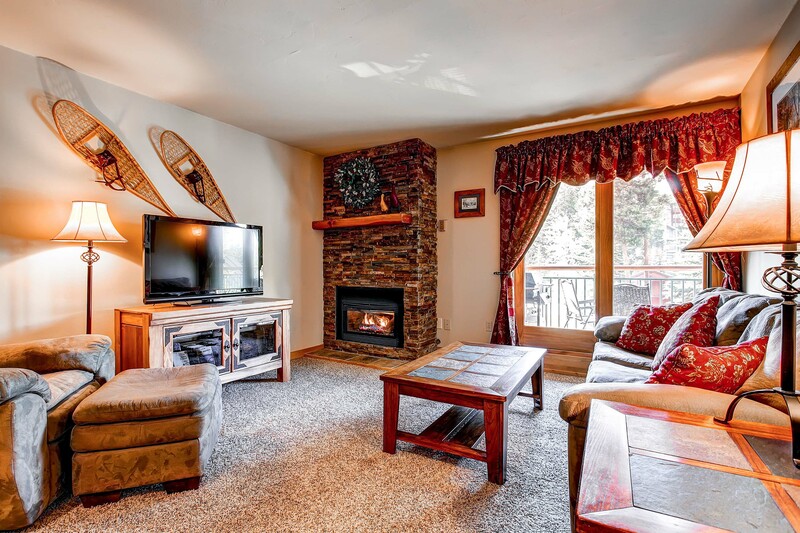 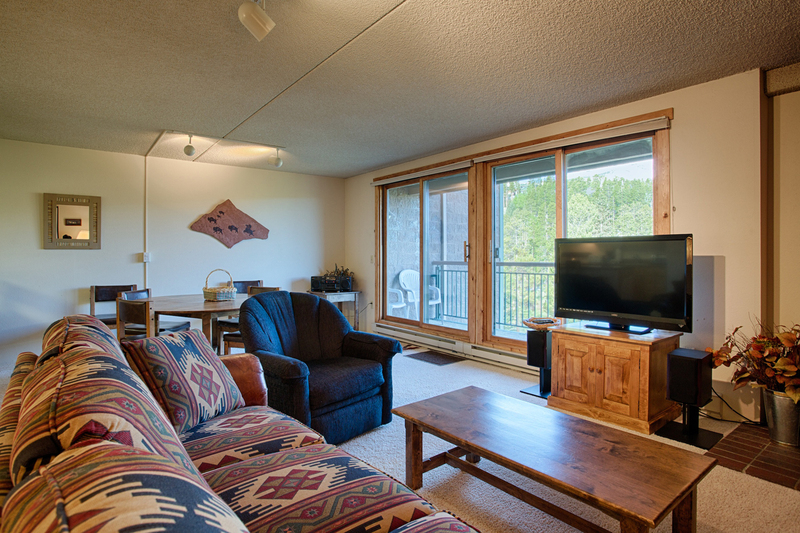 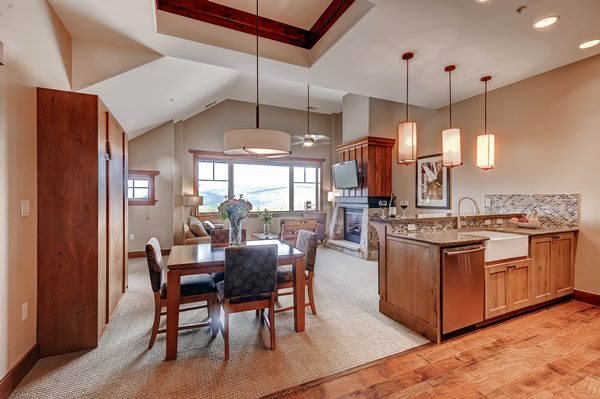 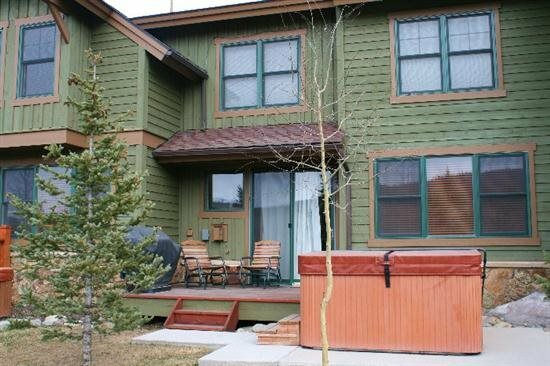 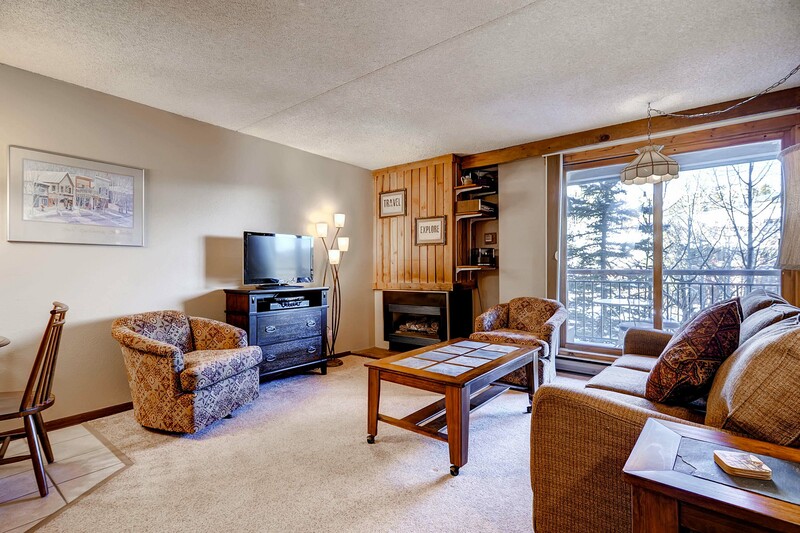 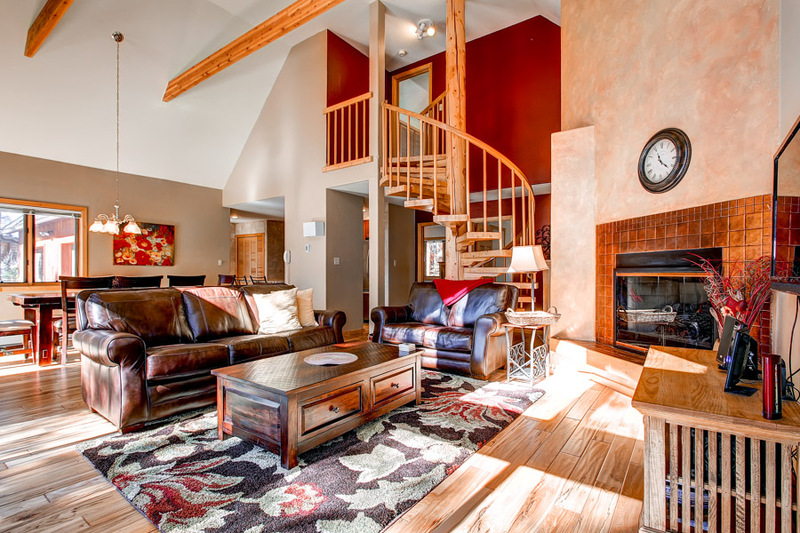 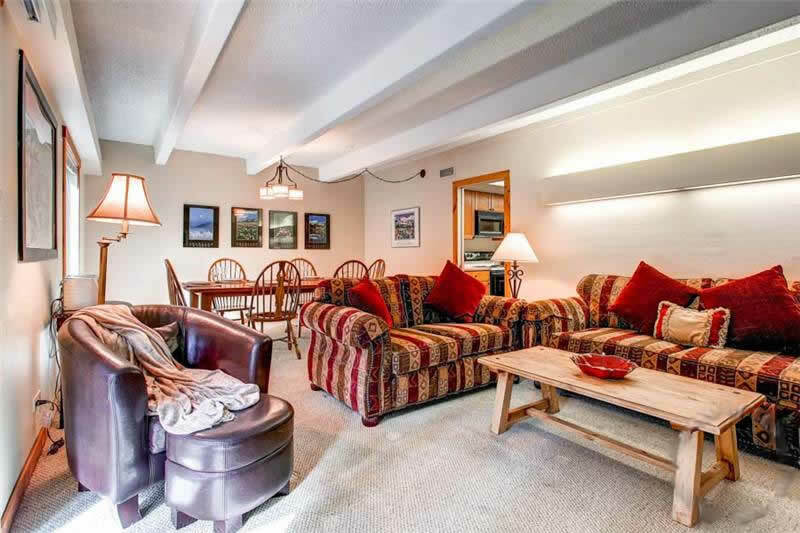 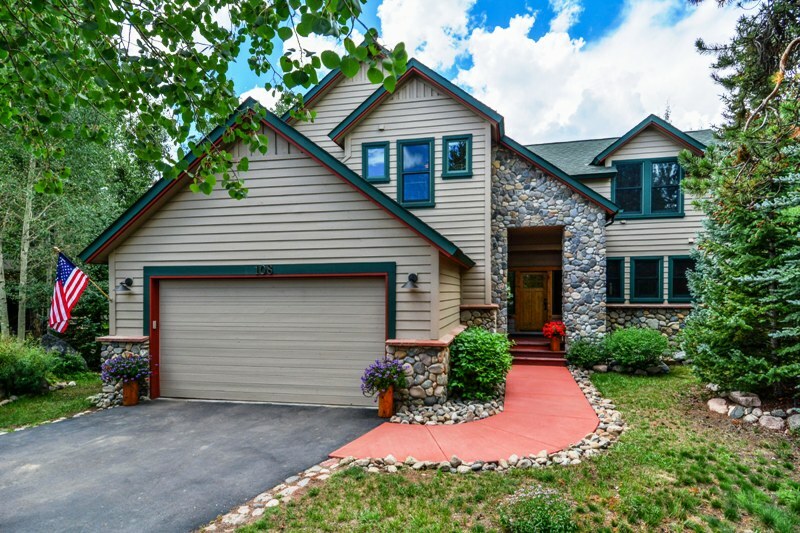 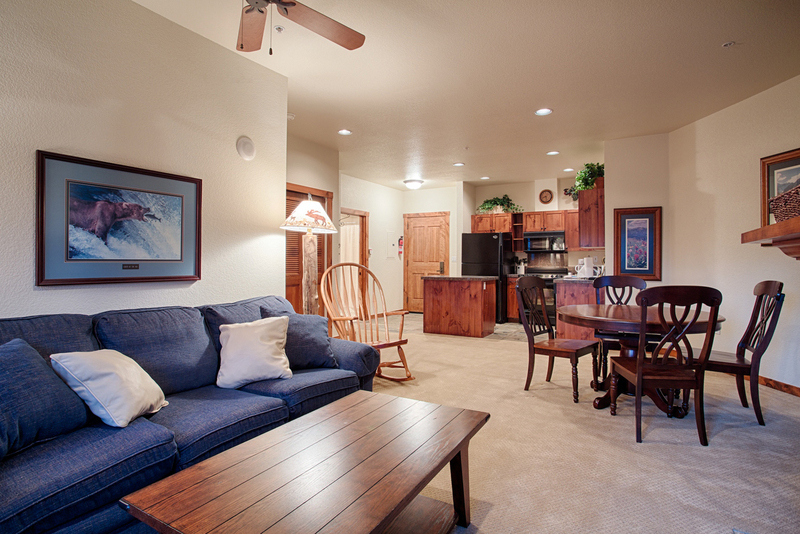 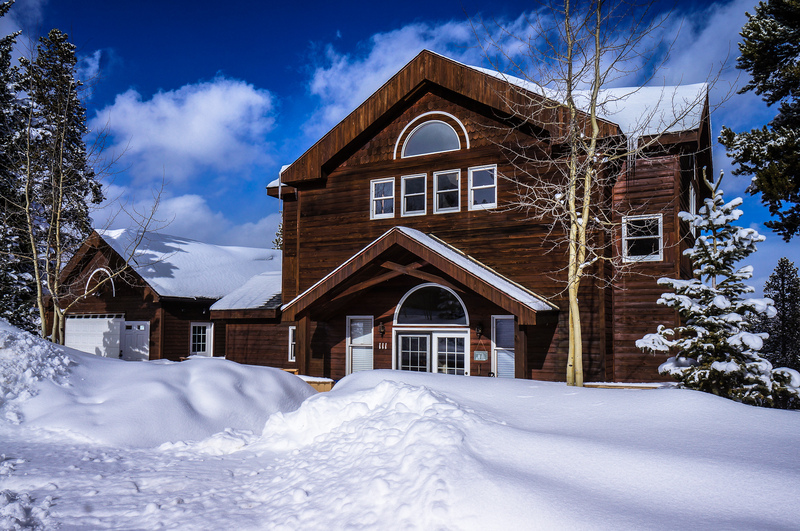 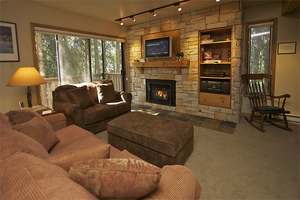 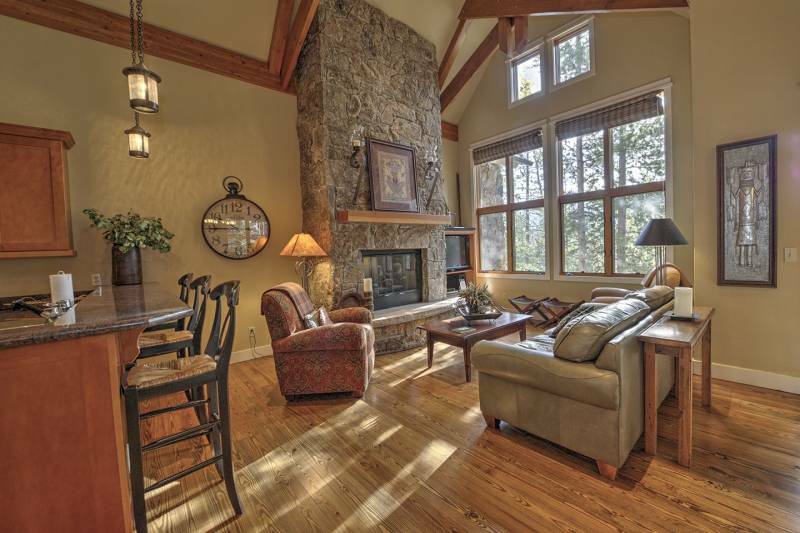 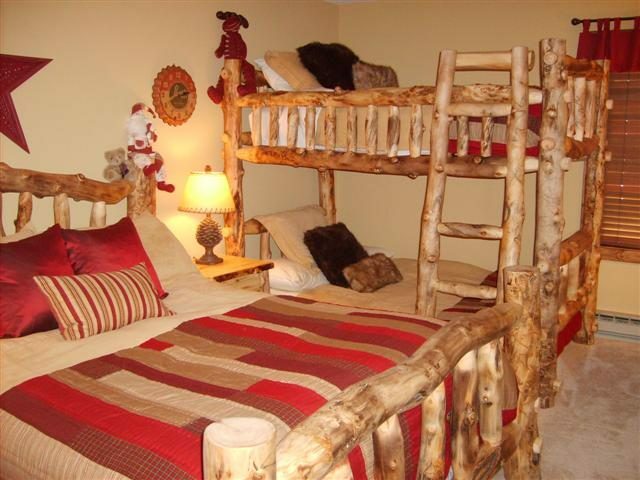 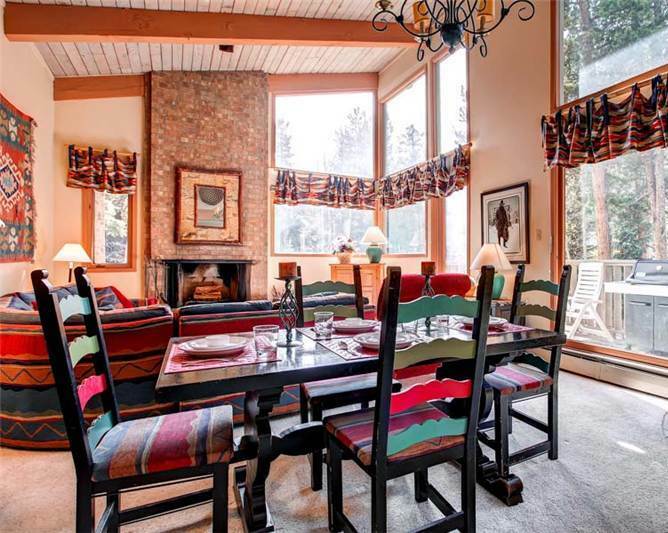 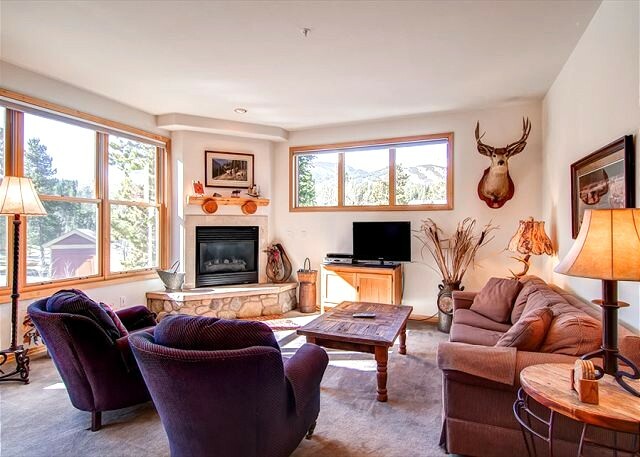 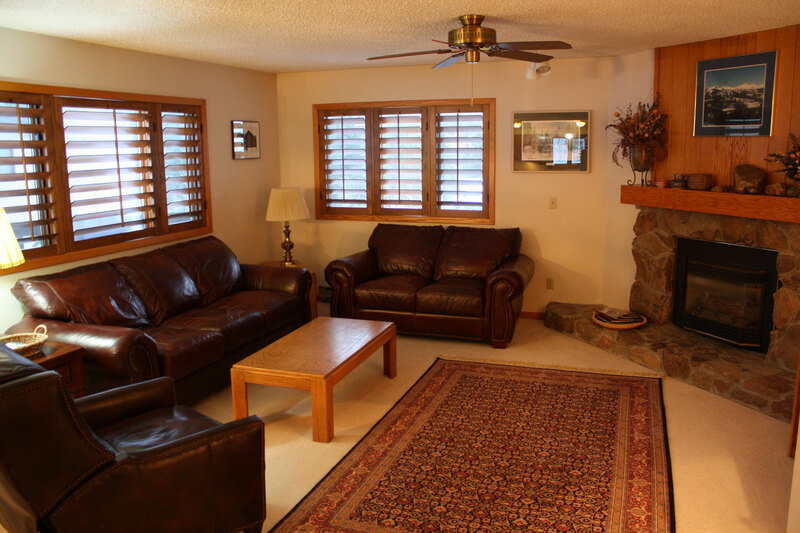 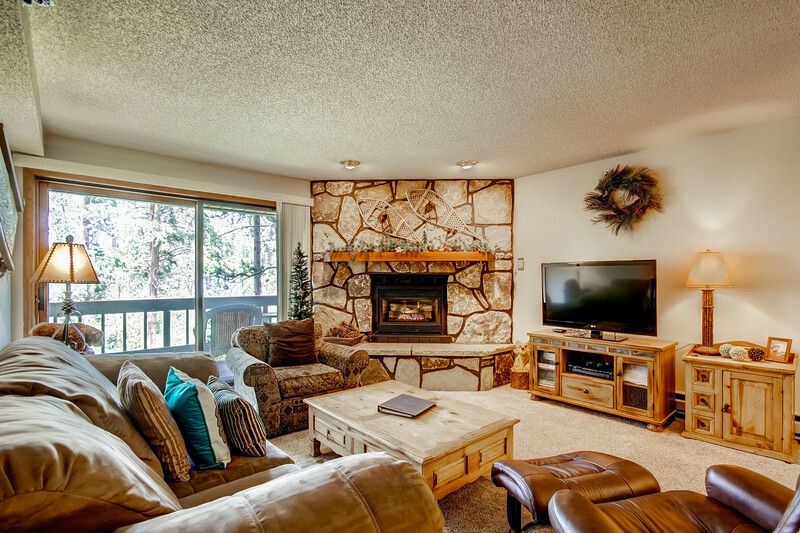 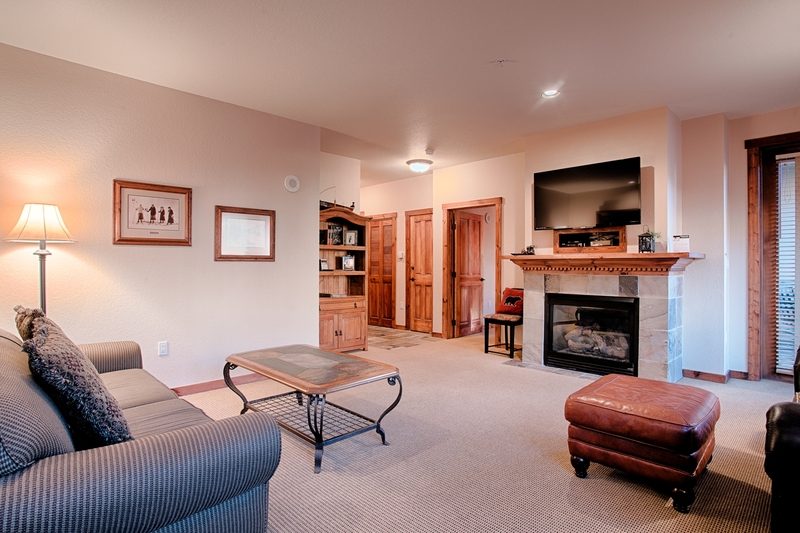 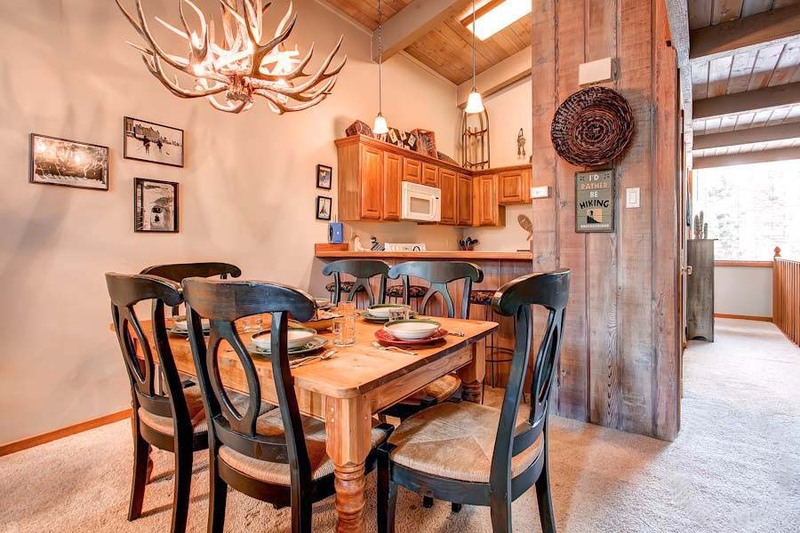 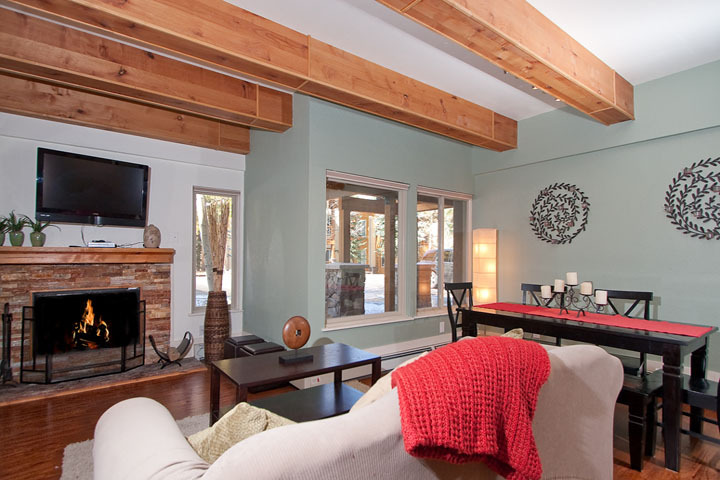 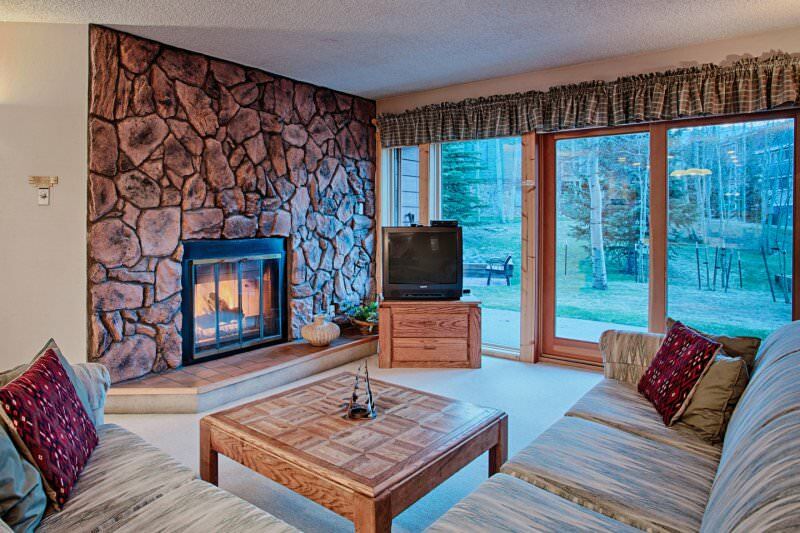 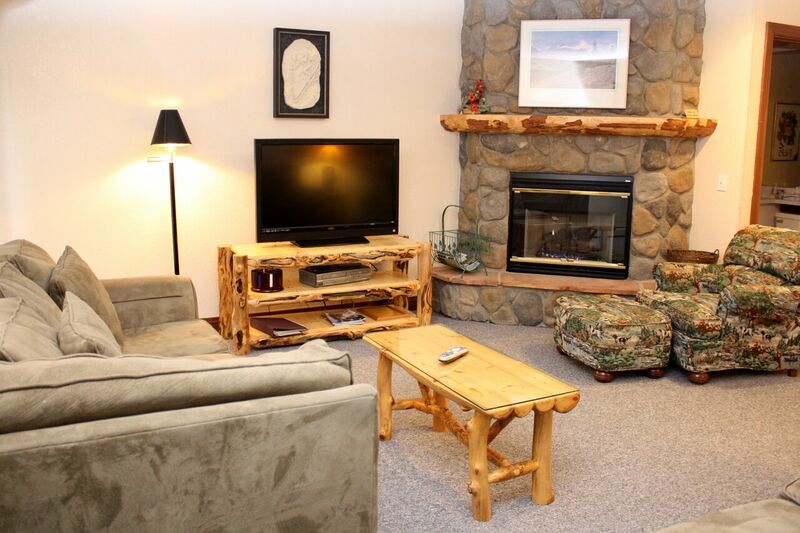 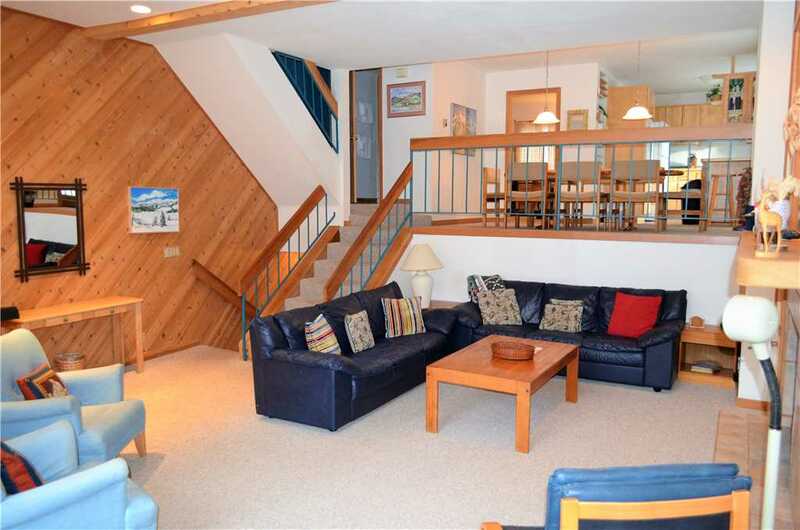 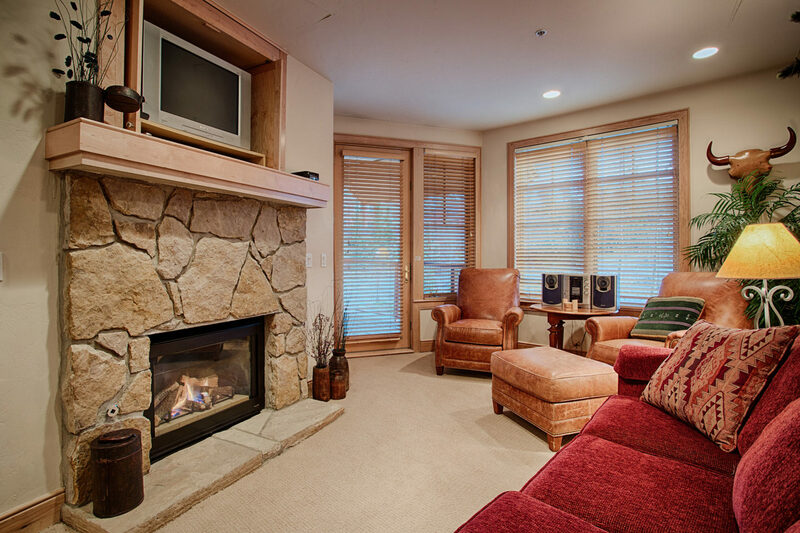 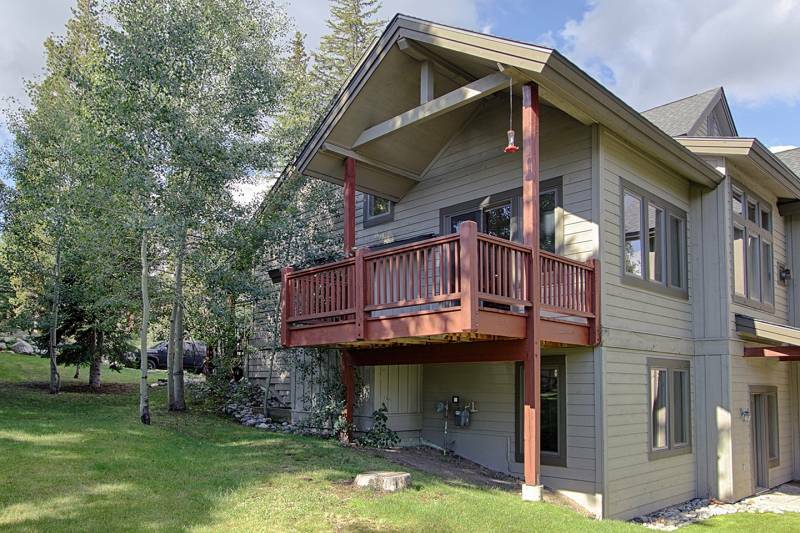 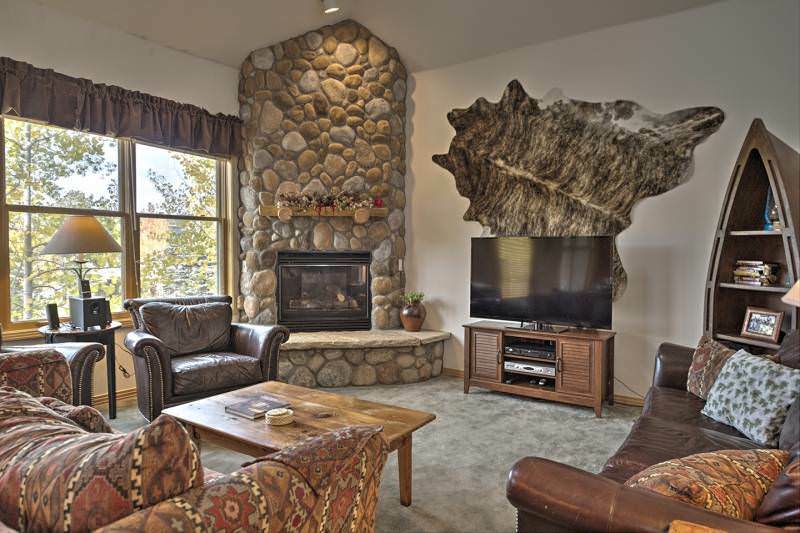 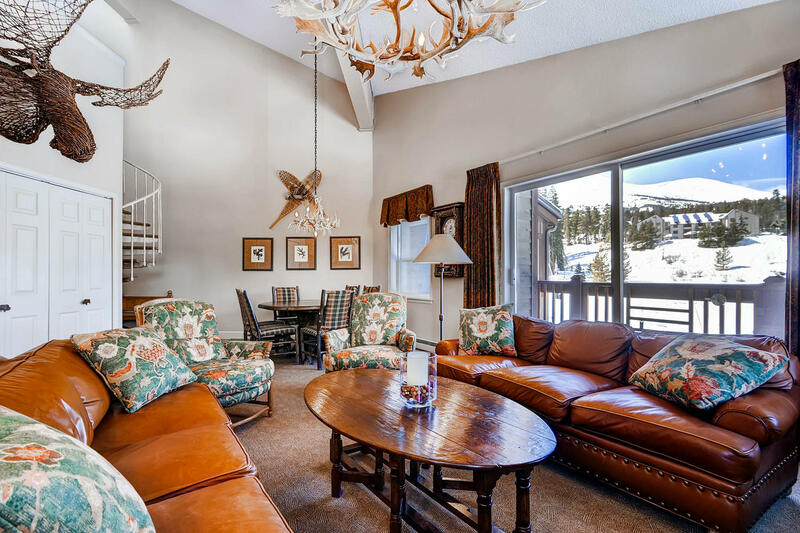 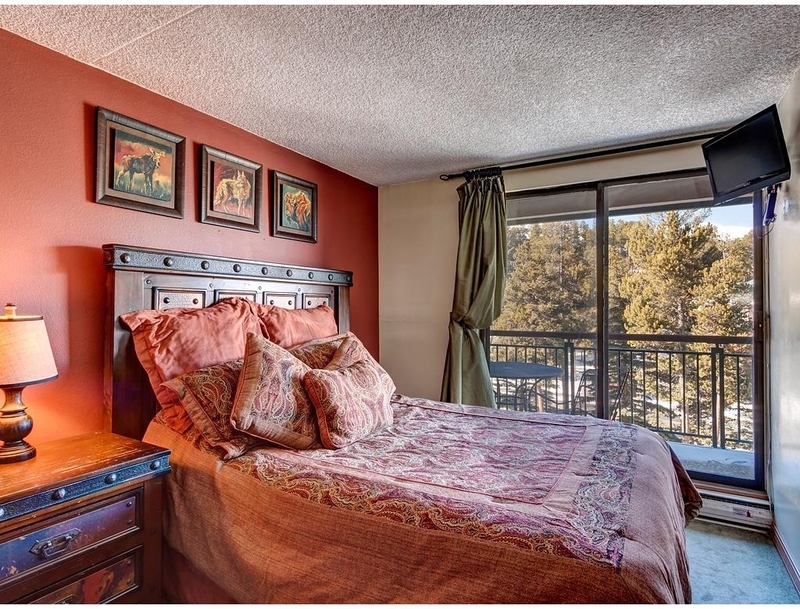 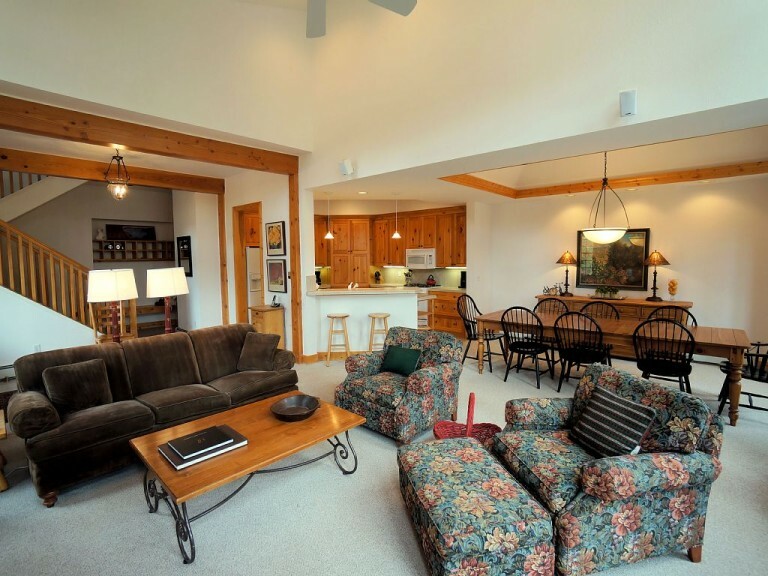 Park Meadows Lodge is the most affordable yet convenient lodging alternative in Breckenridge. 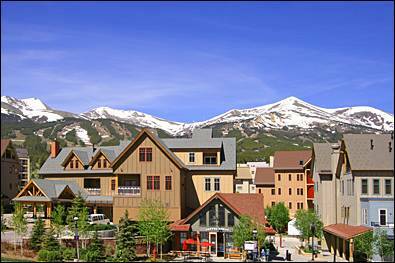 Ski-In on the Four O’Clock Ski Run and walk 1 block to the Breckenridge ‘Free Ride’ Shuttle Stop for a short ride to the base of Peaks 7 and 8. 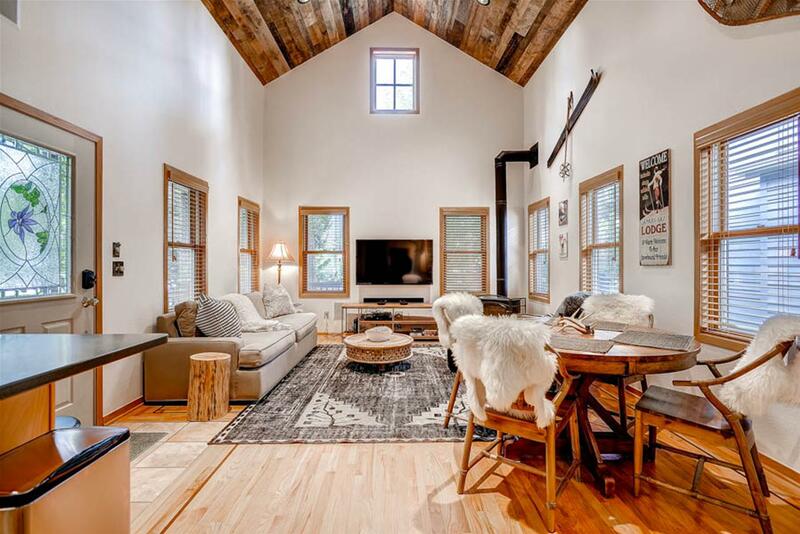 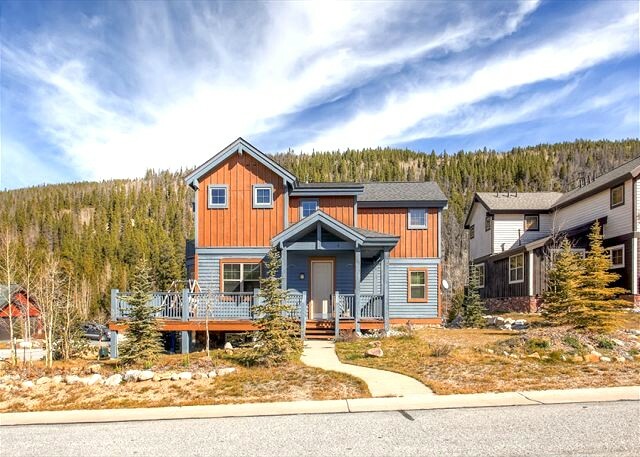 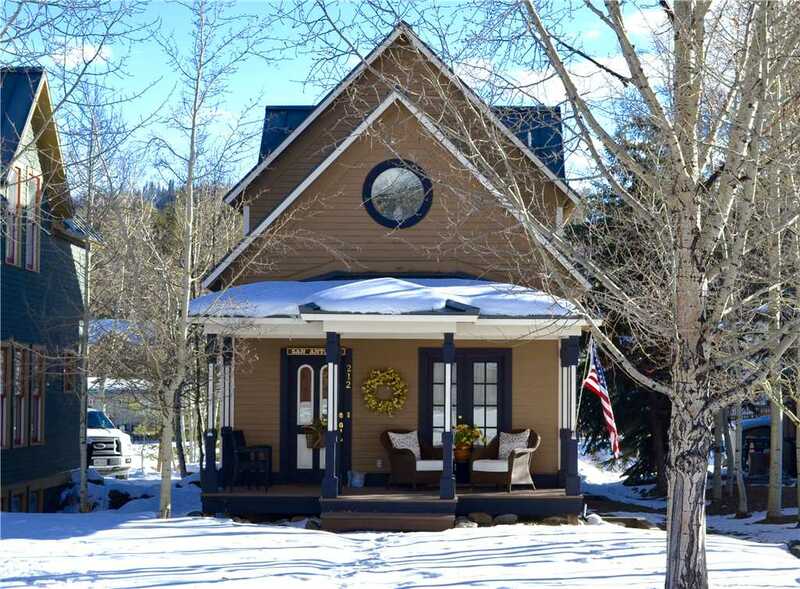 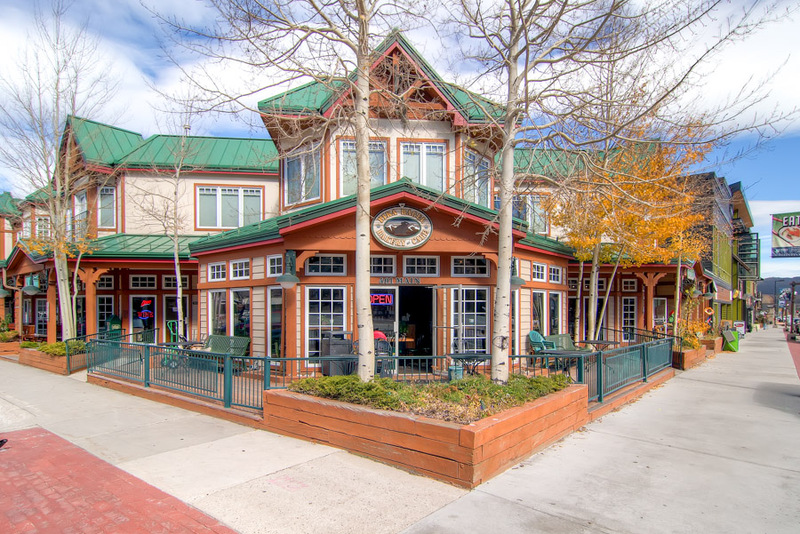 An easy three block walk to Historic Main Street means you are minutes from the center of everything Breckenridge has to offer. 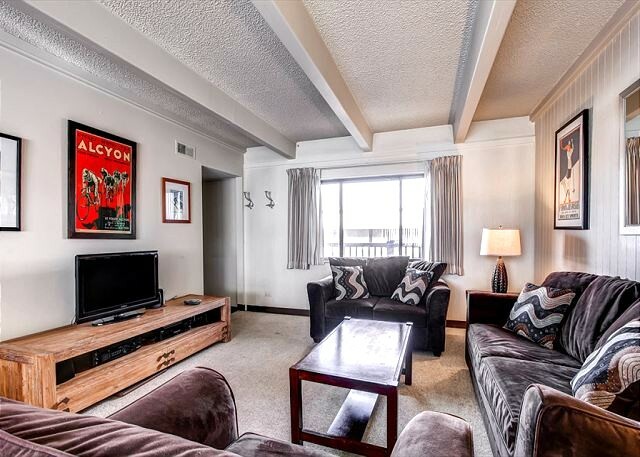 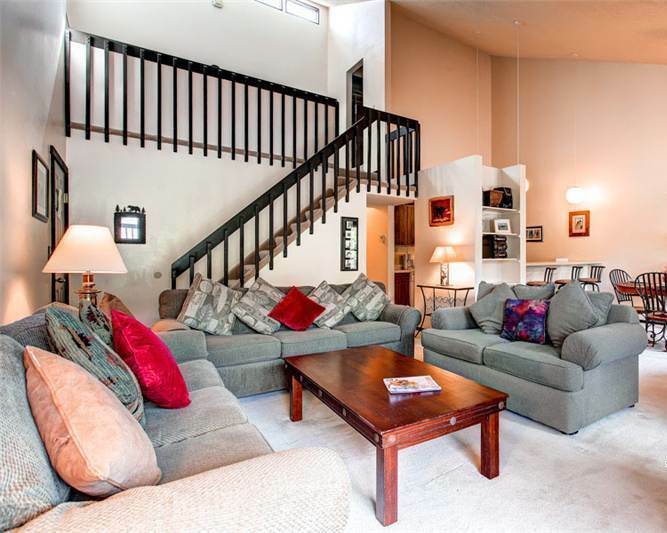 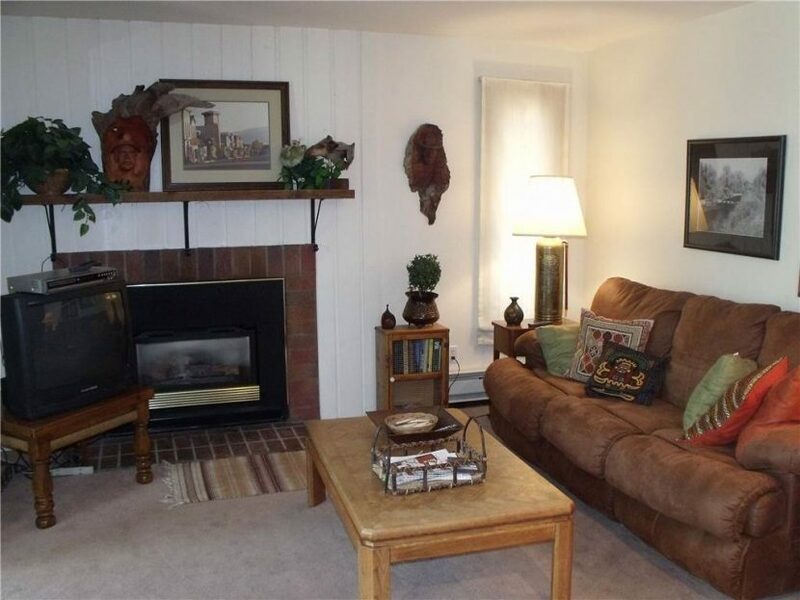 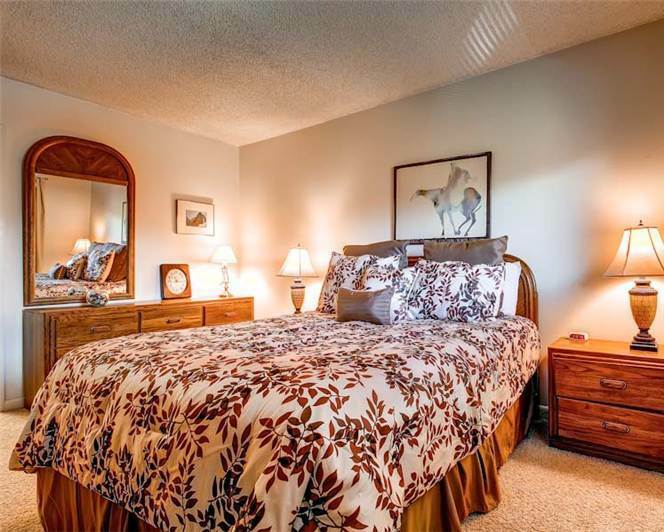 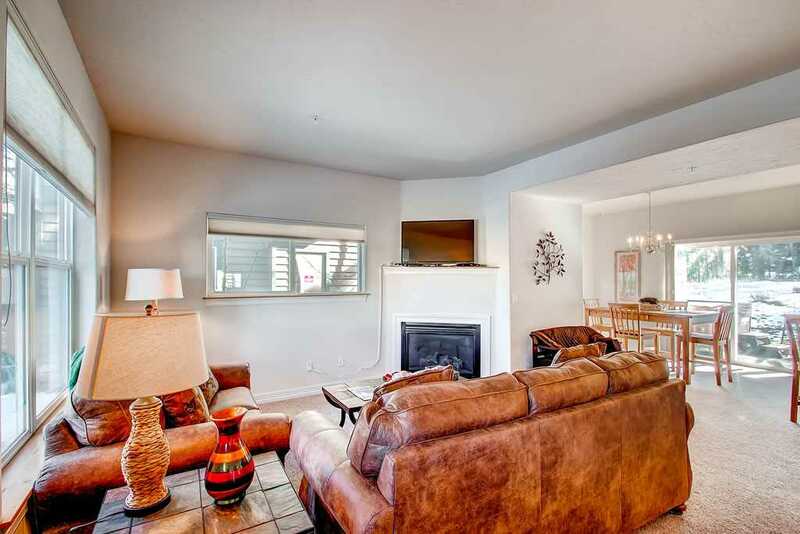 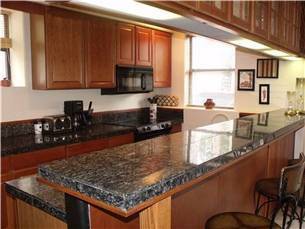 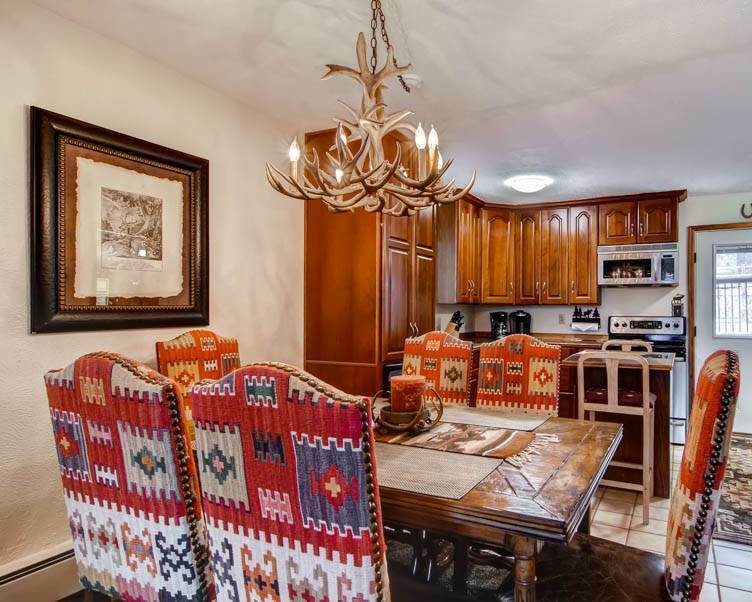 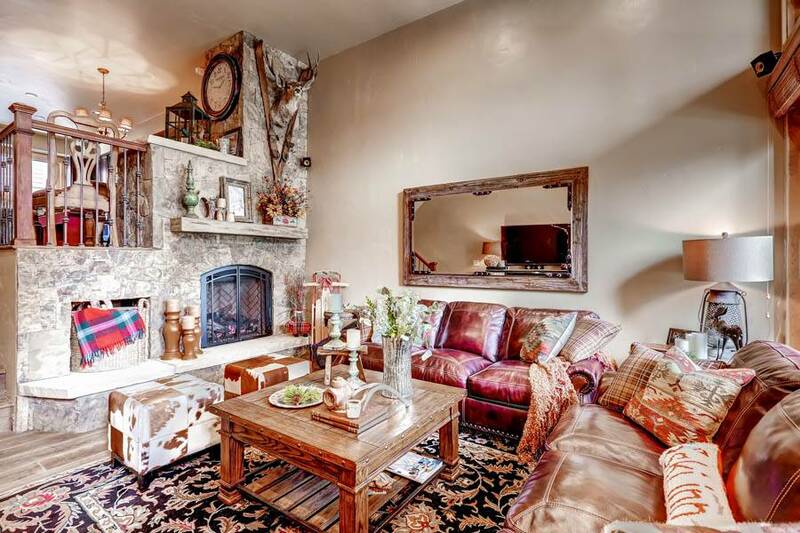 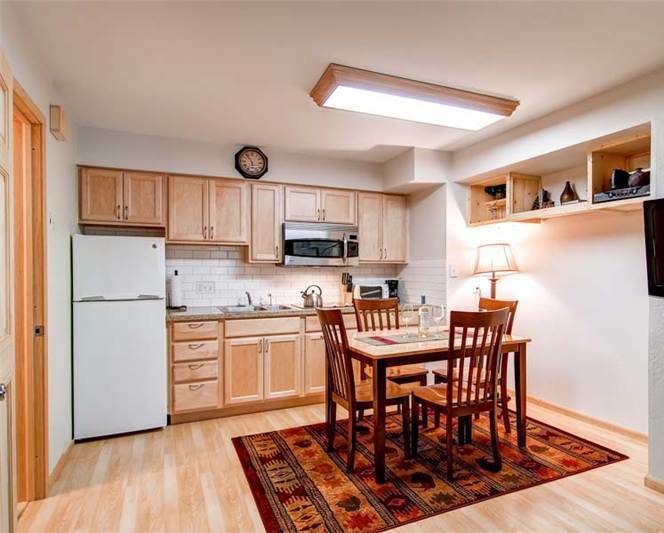 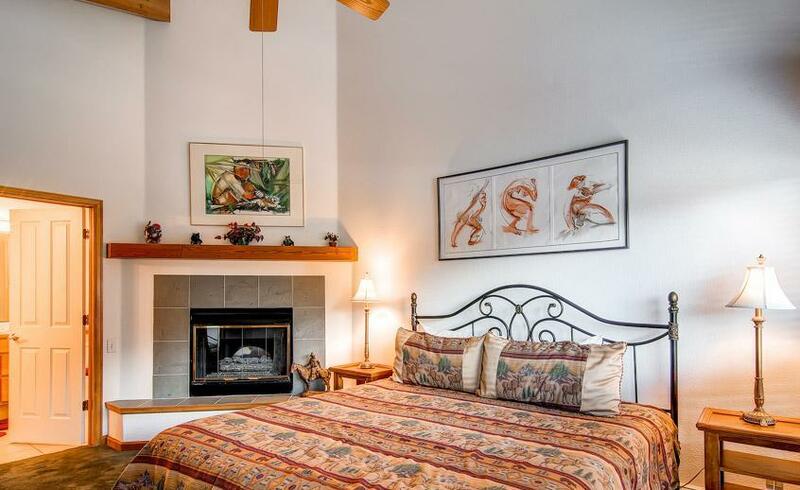 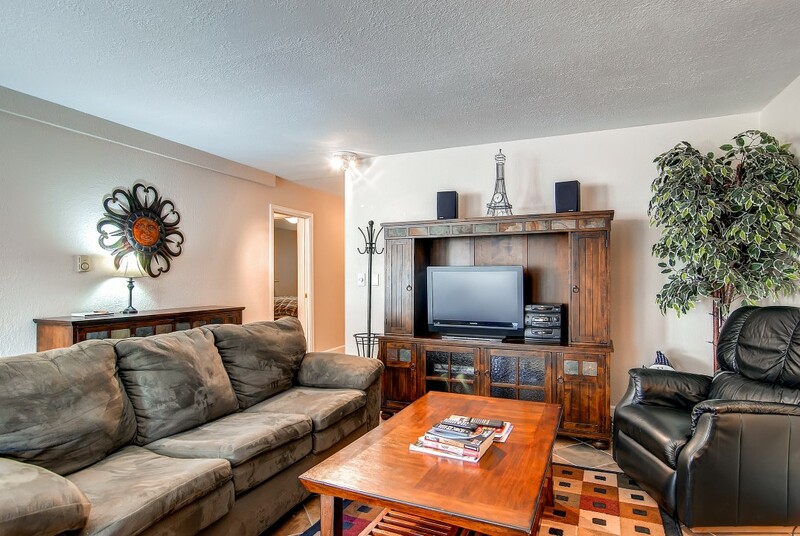 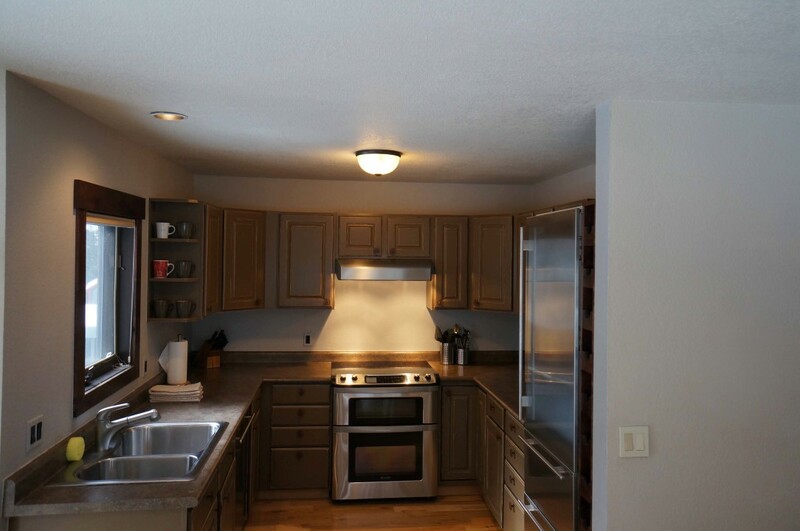 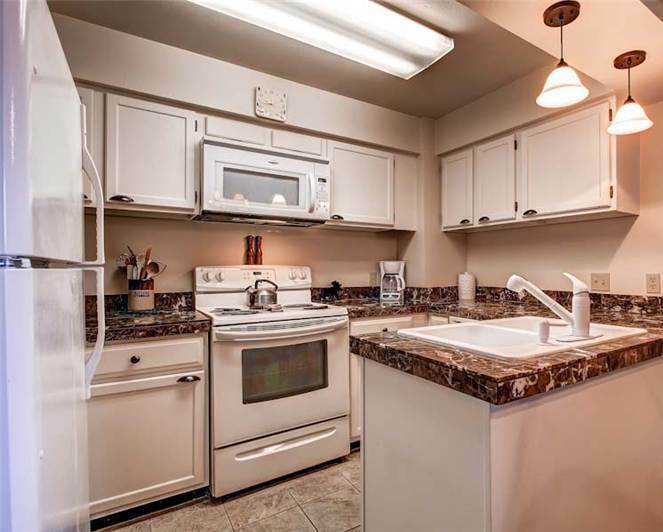 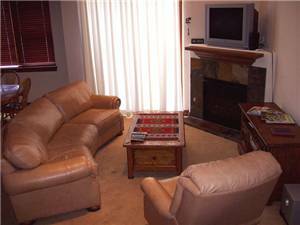 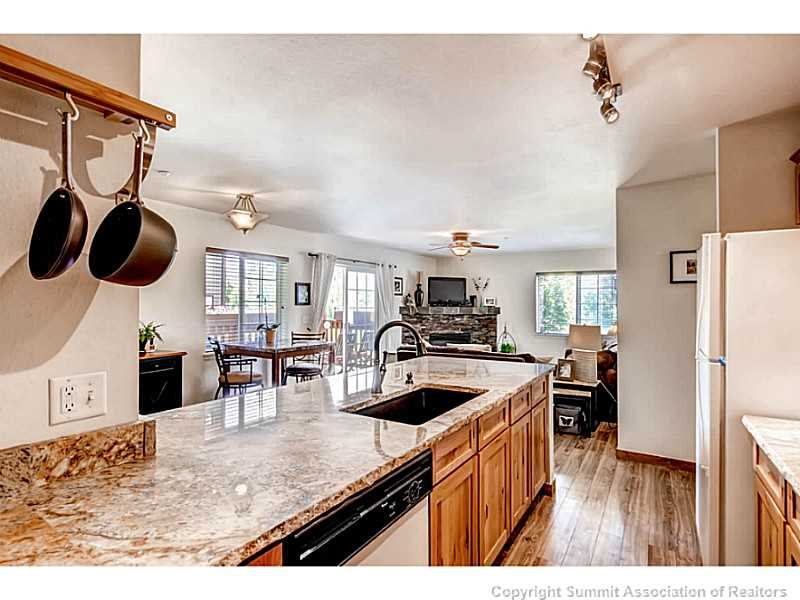 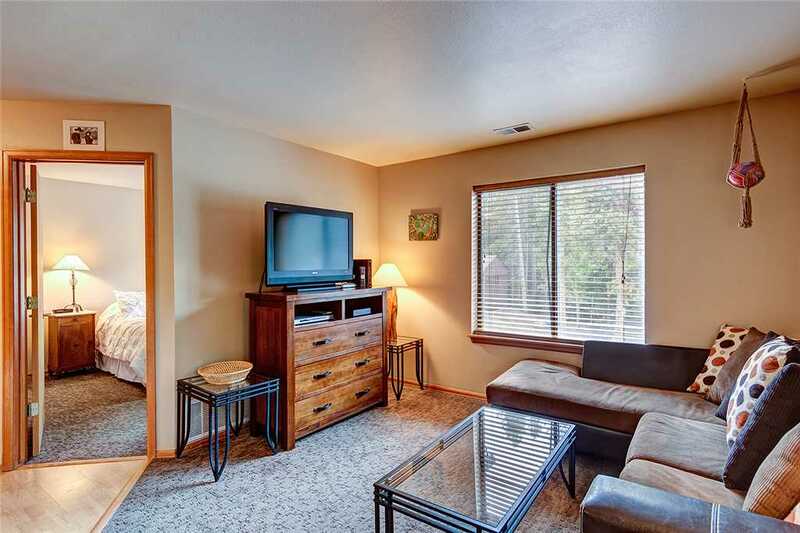 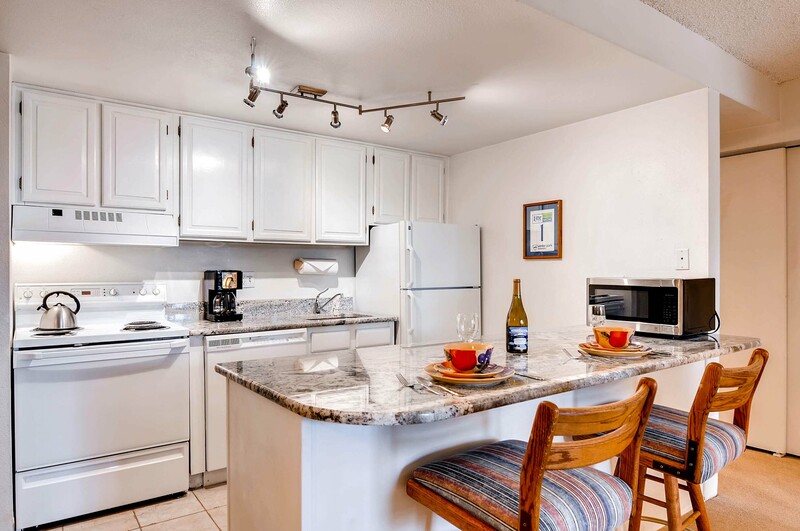 This attractive and well decorated second story, one bedroom corner unit is decorated in a welcoming manner with its new entry tile and carpet and remodeled bathroom. 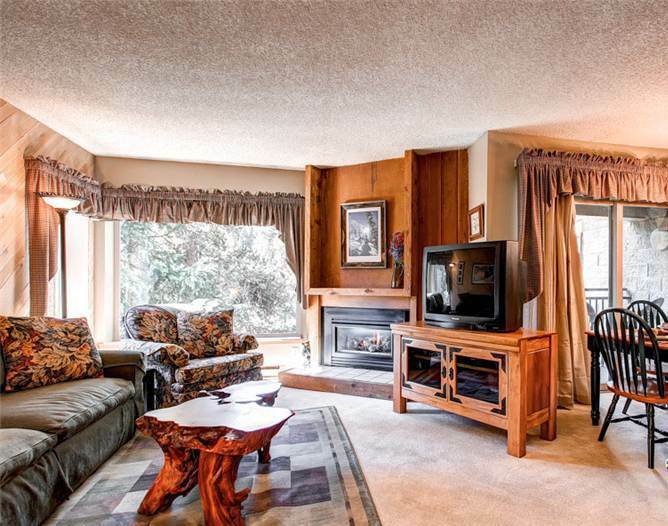 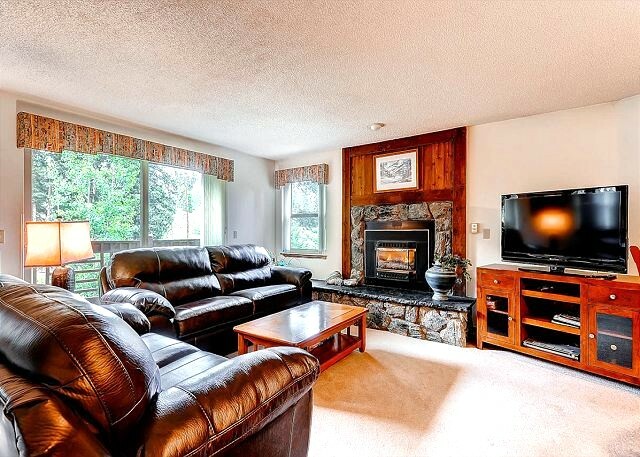 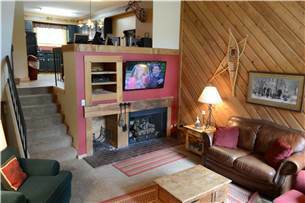 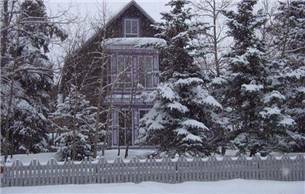 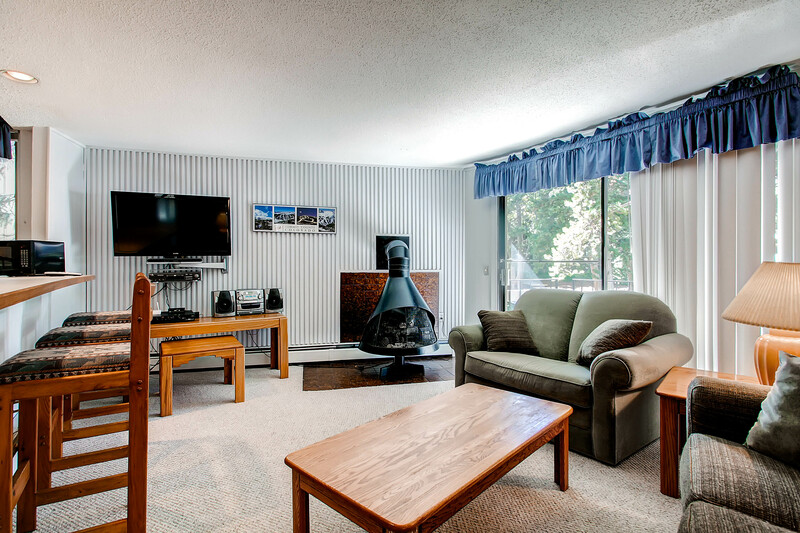 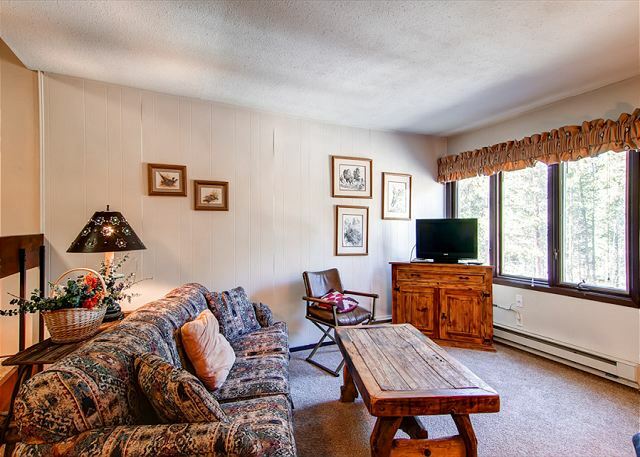 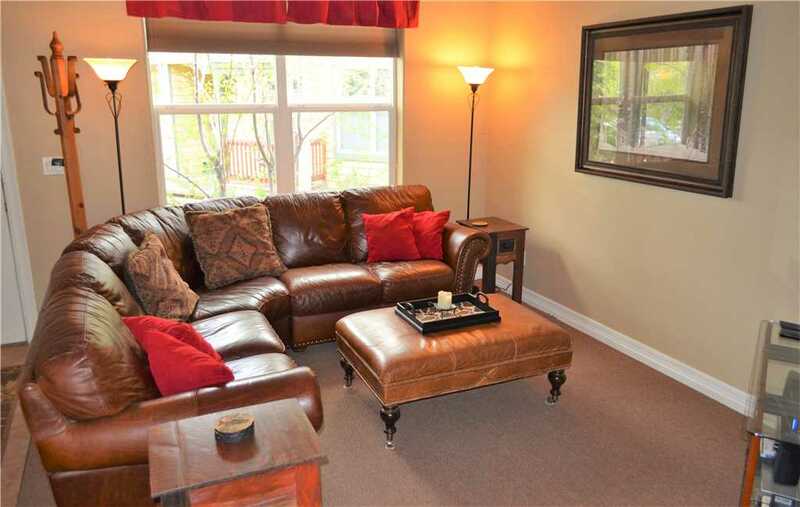 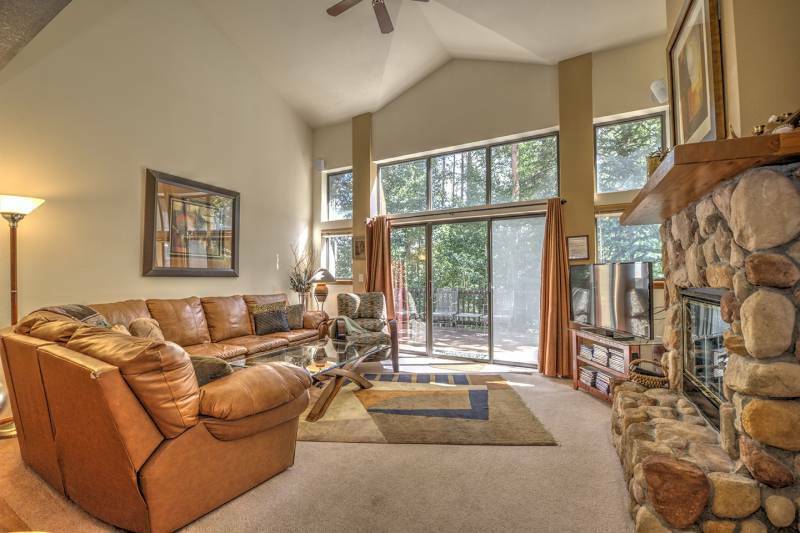 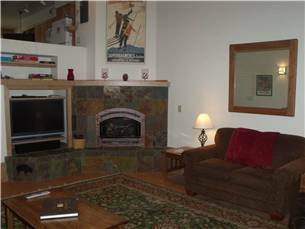 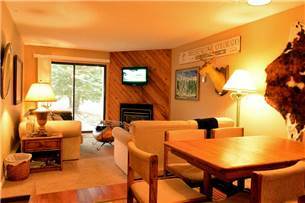 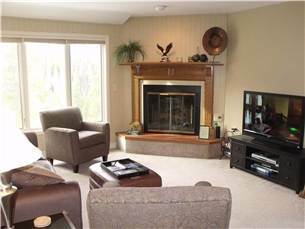 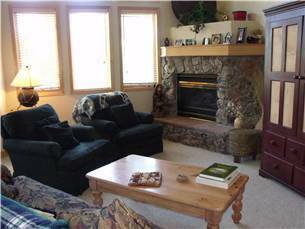 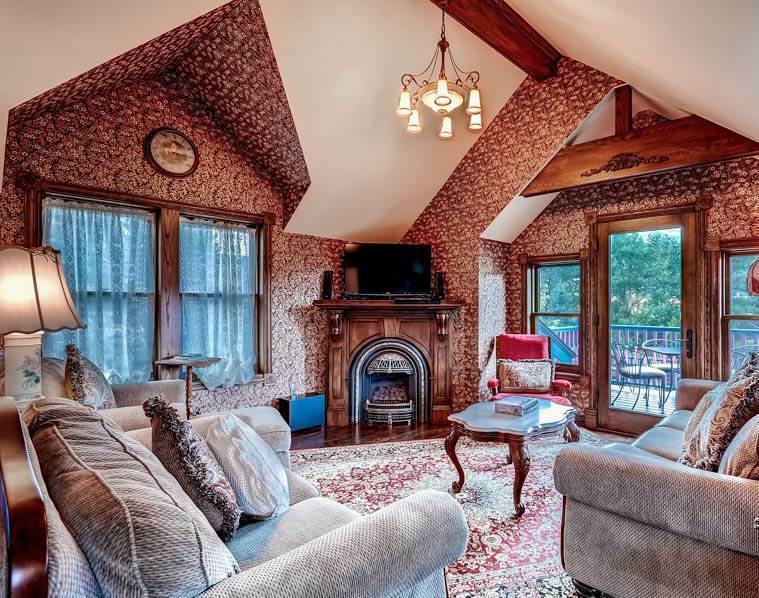 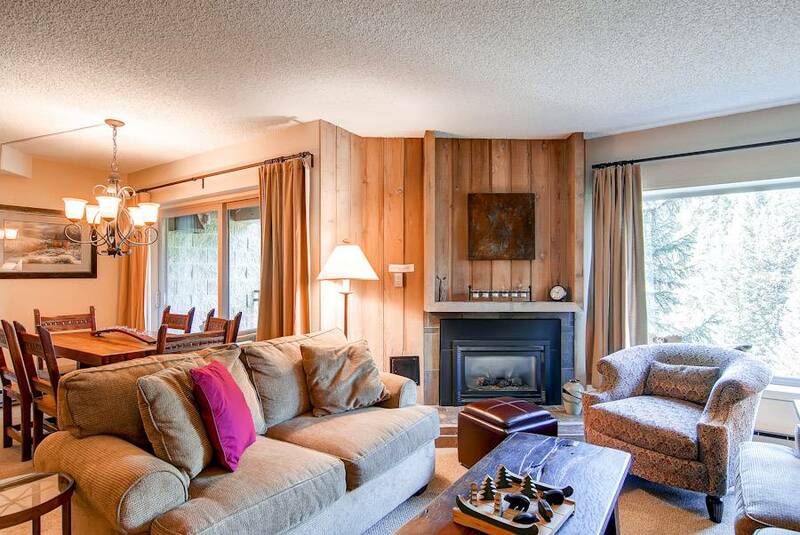 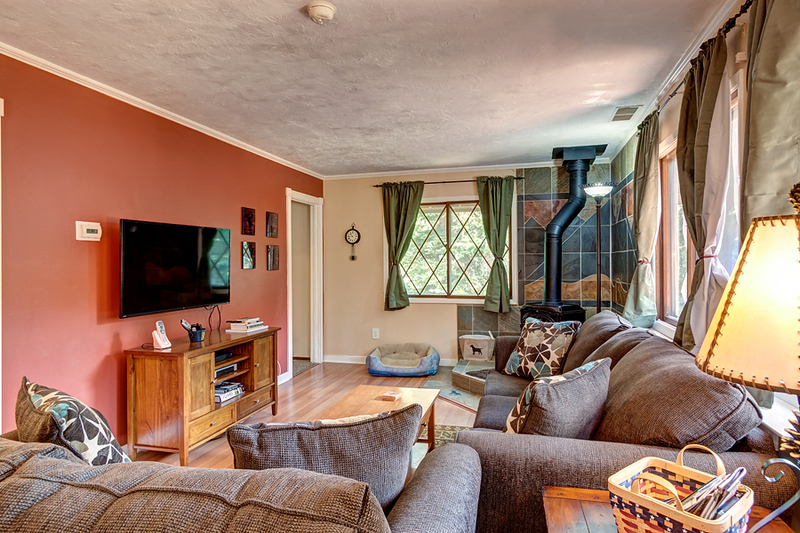 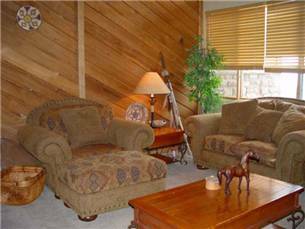 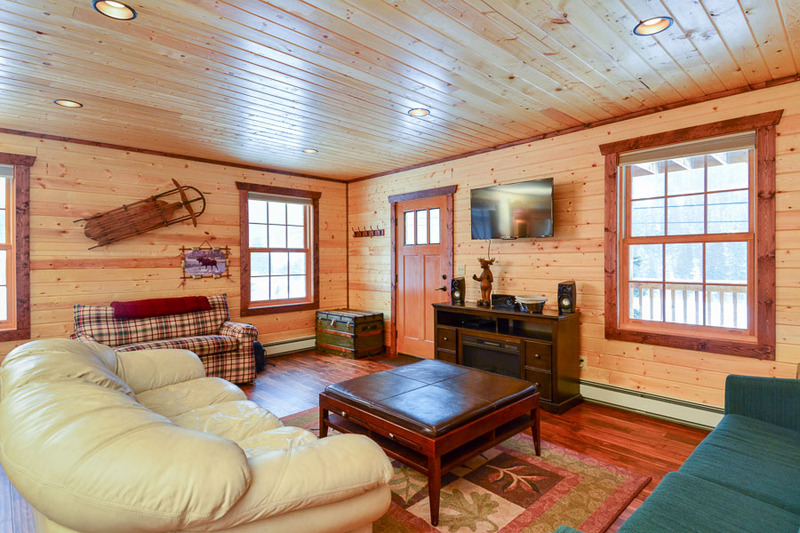 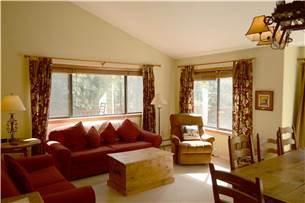 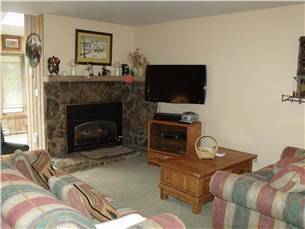 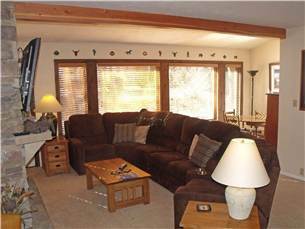 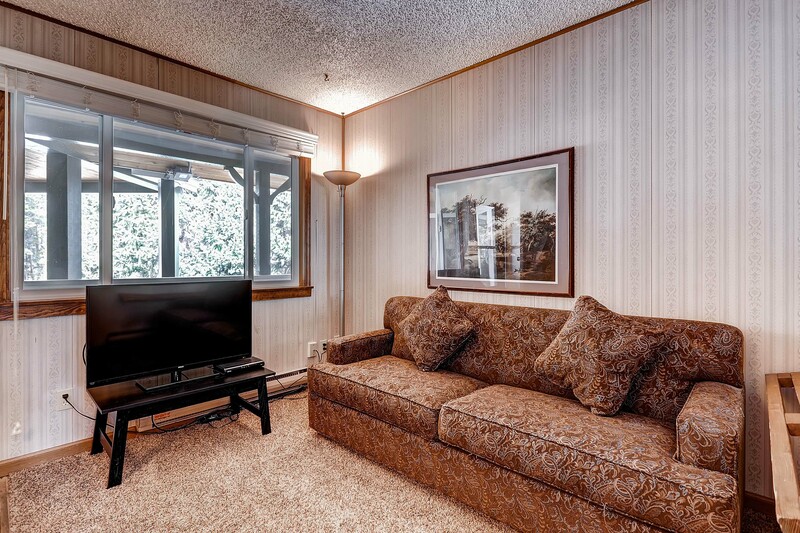 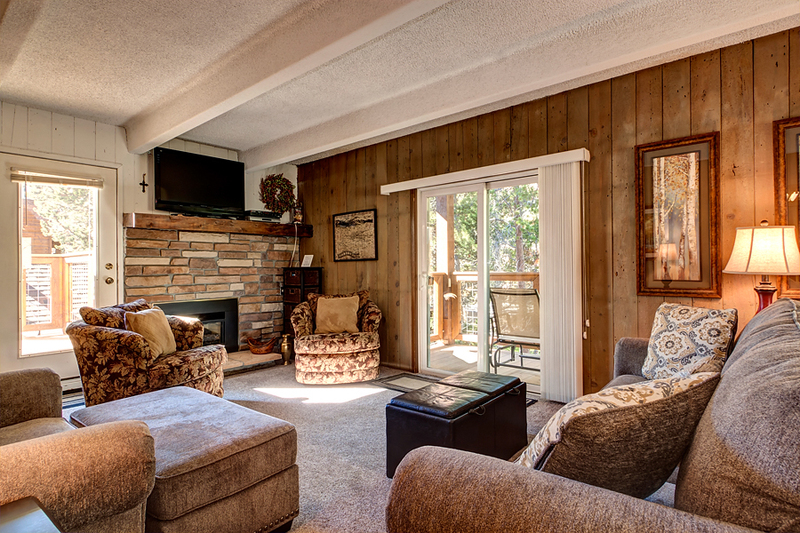 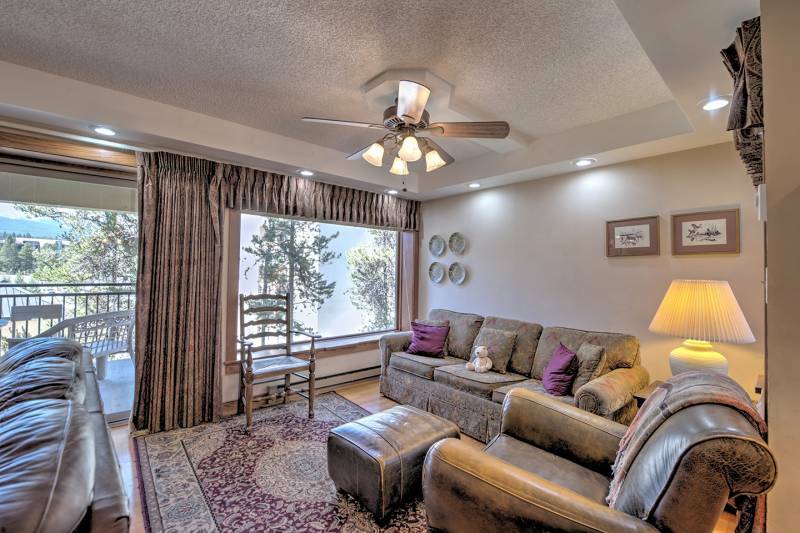 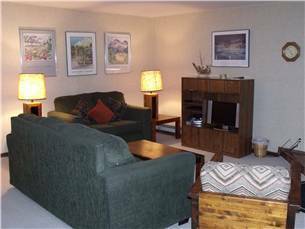 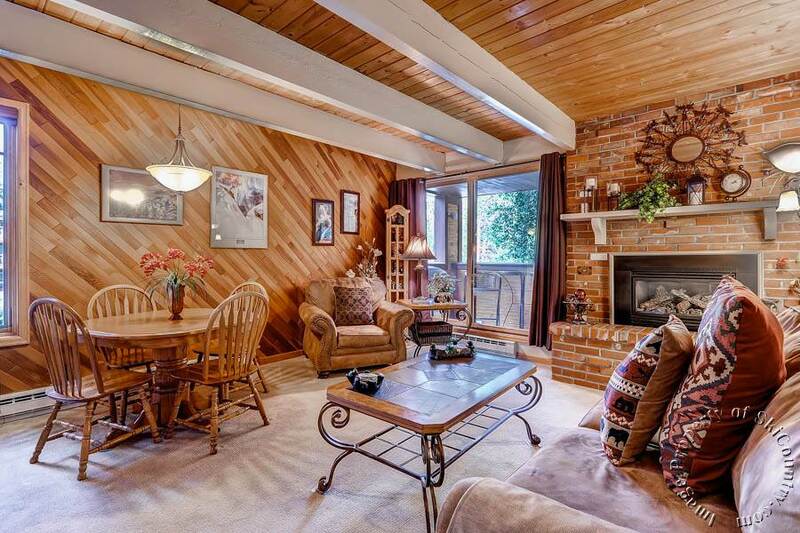 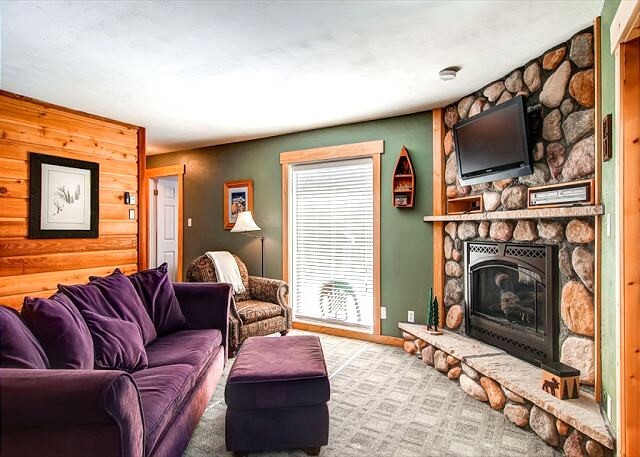 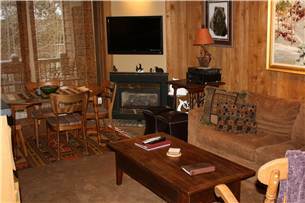 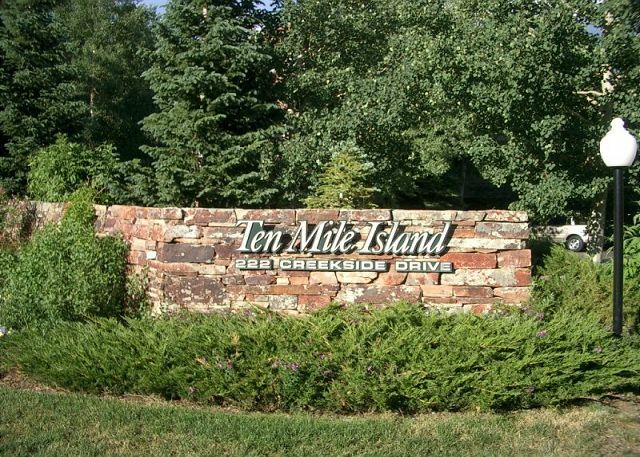 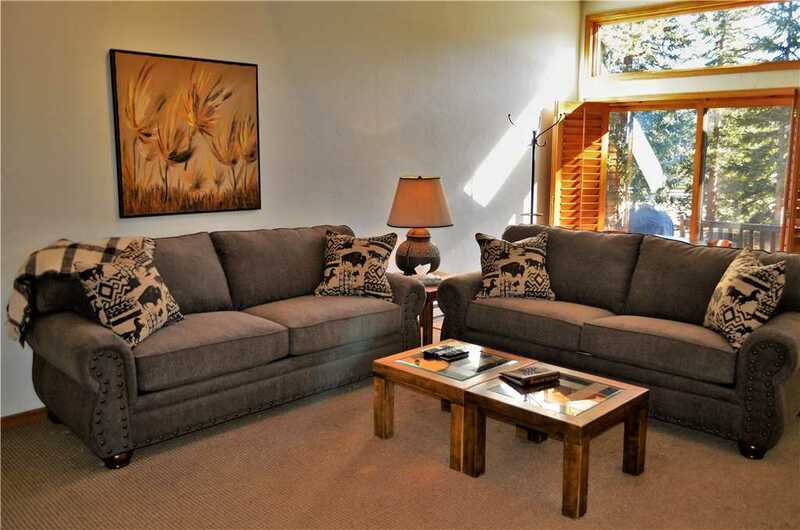 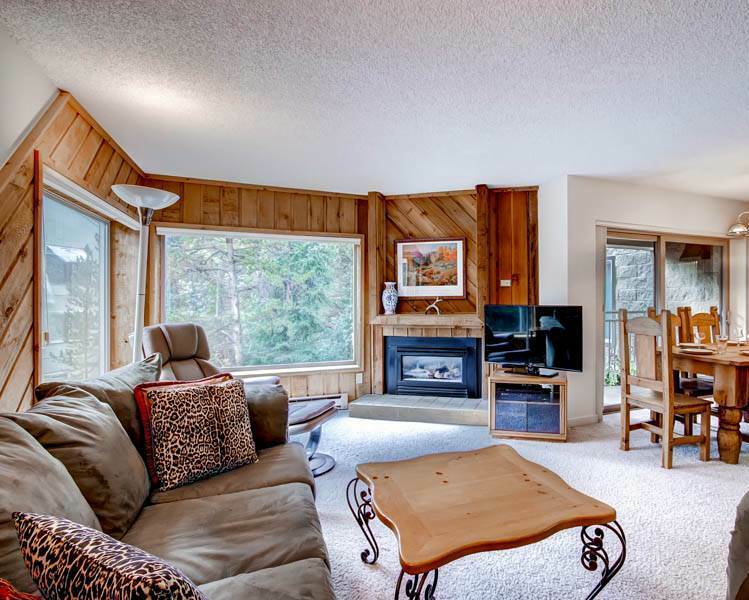 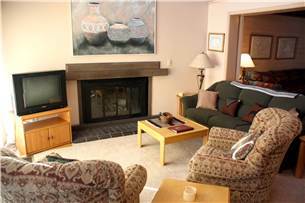 Enjoy the view of the wooded creek area through the two large living room windows or watch a movie on the 22″ flat screen TV with cable/DVD. 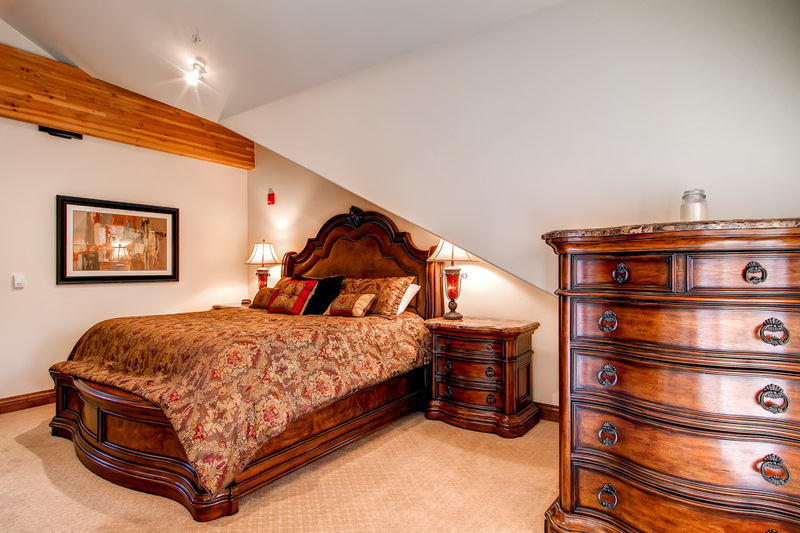 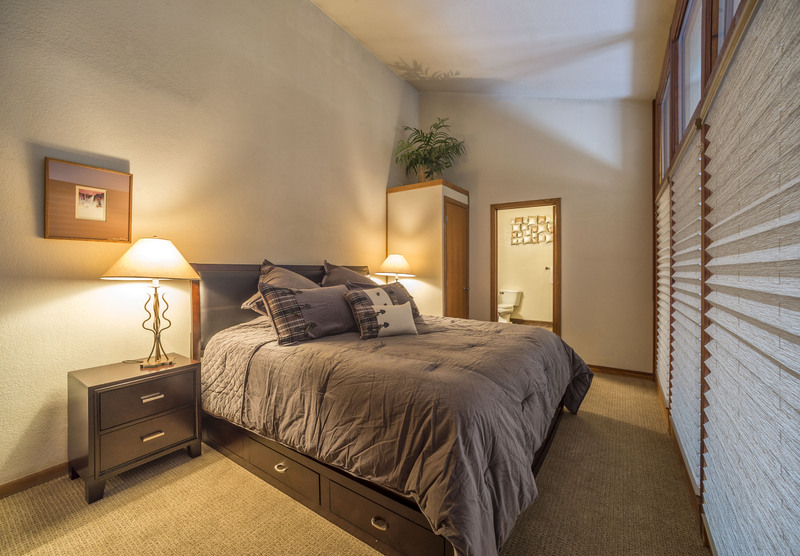 In the bedroom you’ll find a full-size dresser and closet for storage needs along with a Queen size pillow top mattress for a peaceful night’s sleep. 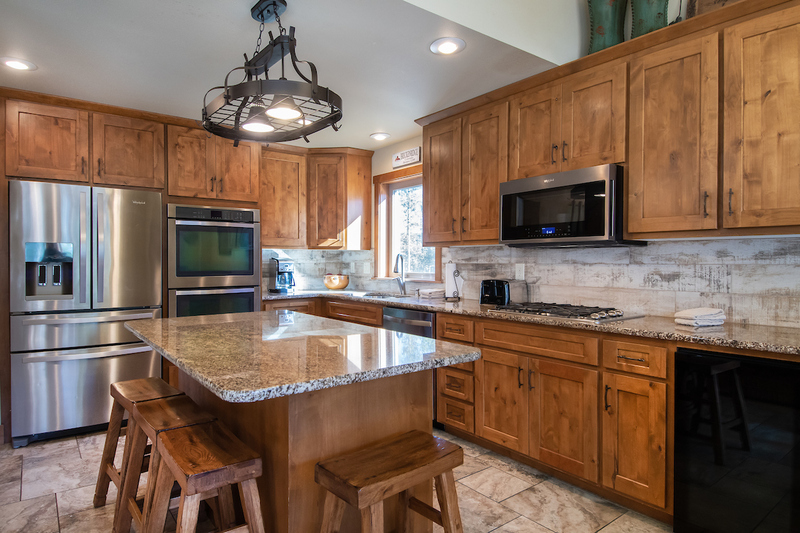 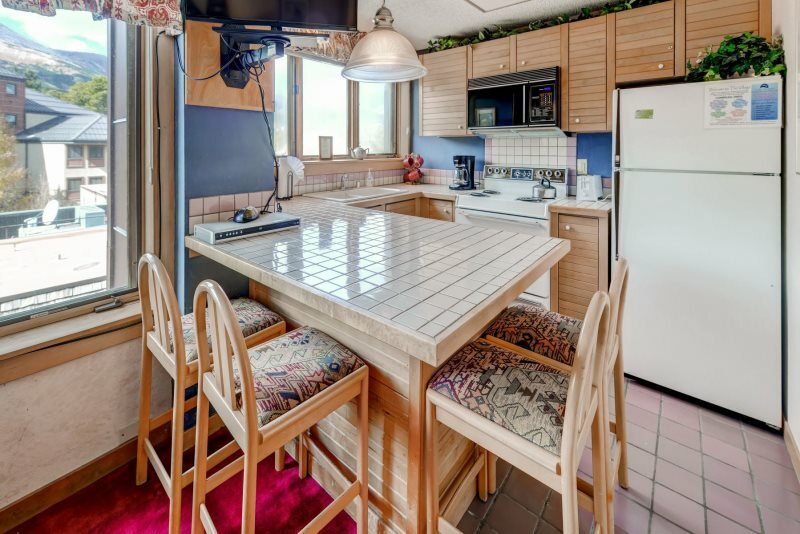 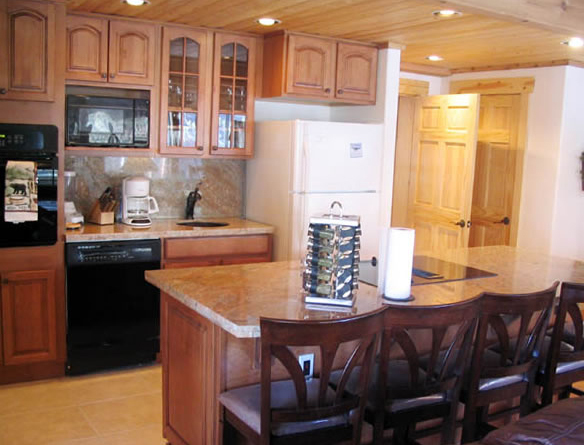 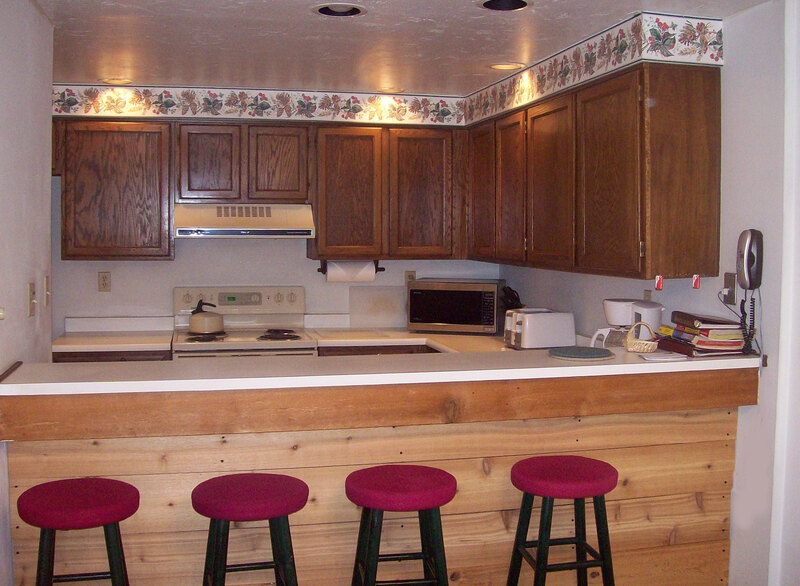 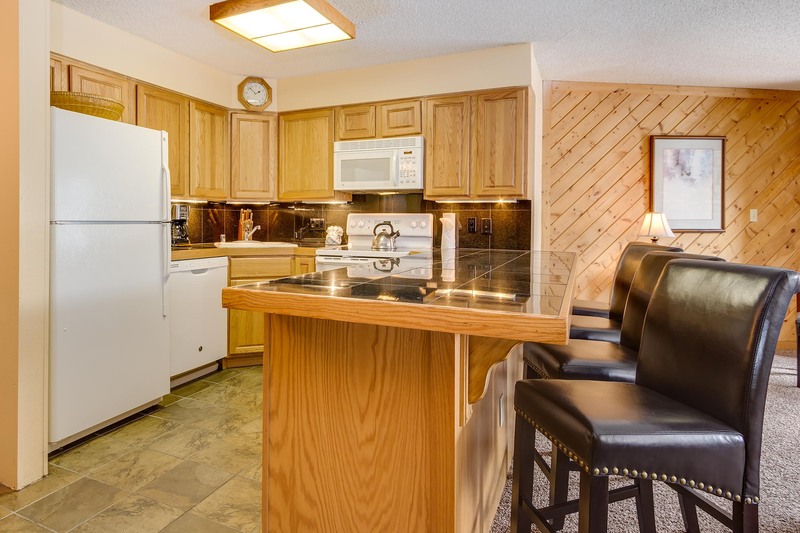 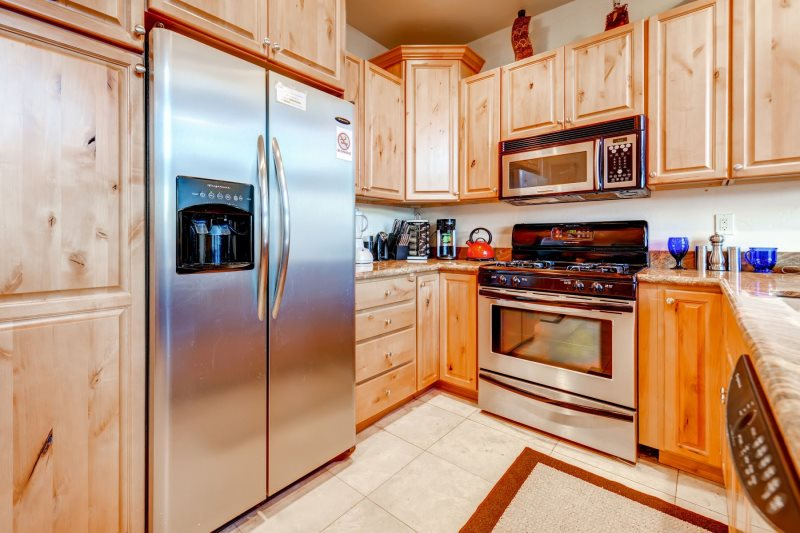 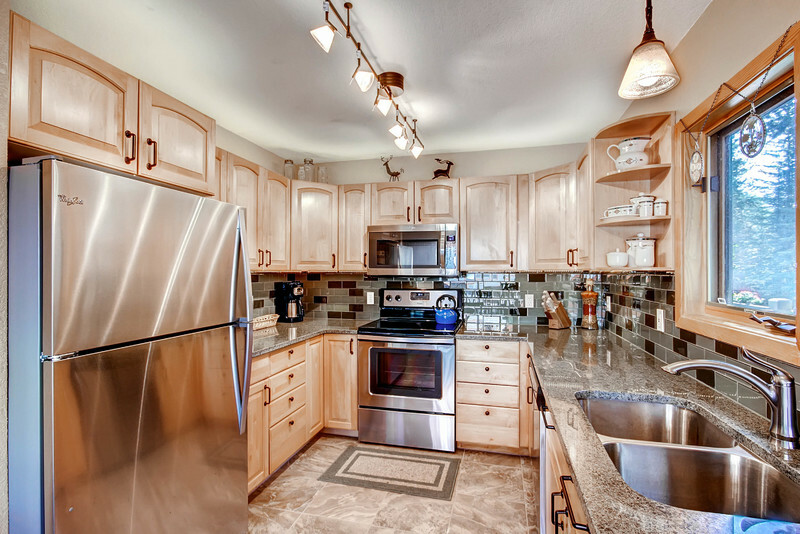 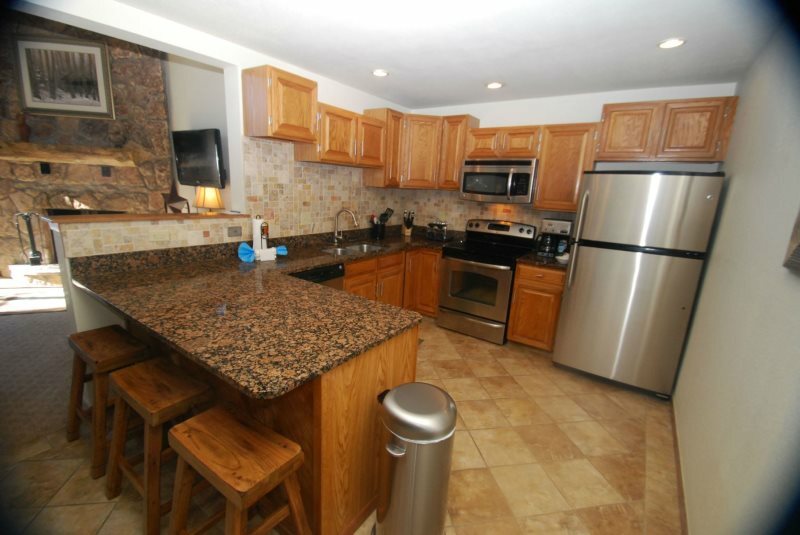 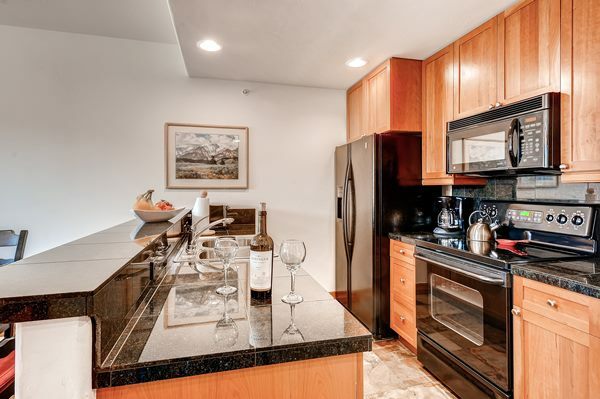 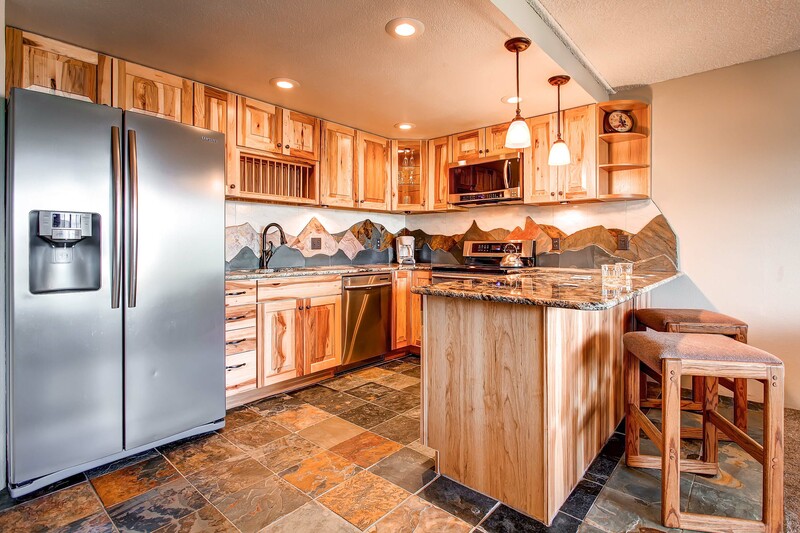 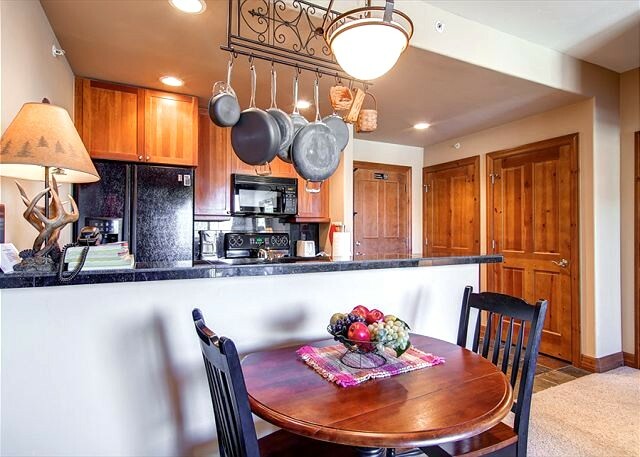 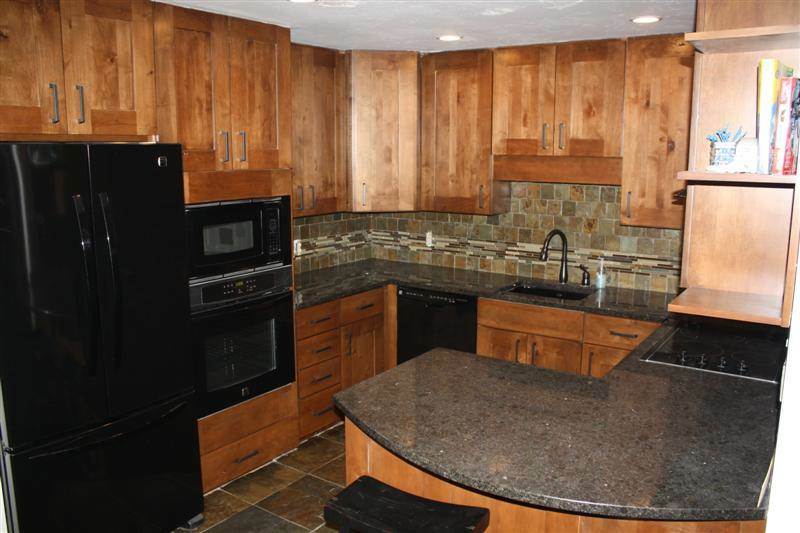 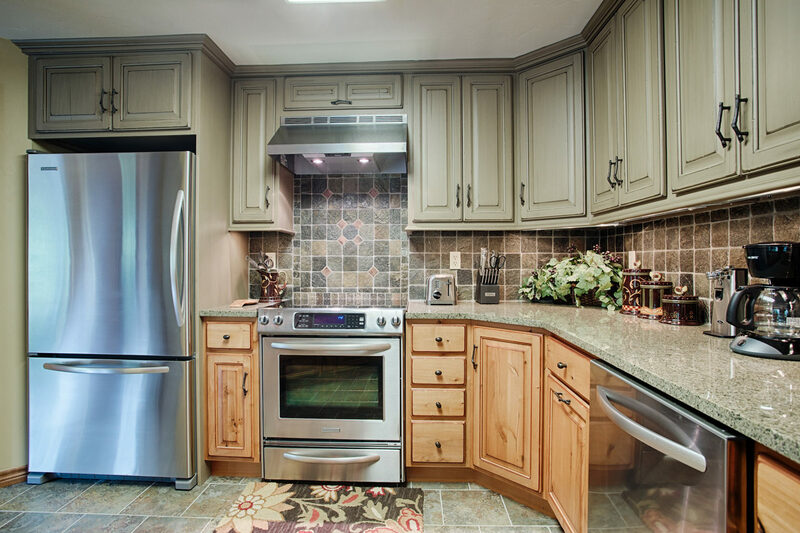 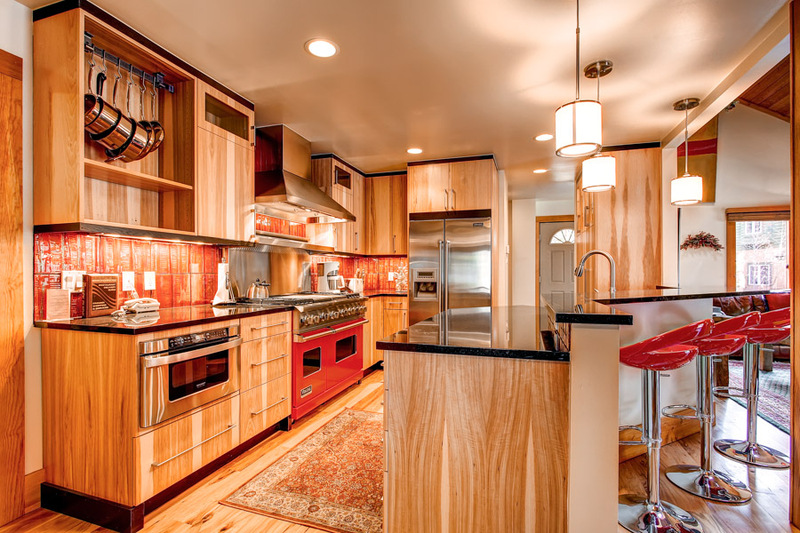 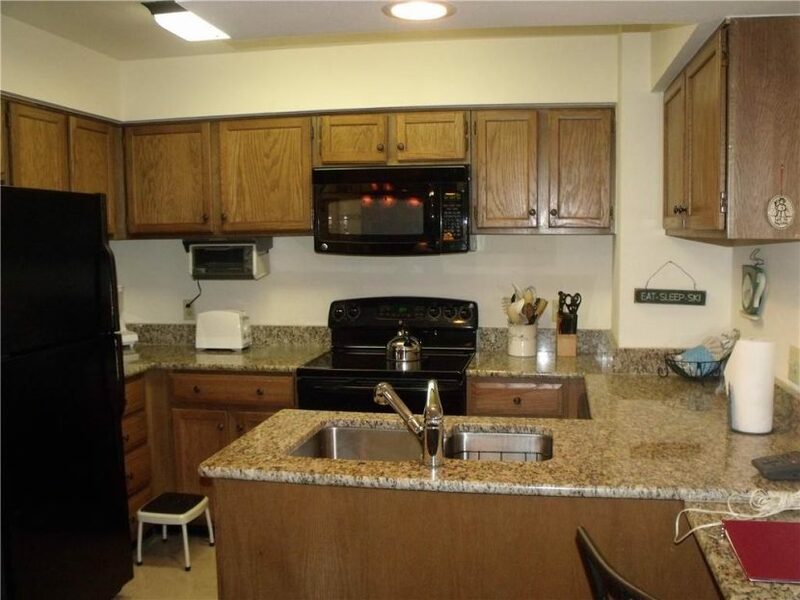 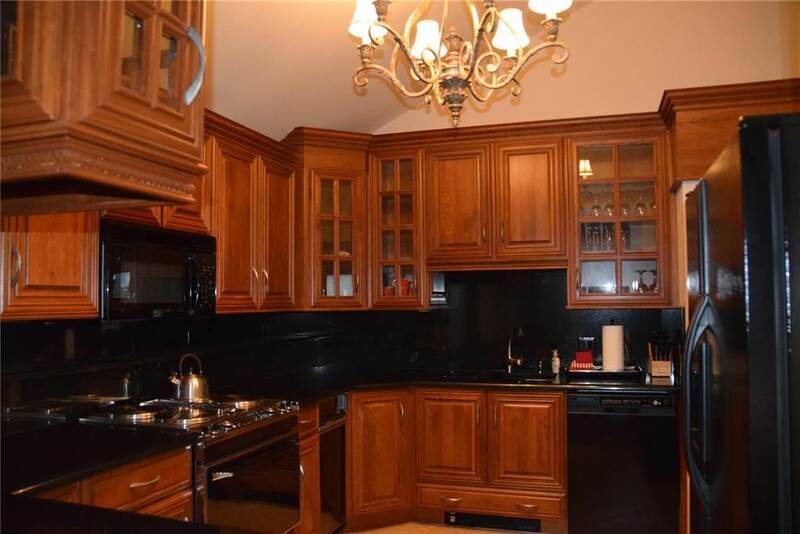 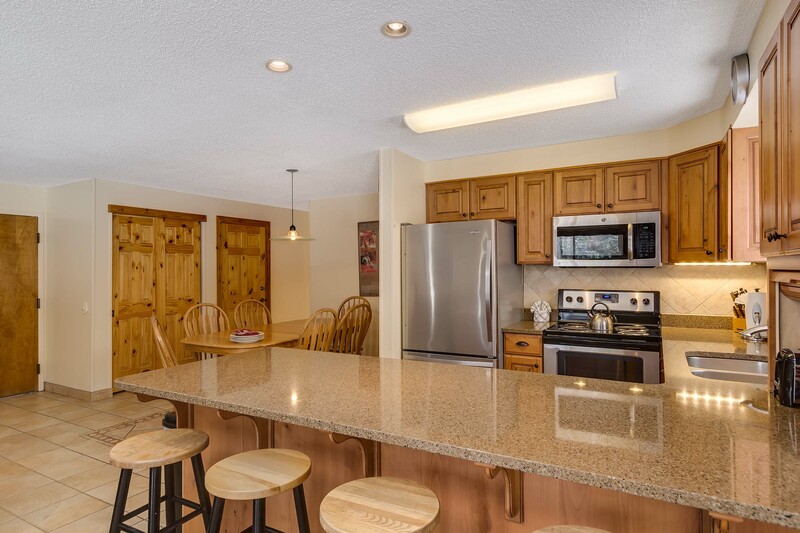 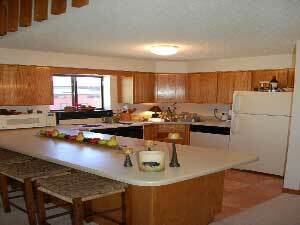 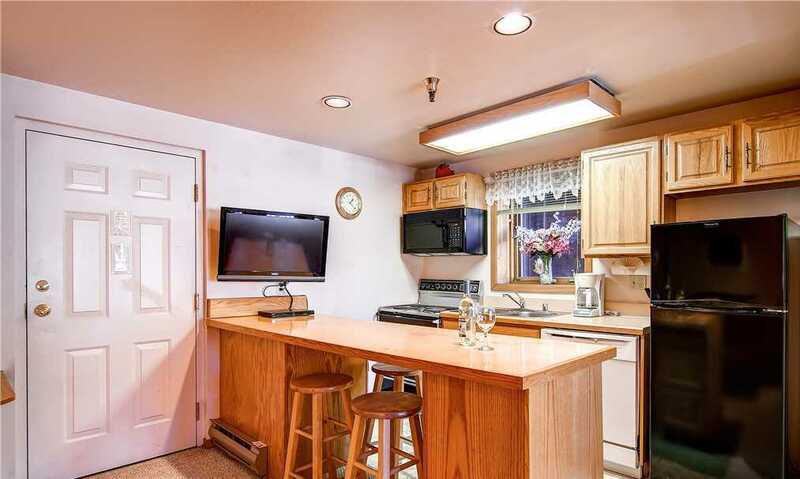 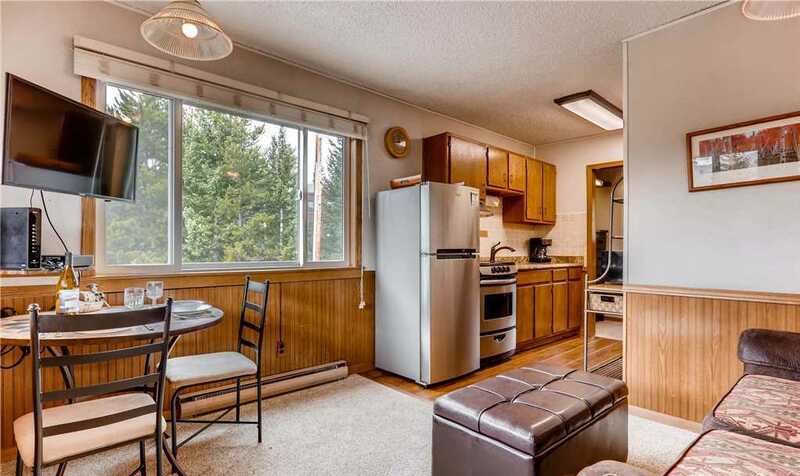 The fully loaded kitchenette updated with a bigger refrigerator is suitably stocked with all necessary cooking and dining utensils, small stove, microwave, toaster and coffee maker. 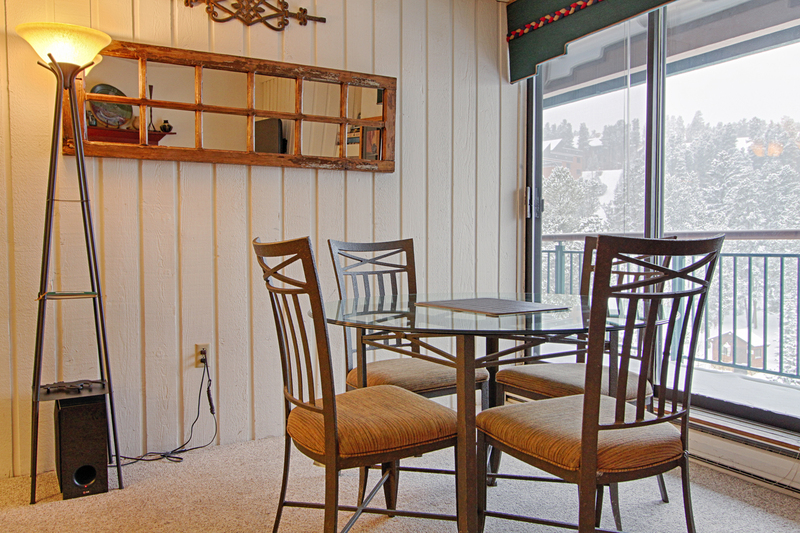 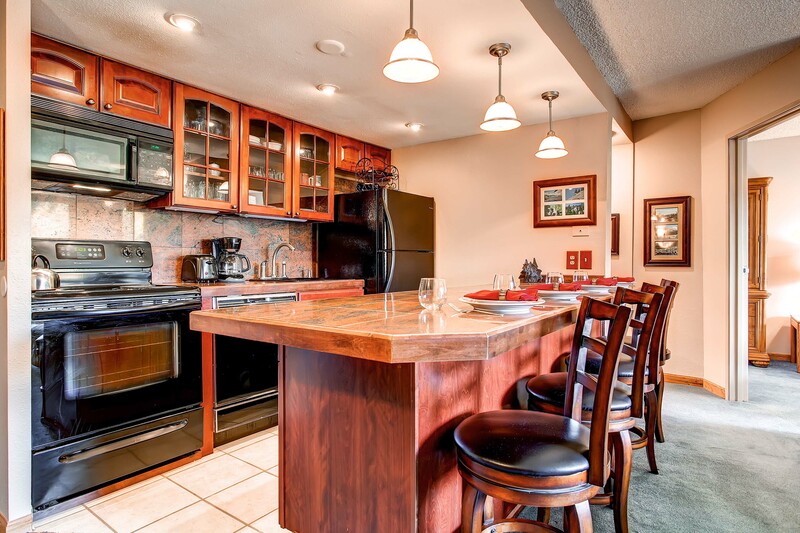 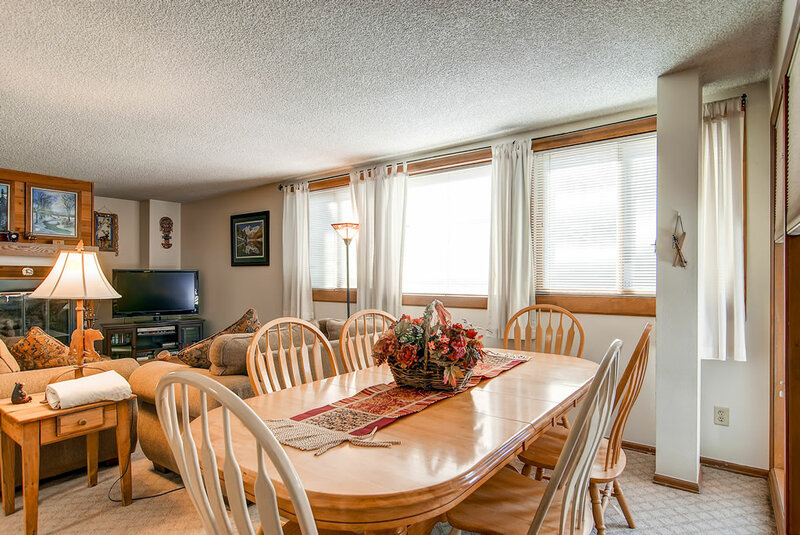 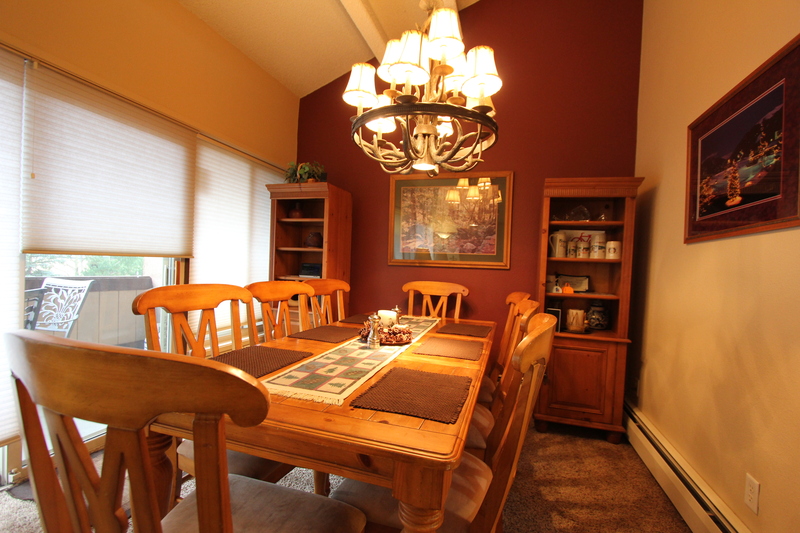 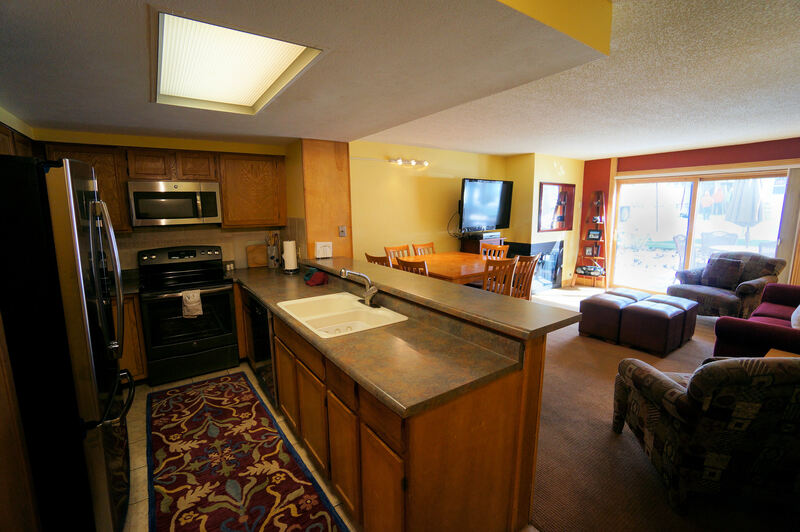 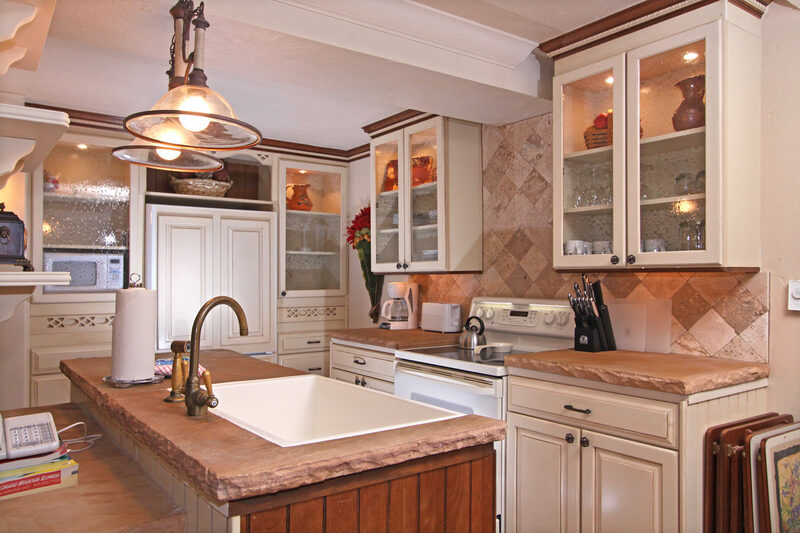 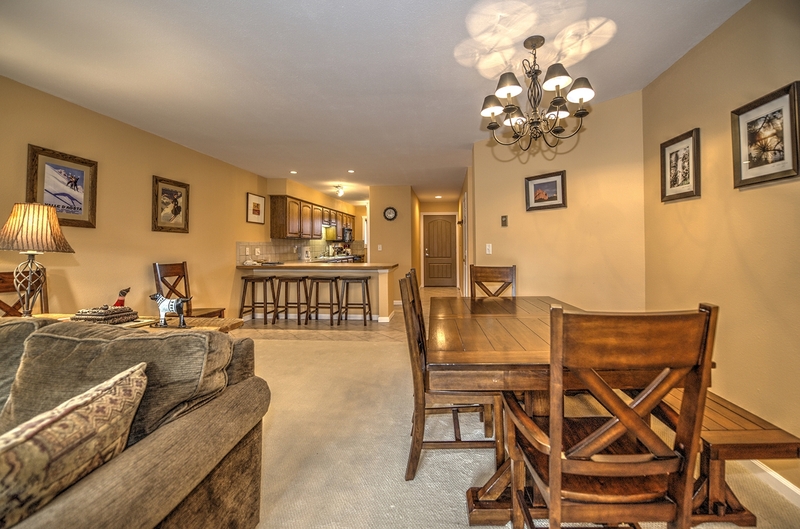 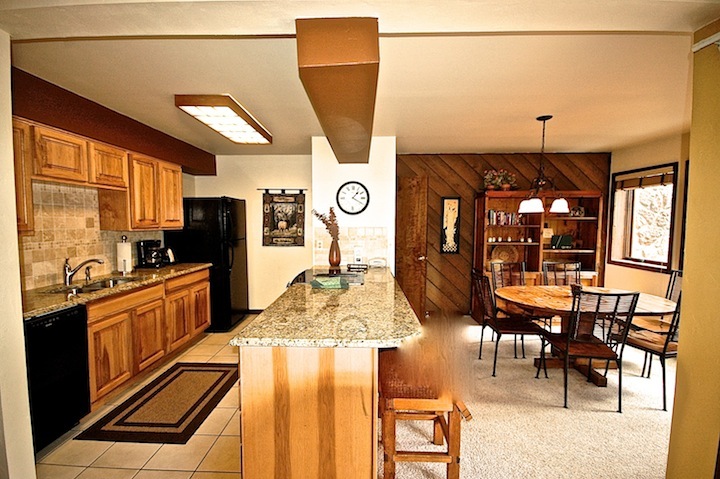 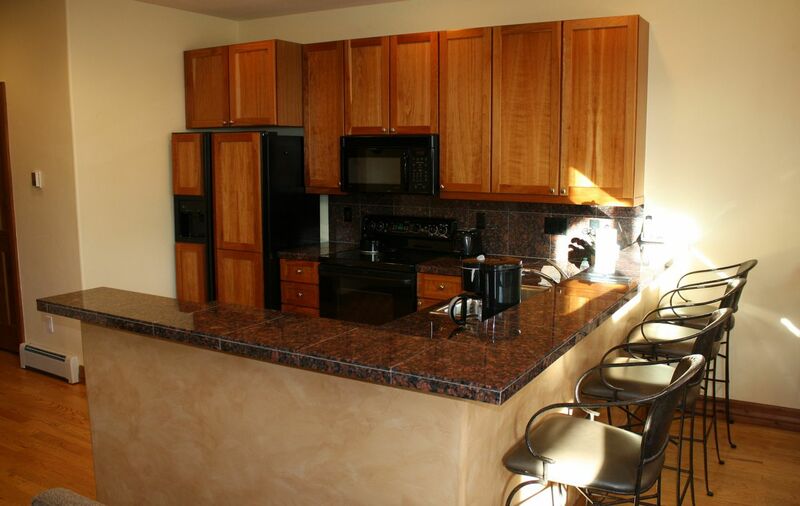 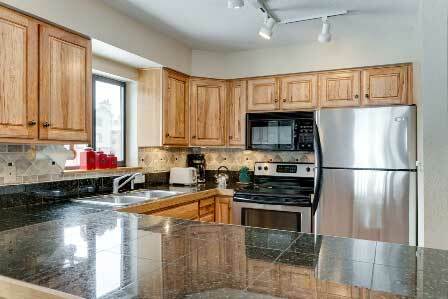 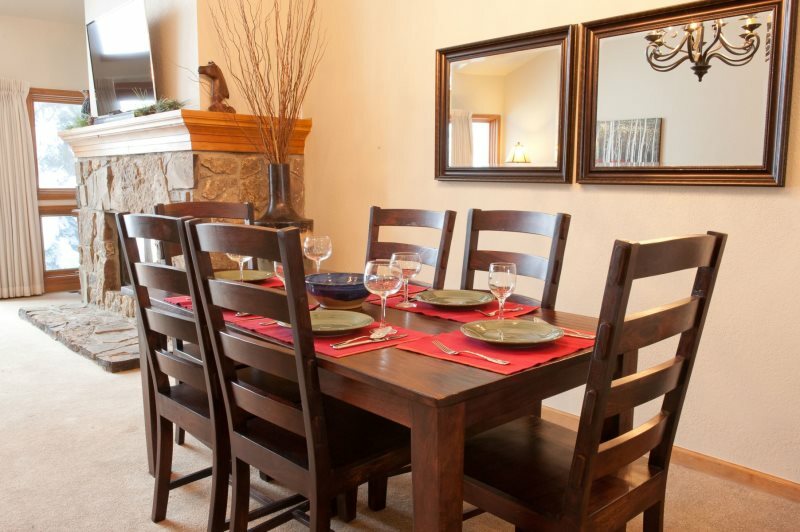 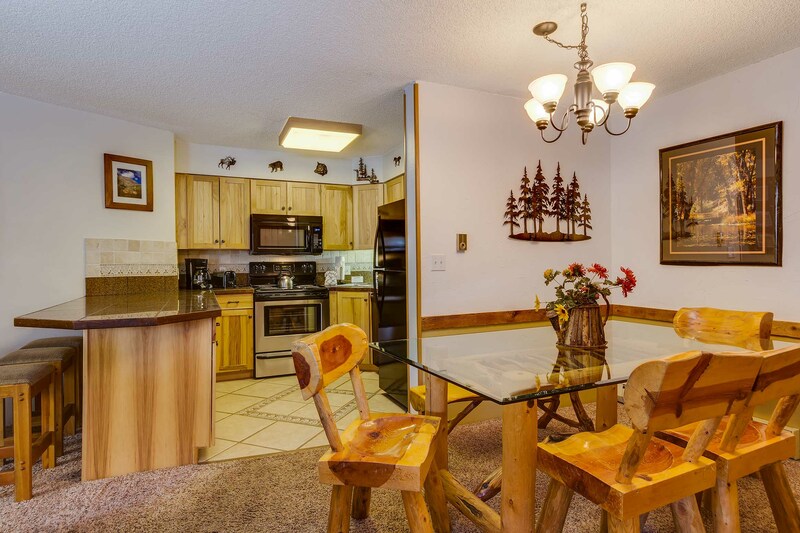 Settle in to your table for two and enjoy a meal cooked right from the comfort of your unit. 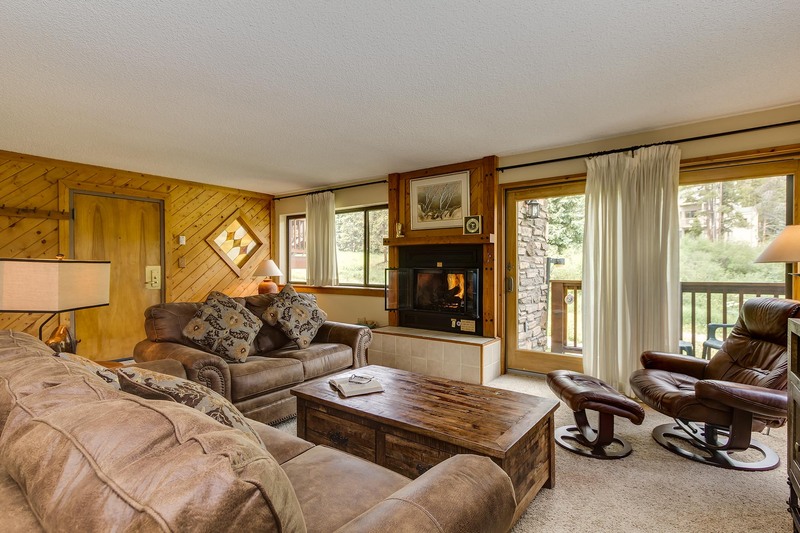 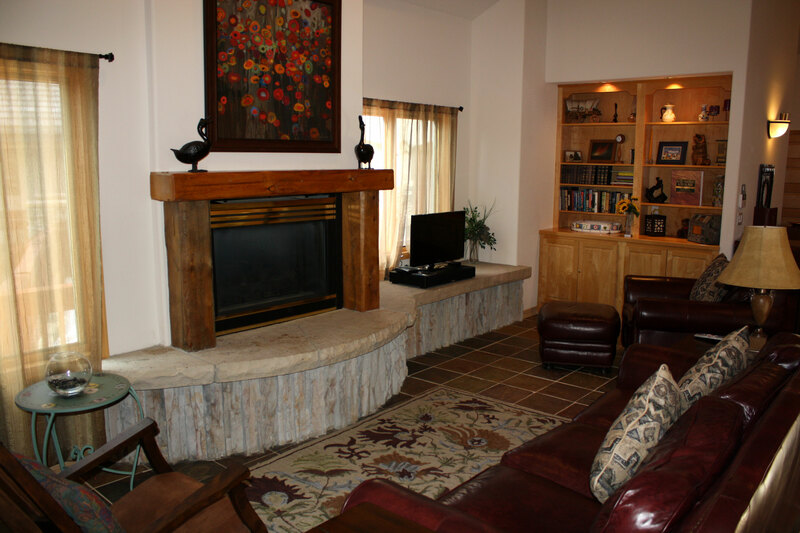 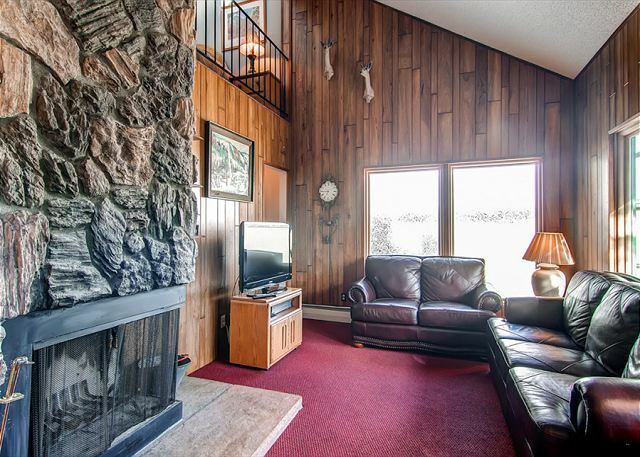 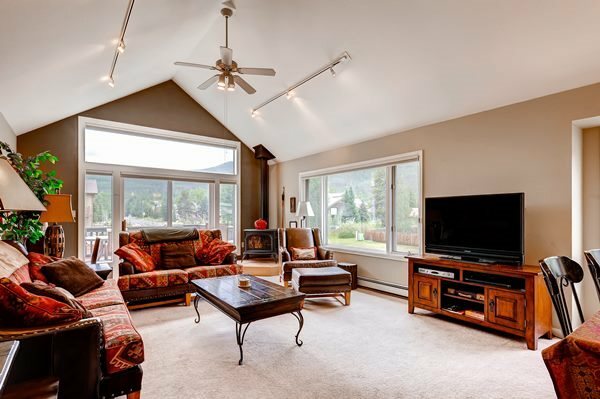 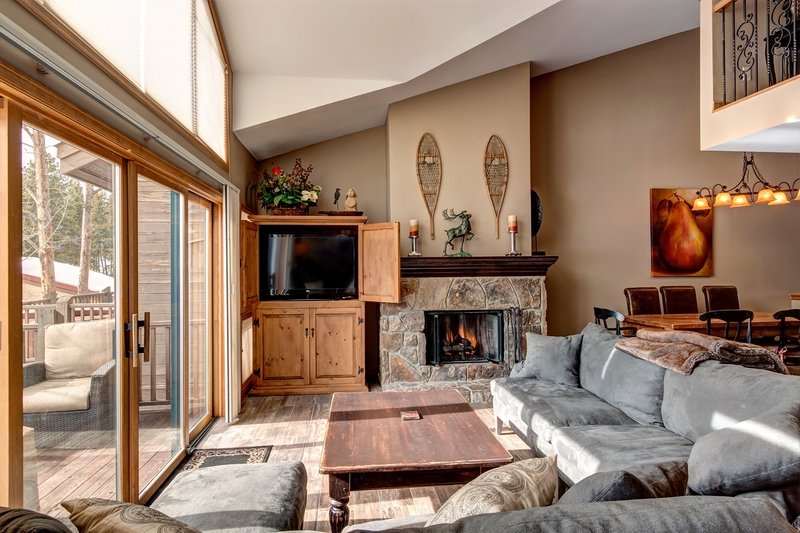 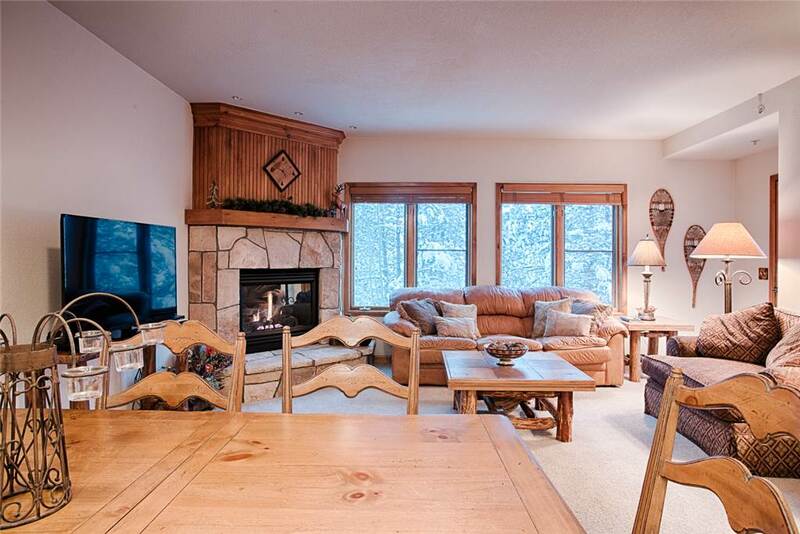 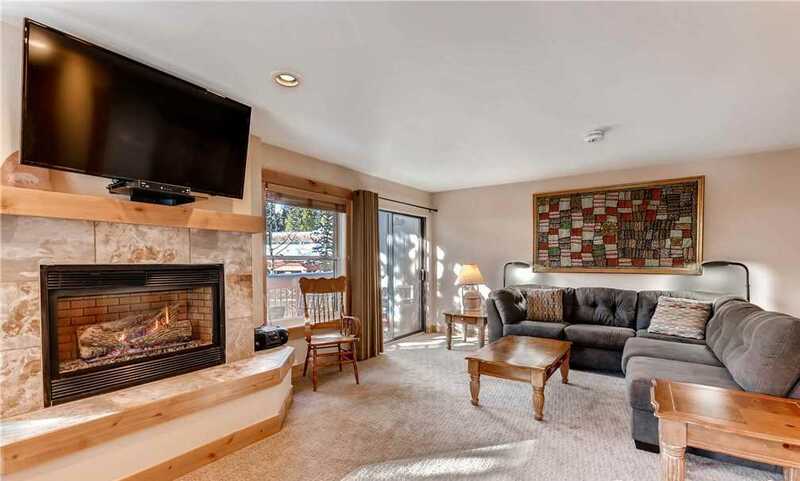 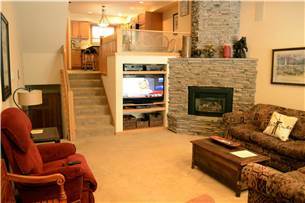 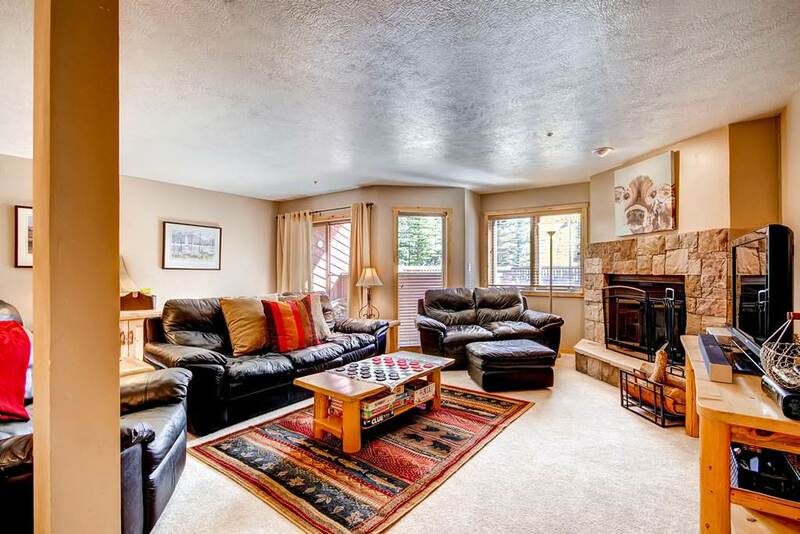 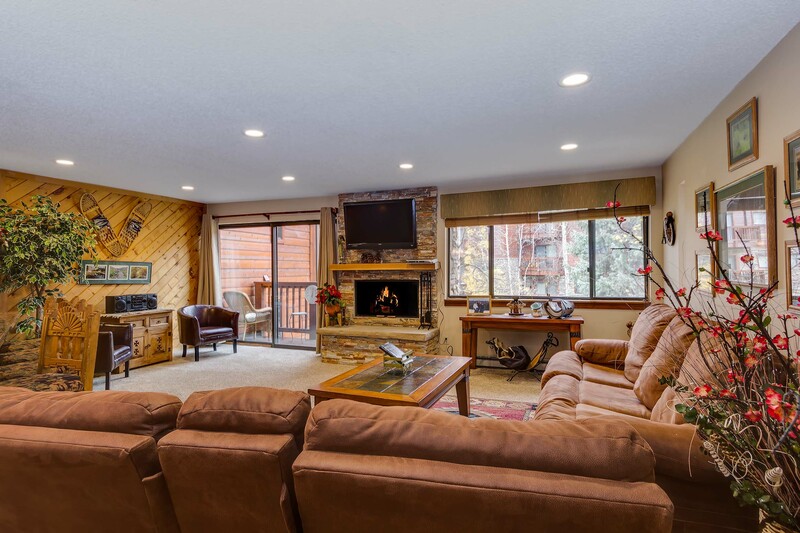 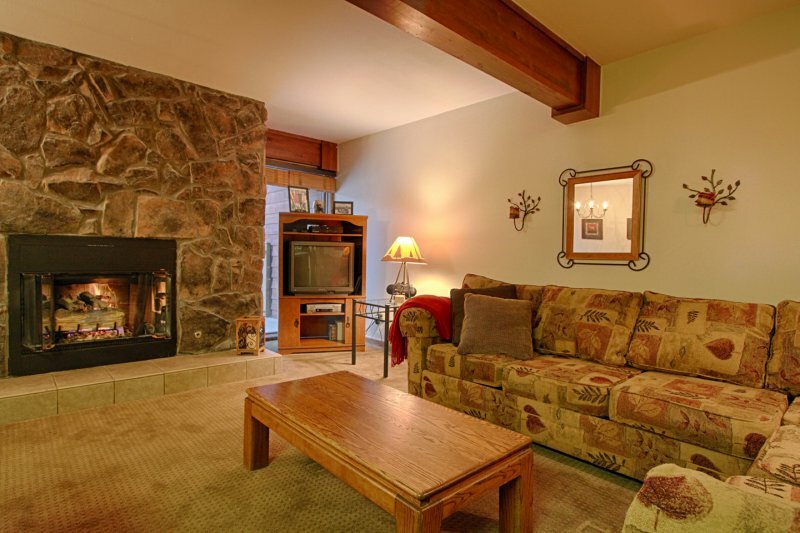 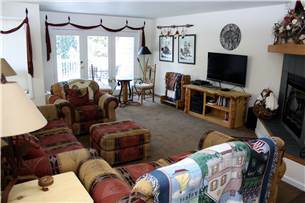 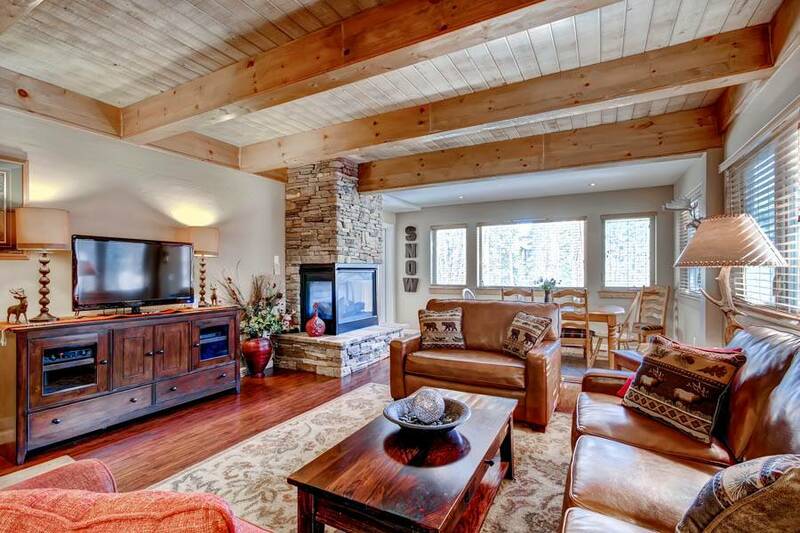 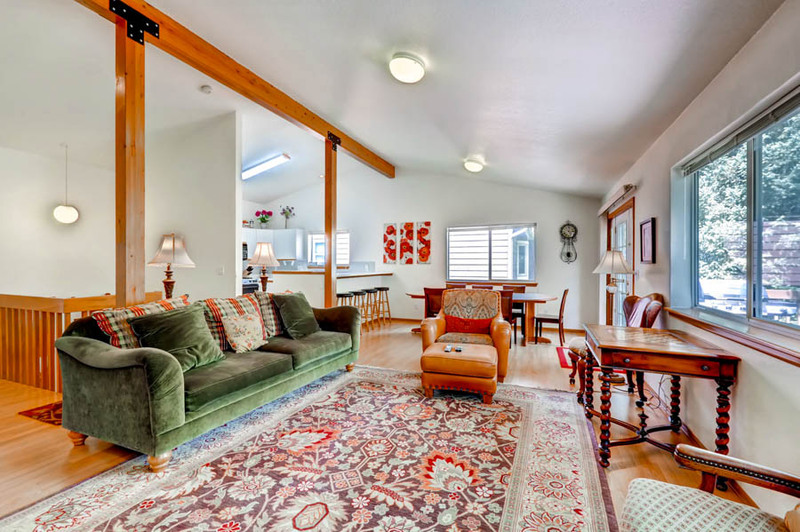 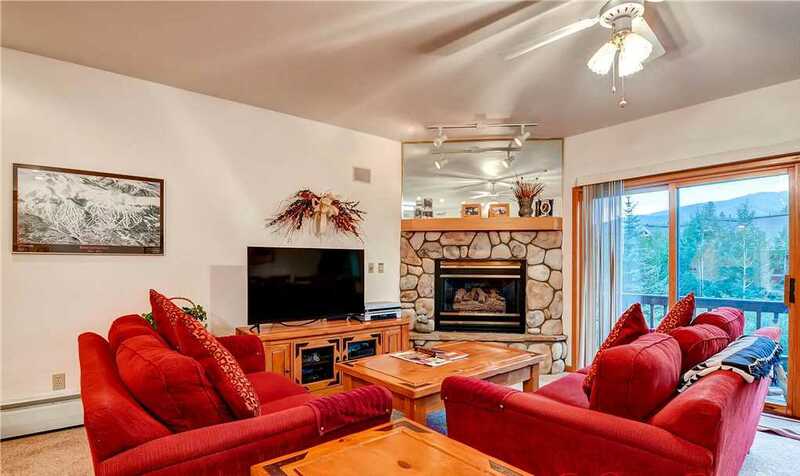 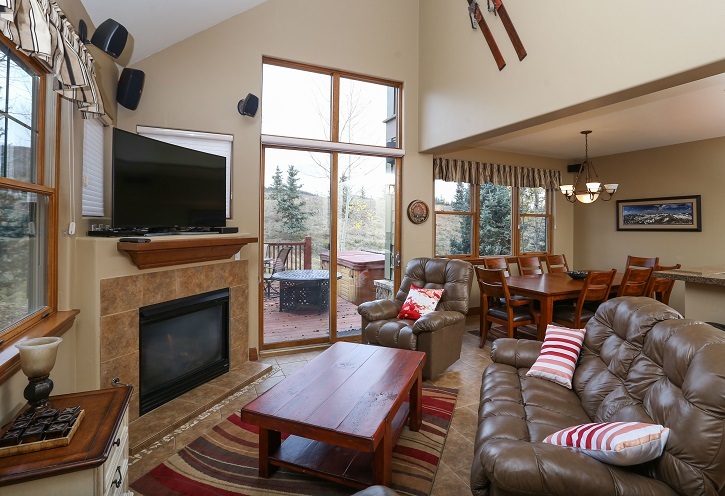 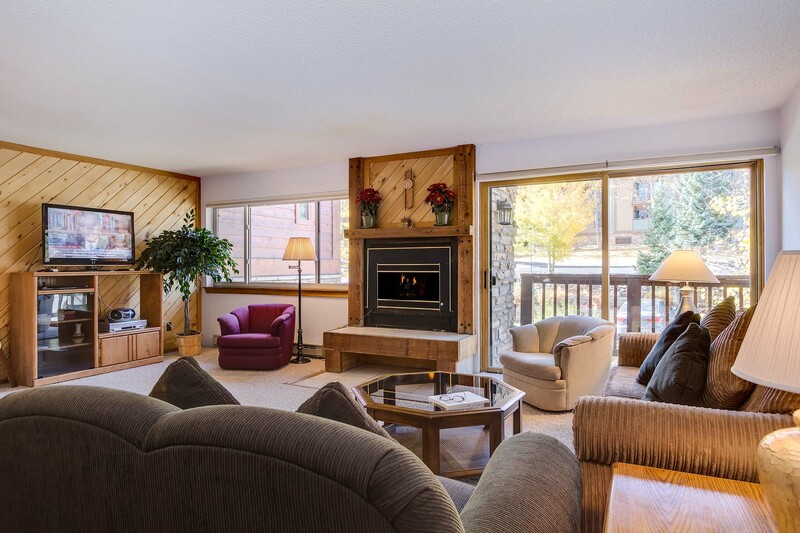 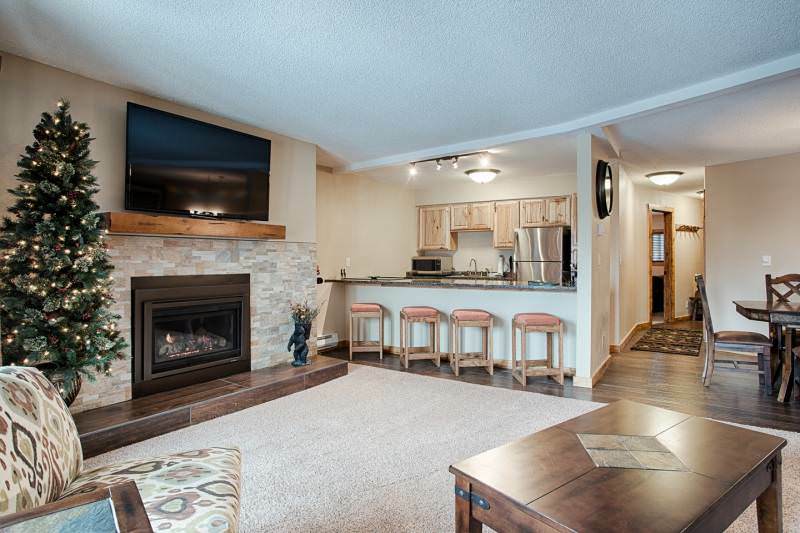 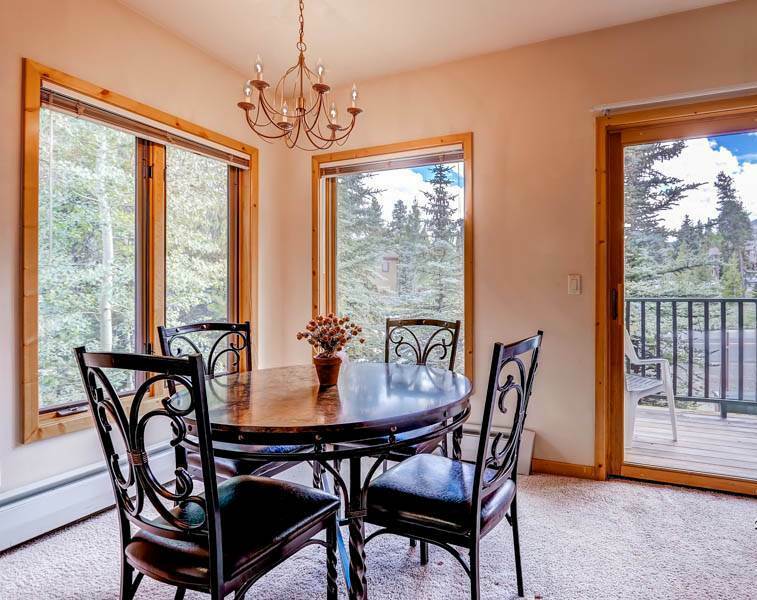 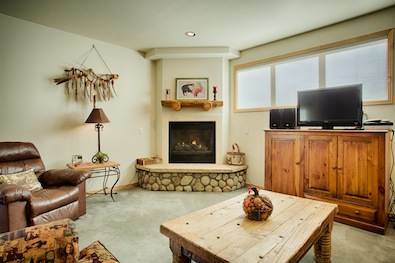 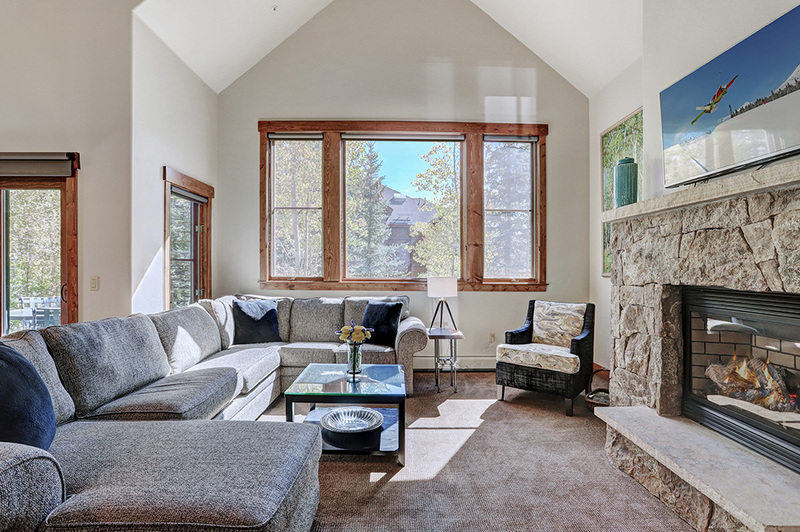 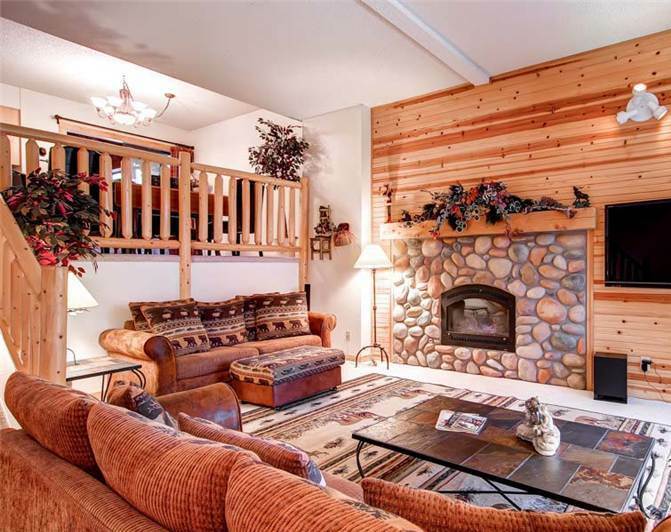 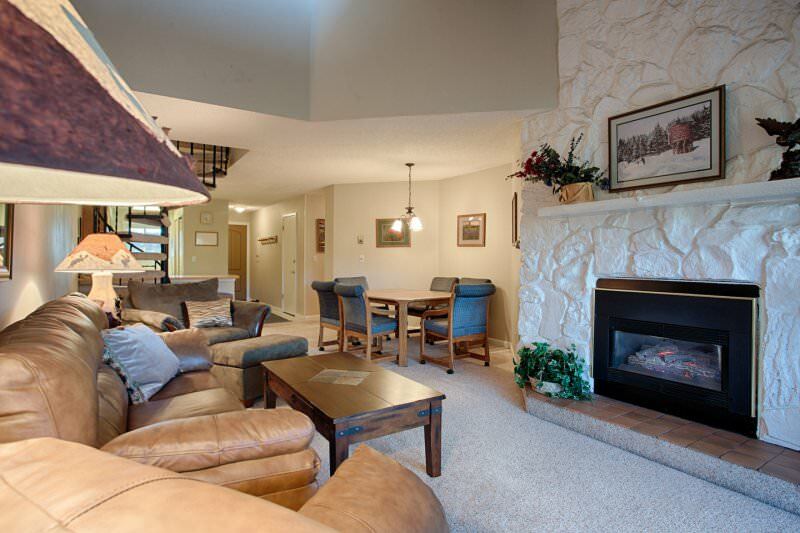 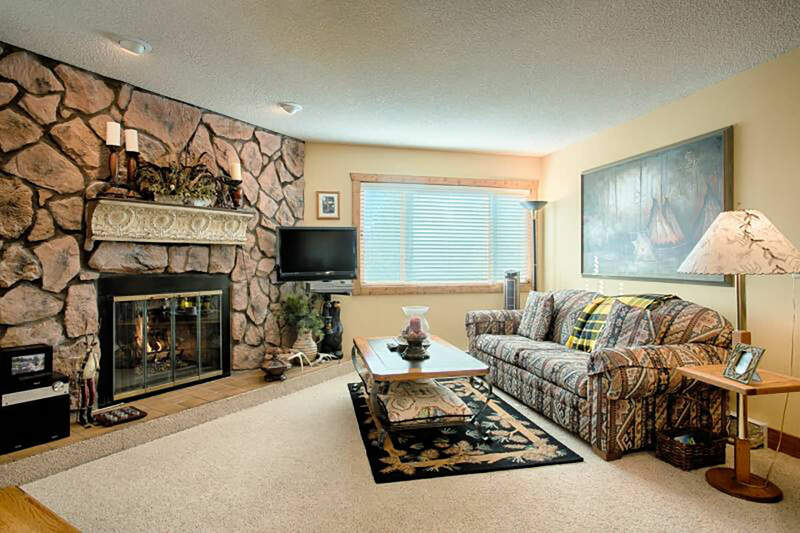 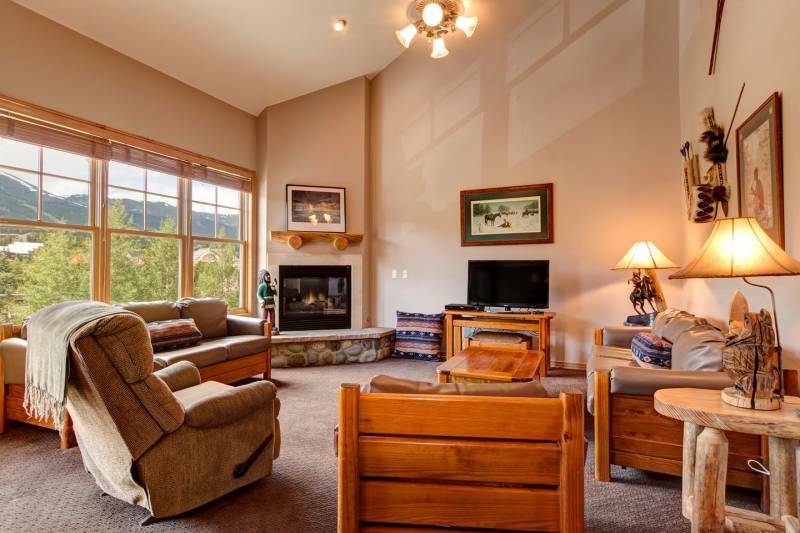 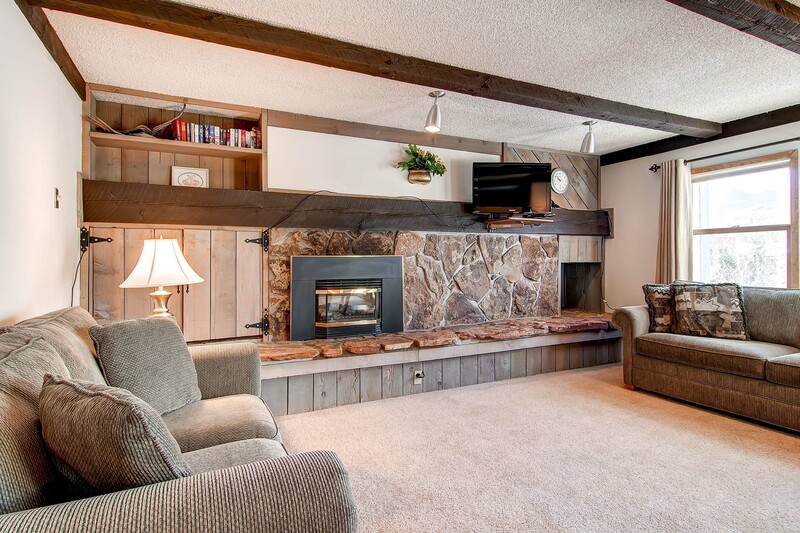 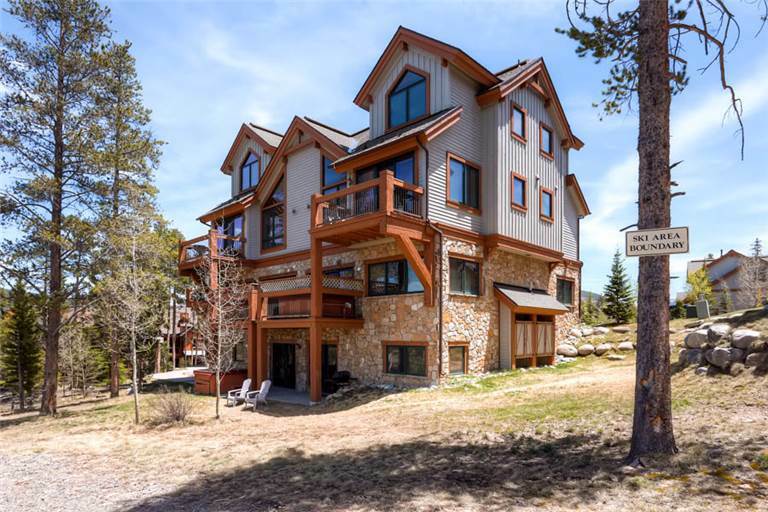 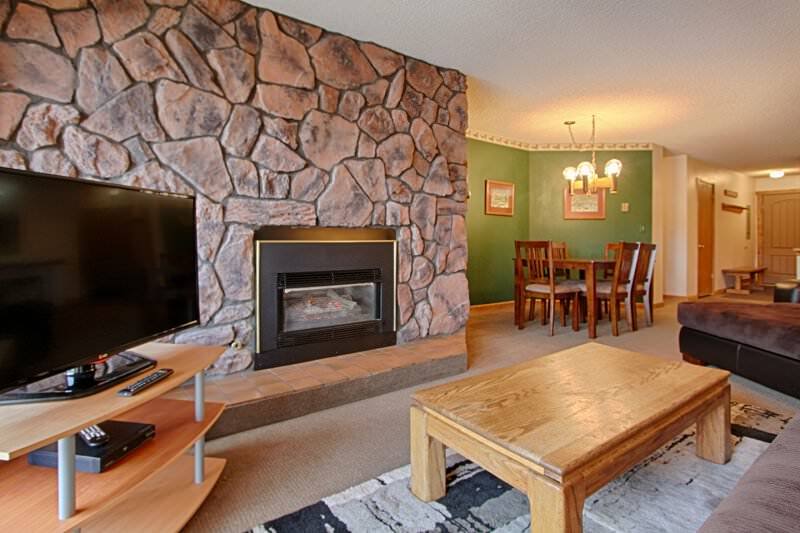 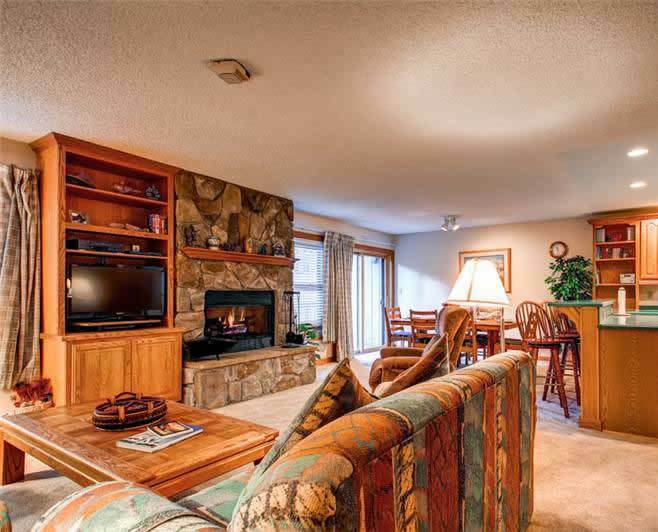 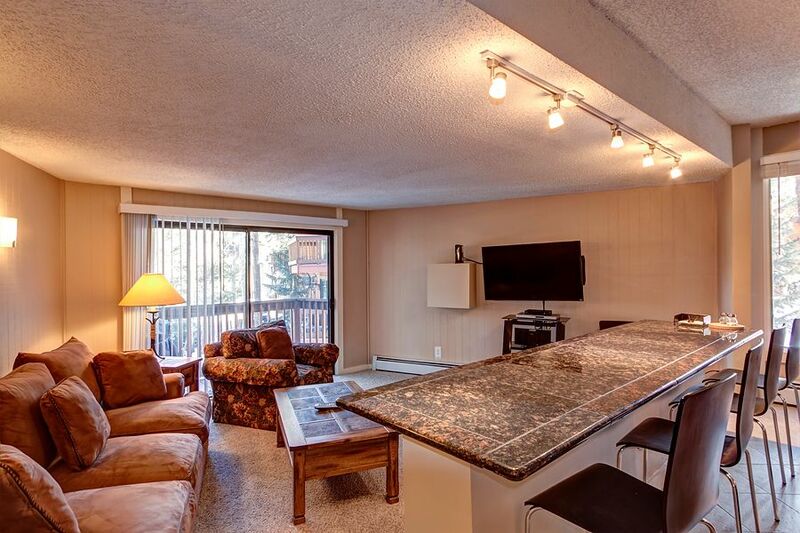 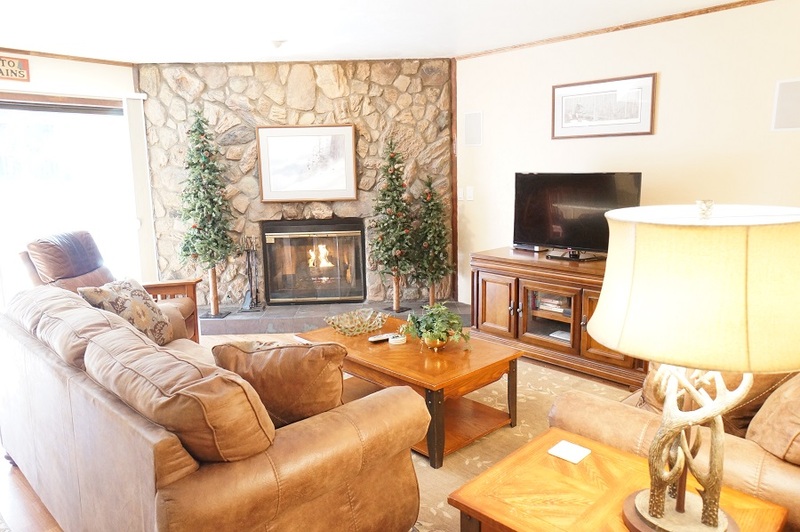 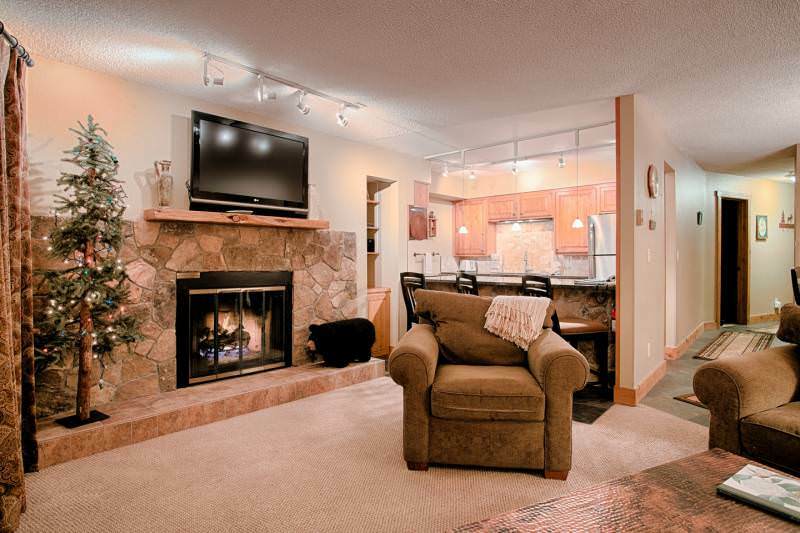 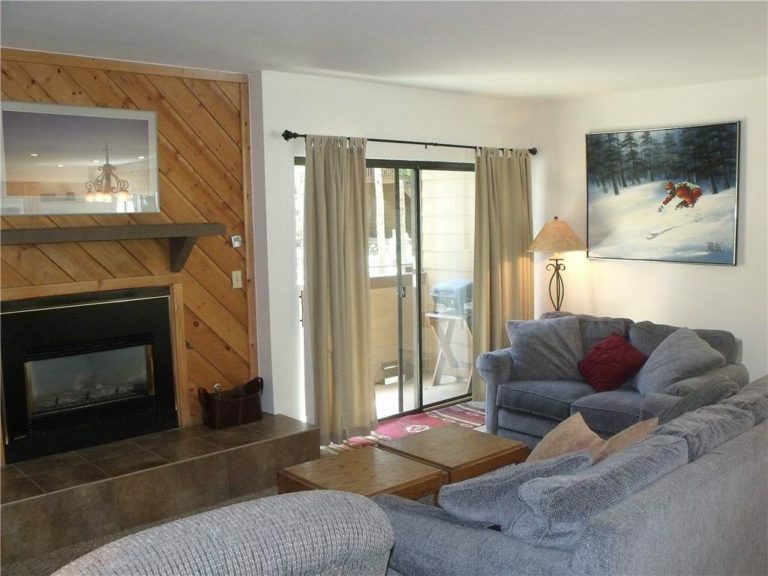 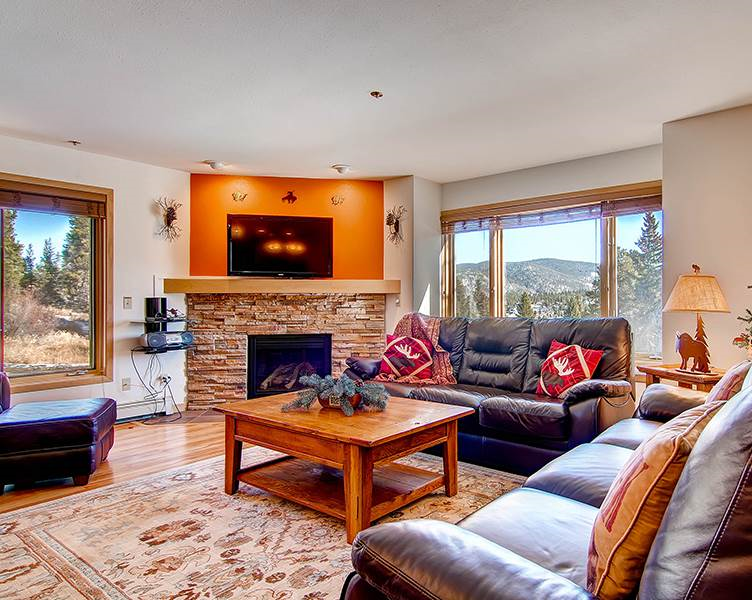 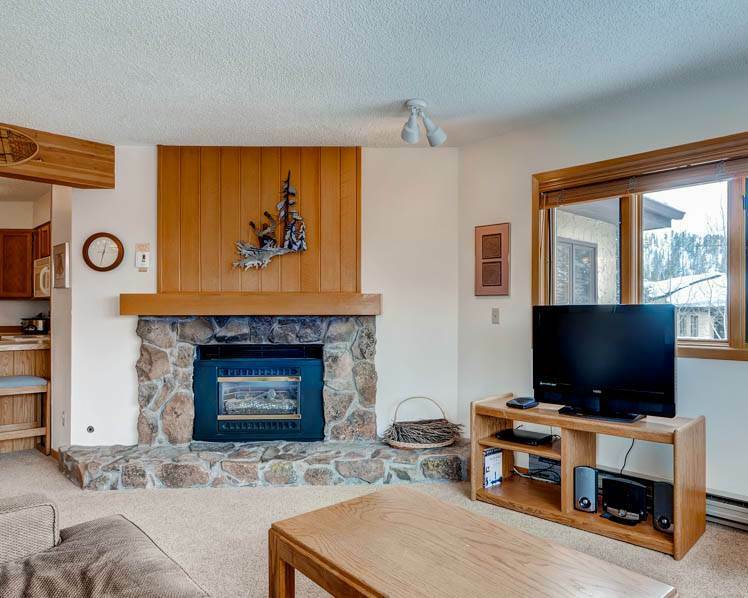 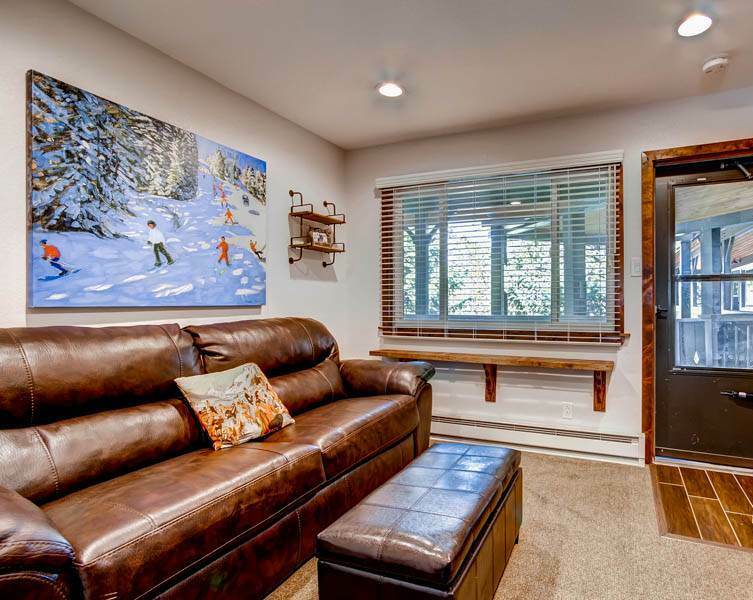 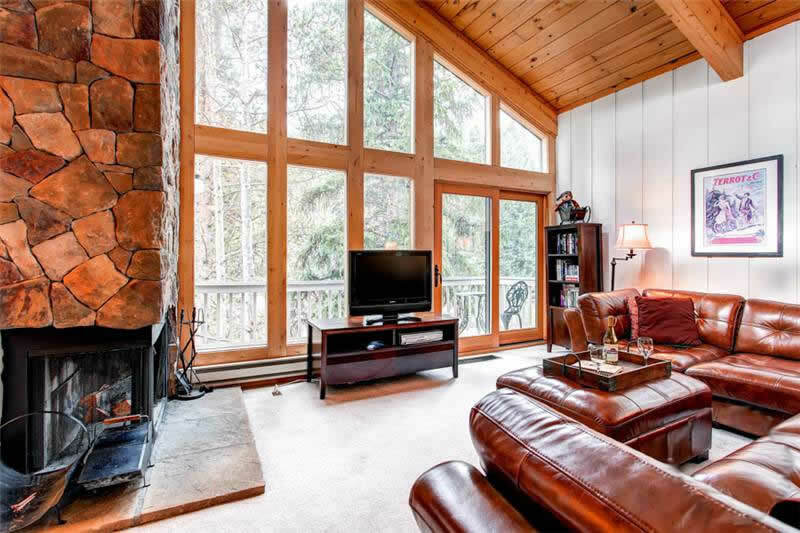 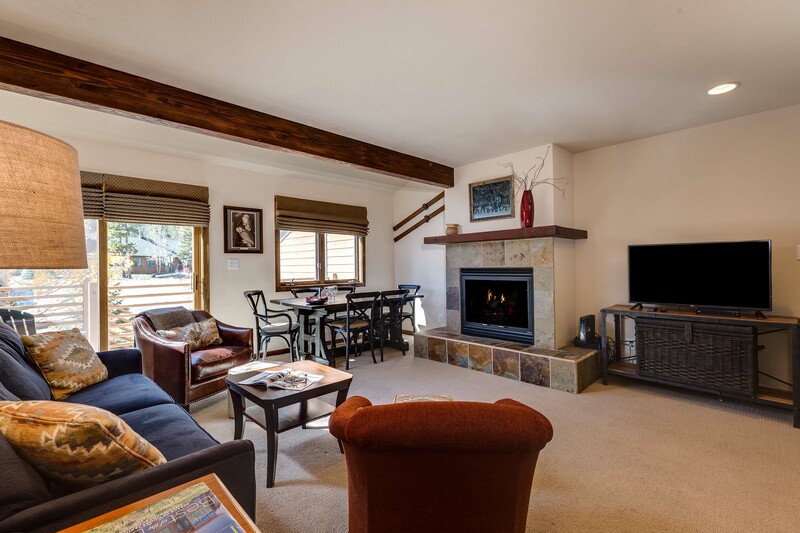 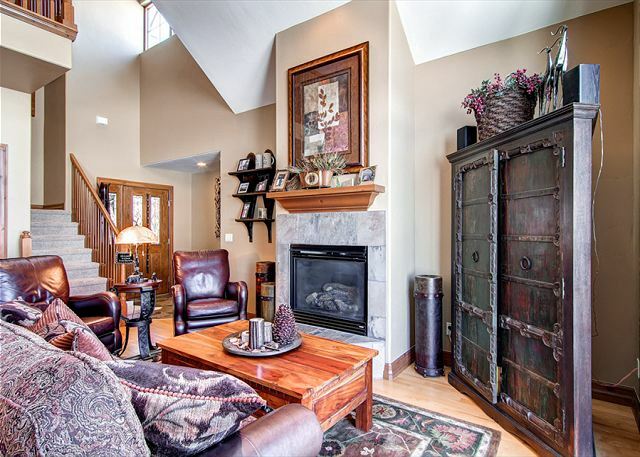 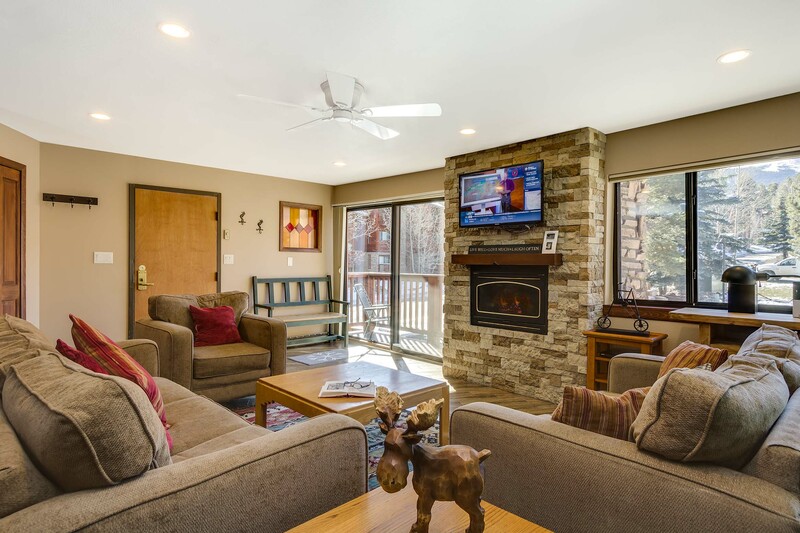 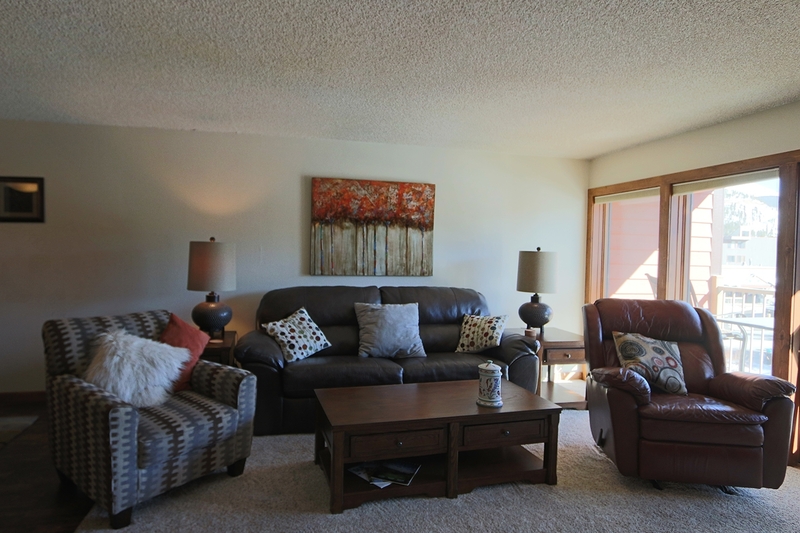 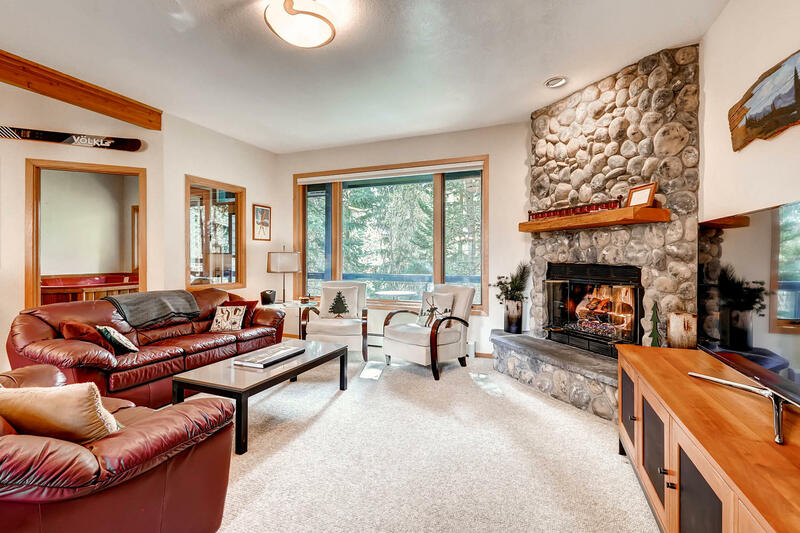 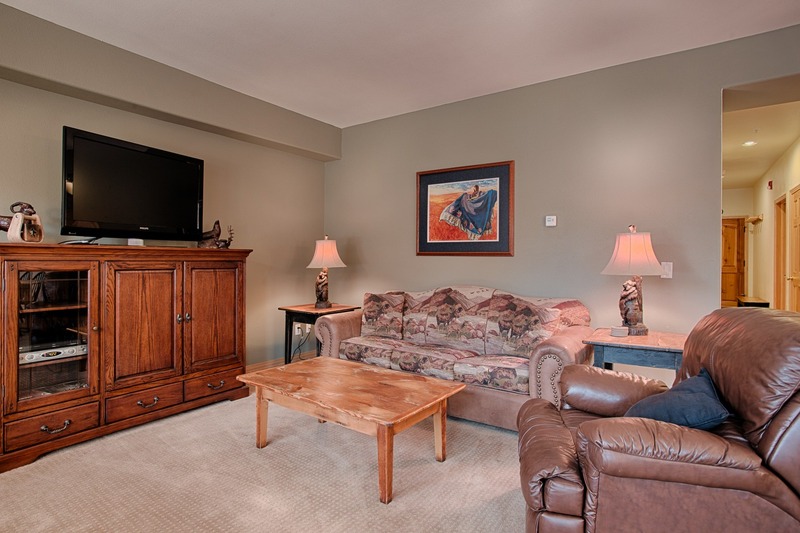 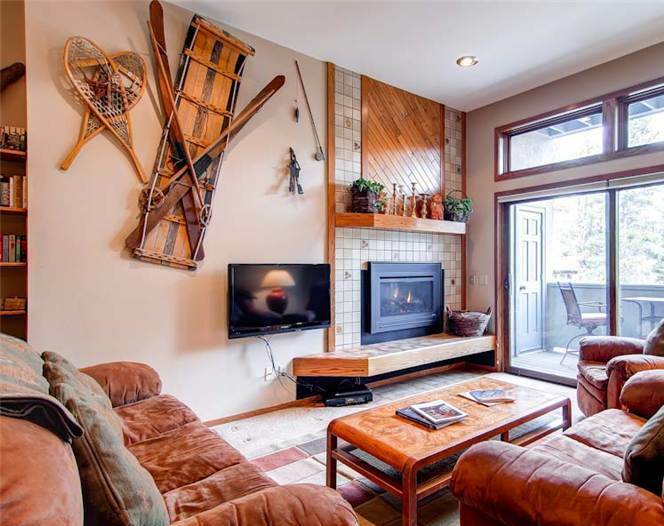 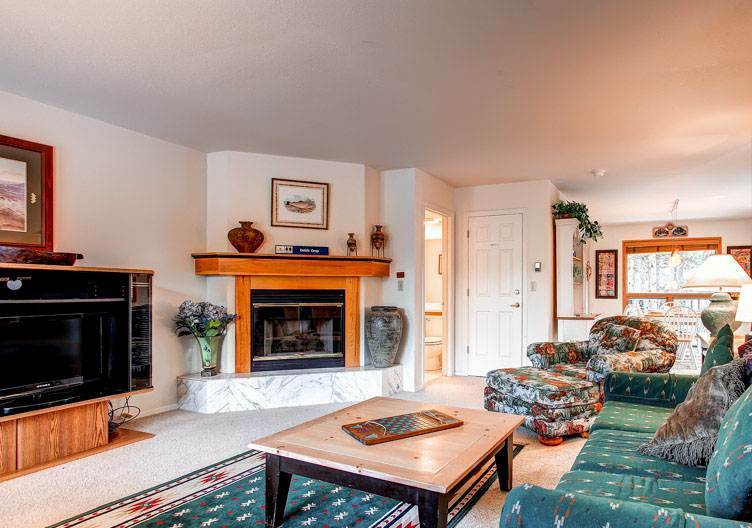 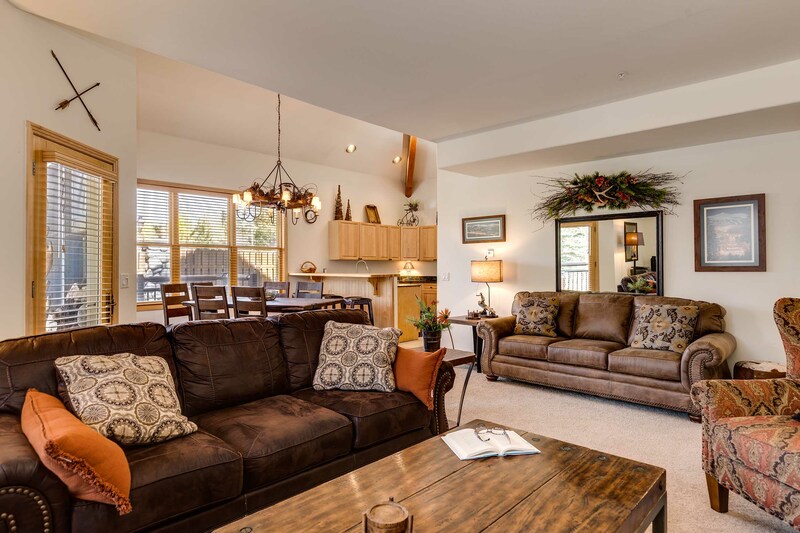 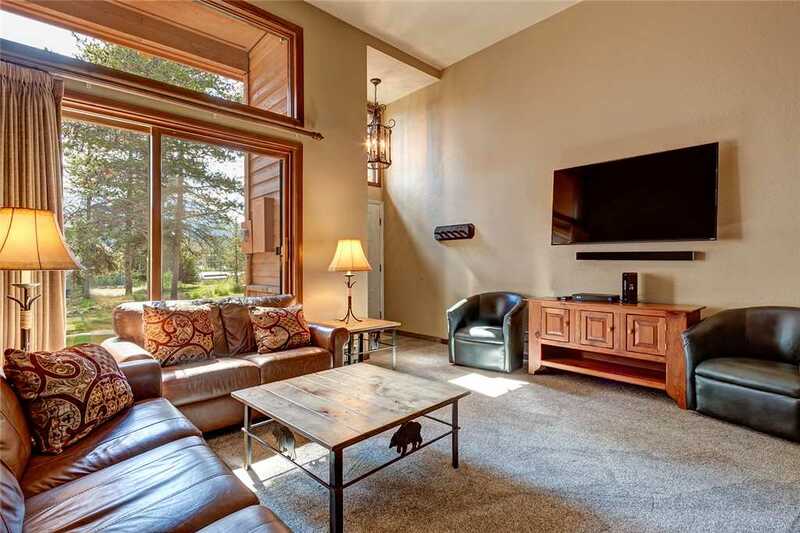 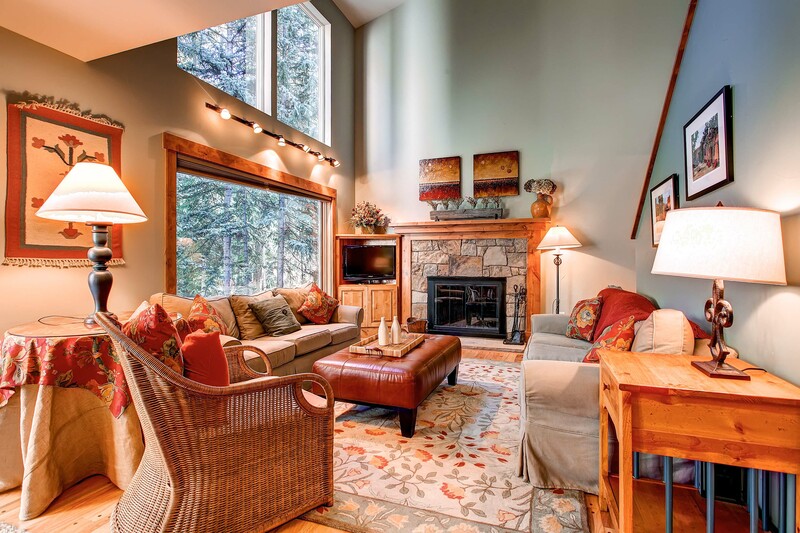 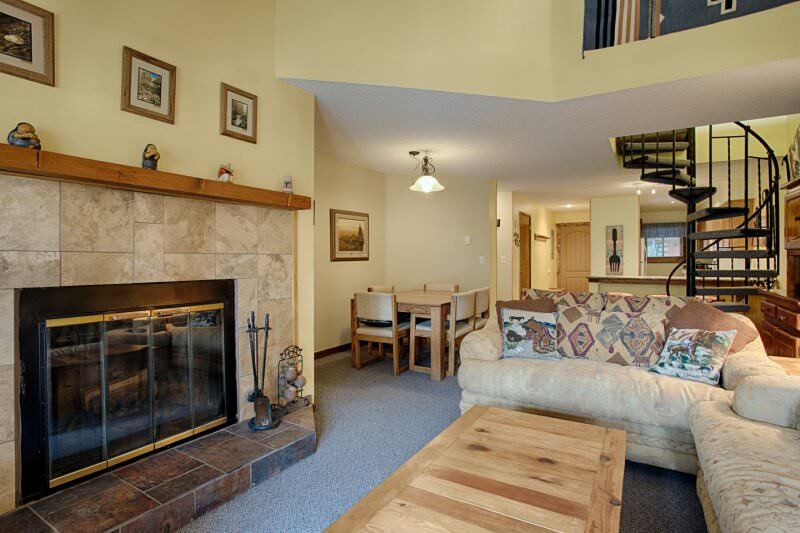 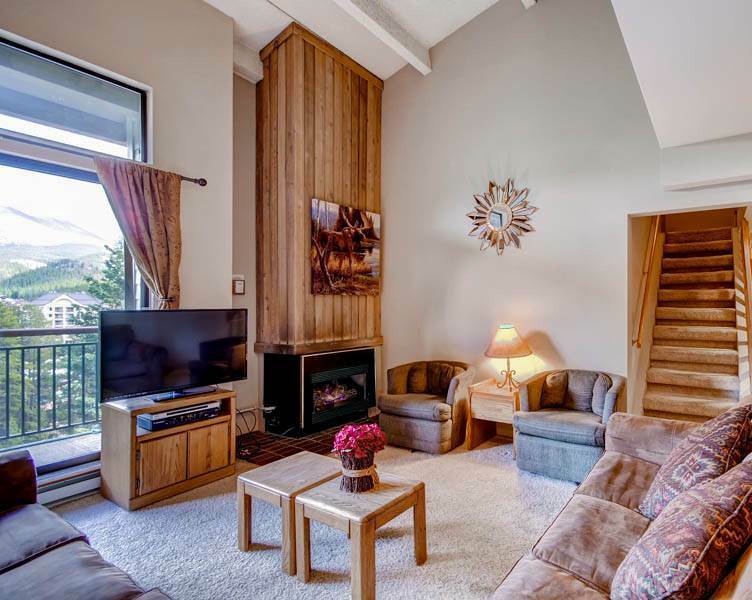 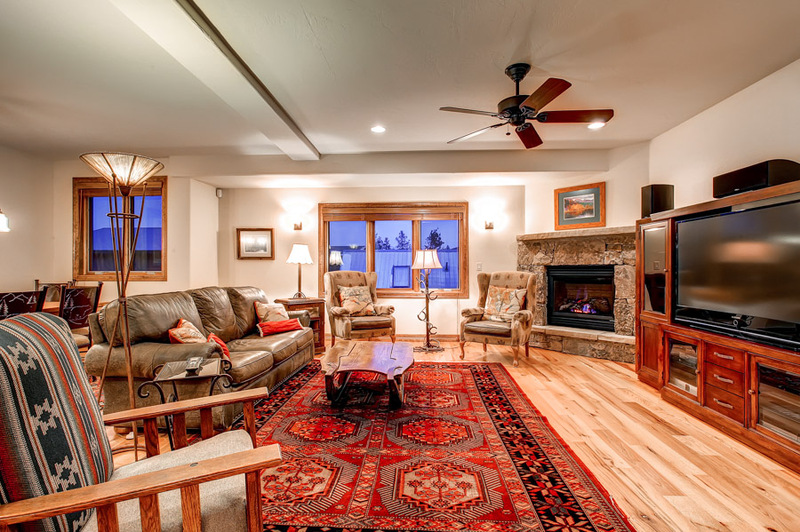 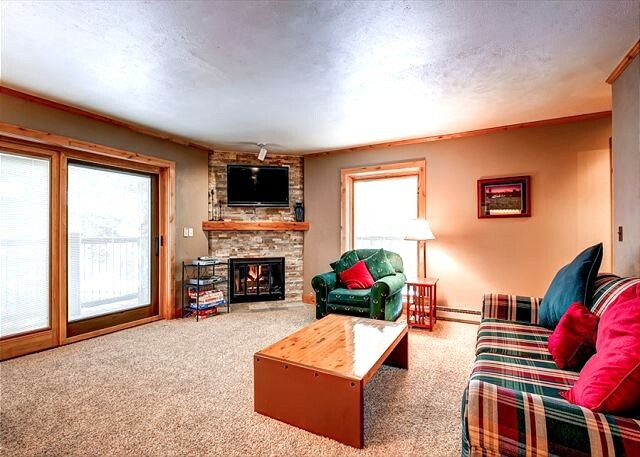 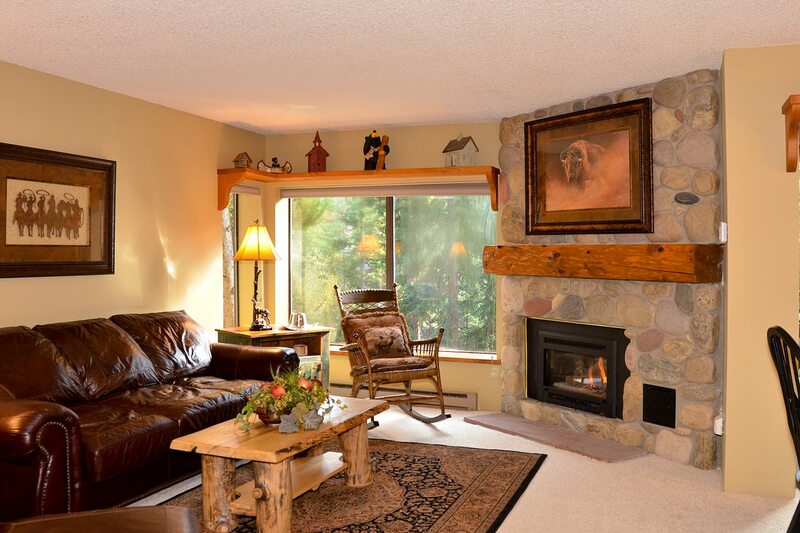 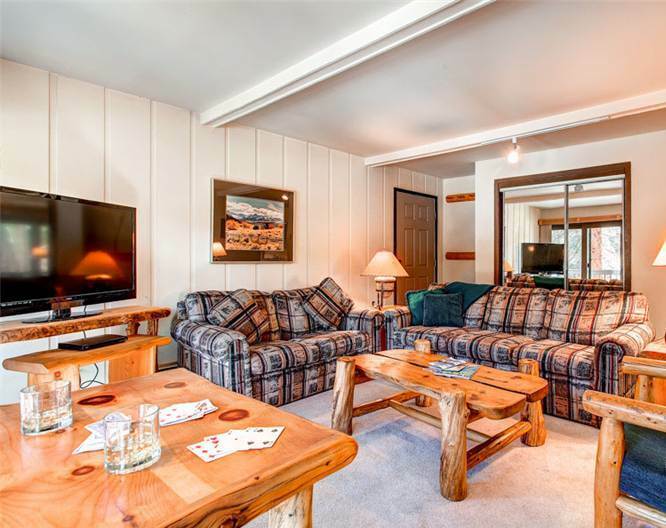 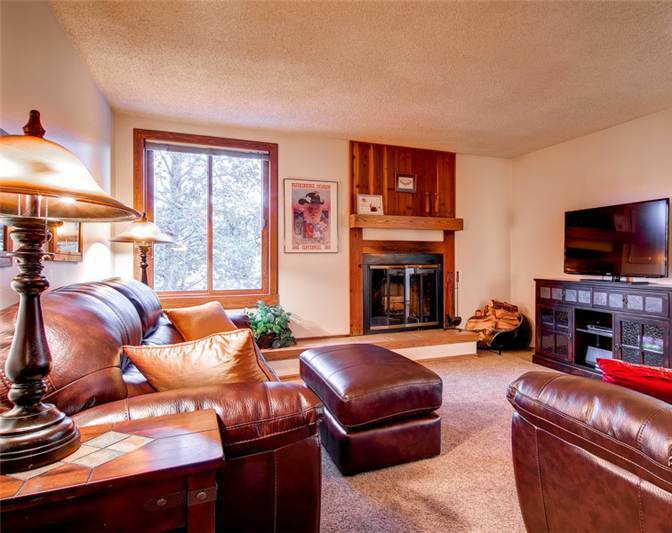 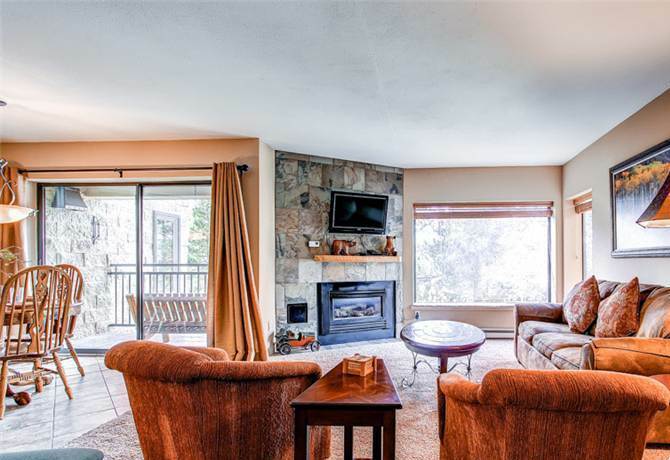 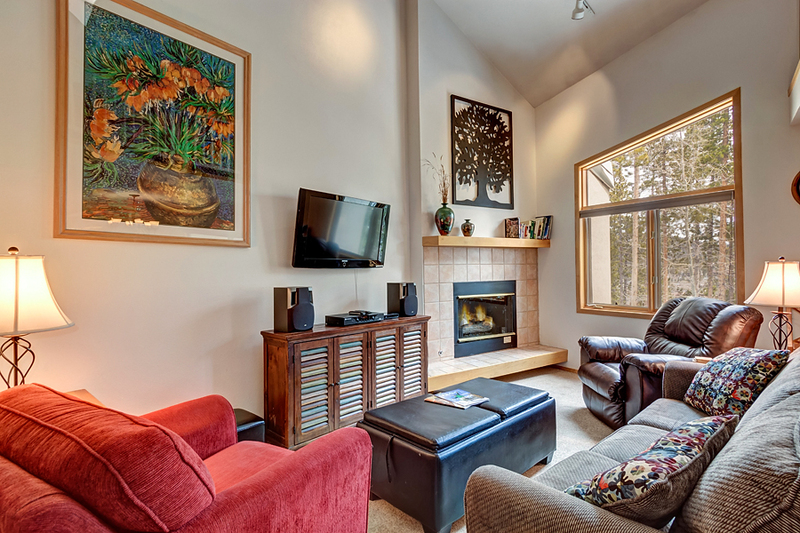 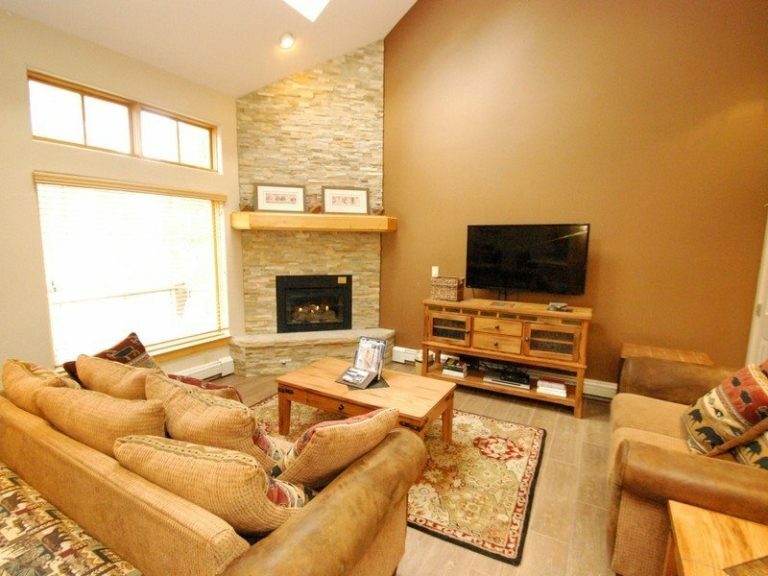 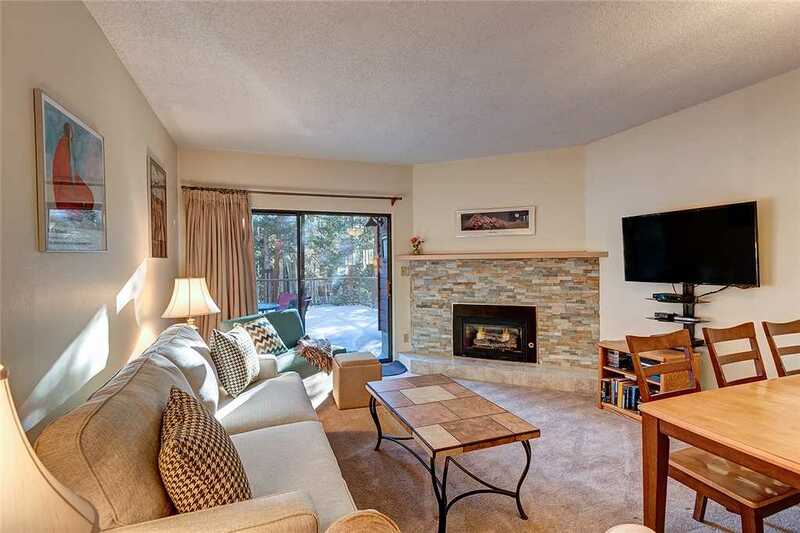 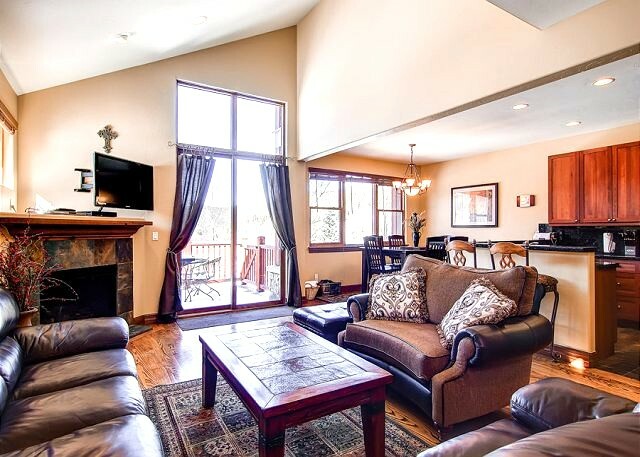 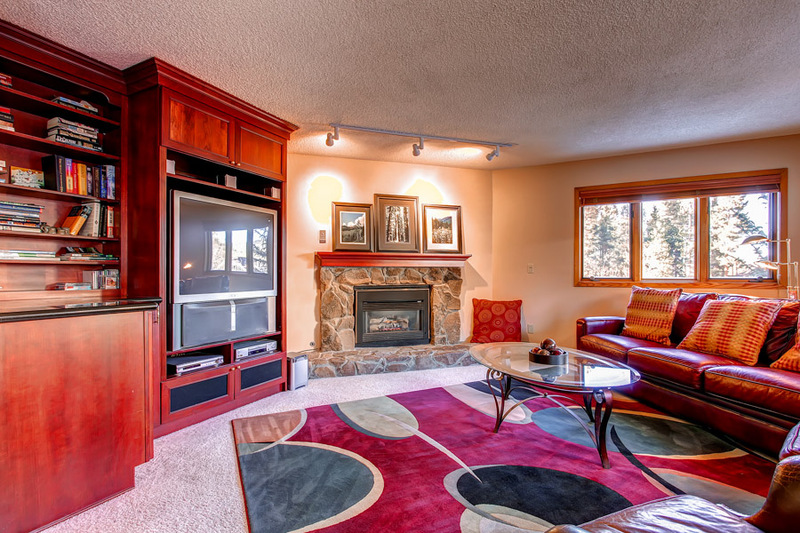 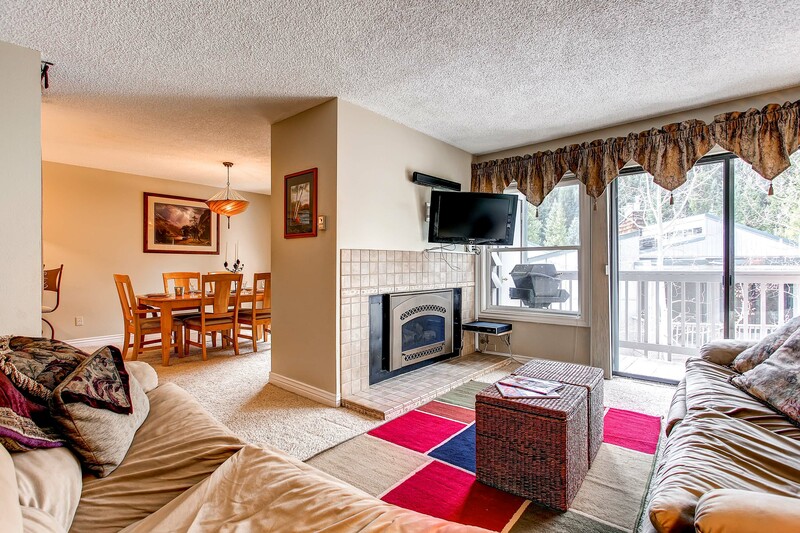 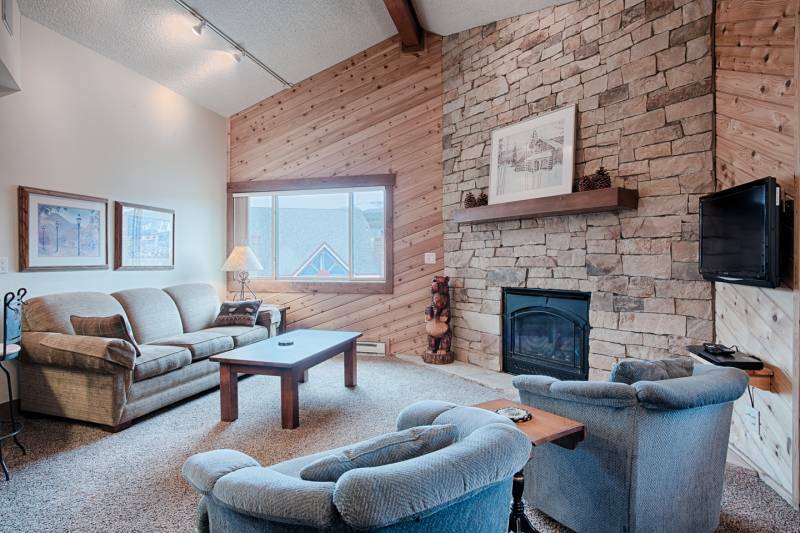 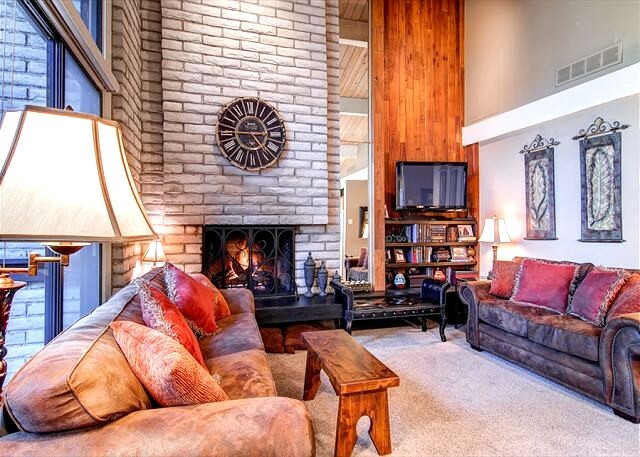 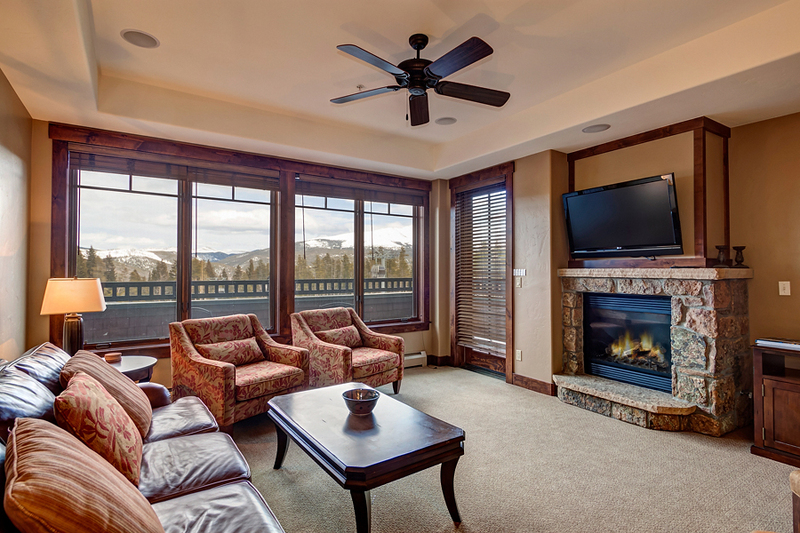 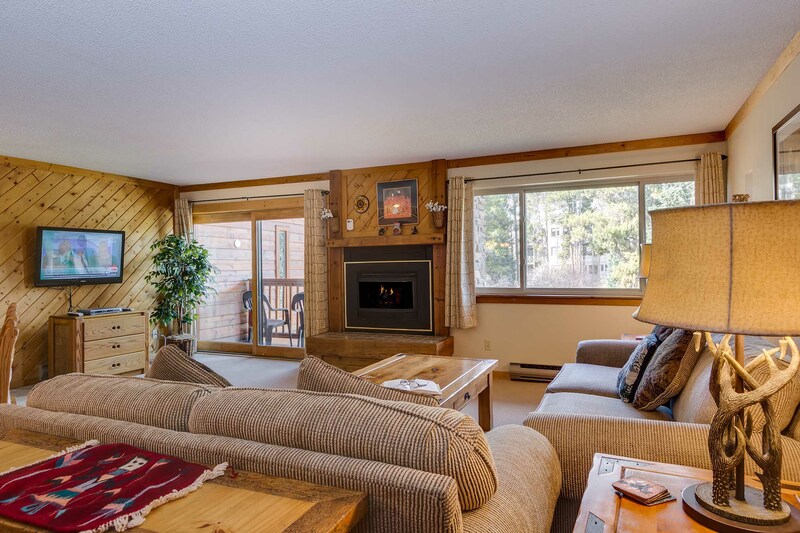 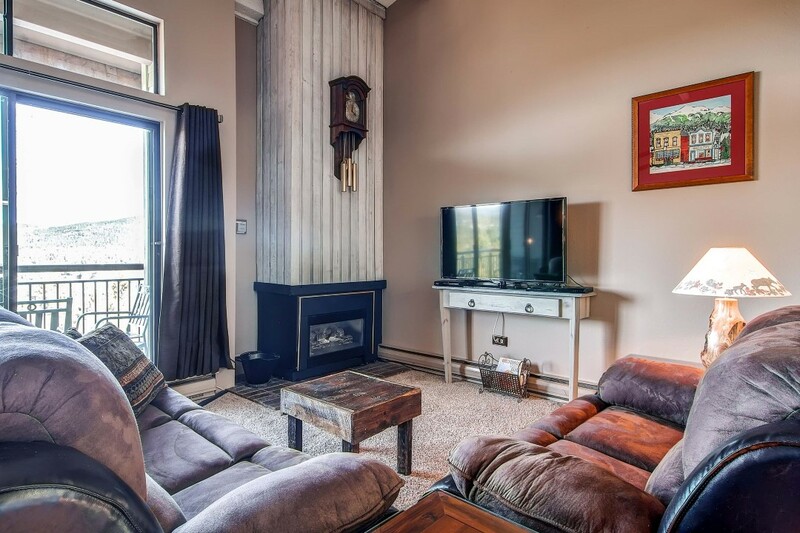 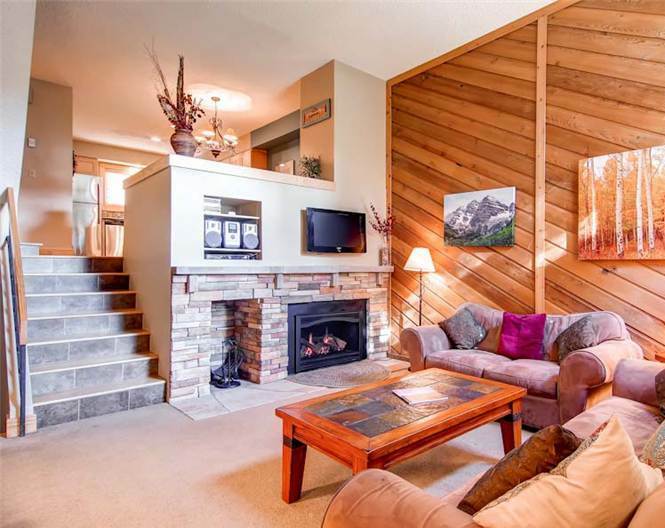 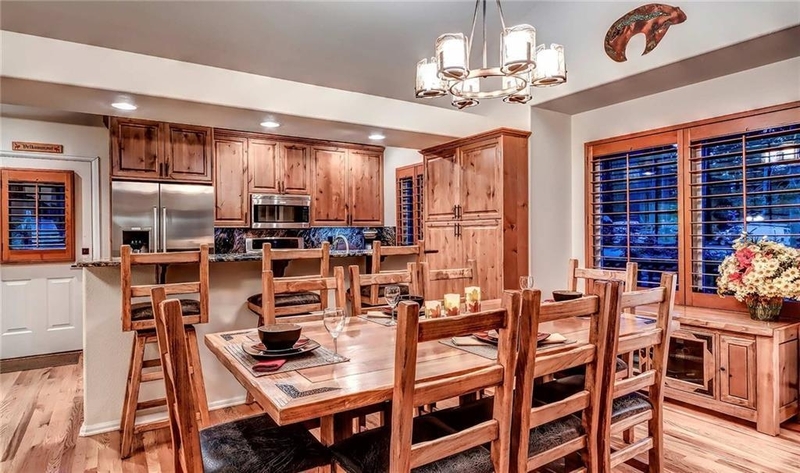 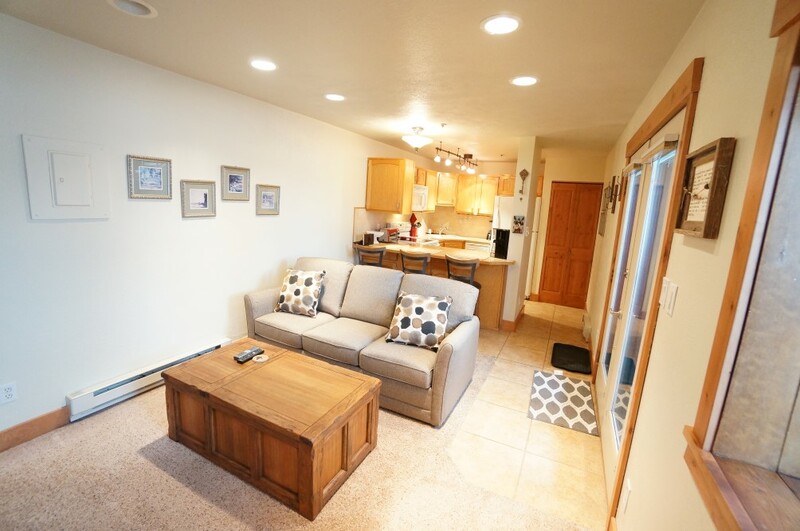 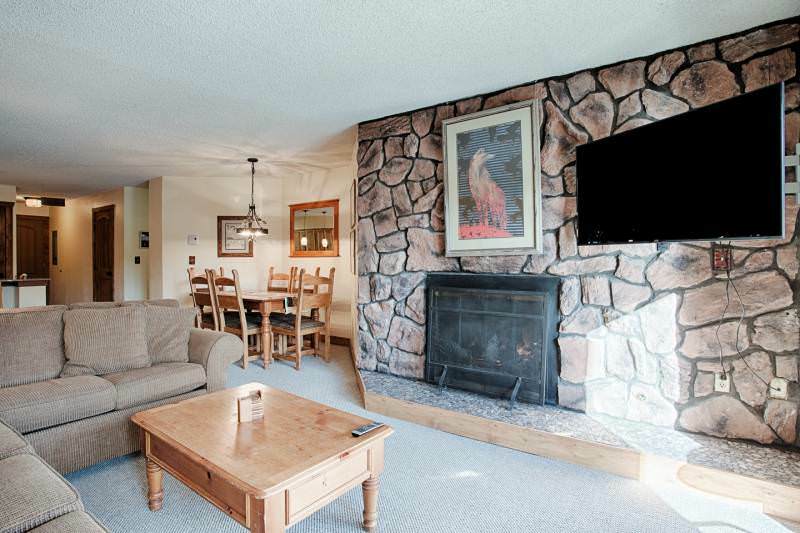 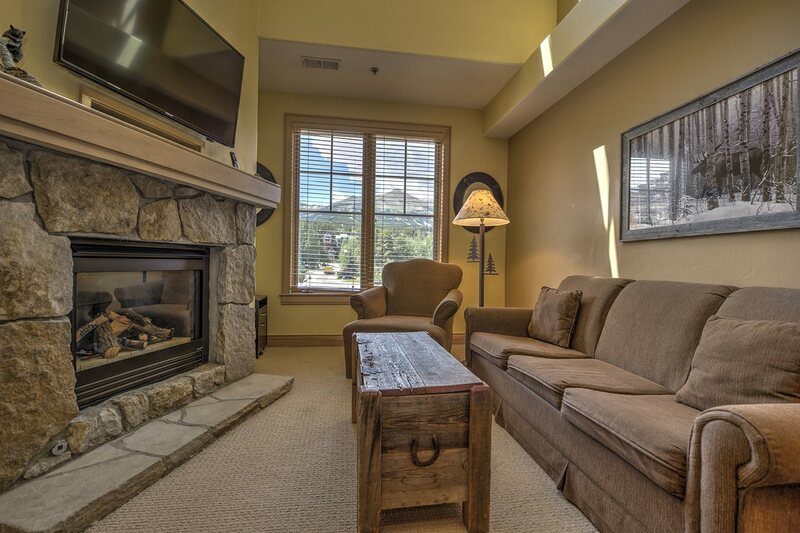 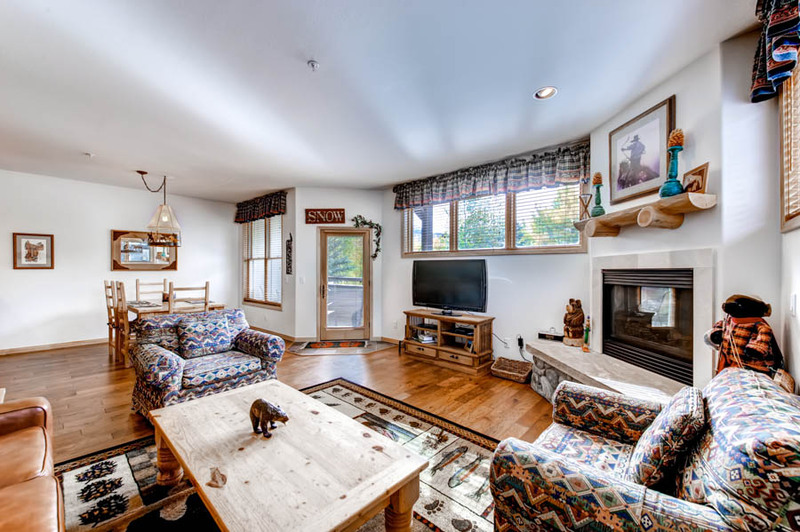 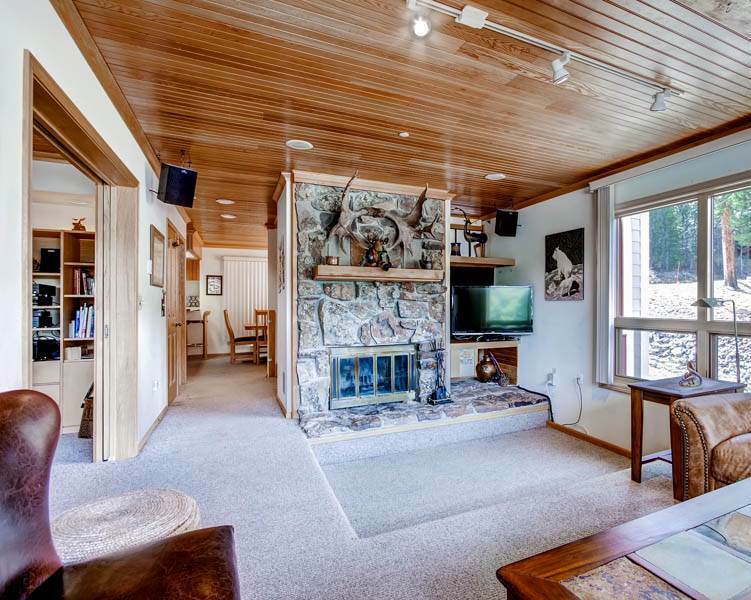 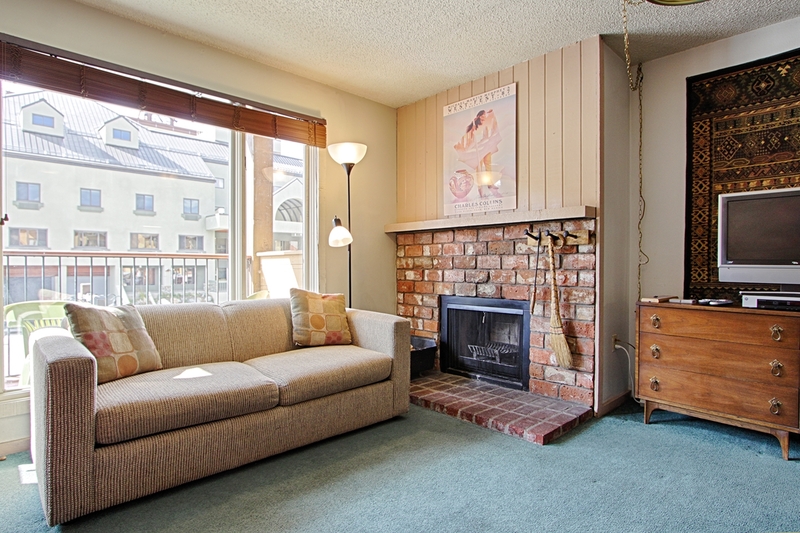 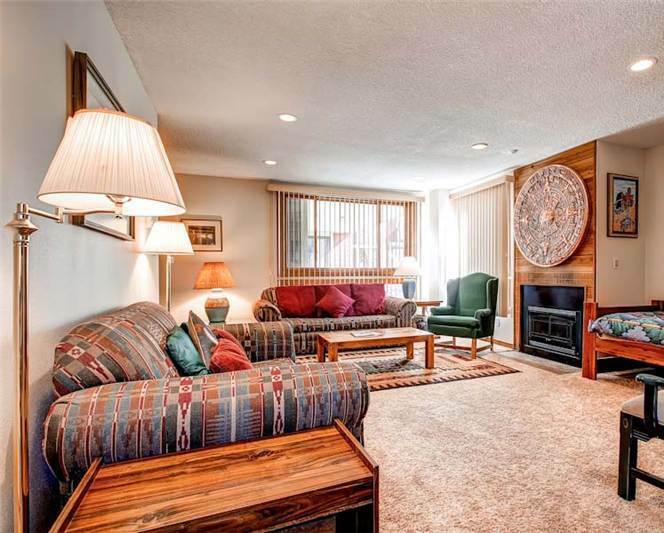 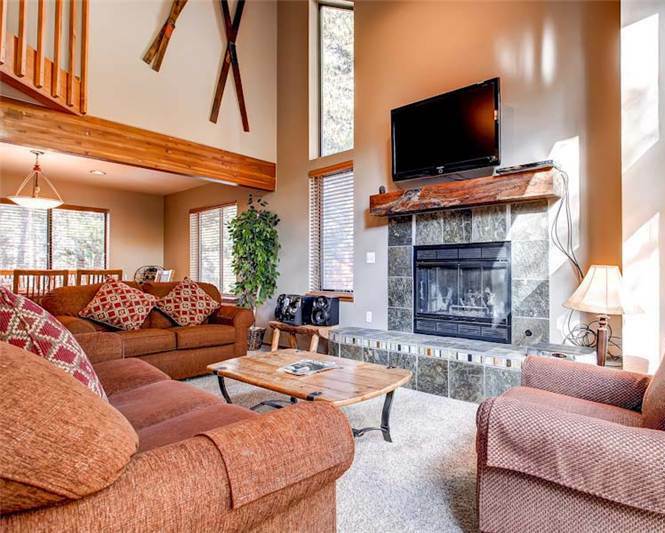 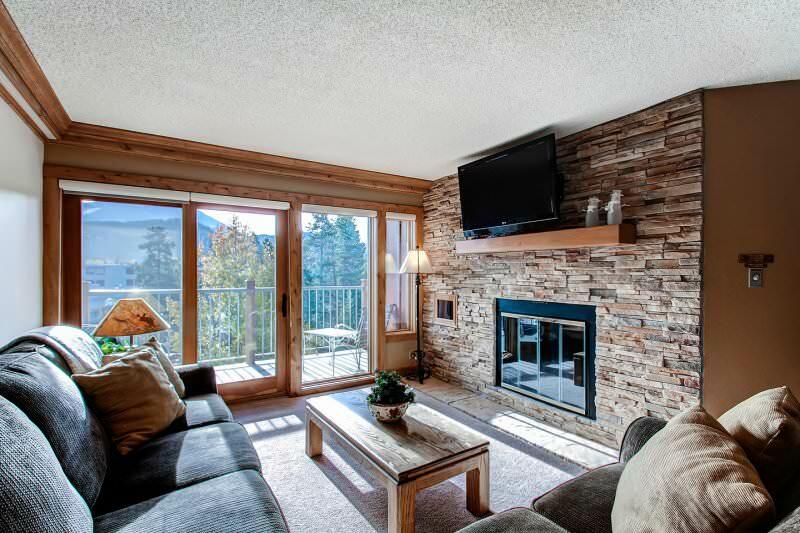 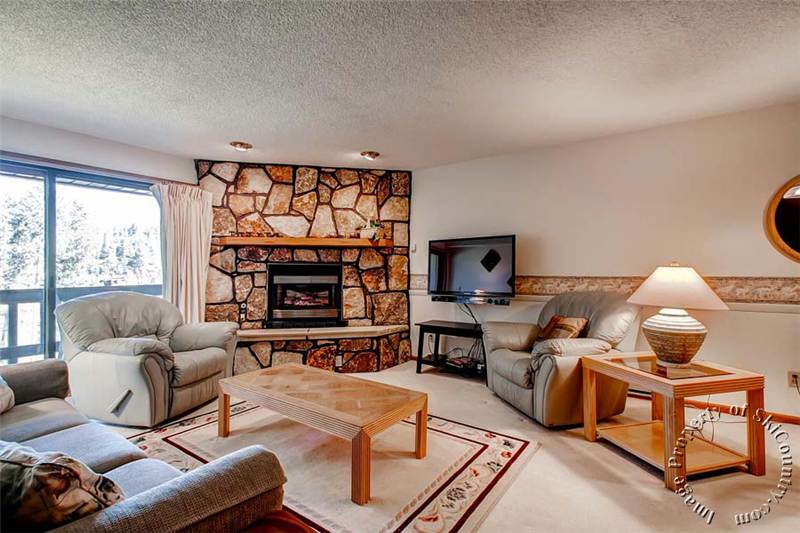 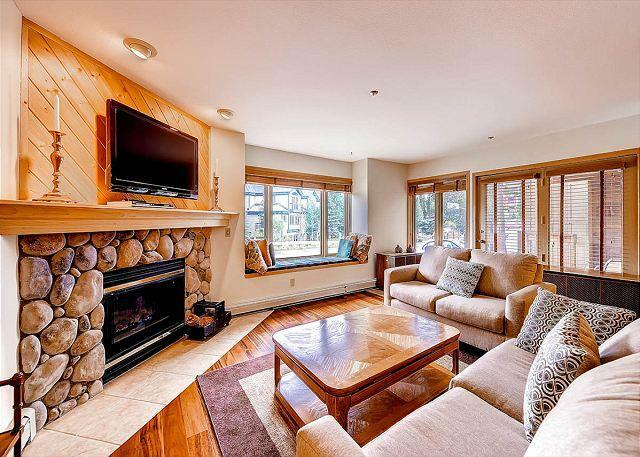 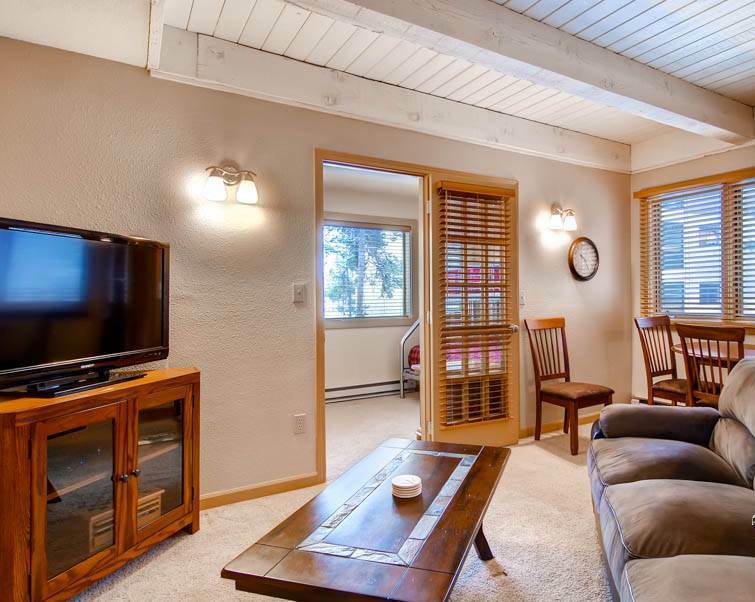 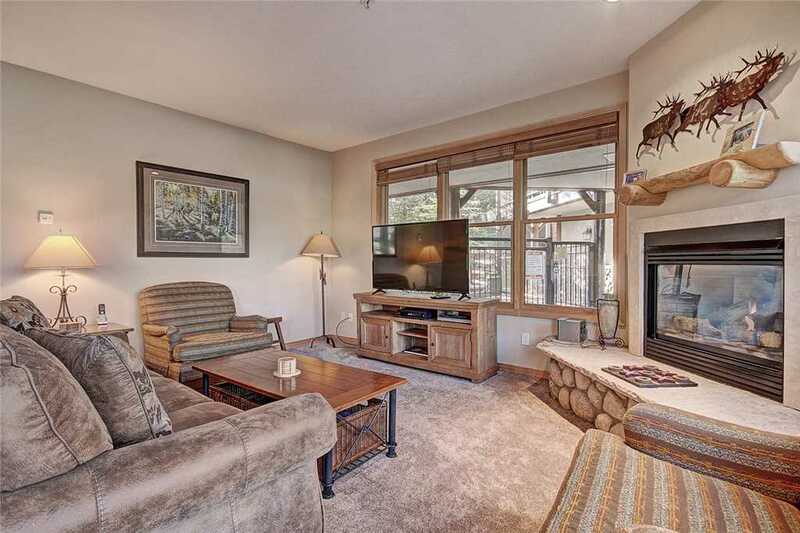 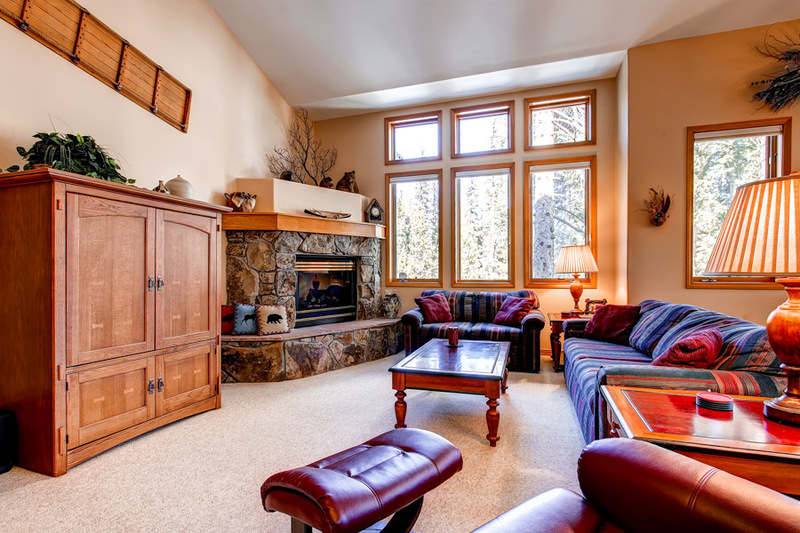 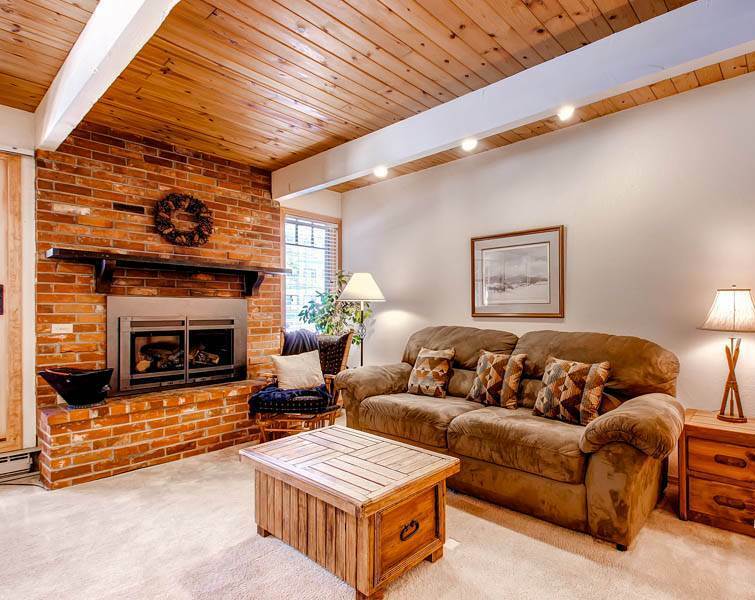 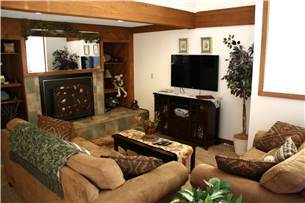 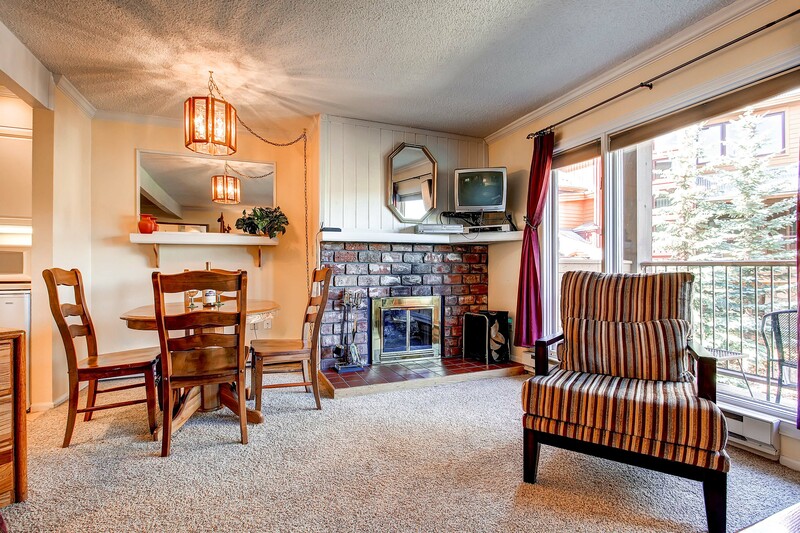 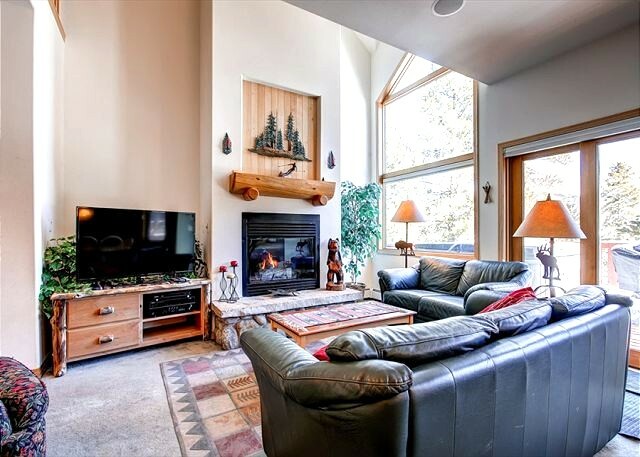 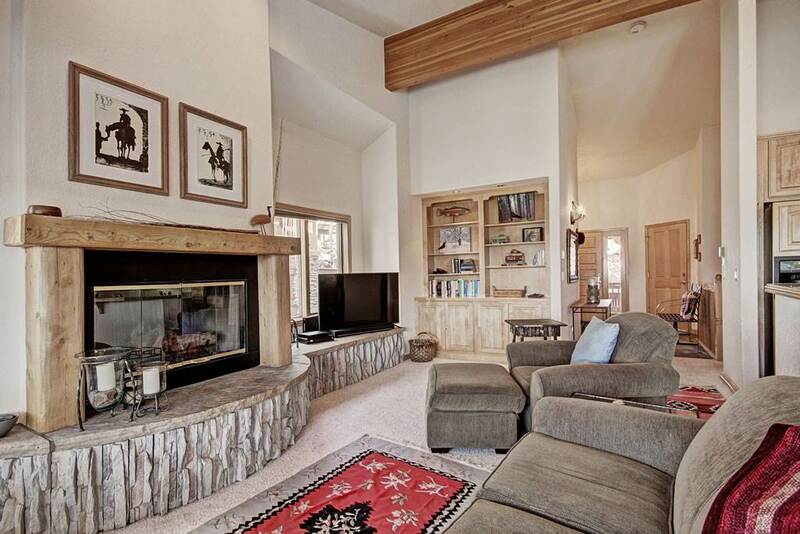 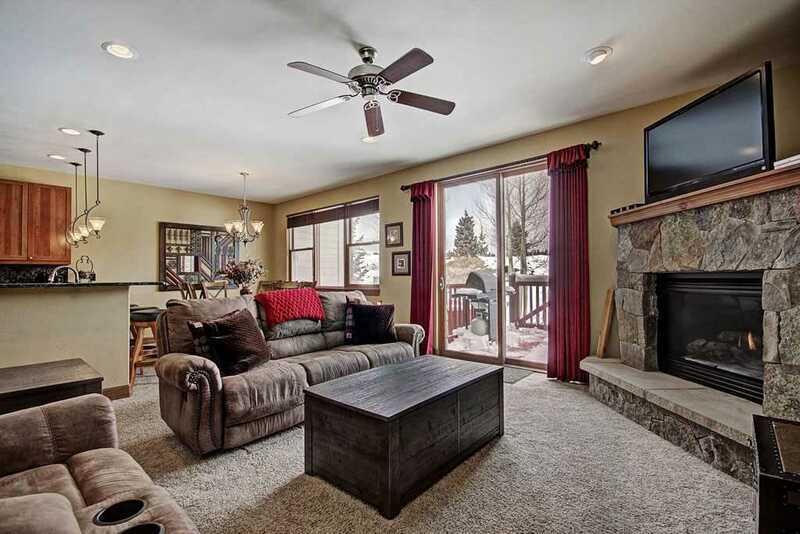 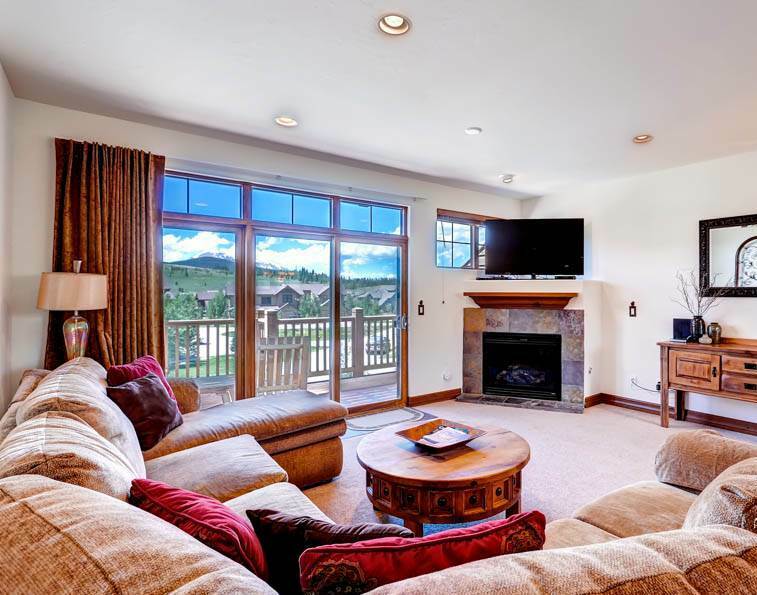 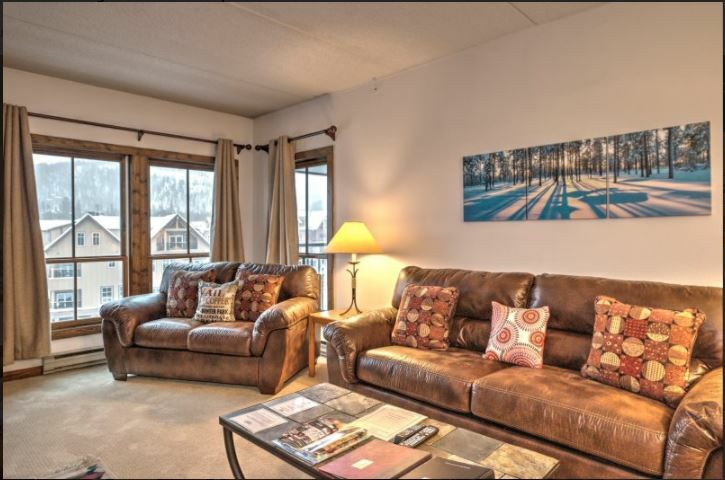 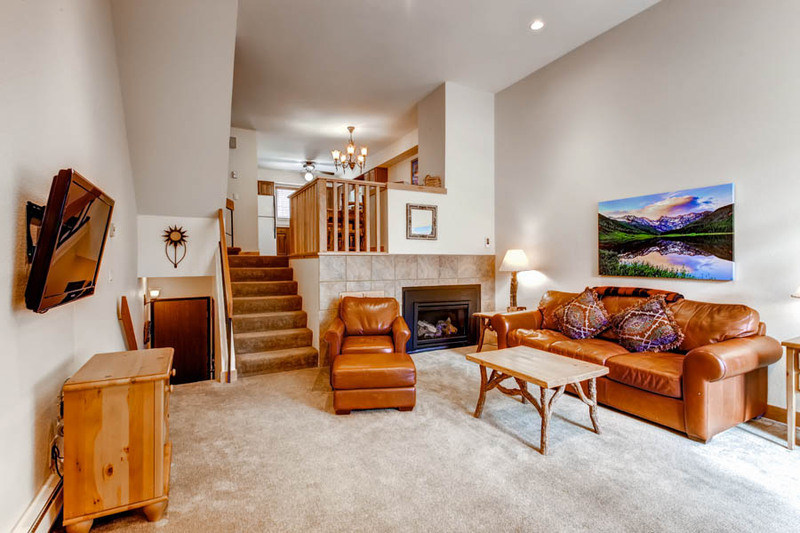 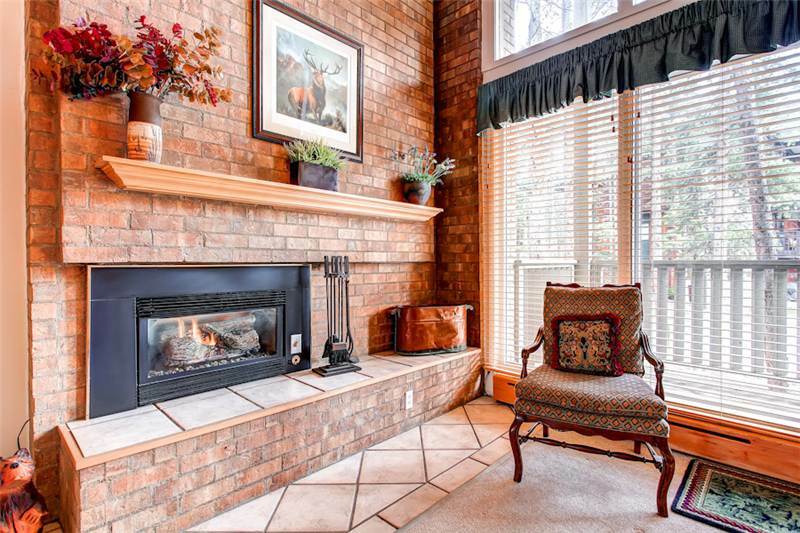 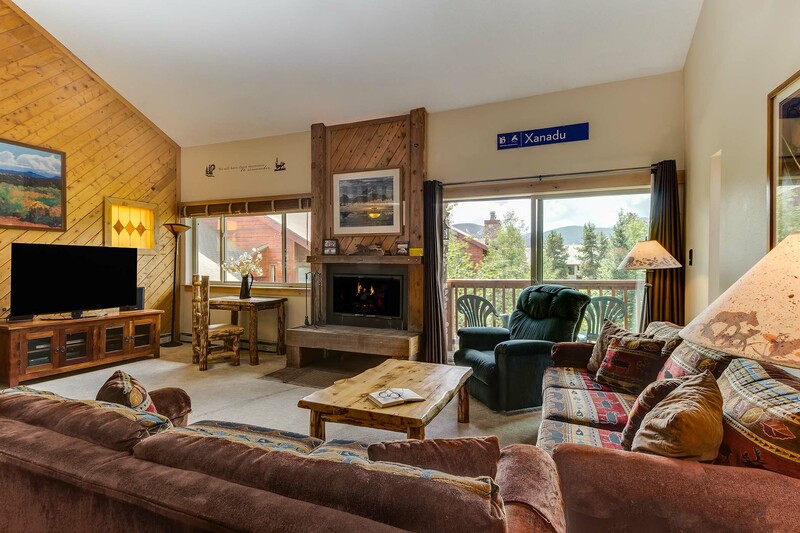 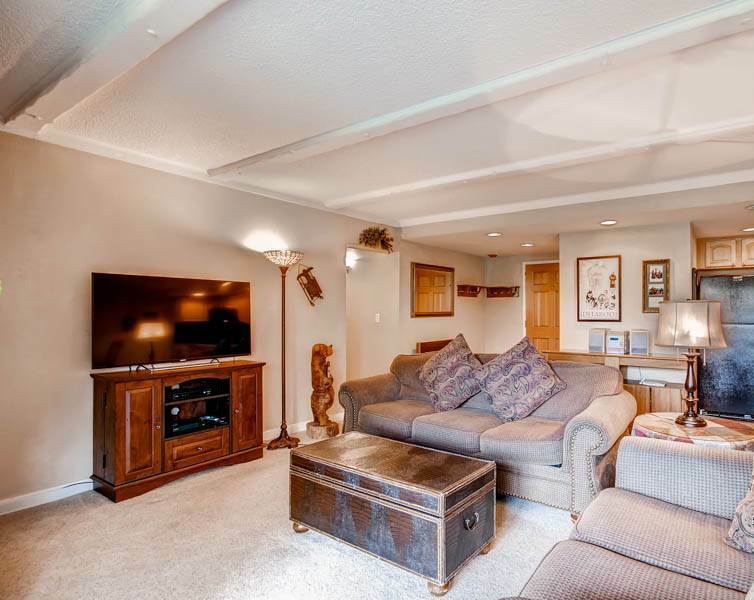 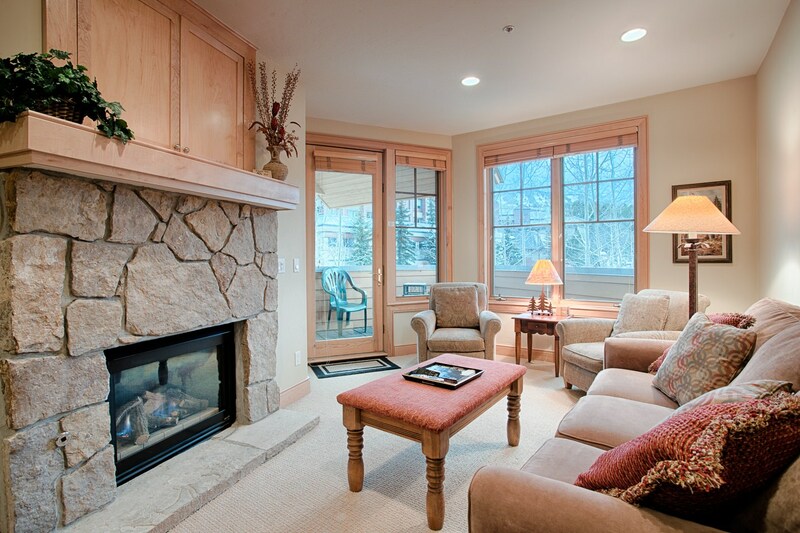 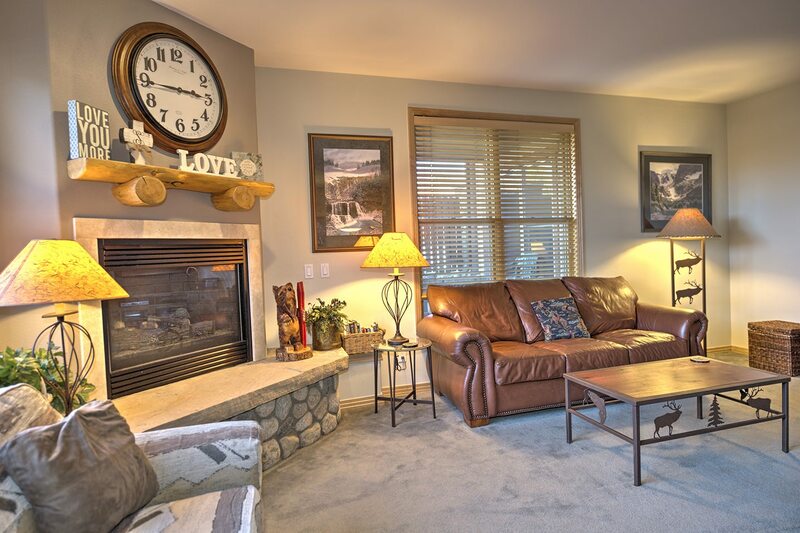 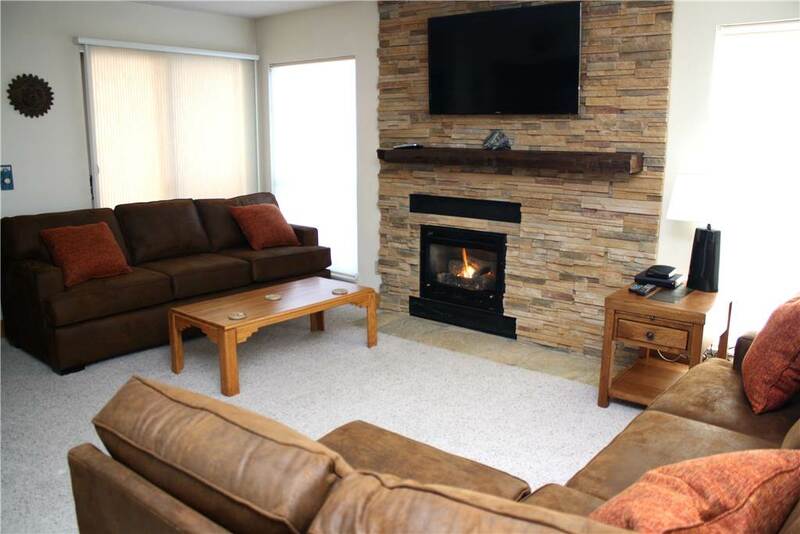 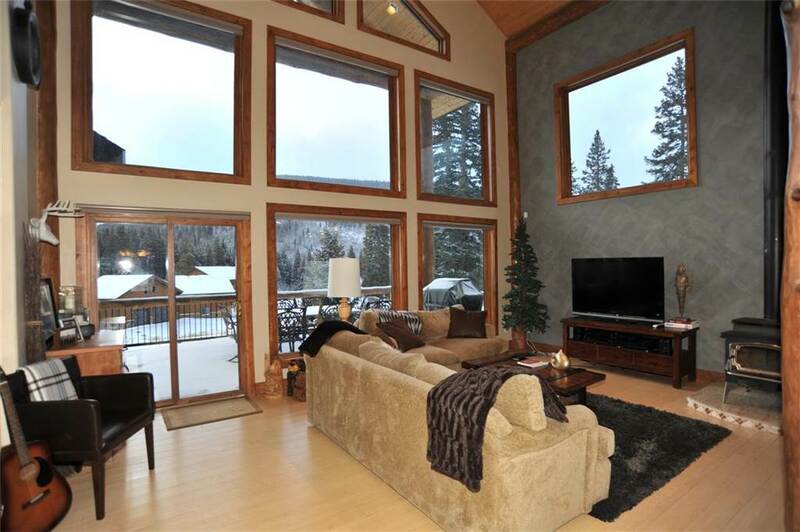 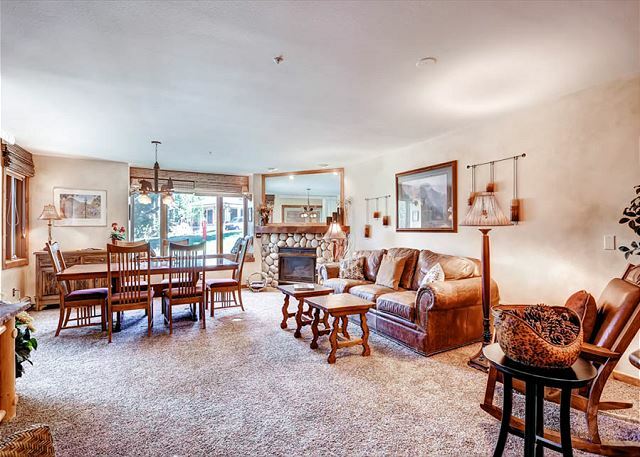 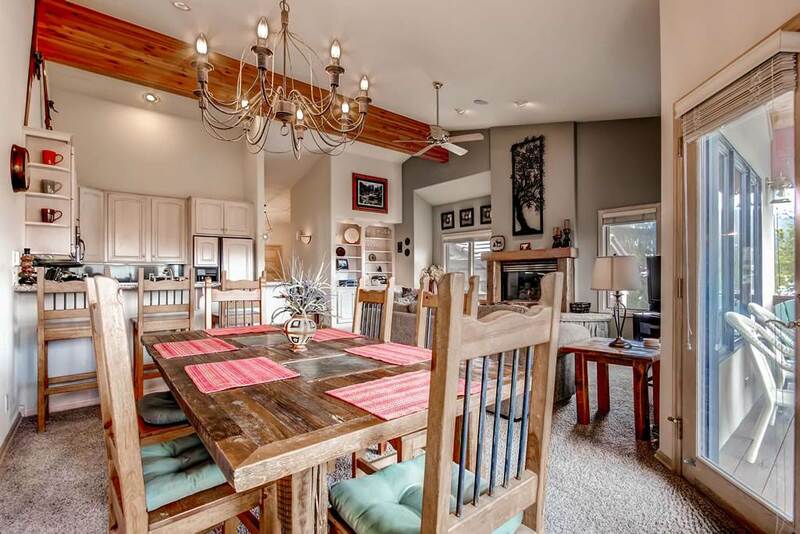 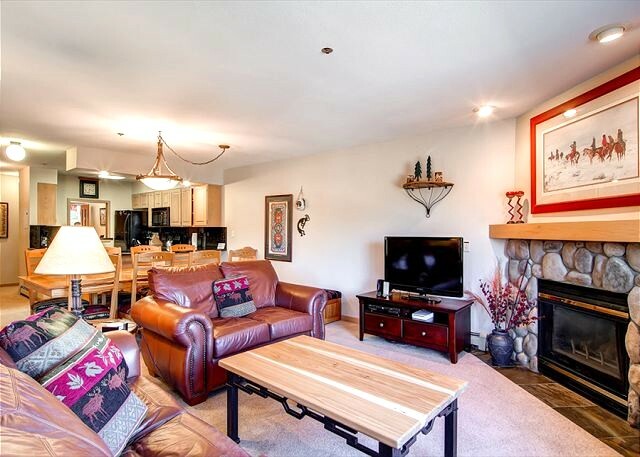 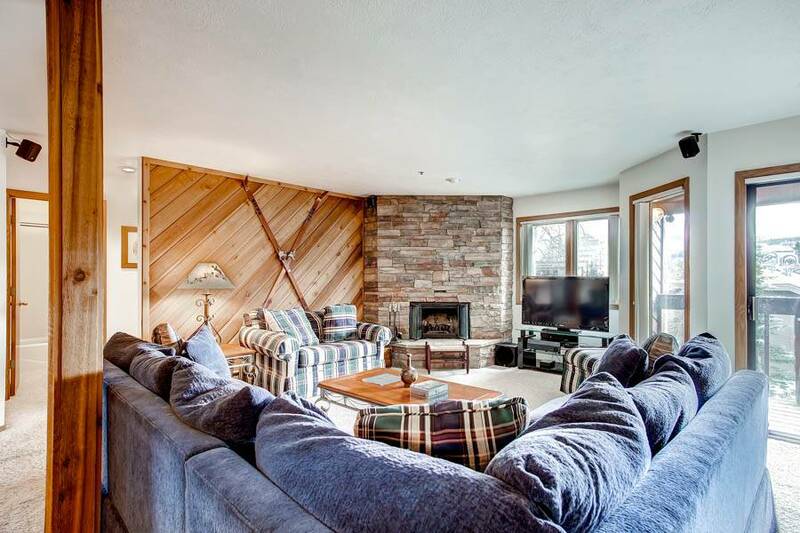 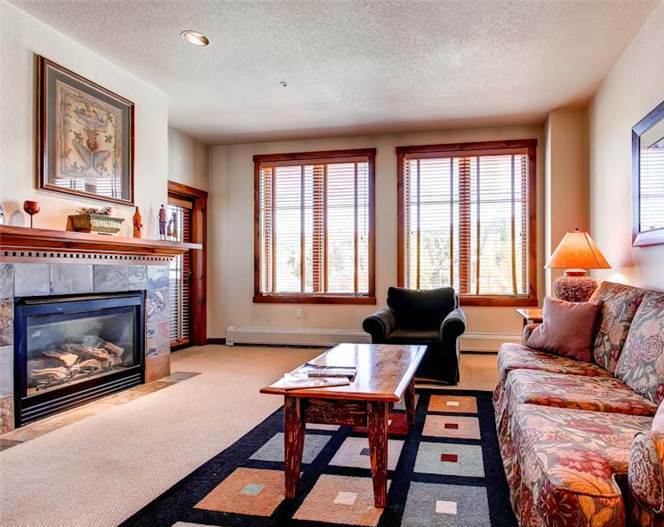 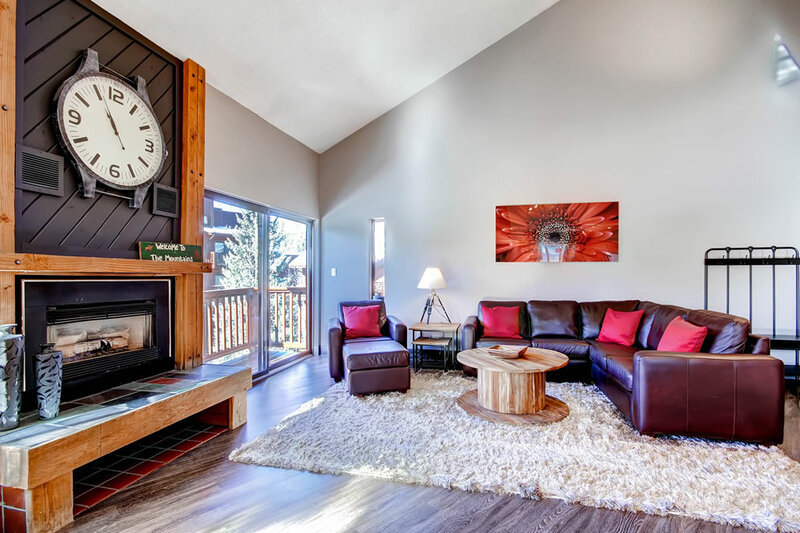 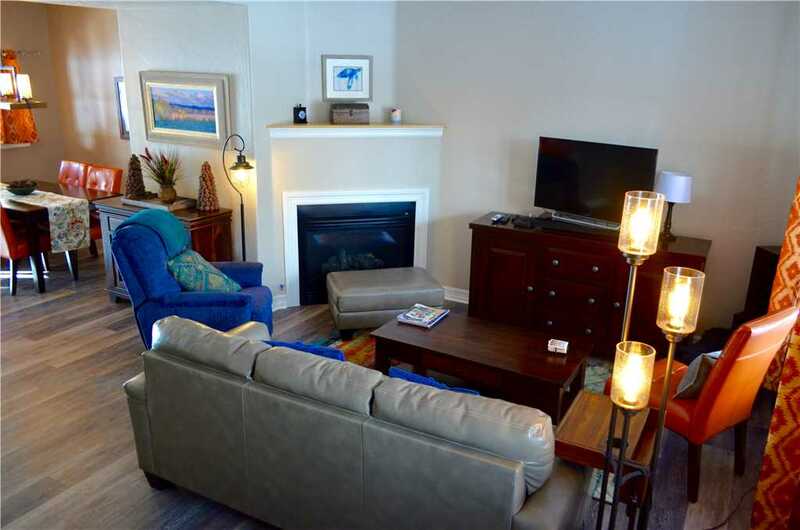 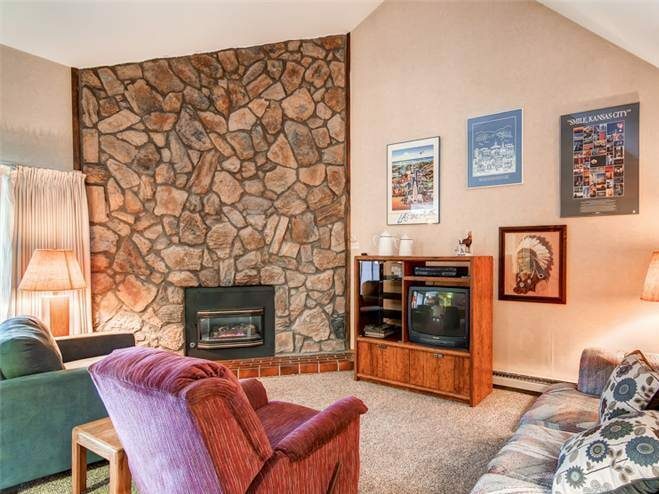 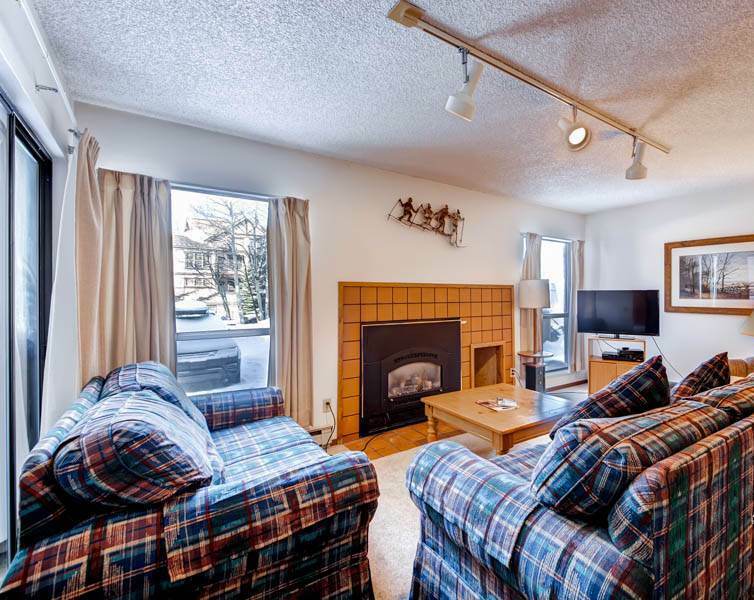 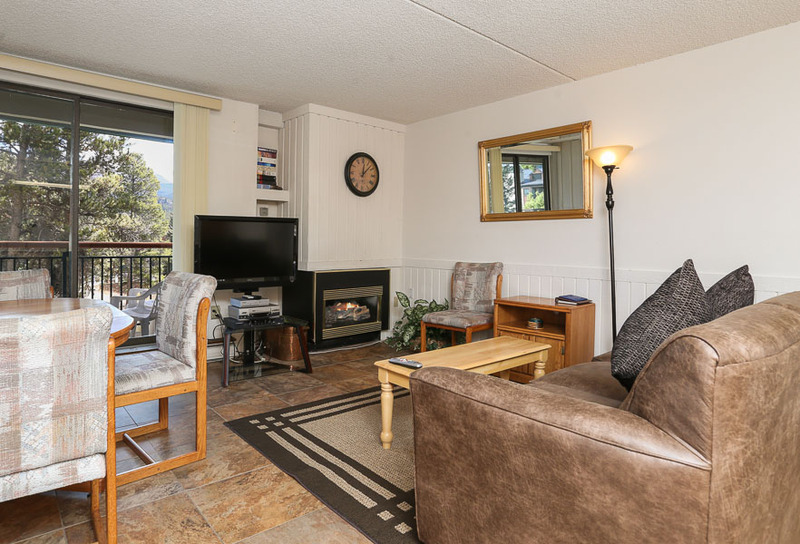 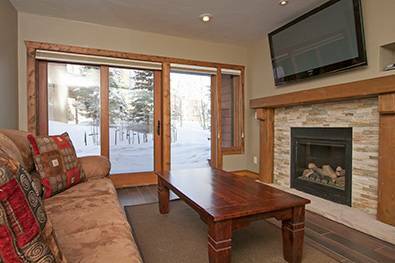 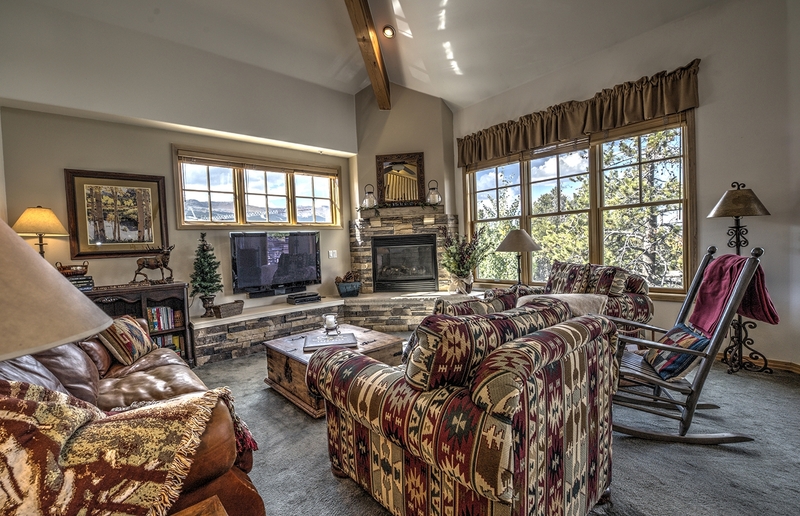 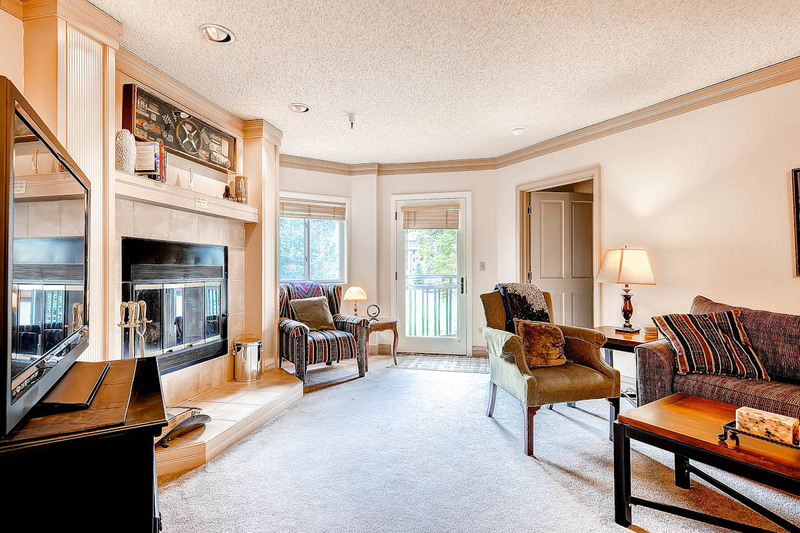 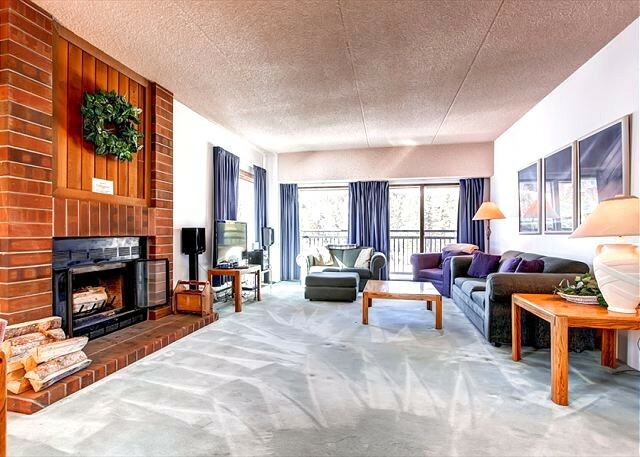 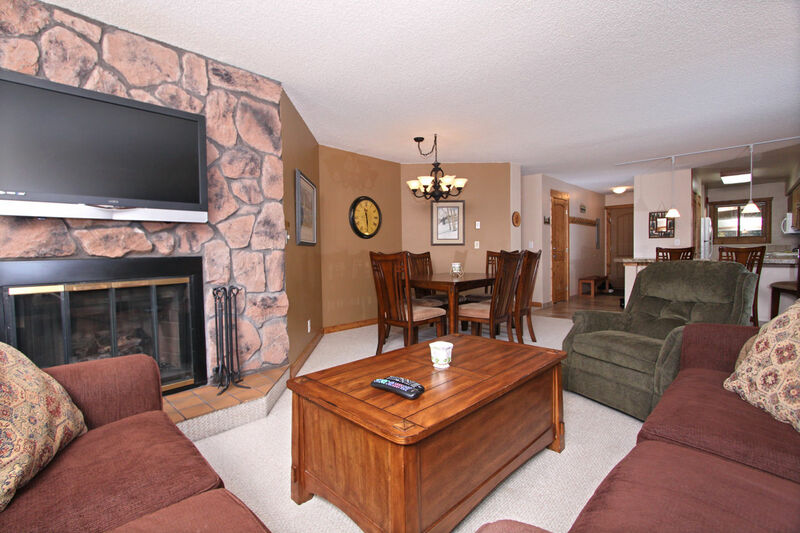 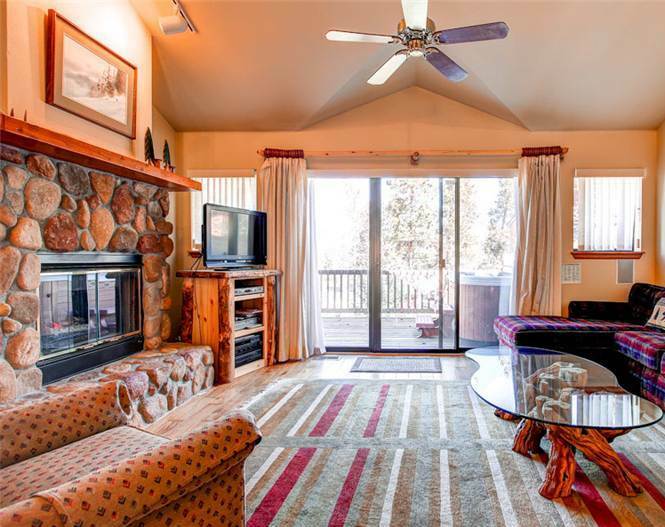 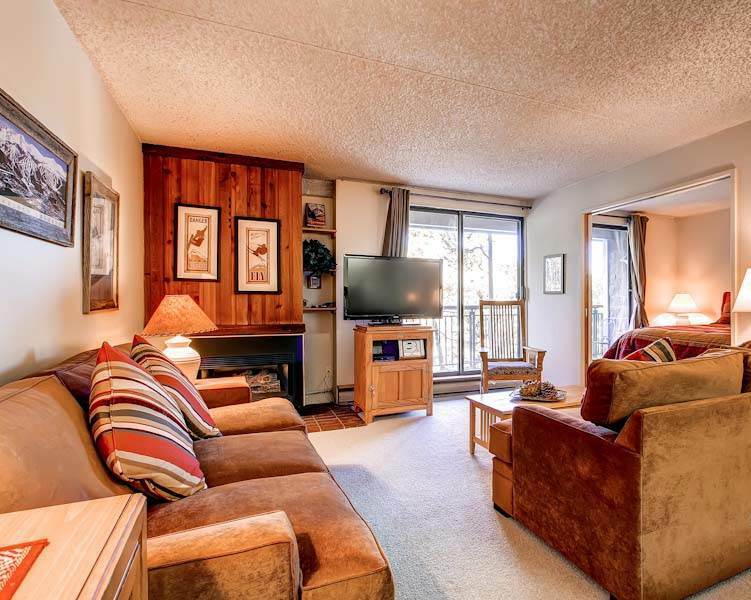 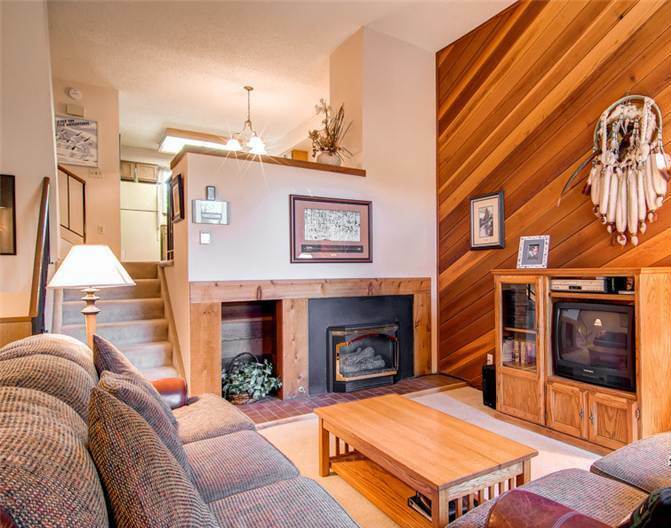 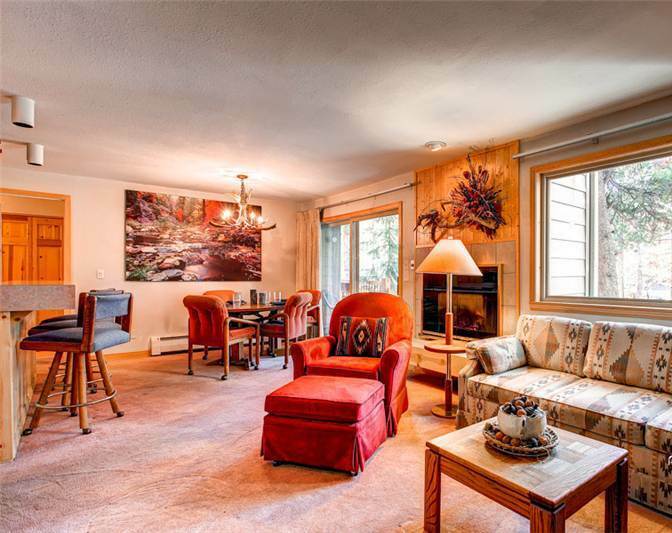 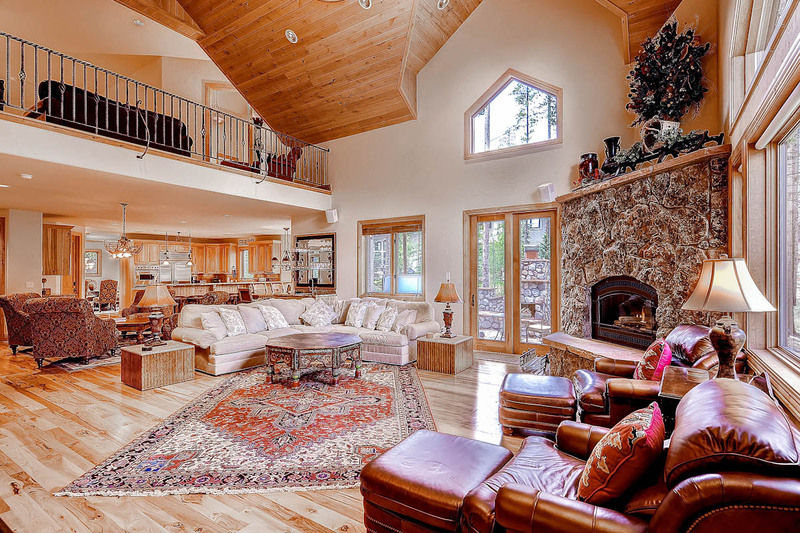 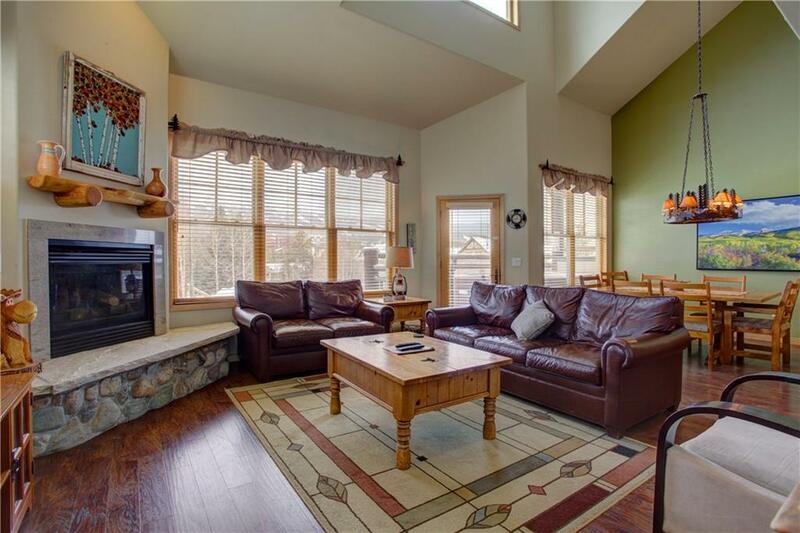 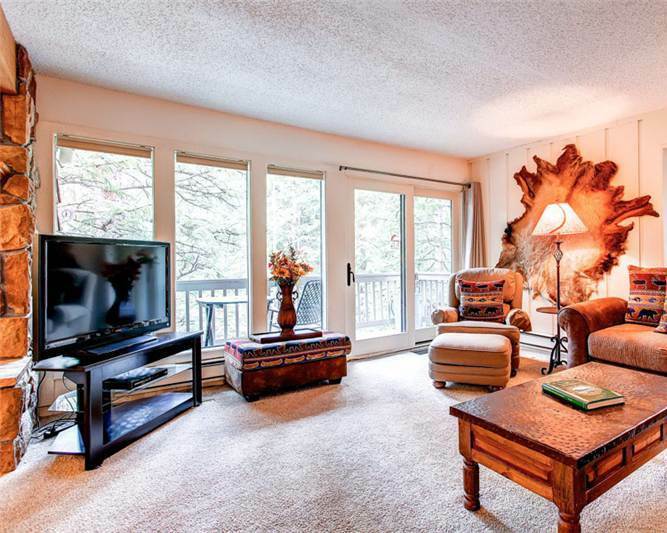 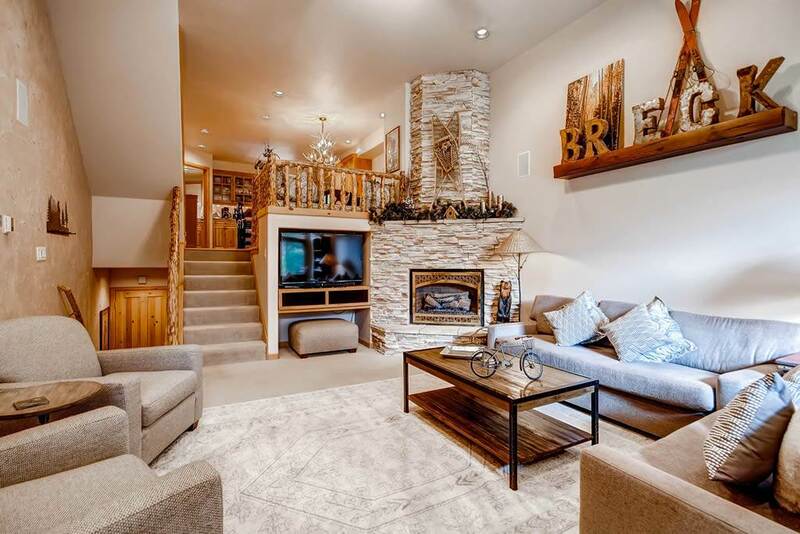 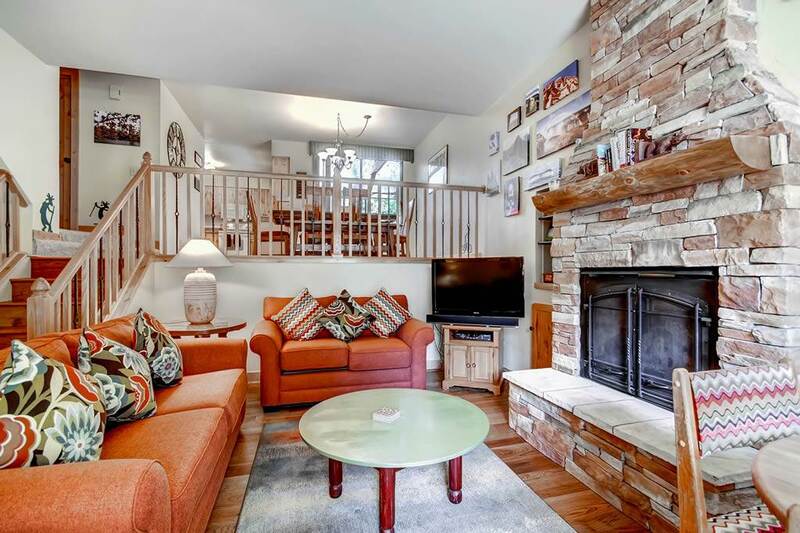 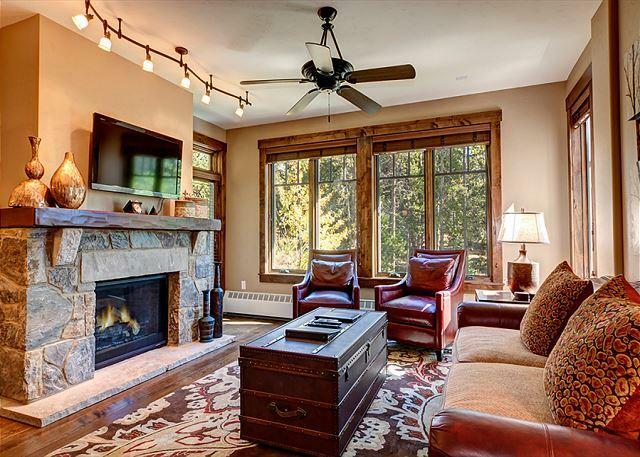 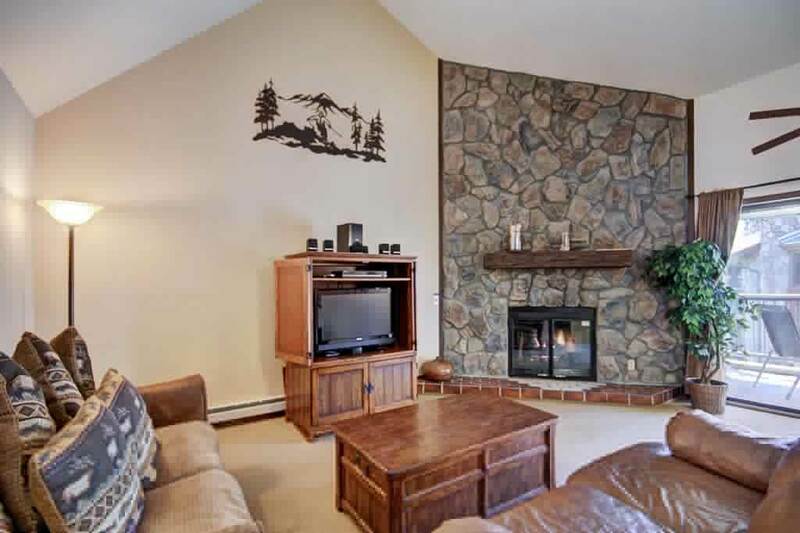 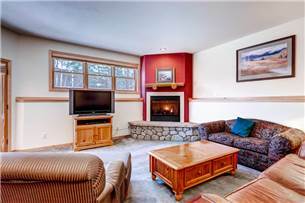 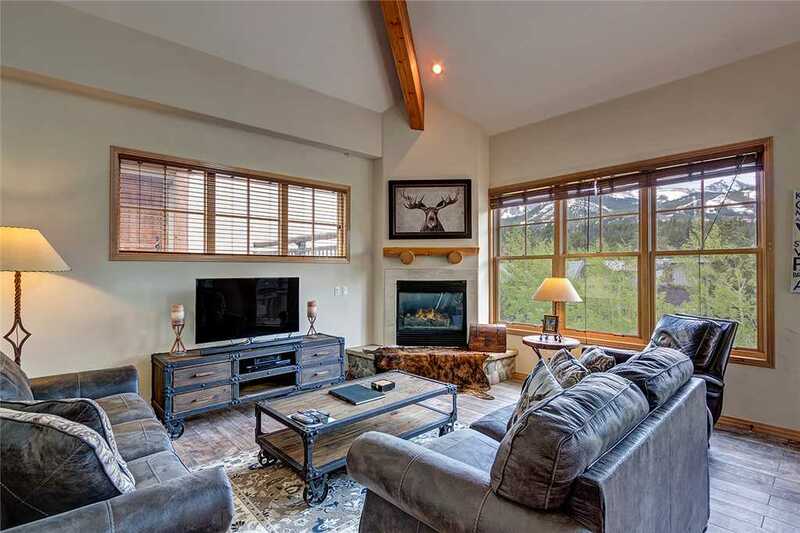 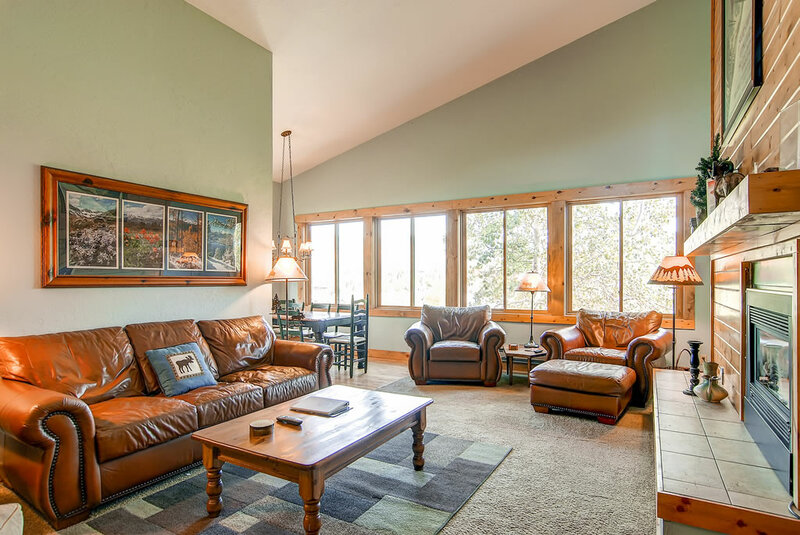 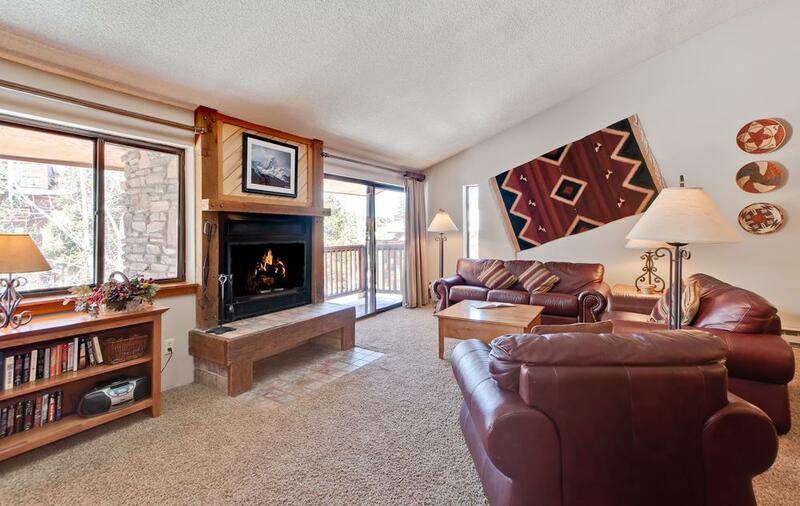 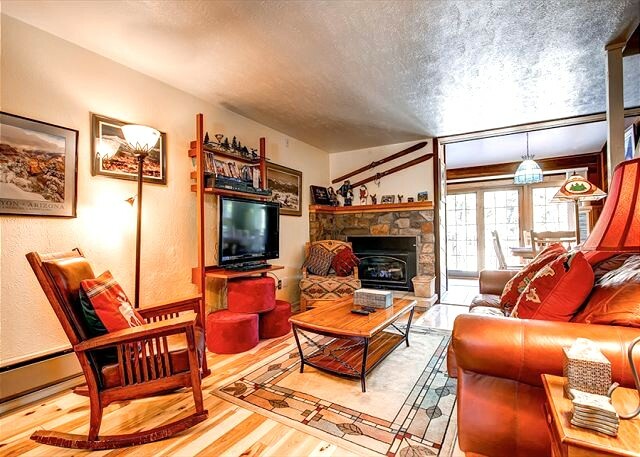 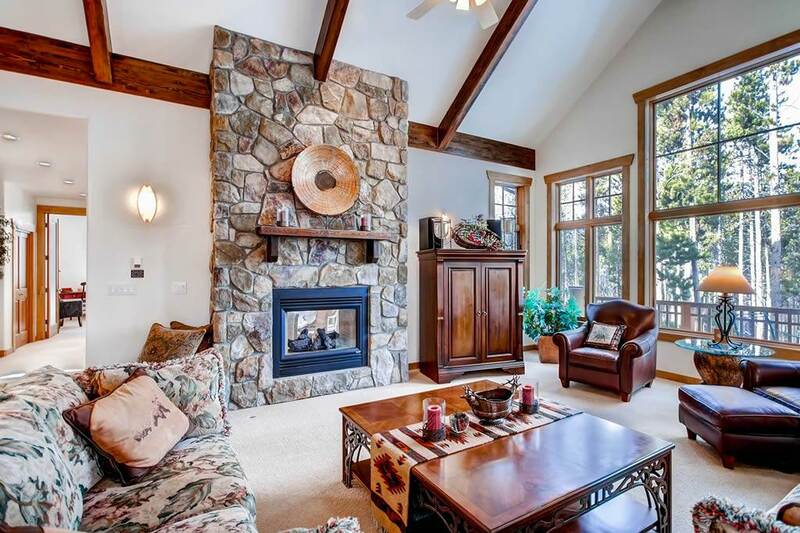 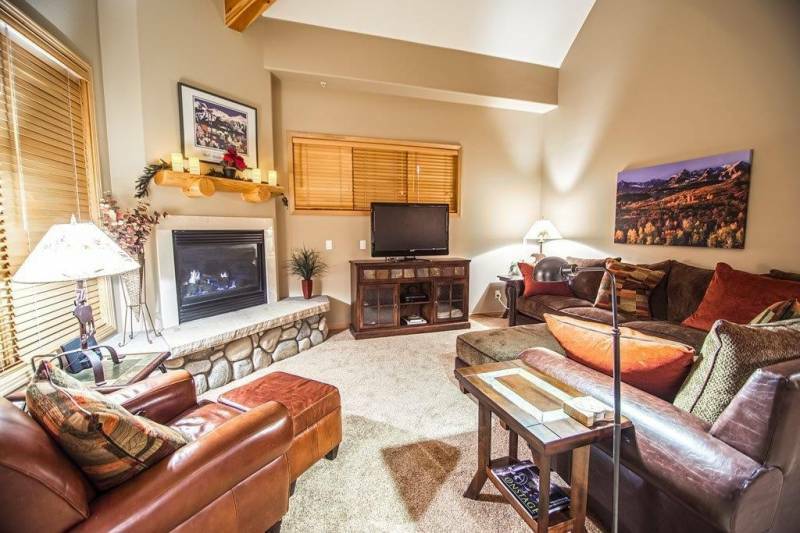 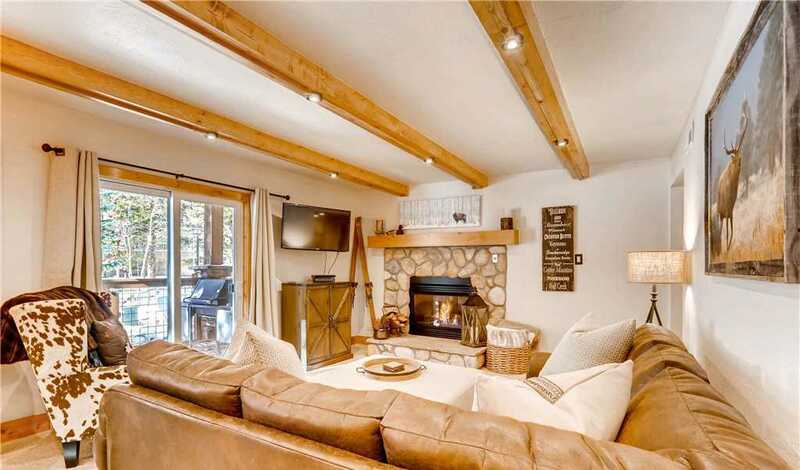 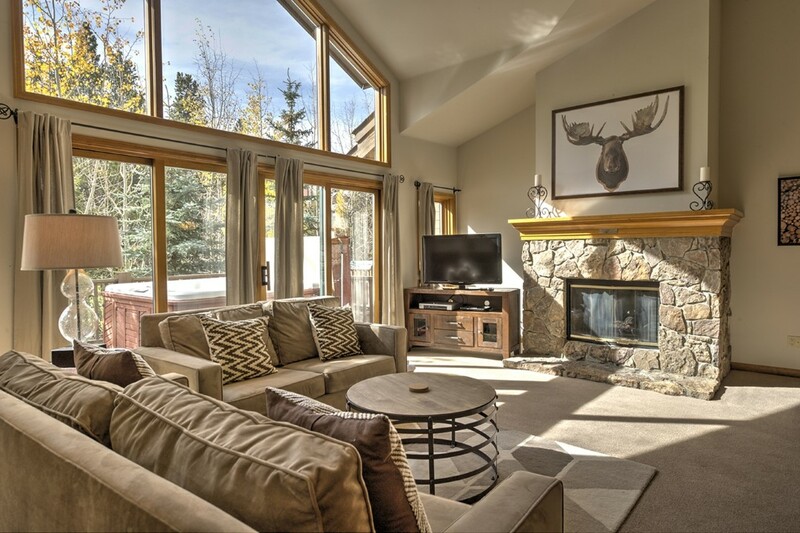 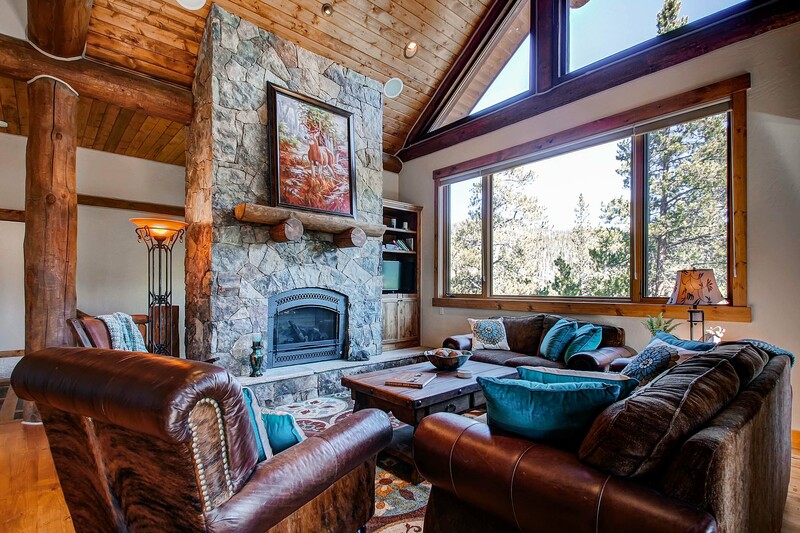 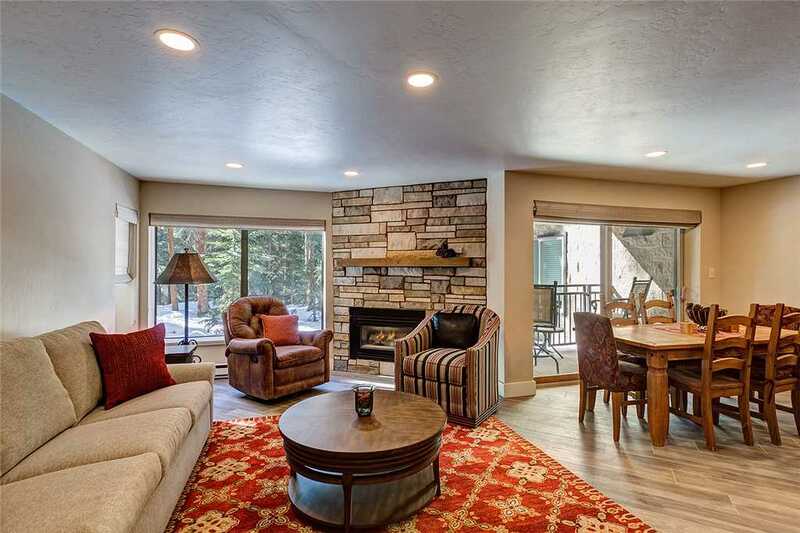 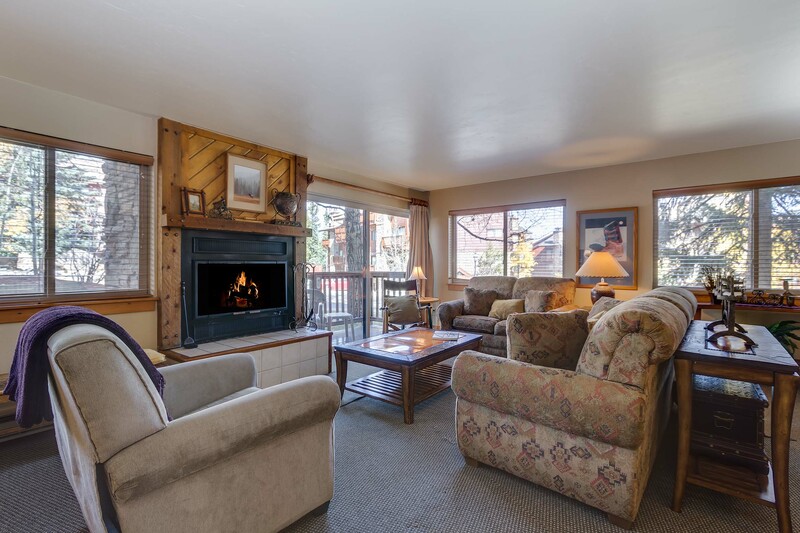 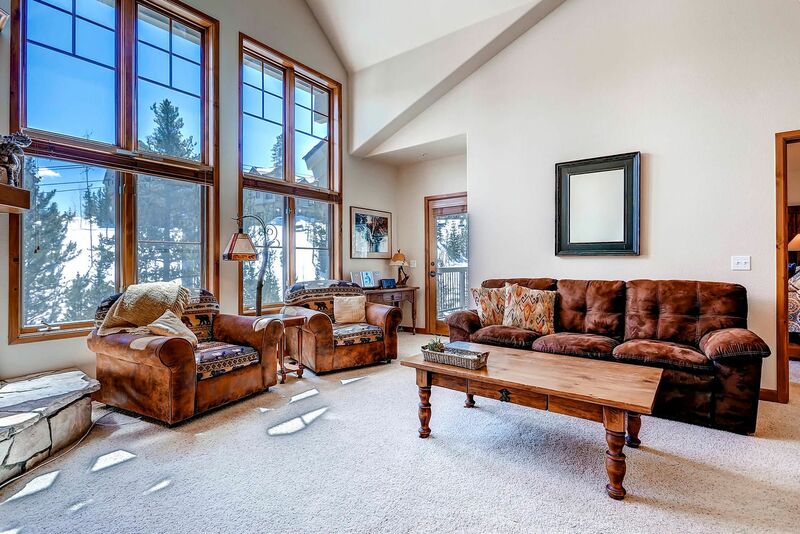 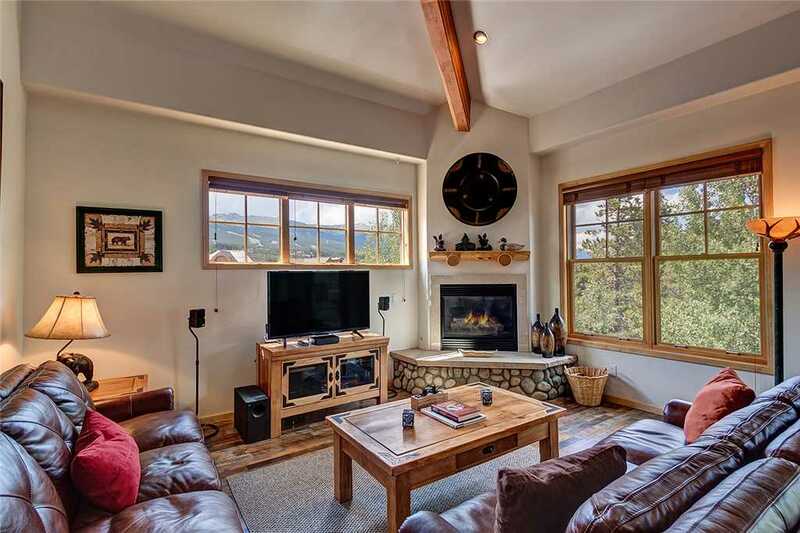 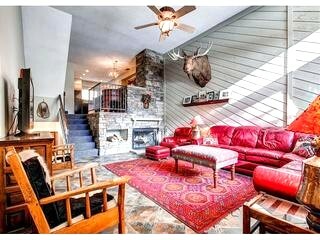 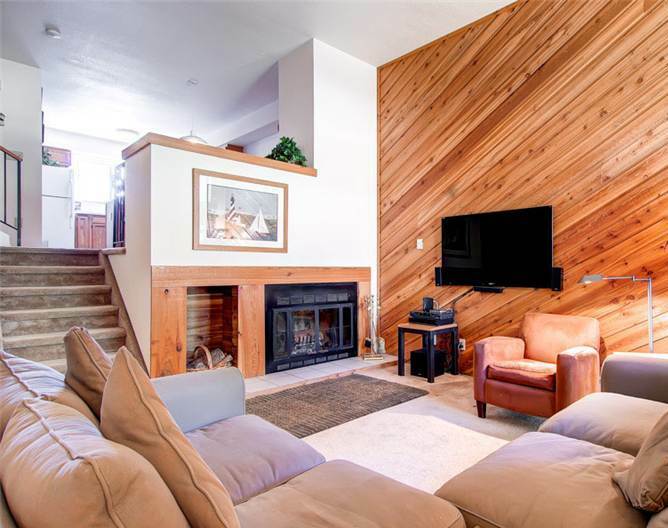 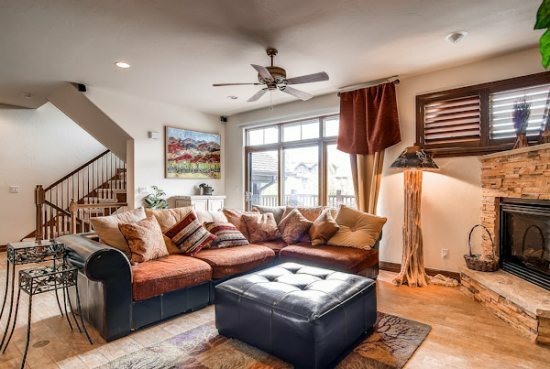 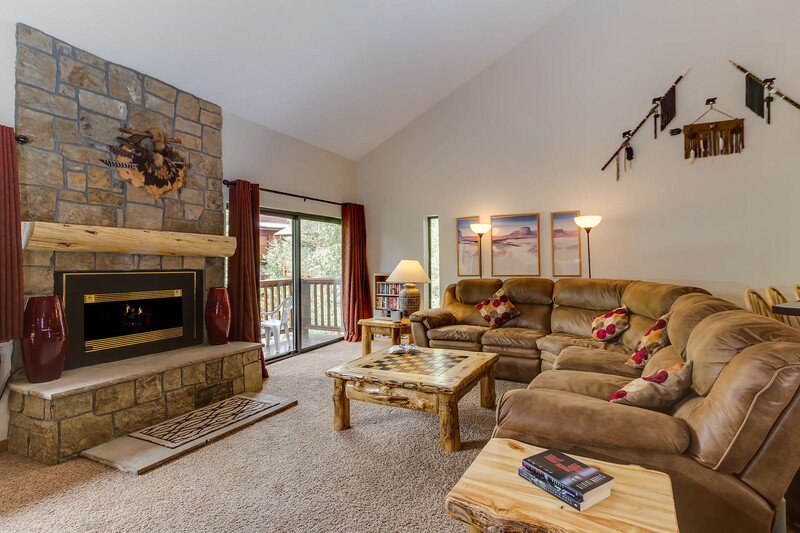 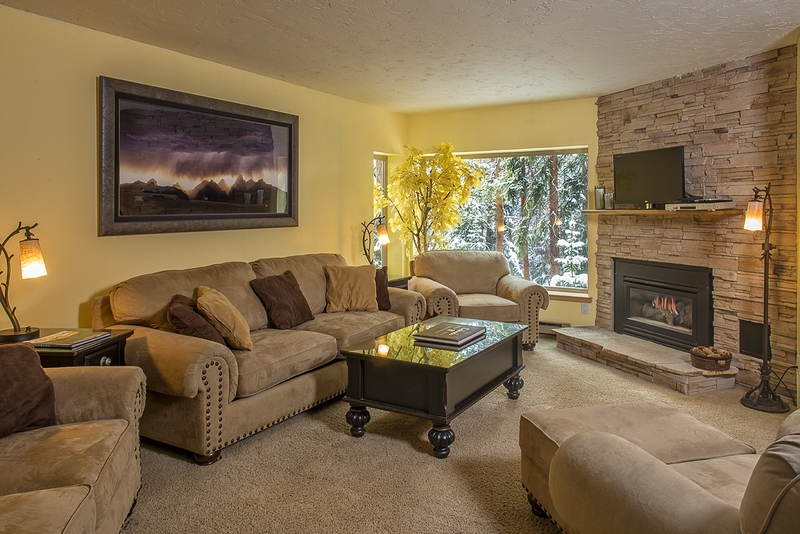 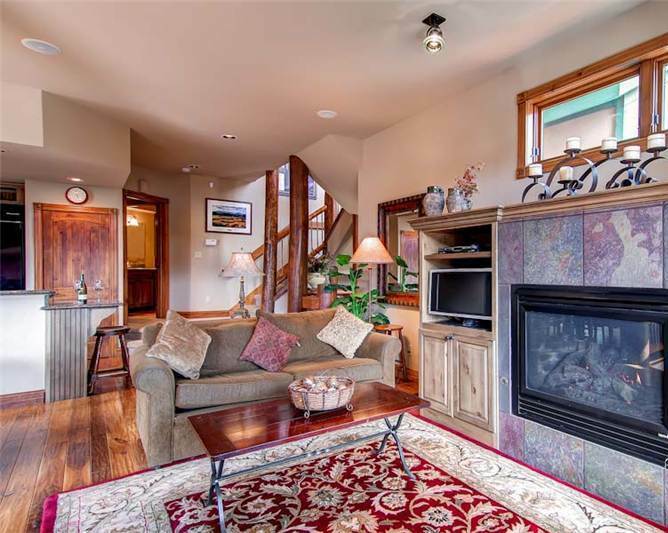 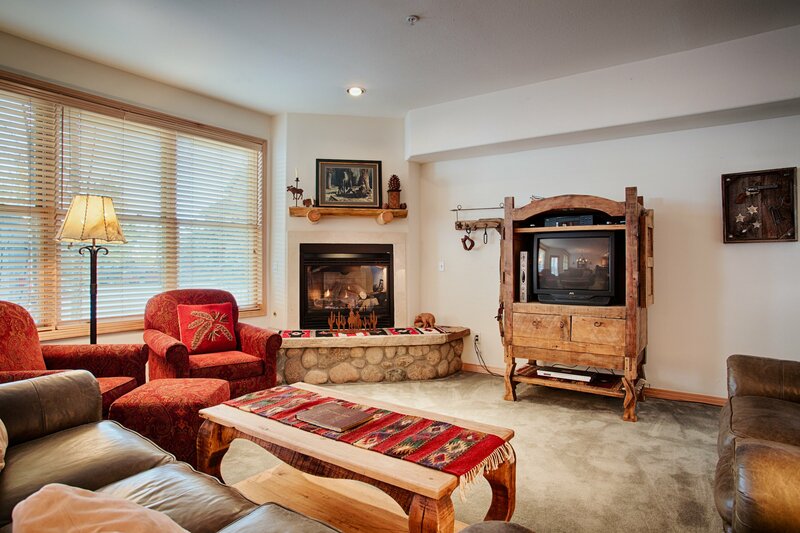 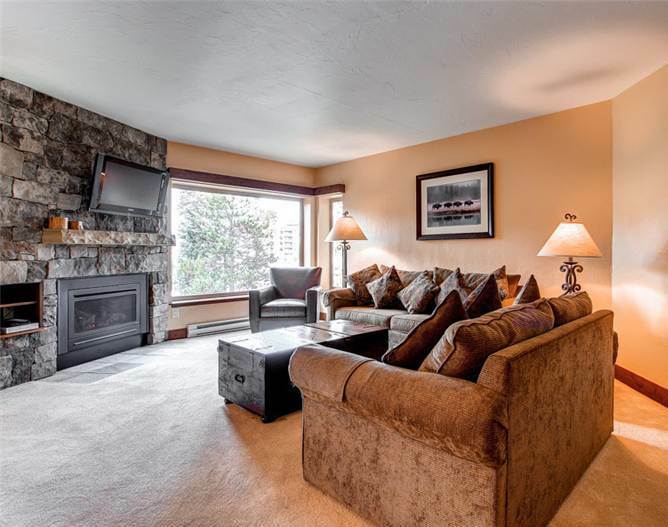 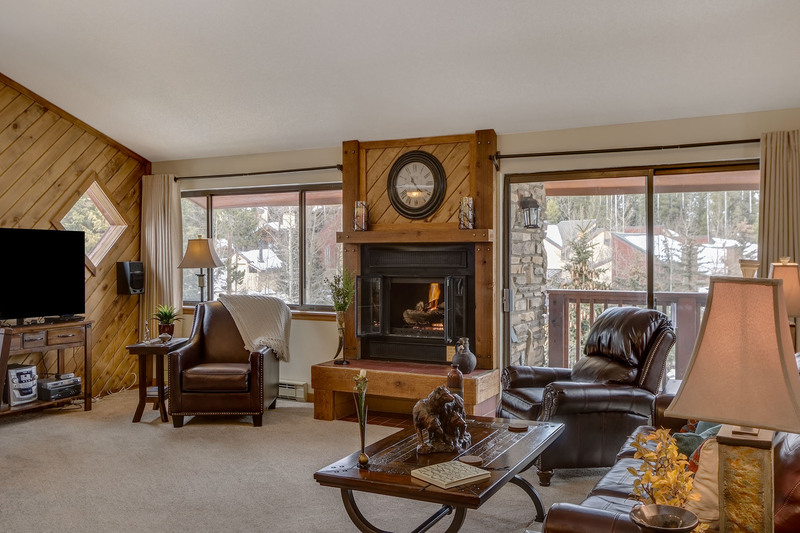 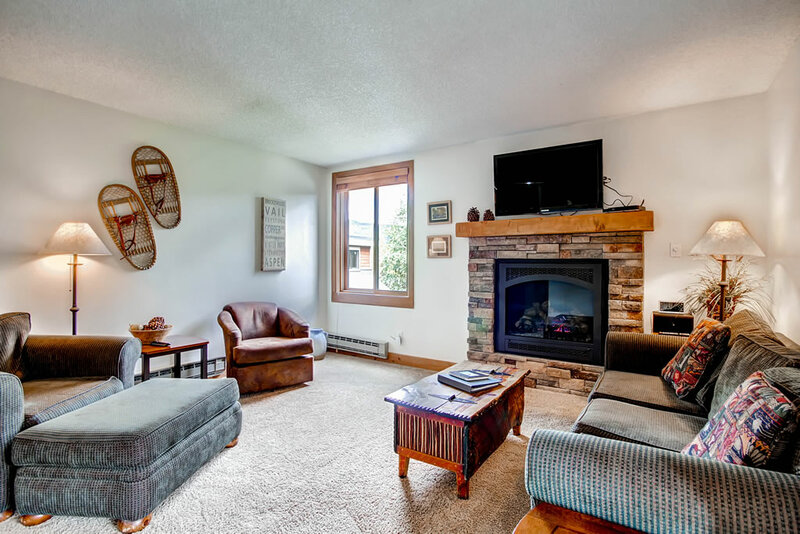 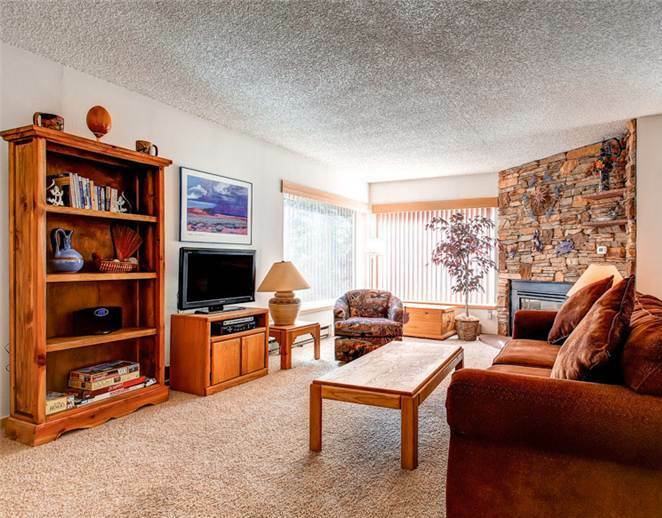 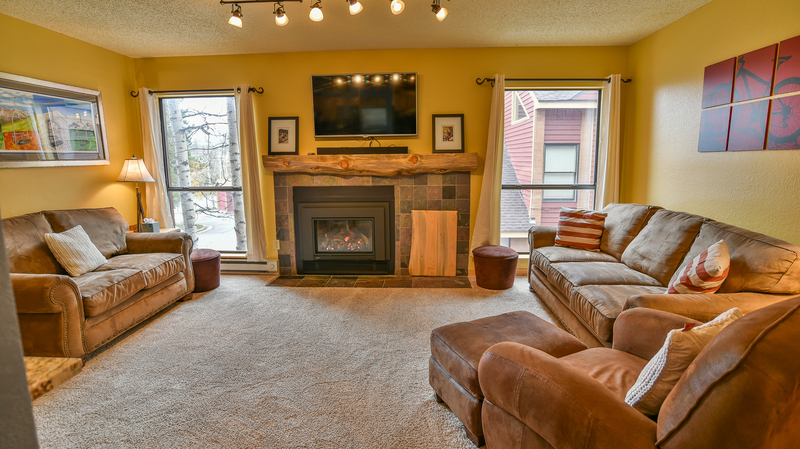 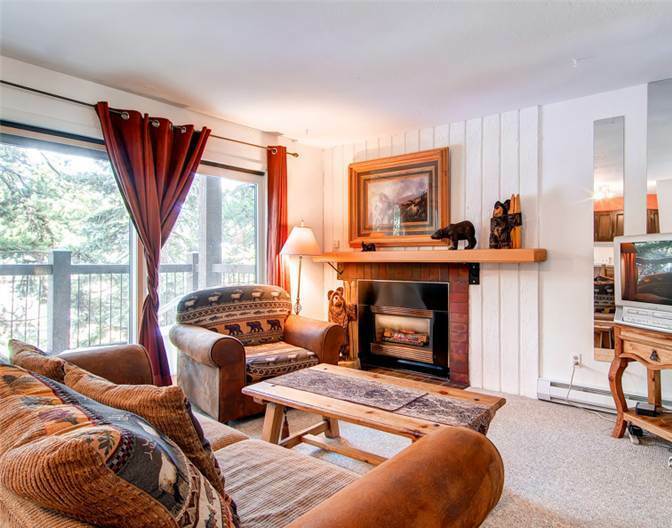 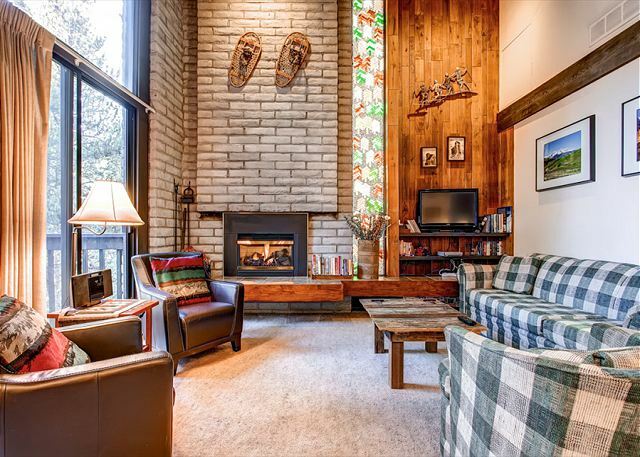 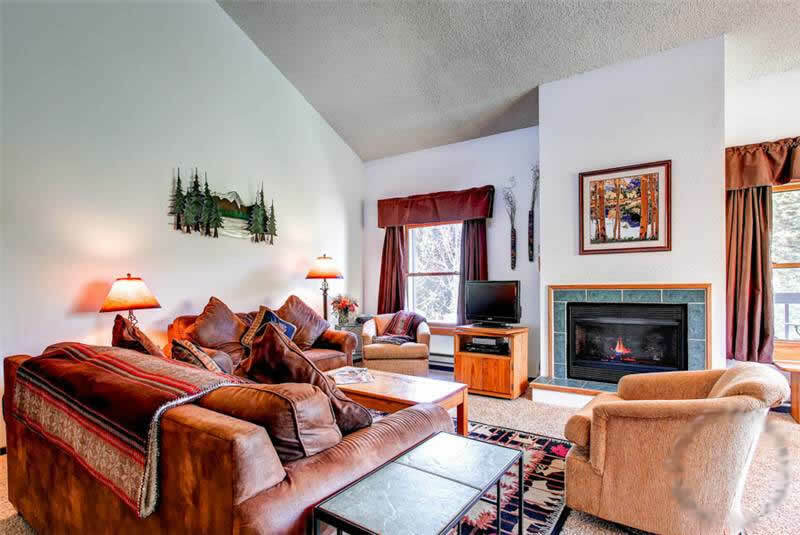 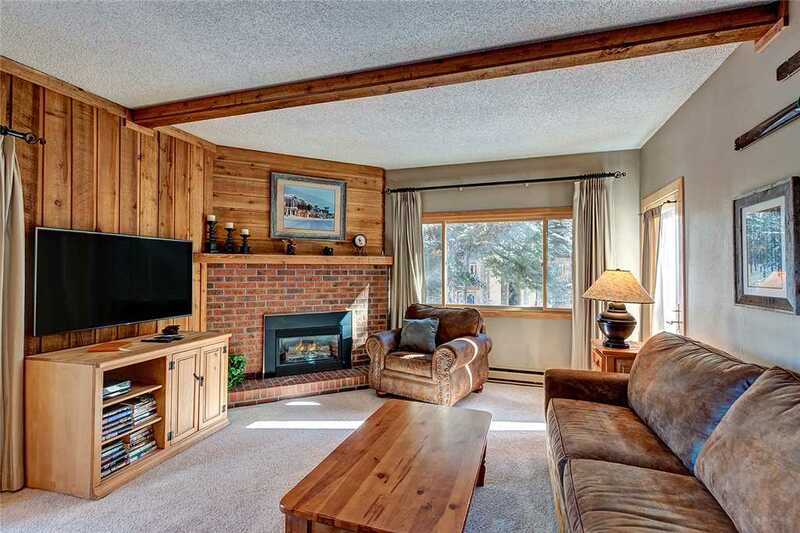 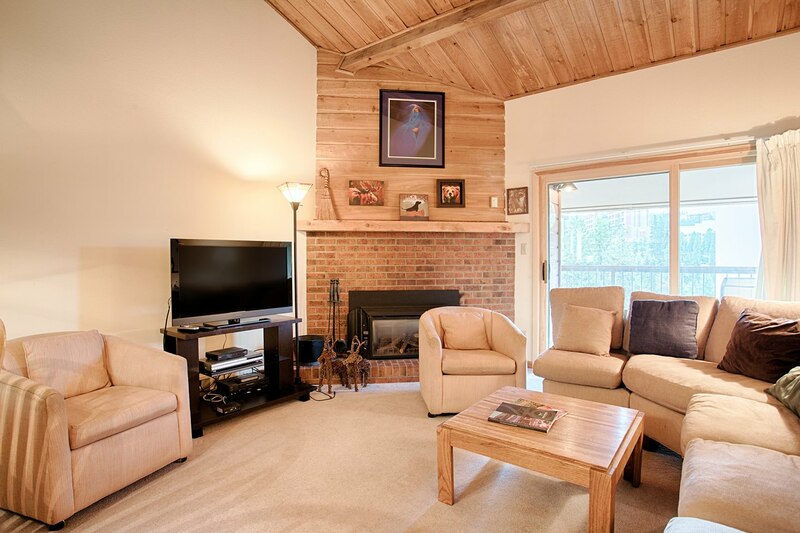 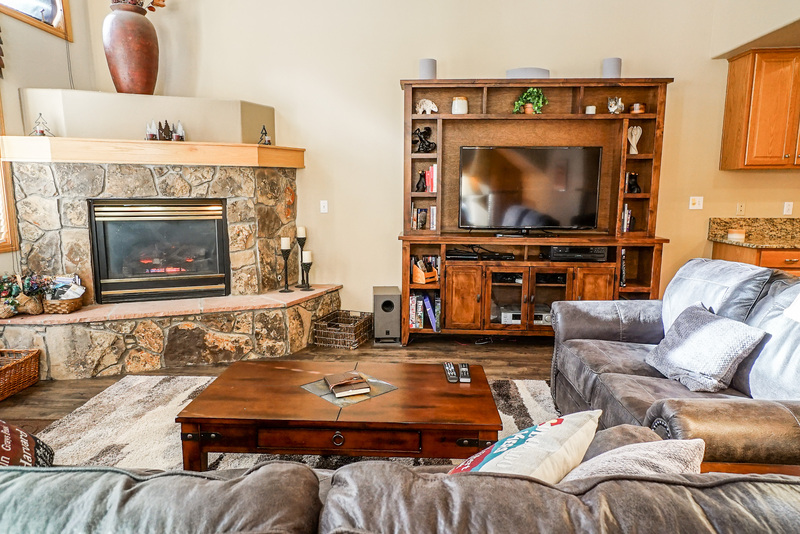 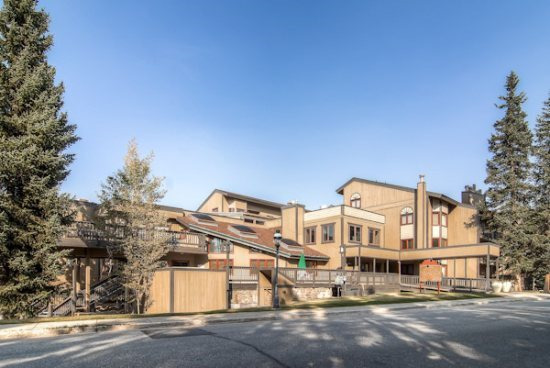 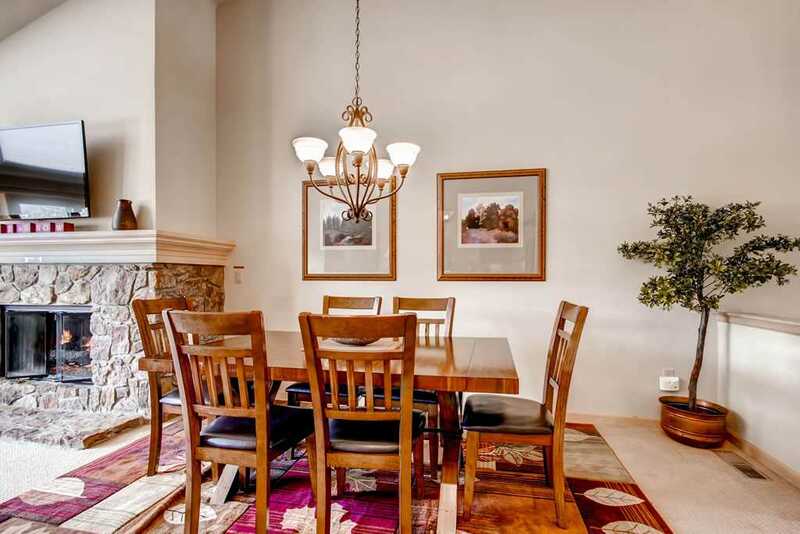 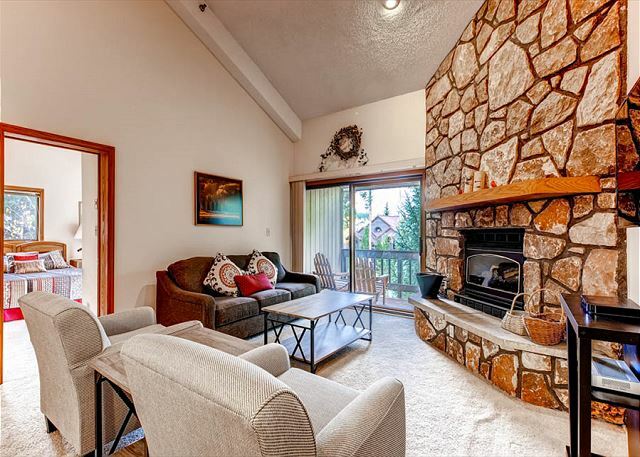 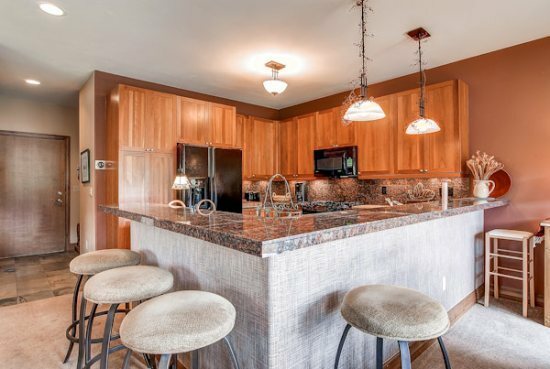 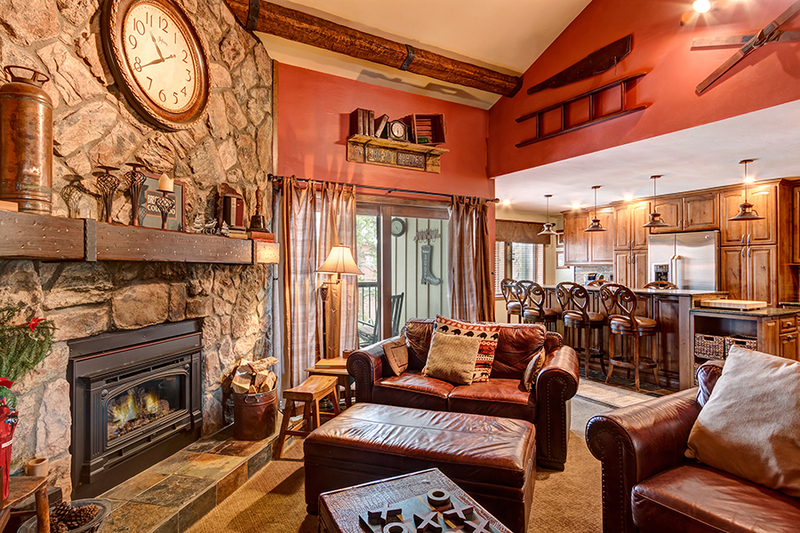 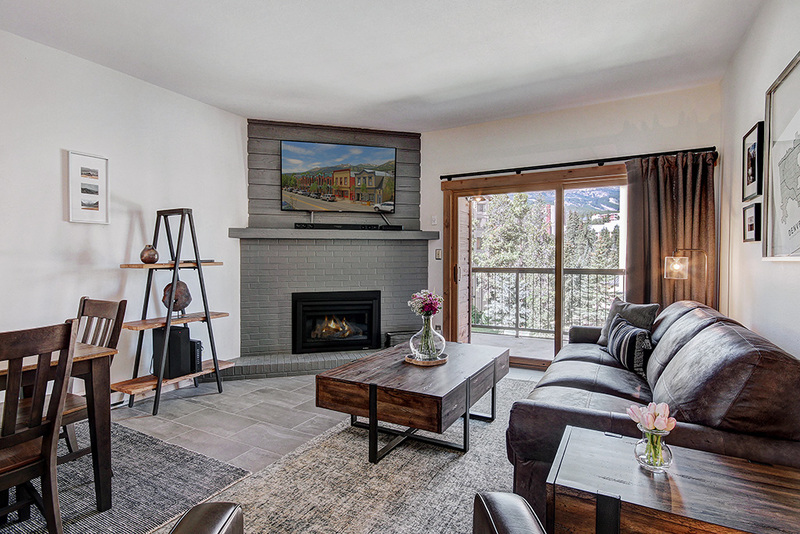 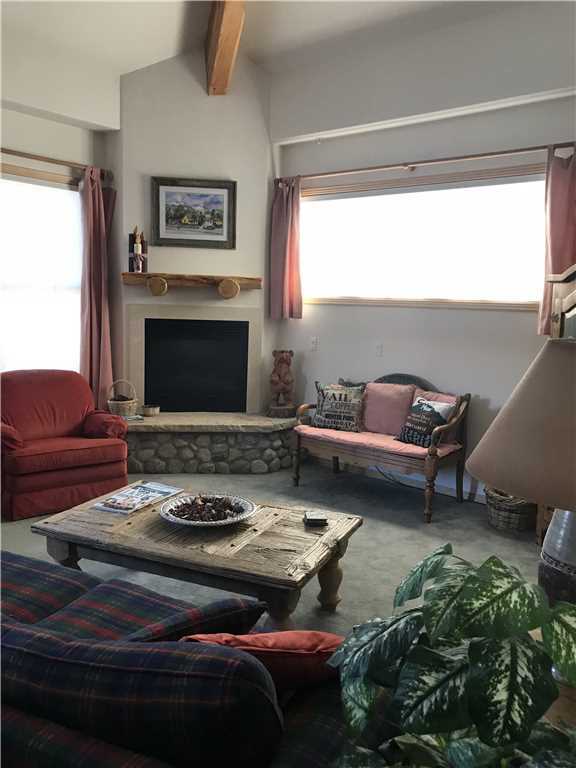 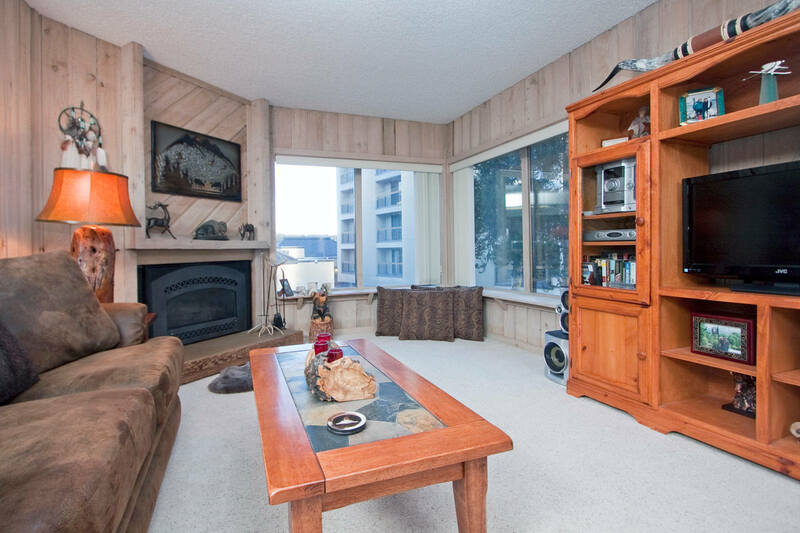 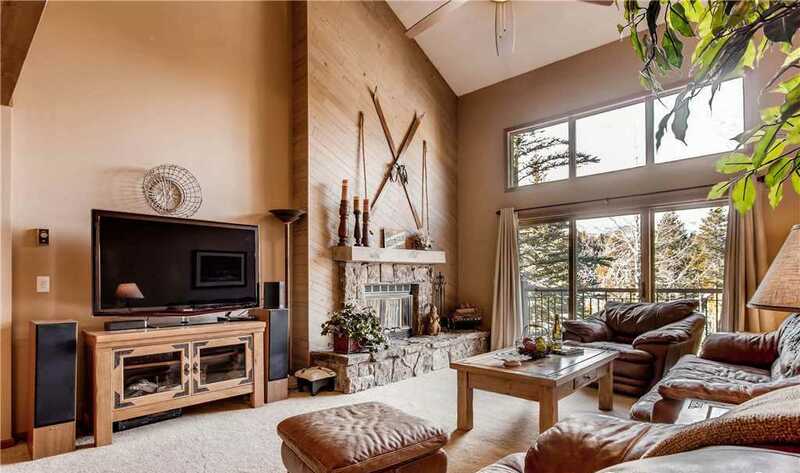 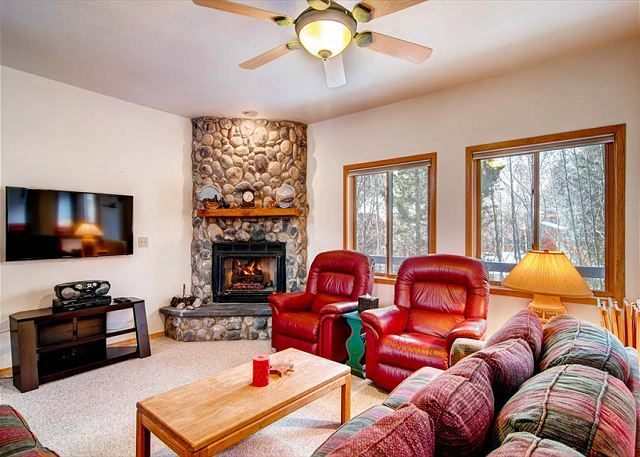 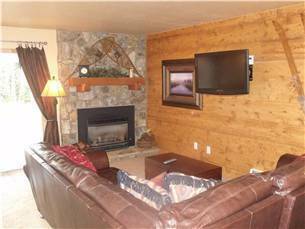 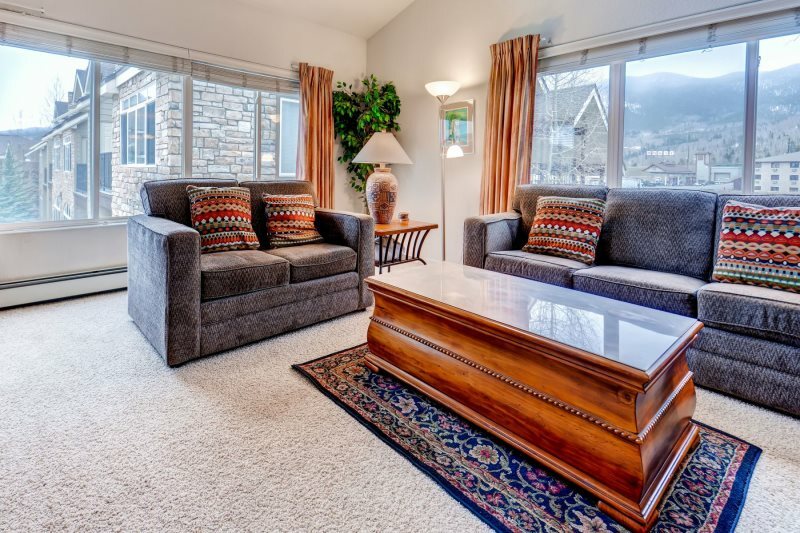 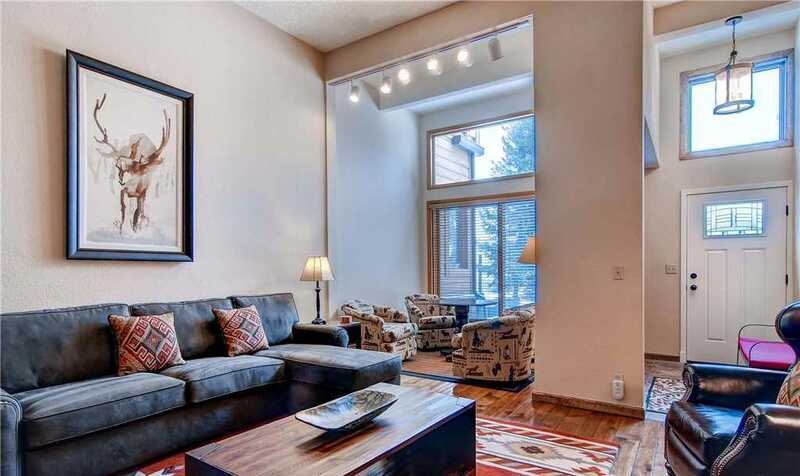 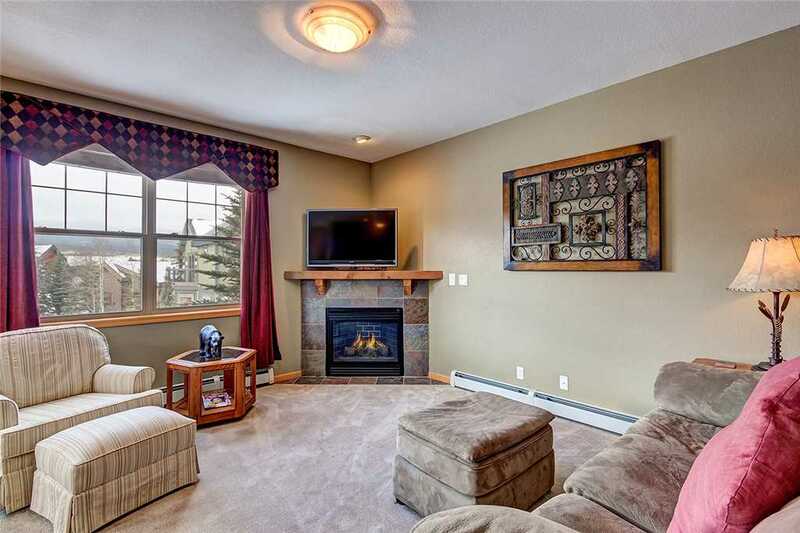 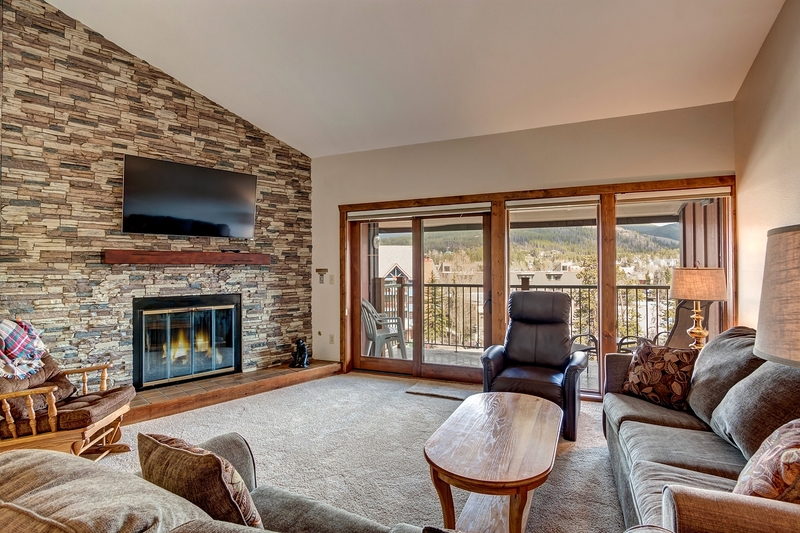 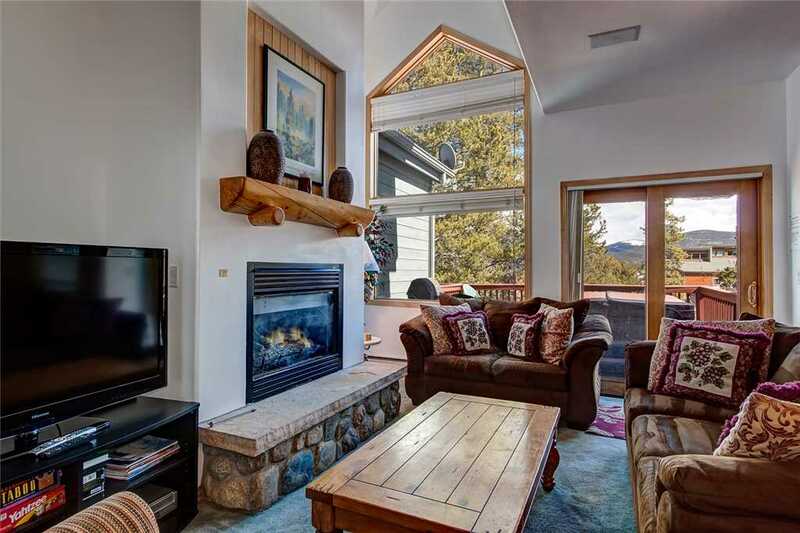 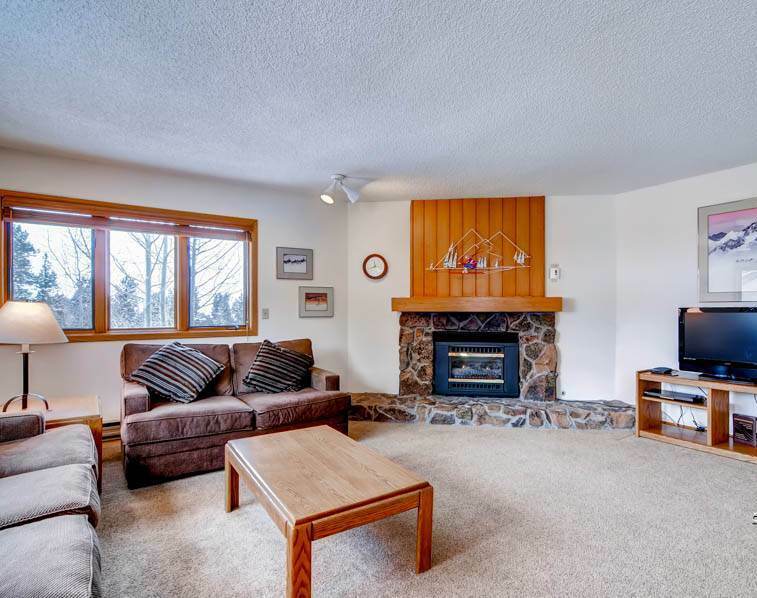 In the chalet style lobby of the Park Meadows complex you will find an immense, open 360 degree, gas fireplace with ample seating making it a great place for socializing, quiet reading time or relaxing. 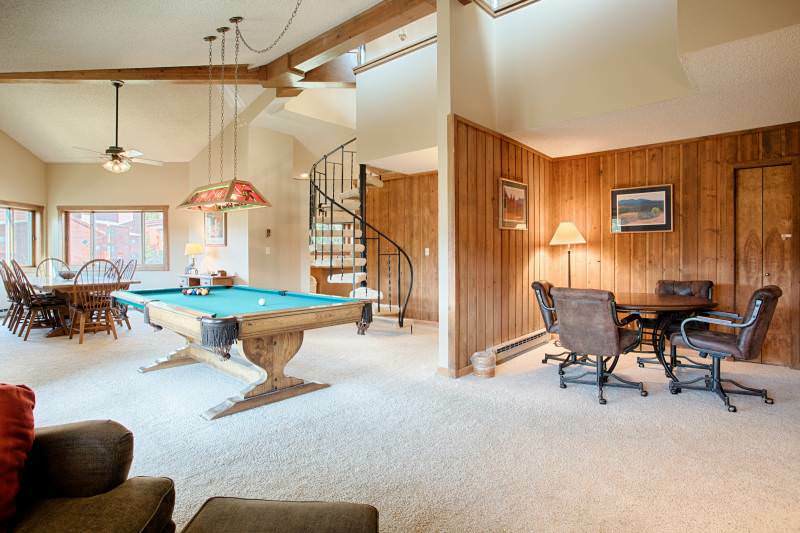 Enjoy a game of pool, ping pong or foosball in the game room below the lobby. 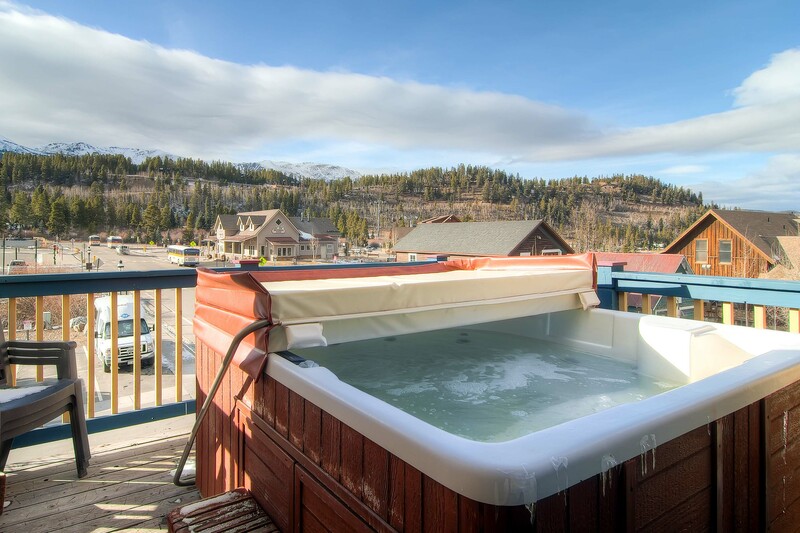 Relax those muscles after a hard day of skiing in one of the two large outdoor on-site hot tubs. 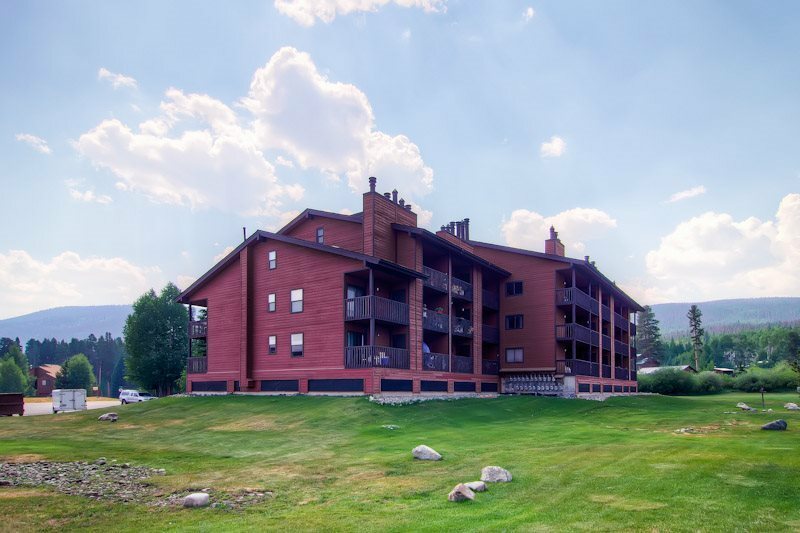 Other amenities to the Park Meadows complex include laundry facilities, soda and snack dispensers, an industrial ice machine, community gas grill and picnic tables. 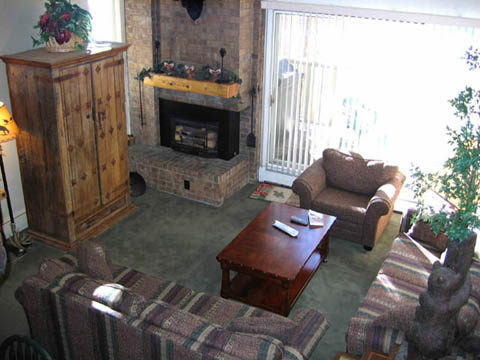 Above the lobby there is a community office area with access to the free complex WiFi, a large meeting table, and other couches and chairs that provide for additional seating. 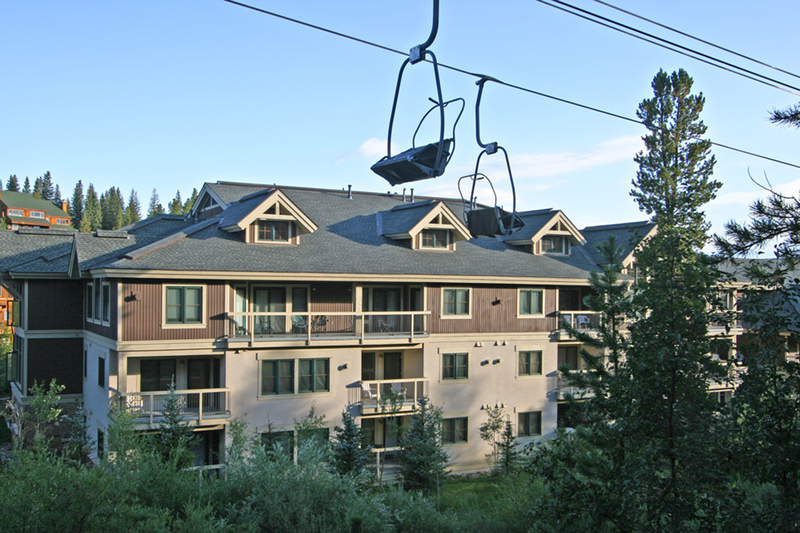 Individual ski lockers are provided for each unit to store ski and snowboard equipment. 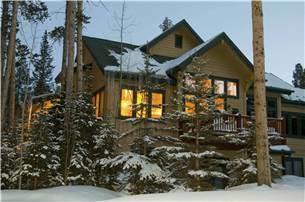 The exterior was completely renovated in 2010. 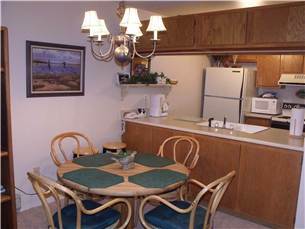 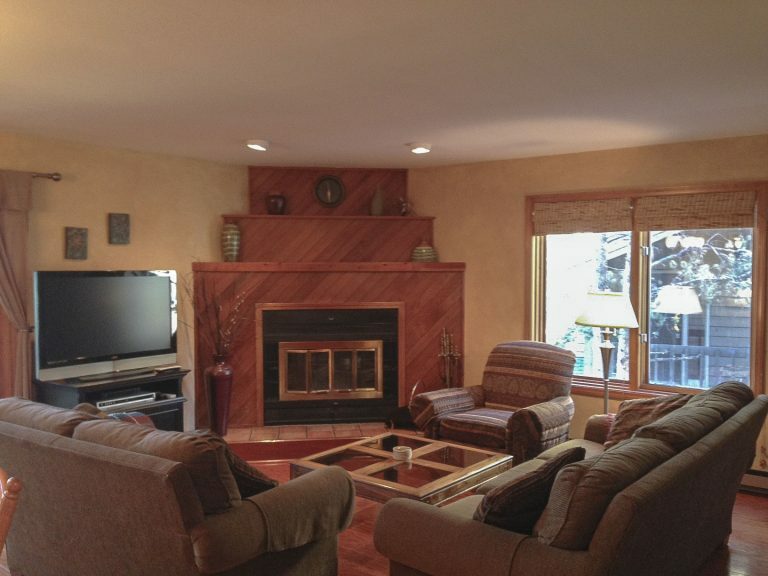 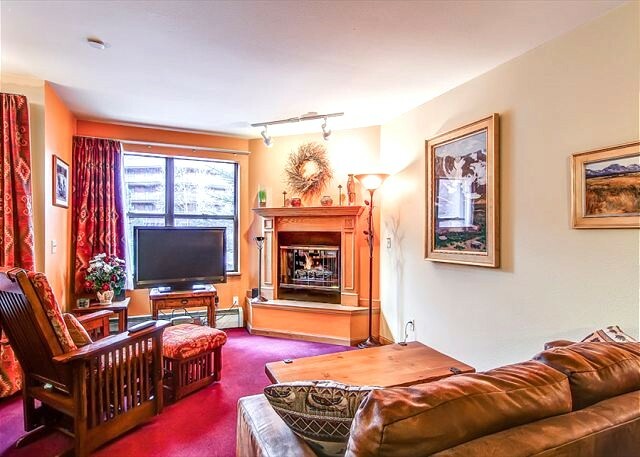 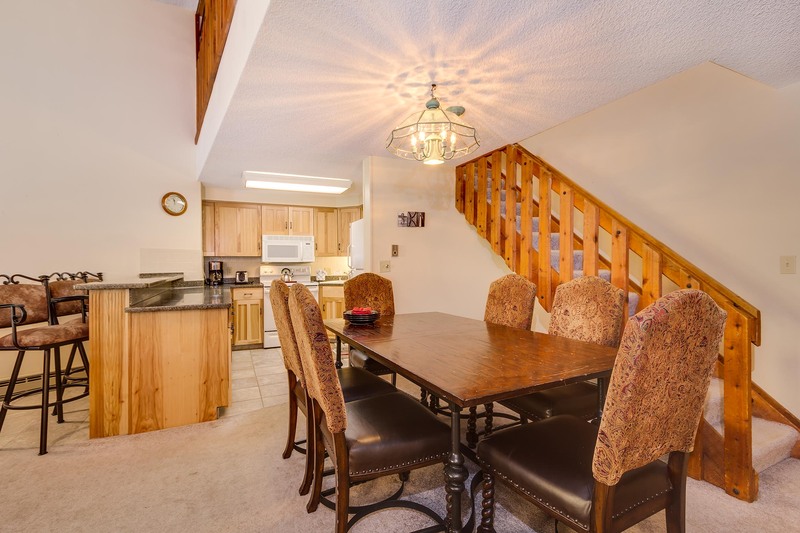 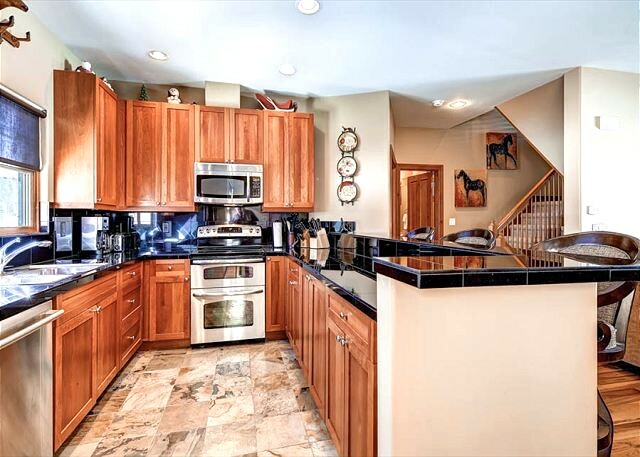 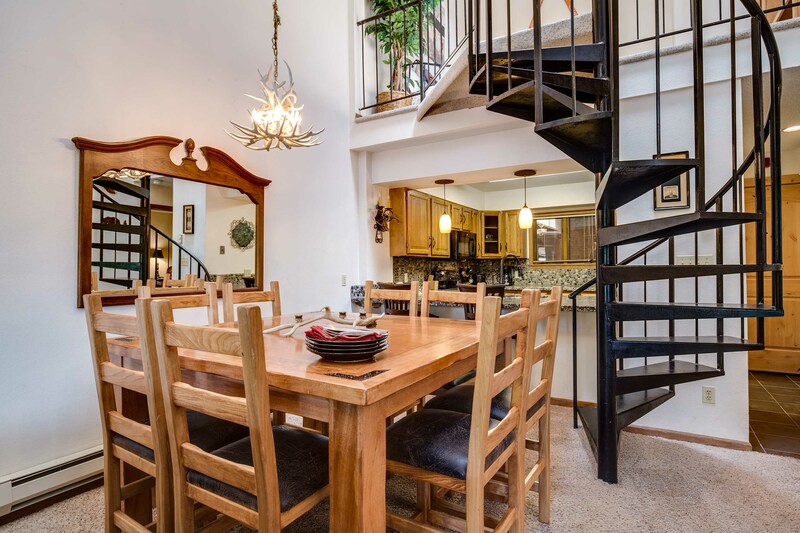 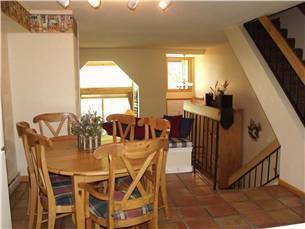 This property does not offer an elevator and stairs are required to access this condo.